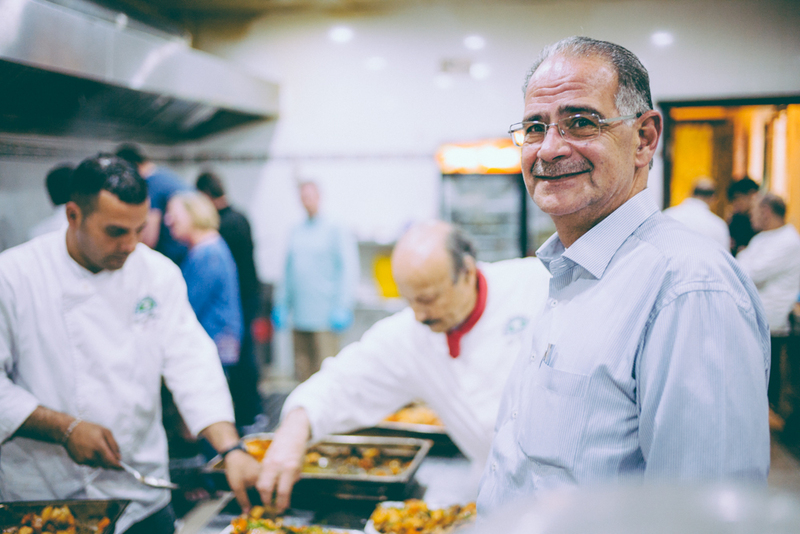 A definite highlight of the Ecclesia Houston tour with Breaking Bread Journeys was meeting up with Chefs for Peace today. 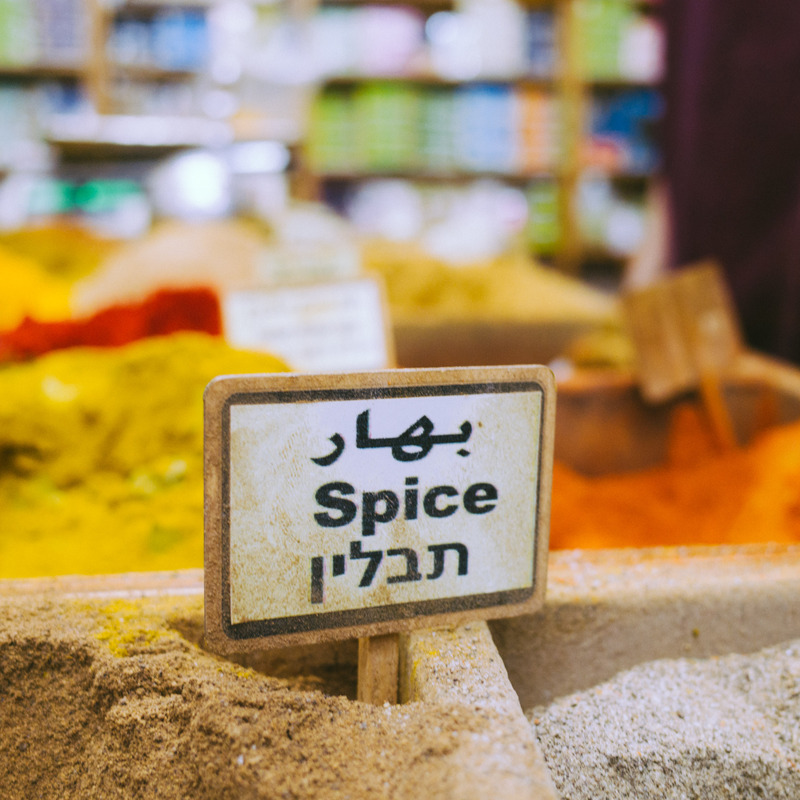 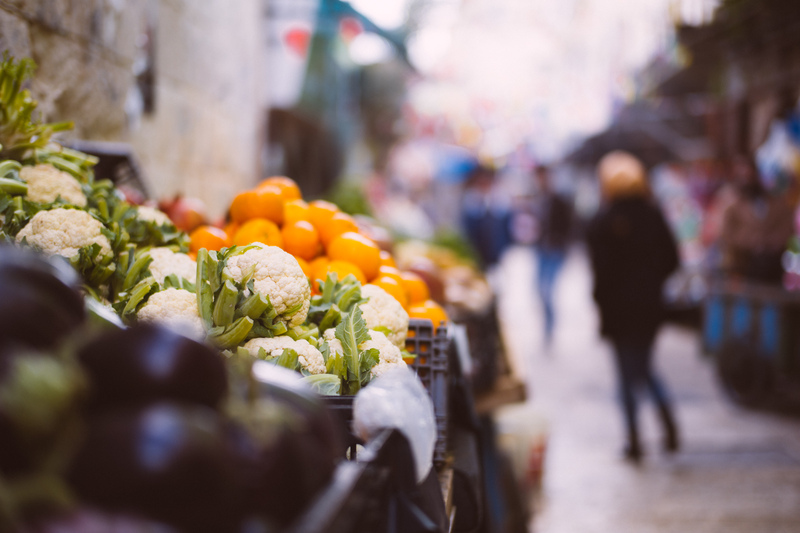 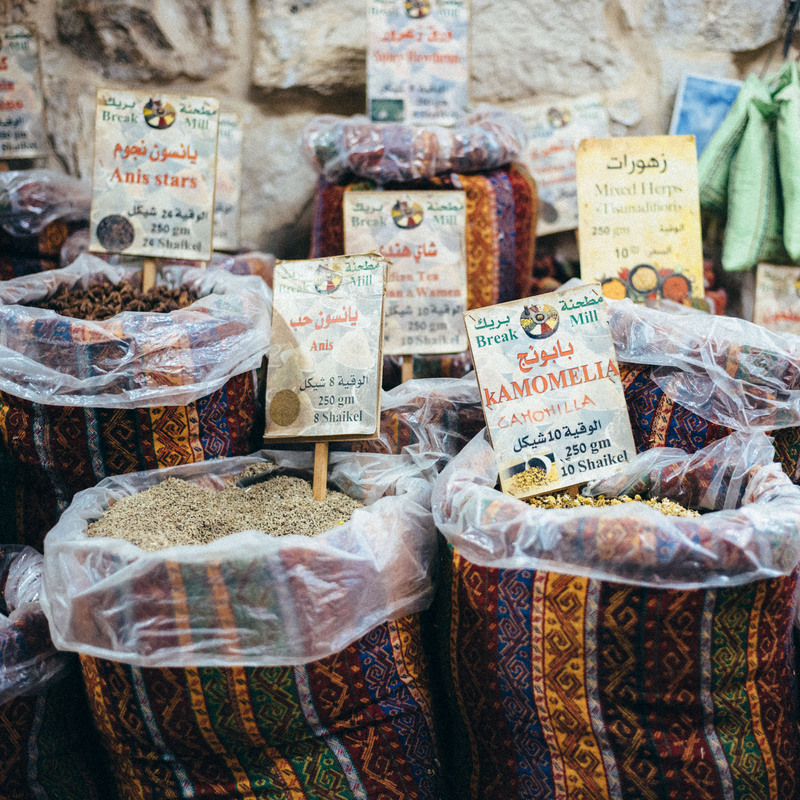 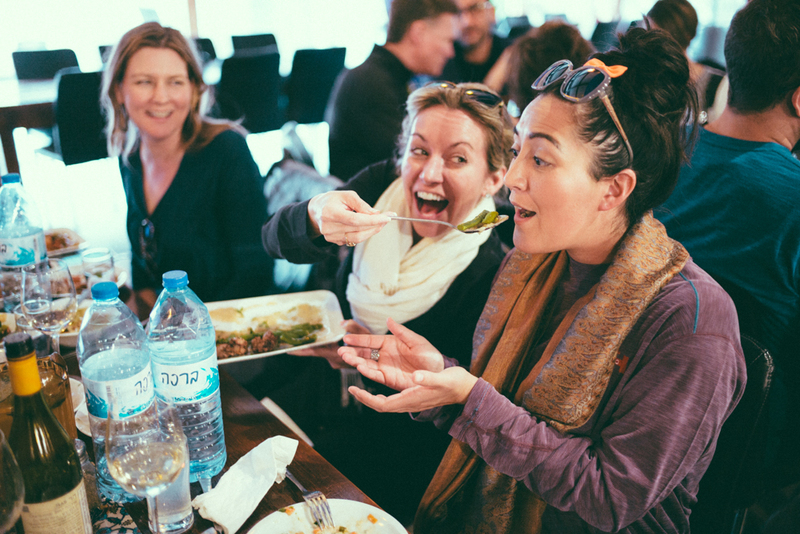 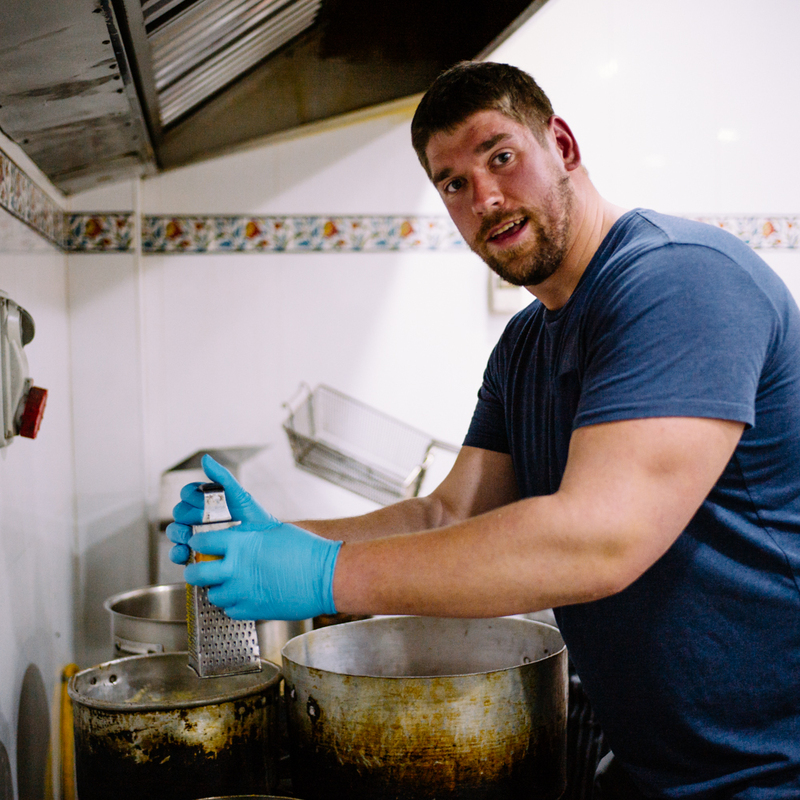 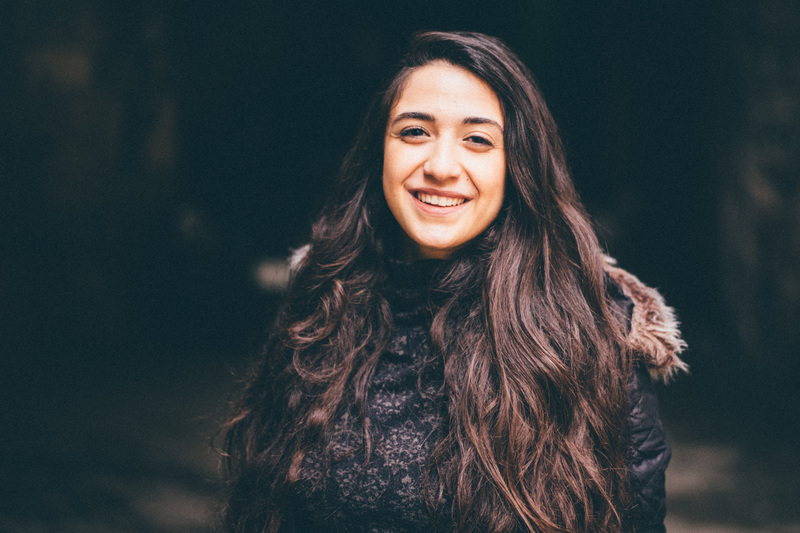 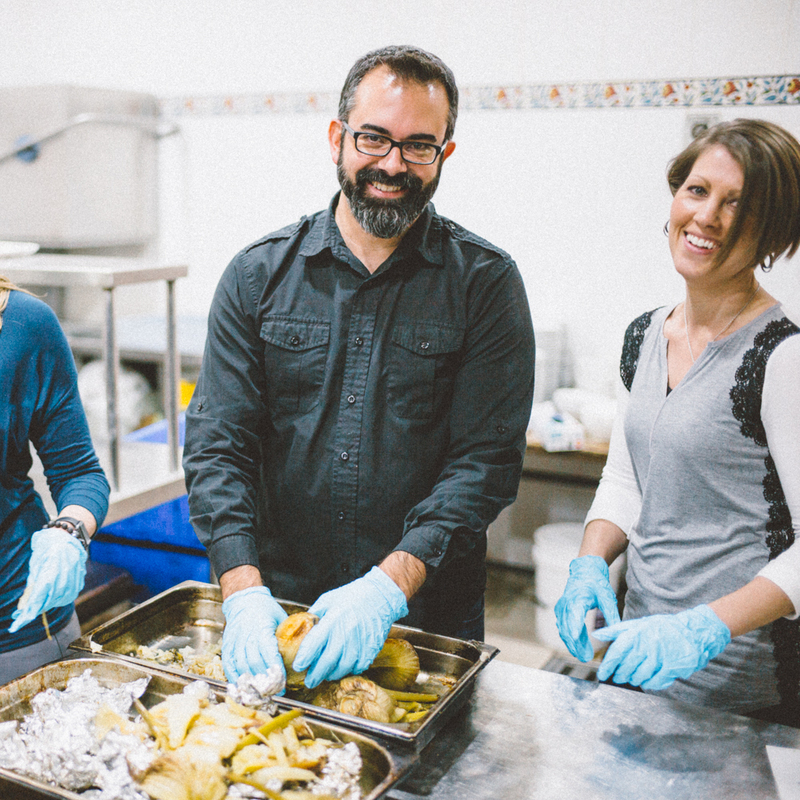 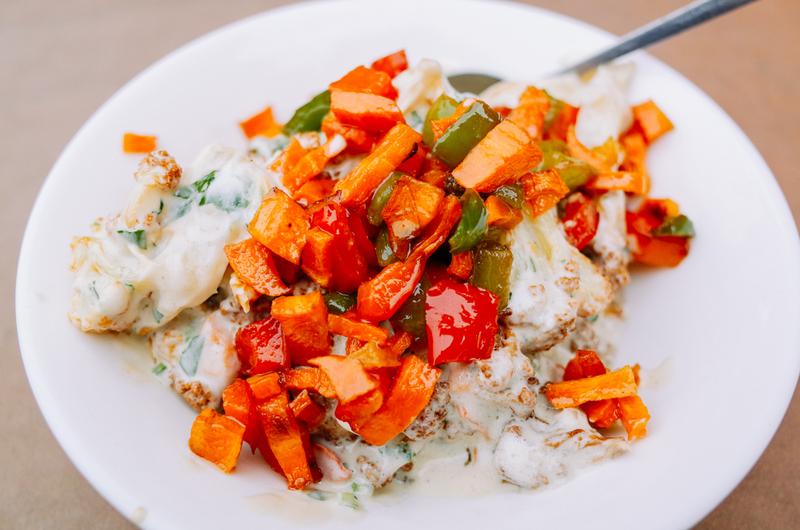 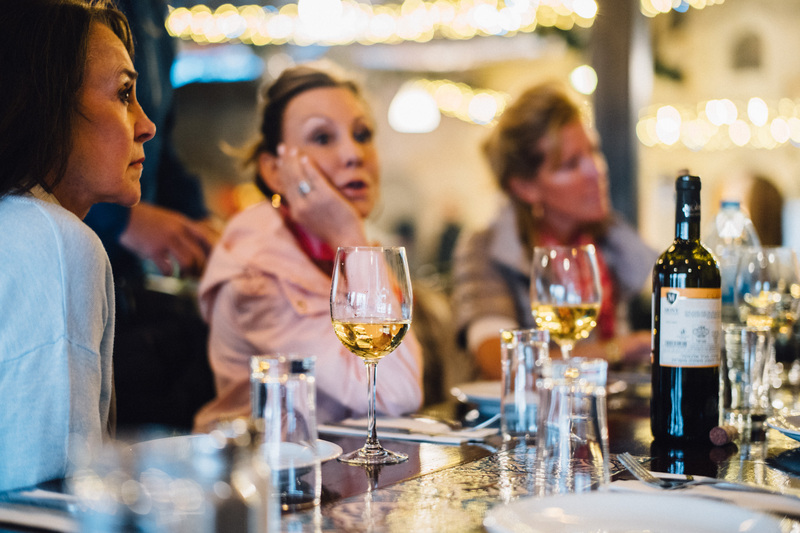 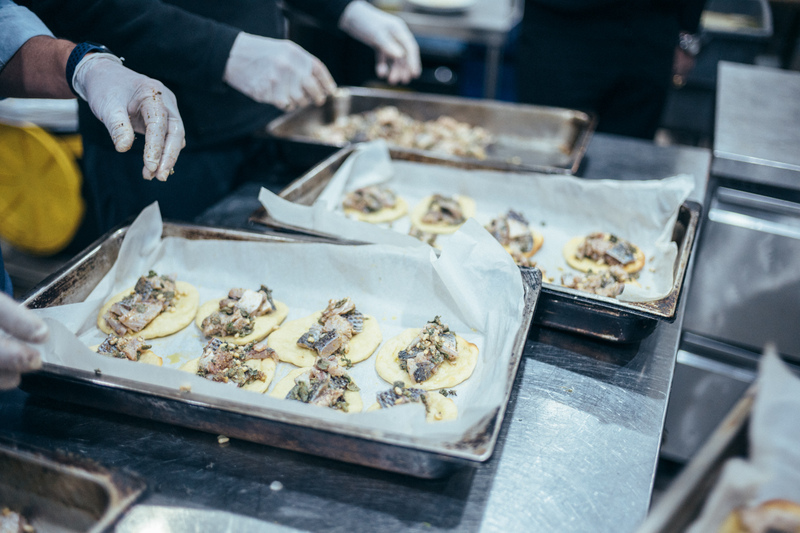 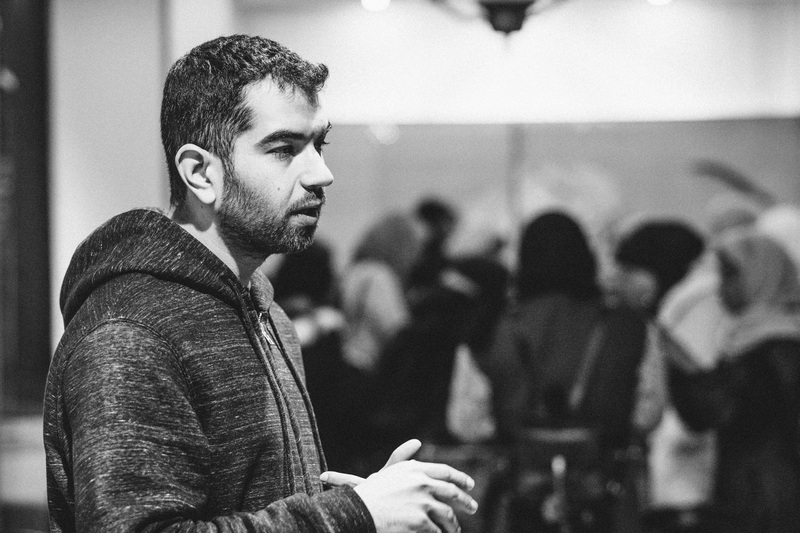 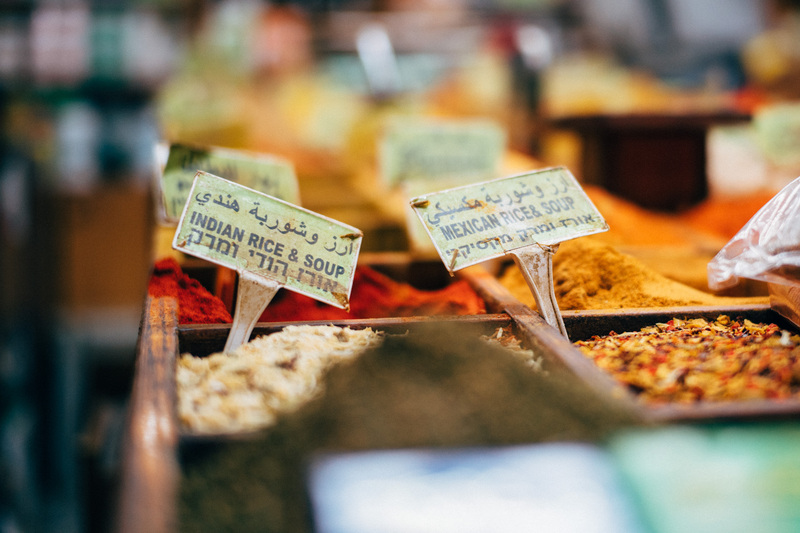 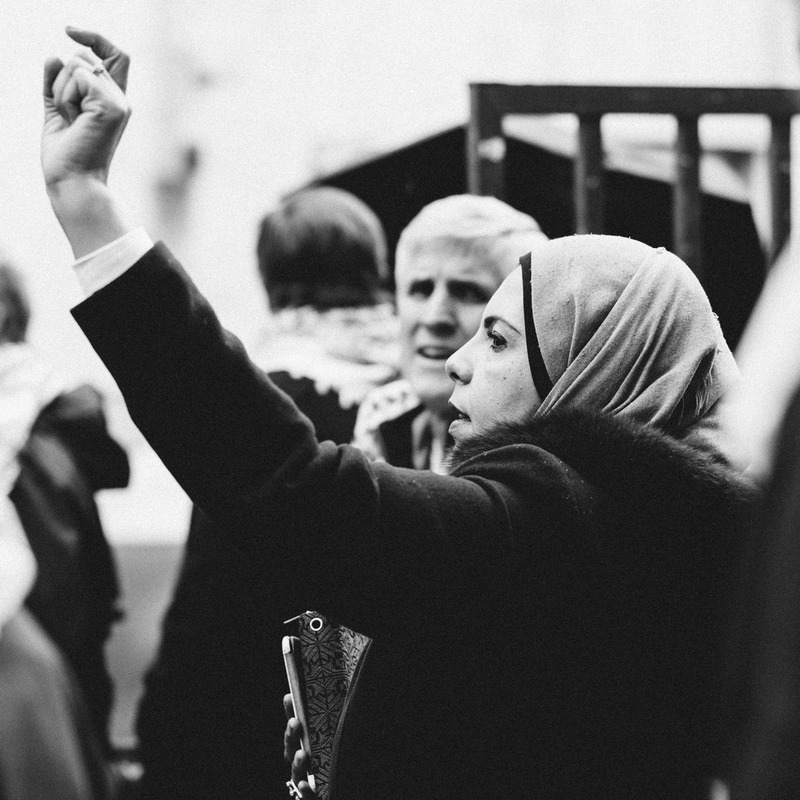 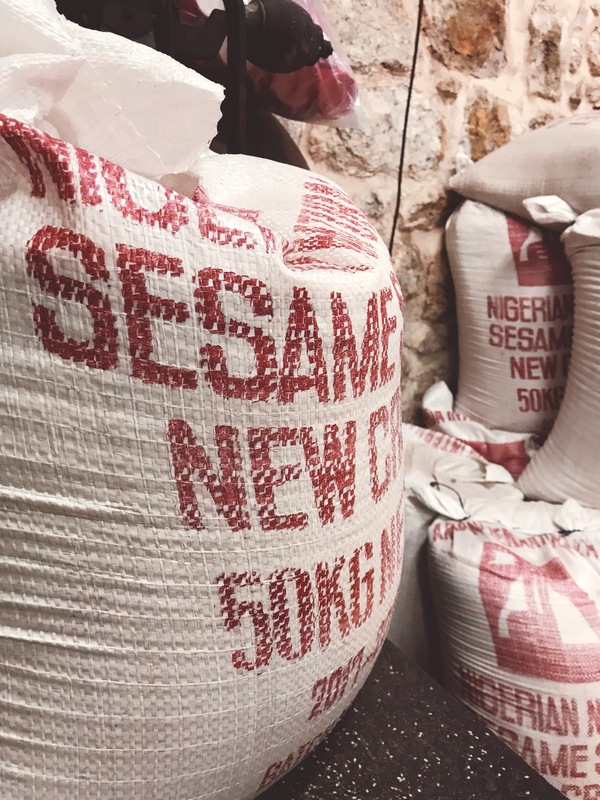 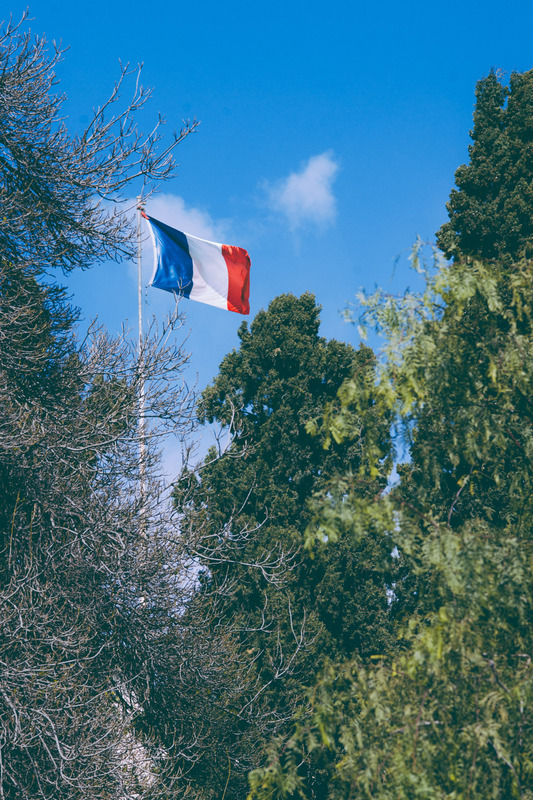 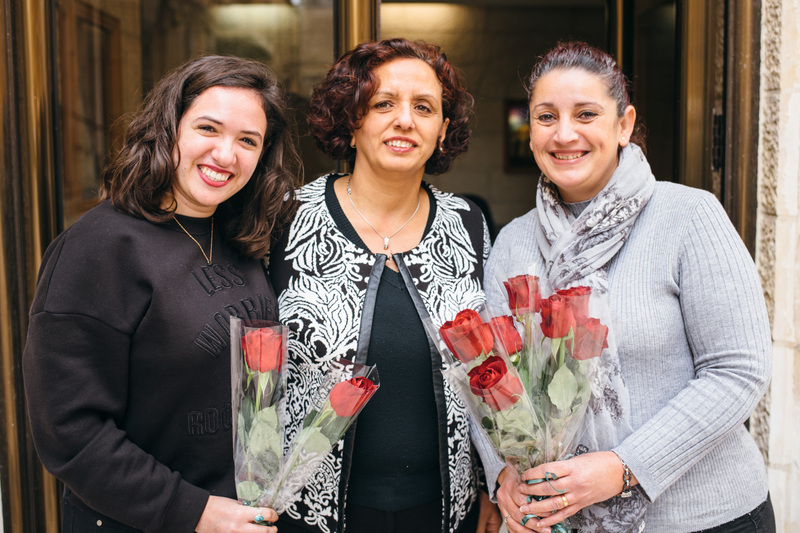 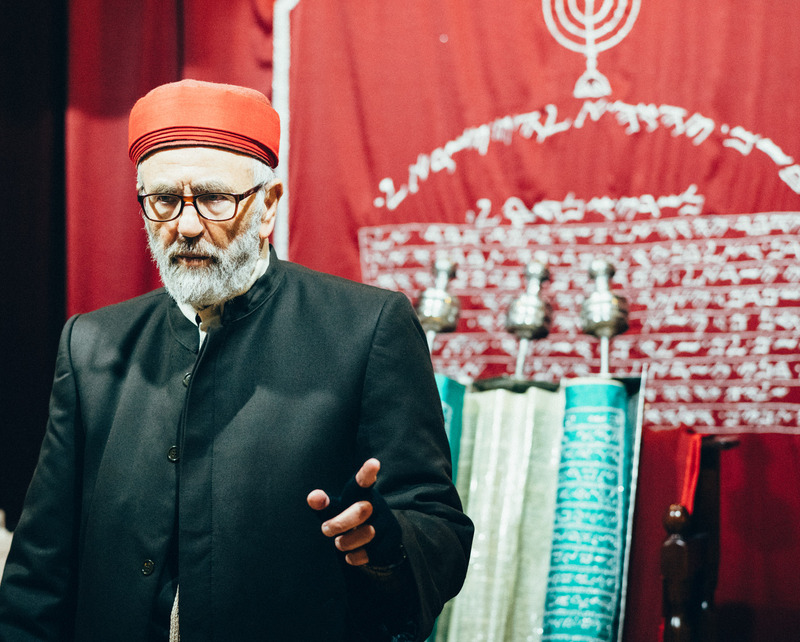 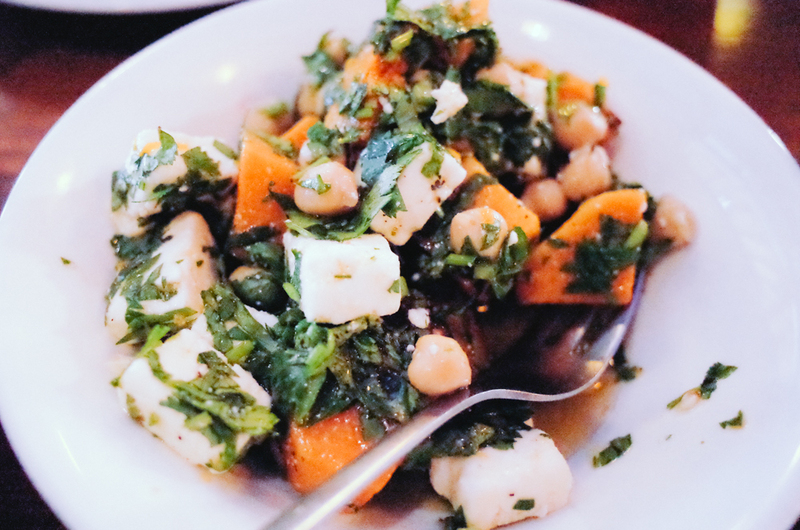 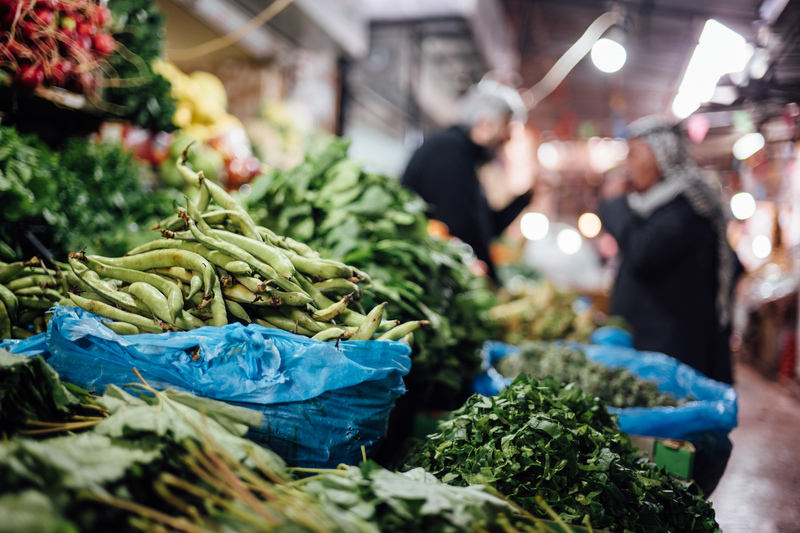 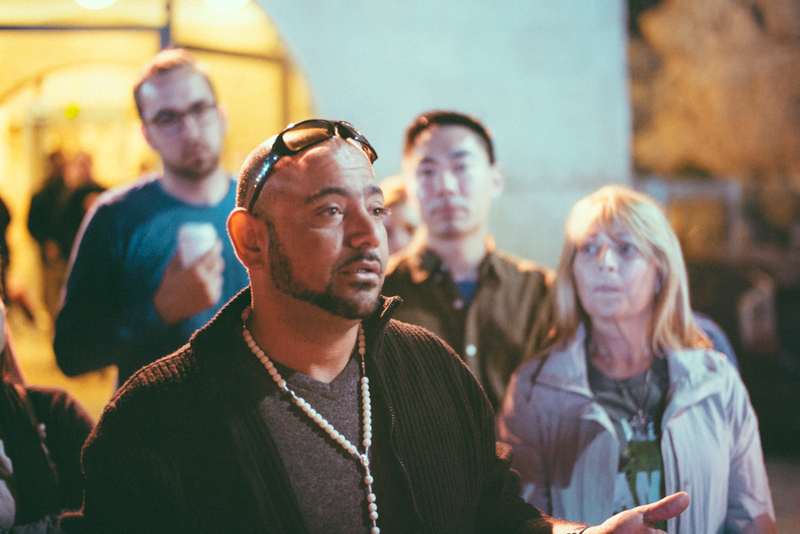 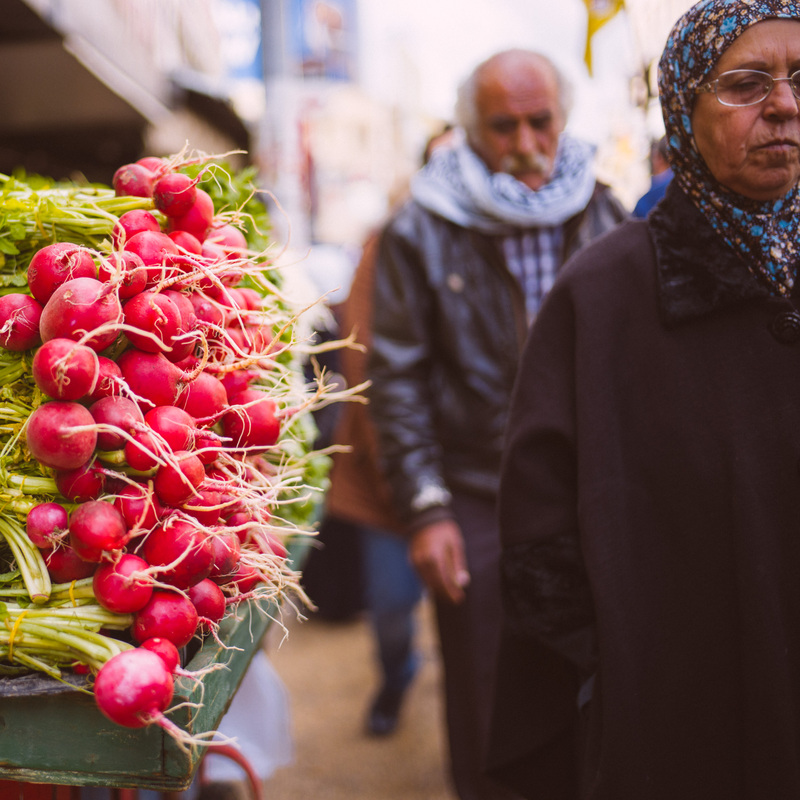 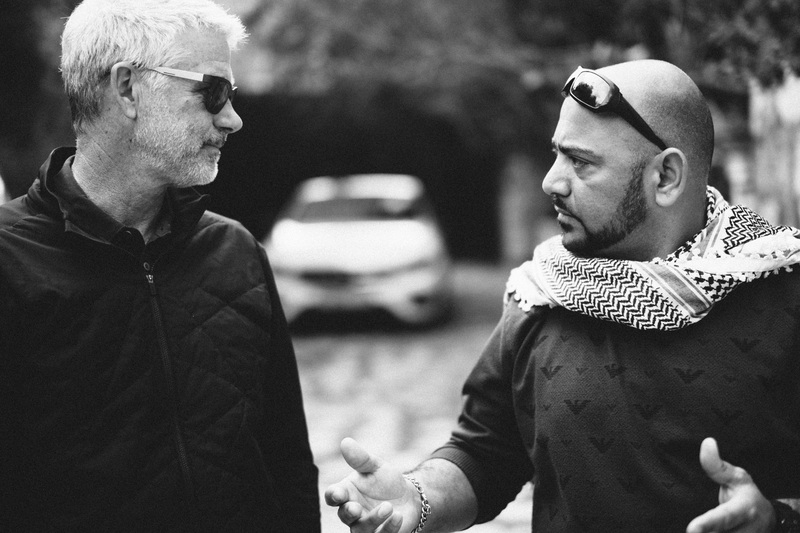 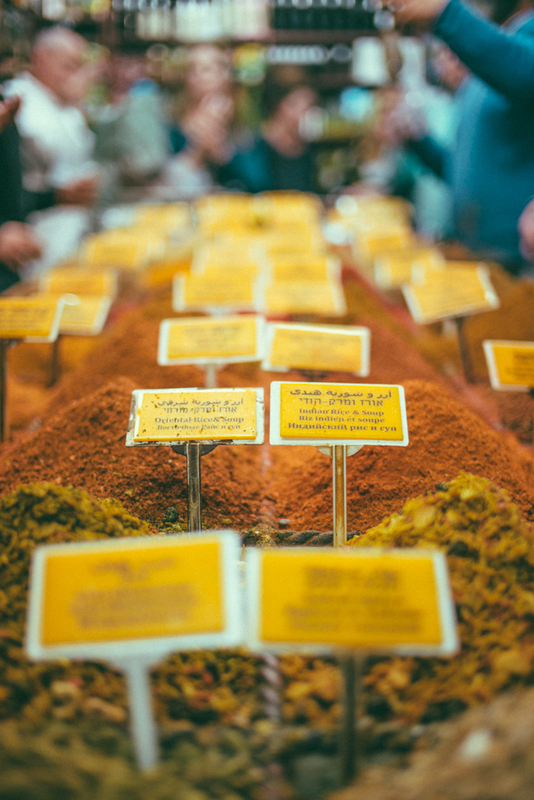 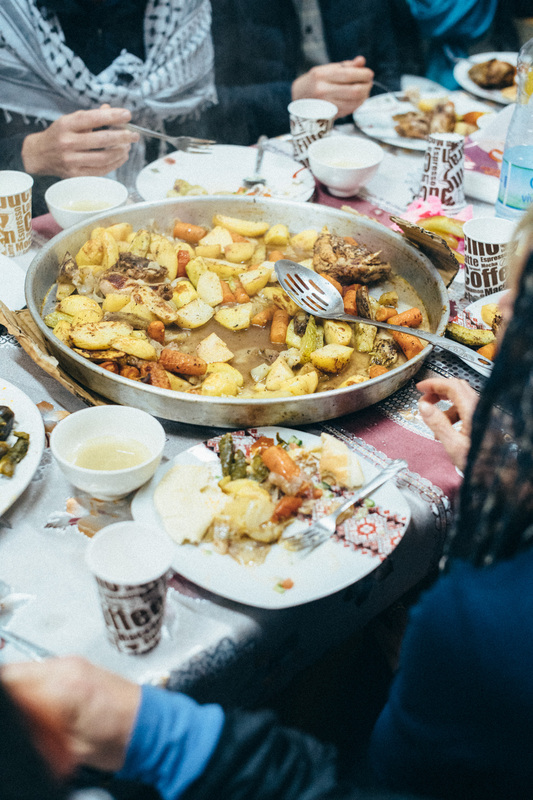 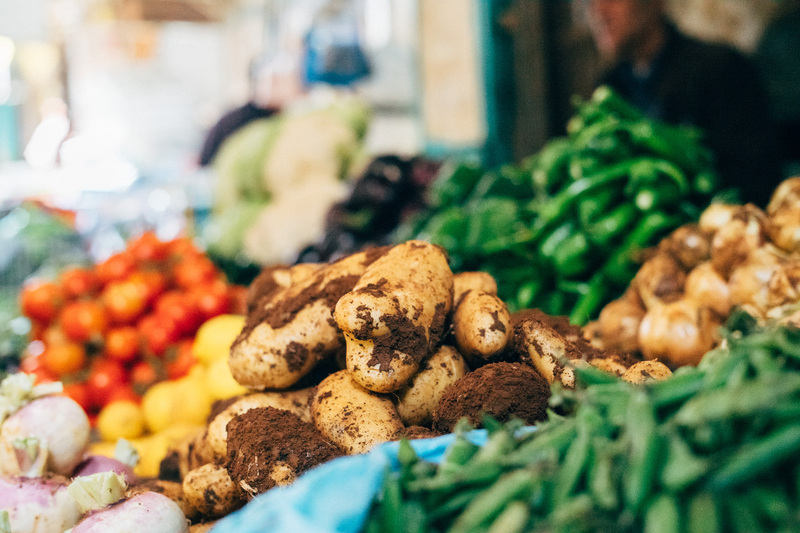 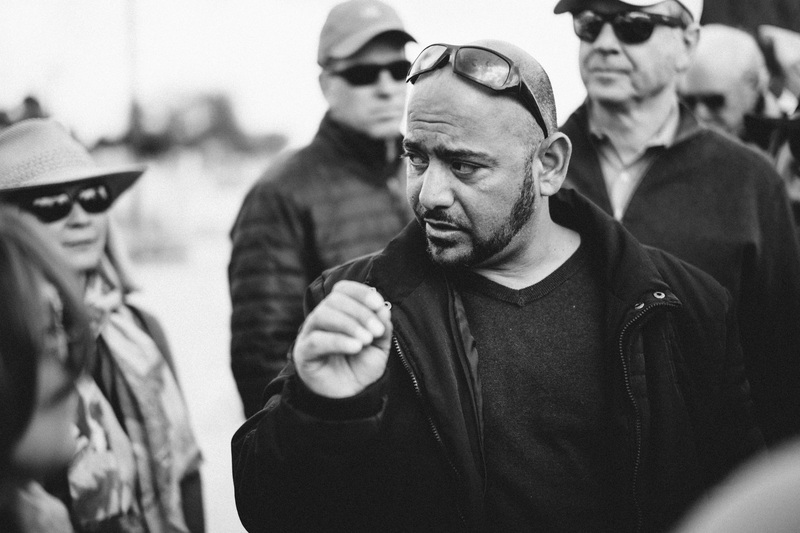 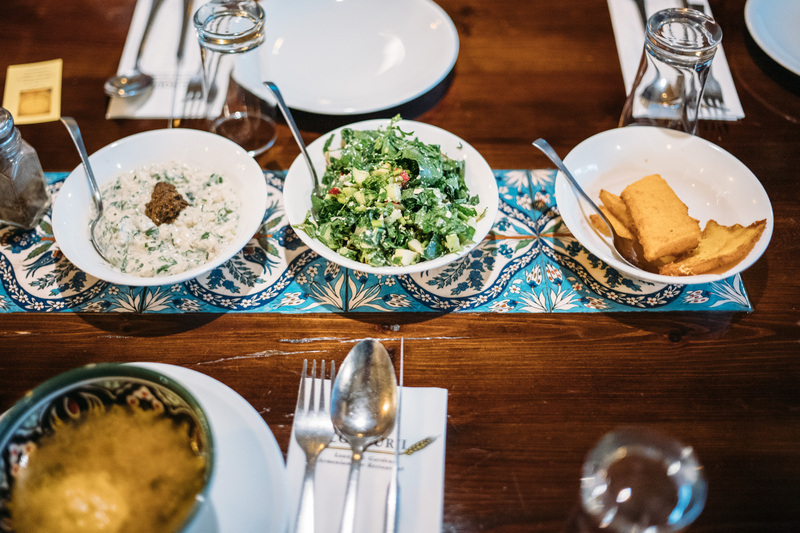 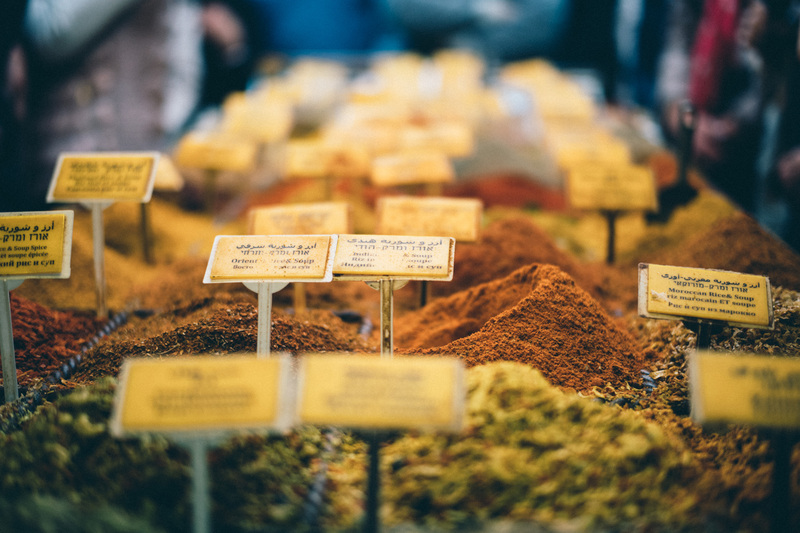 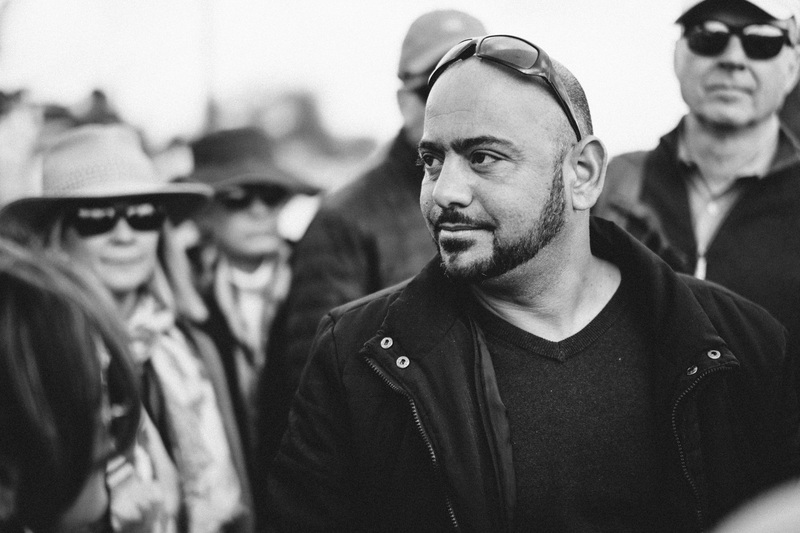 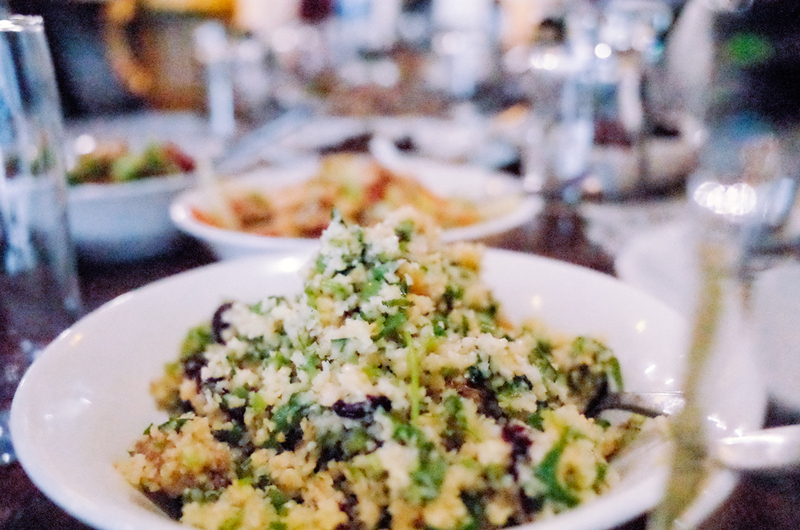 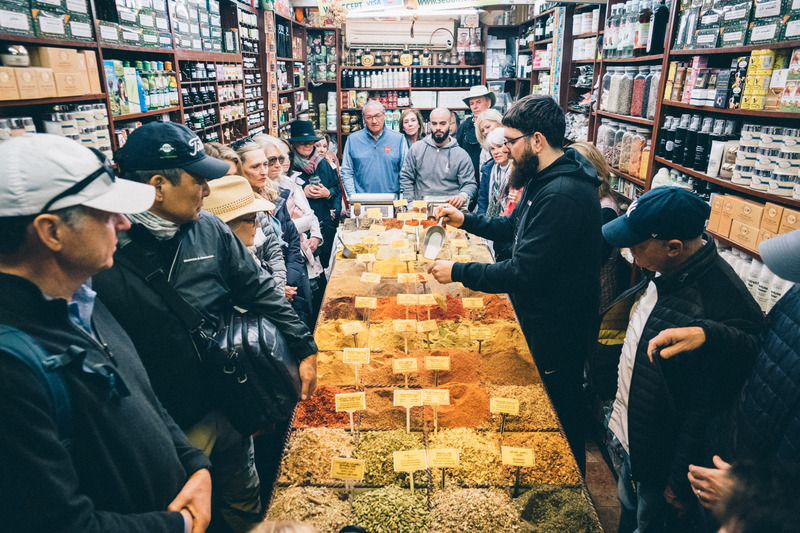 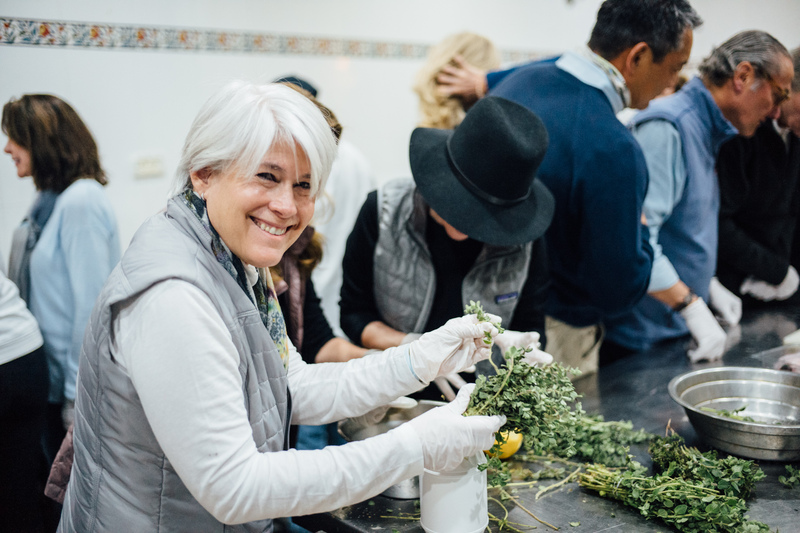 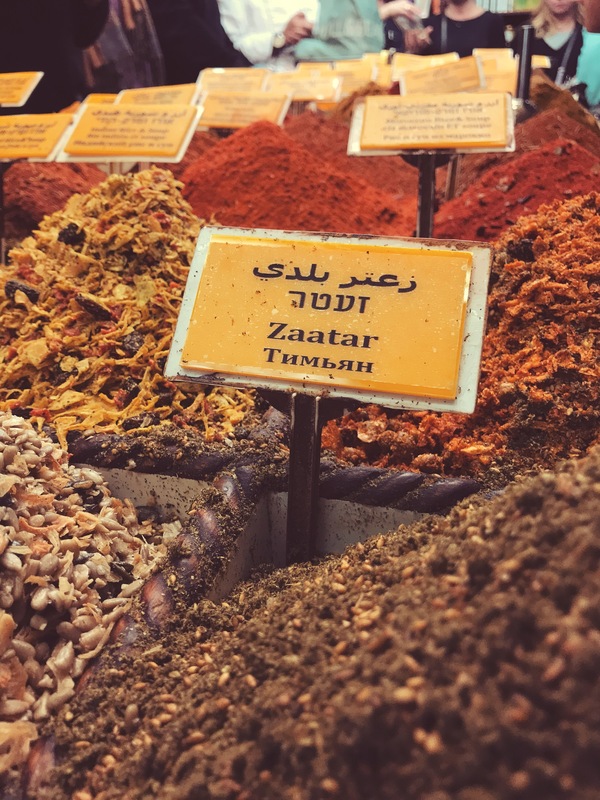 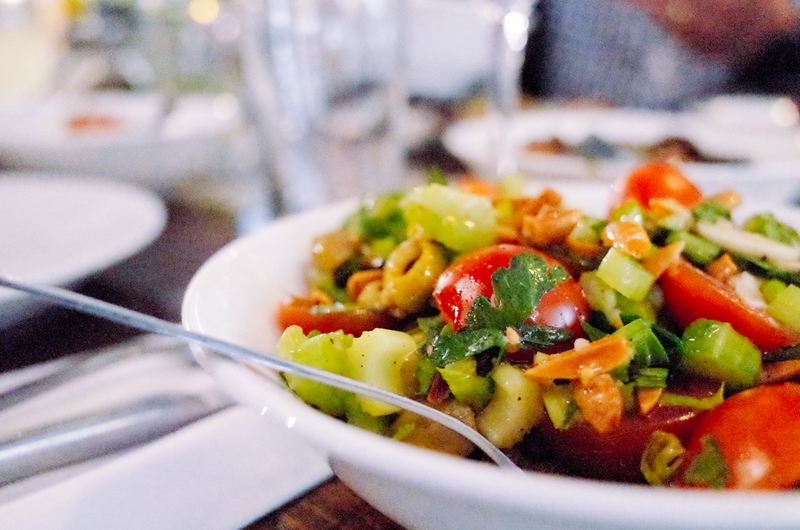 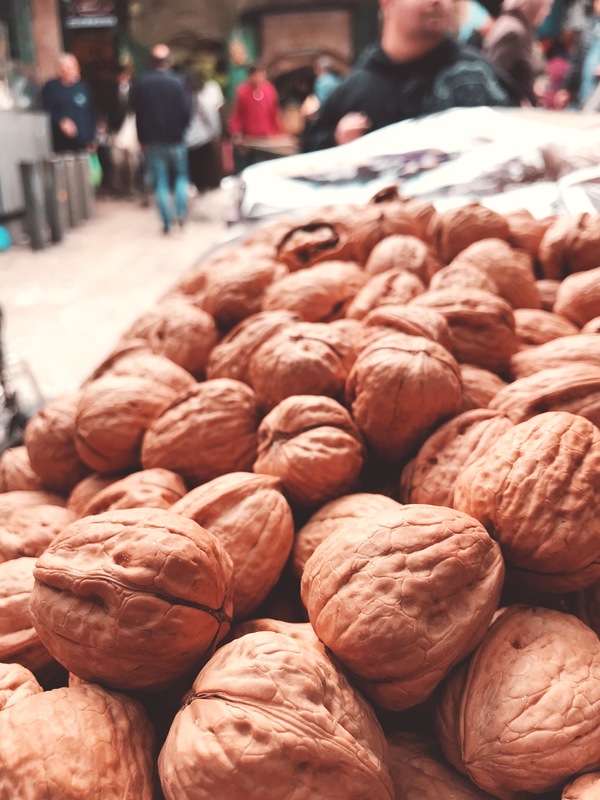 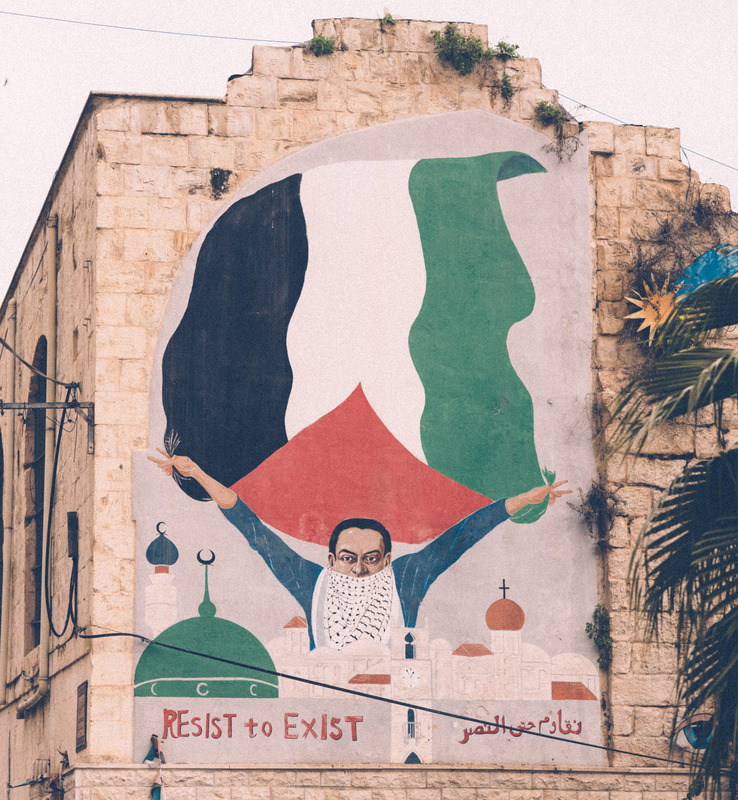 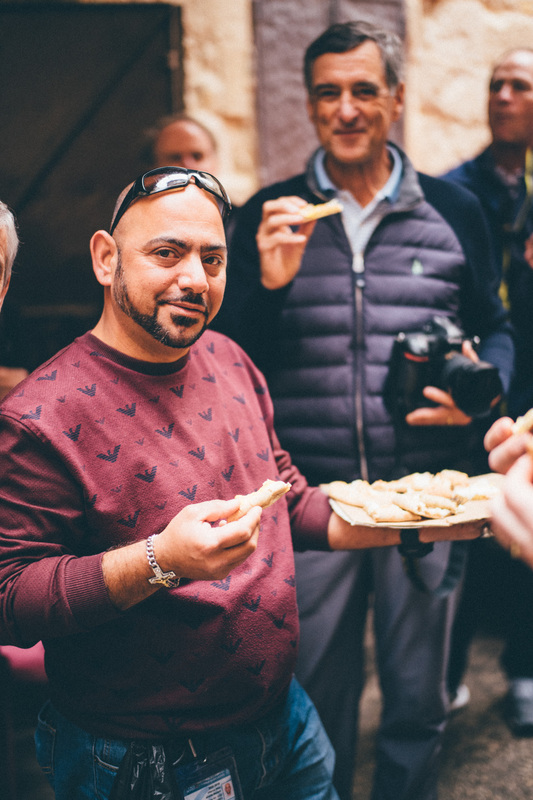 They’re a non-profit, non-political organization founded in Jerusalem in 2001 by a group of Jewish, Christian and Muslim chefs committed to exploring cultural identity, diversity and peaceful coexistence through food. 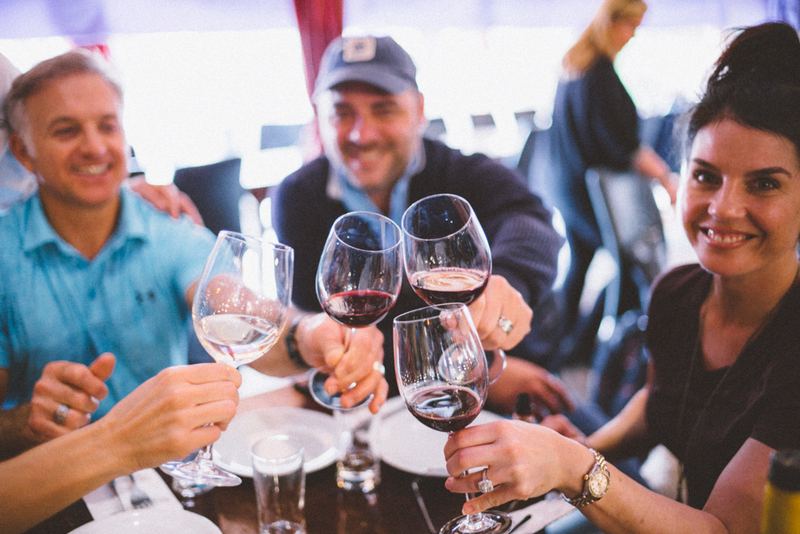 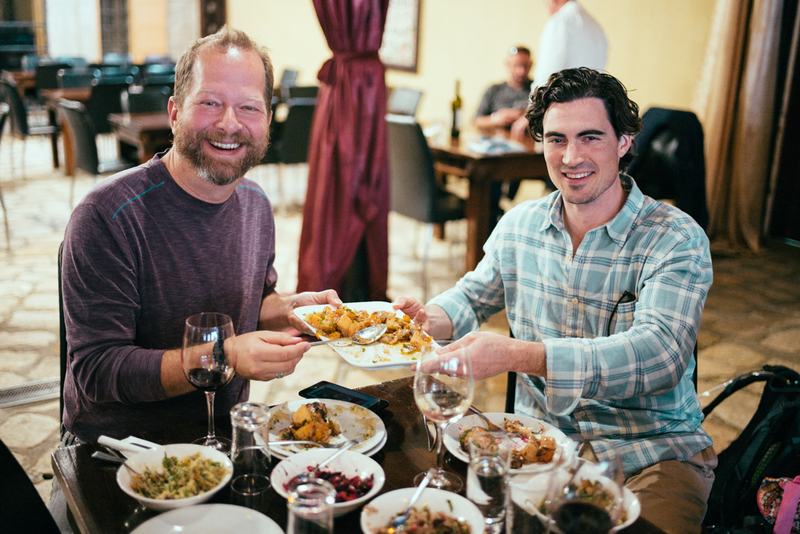 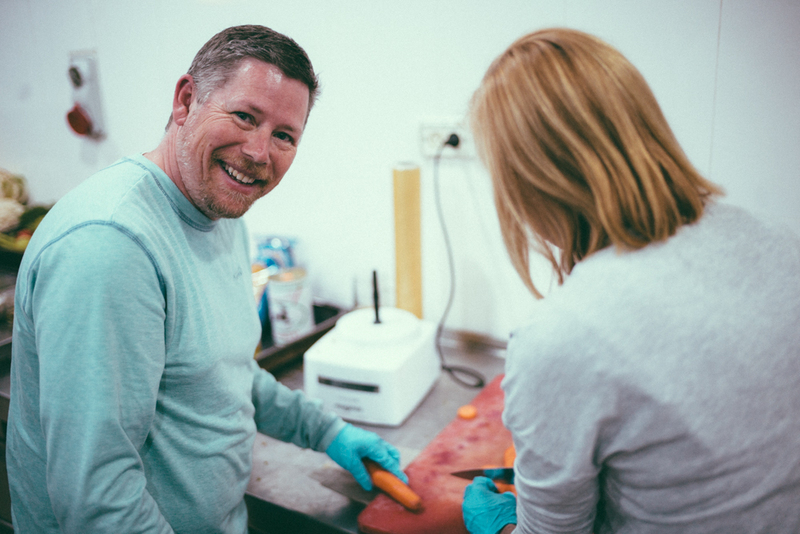 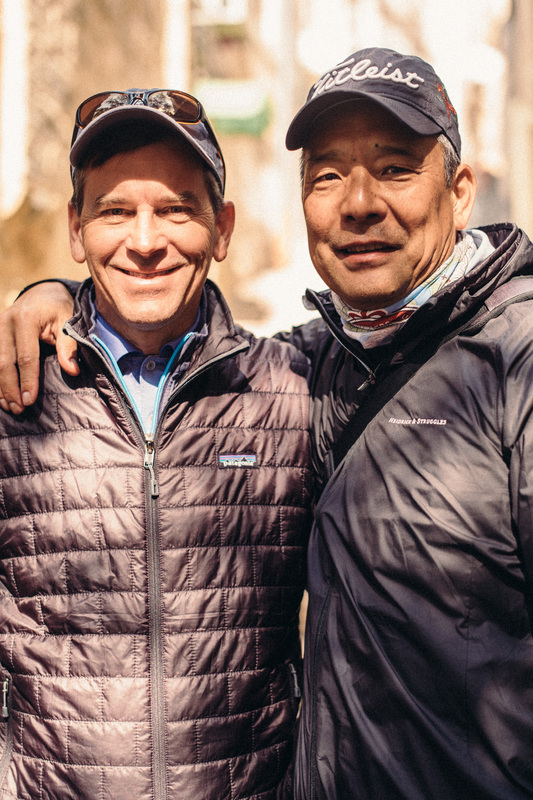 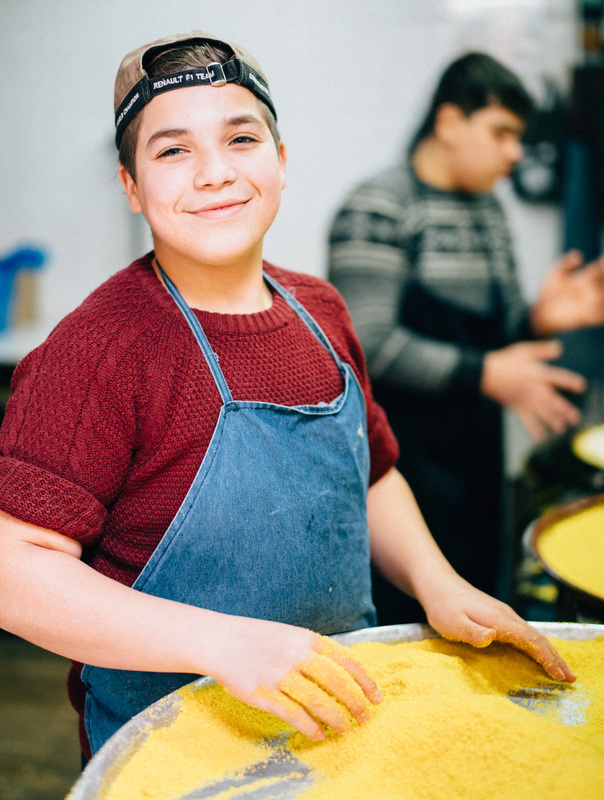 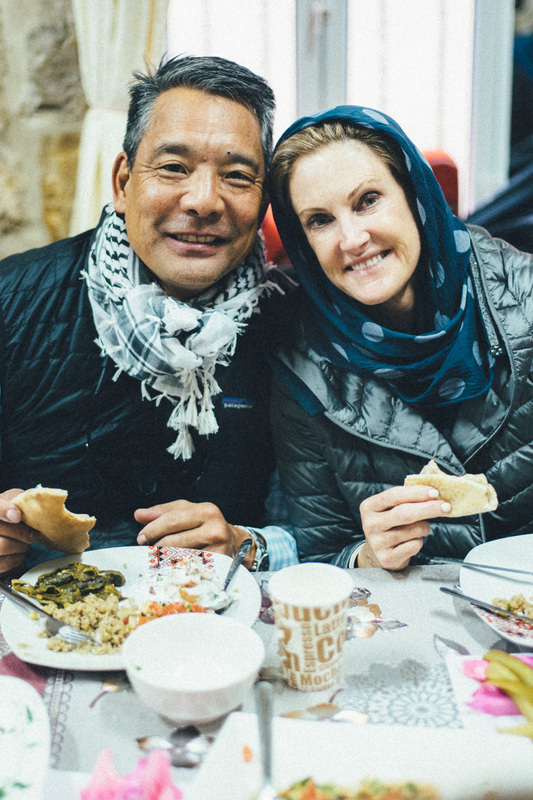 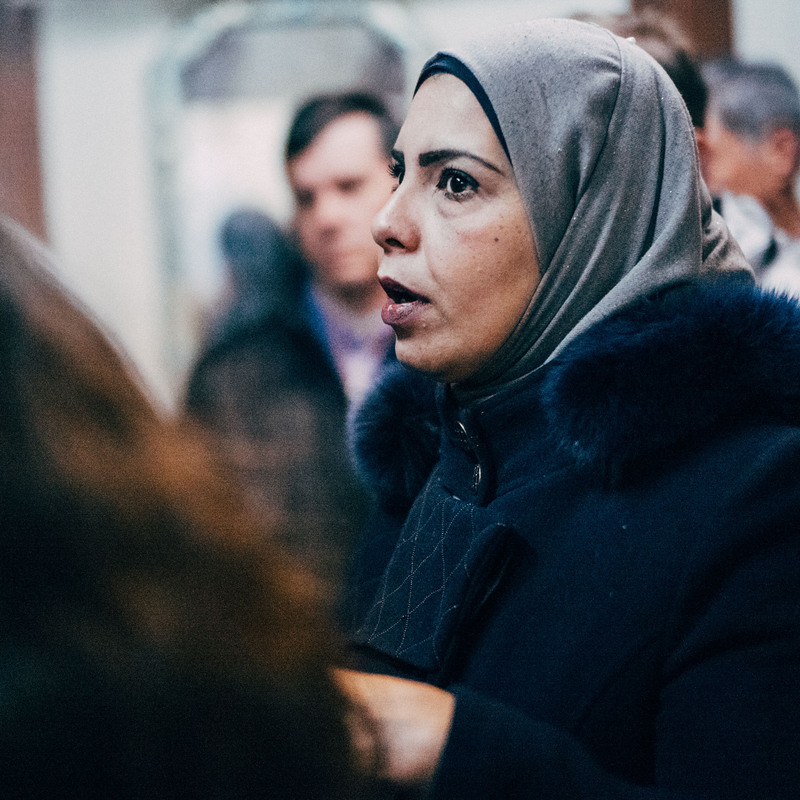 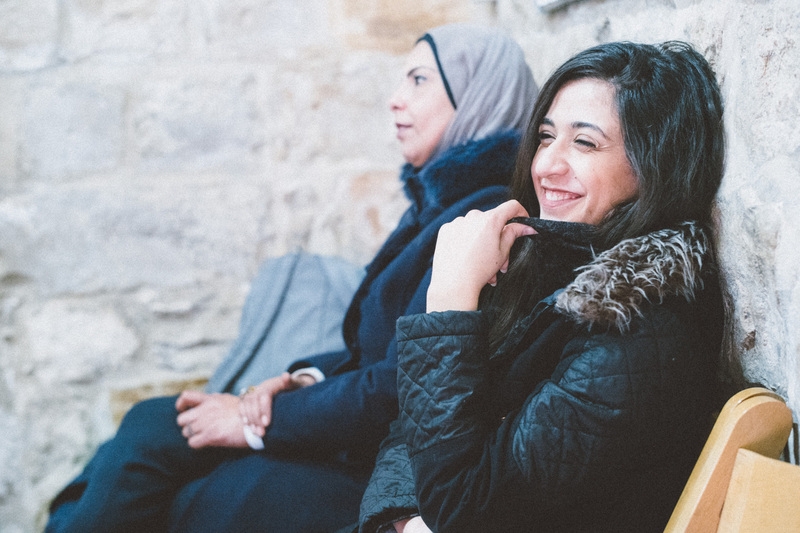 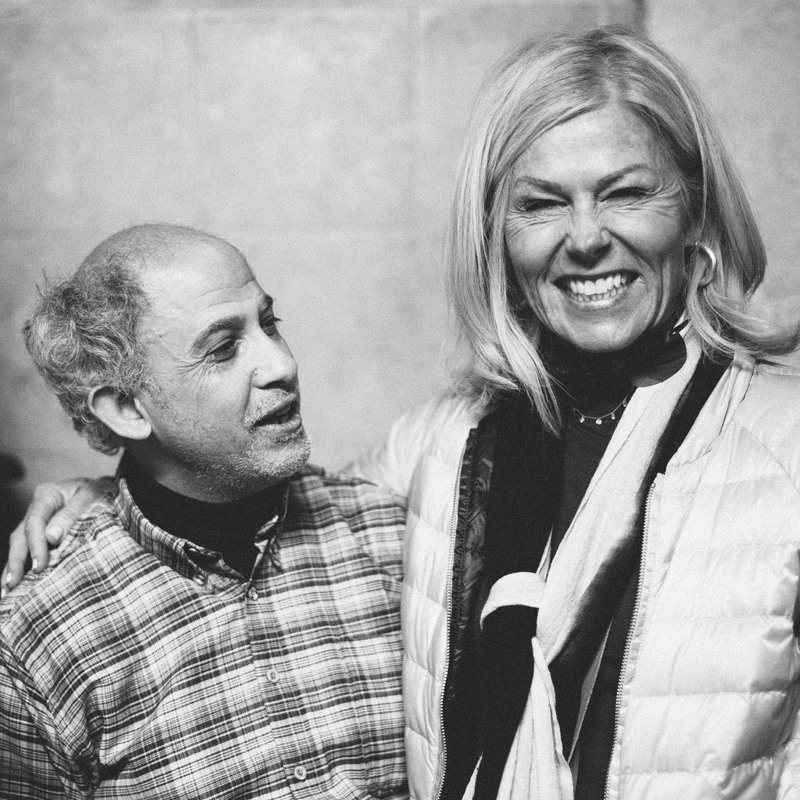 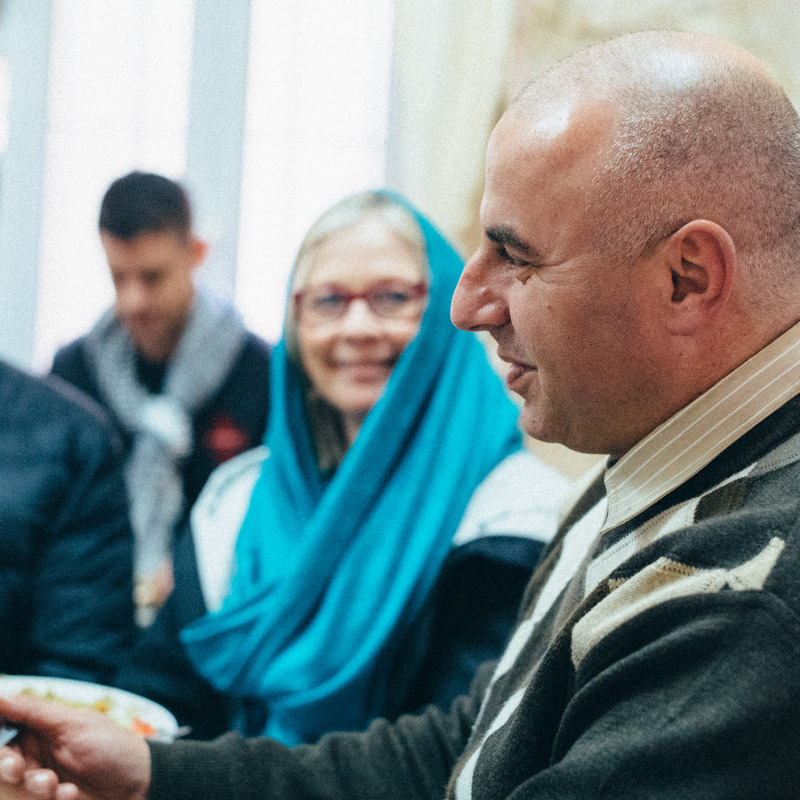 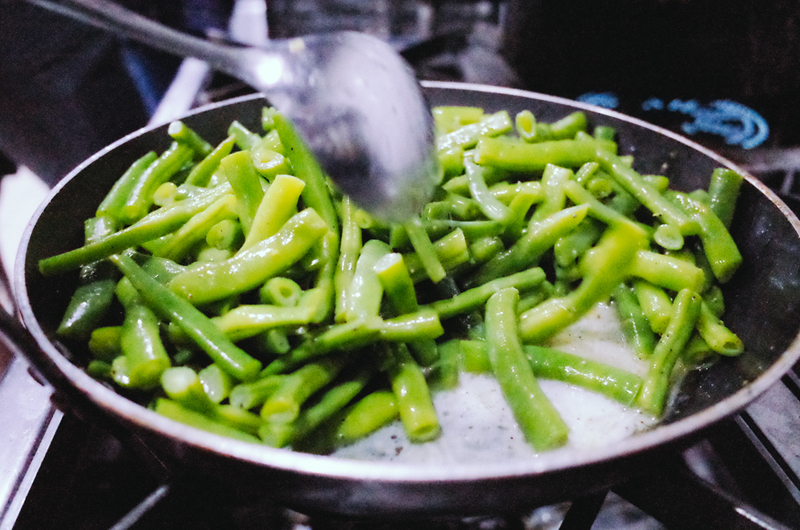 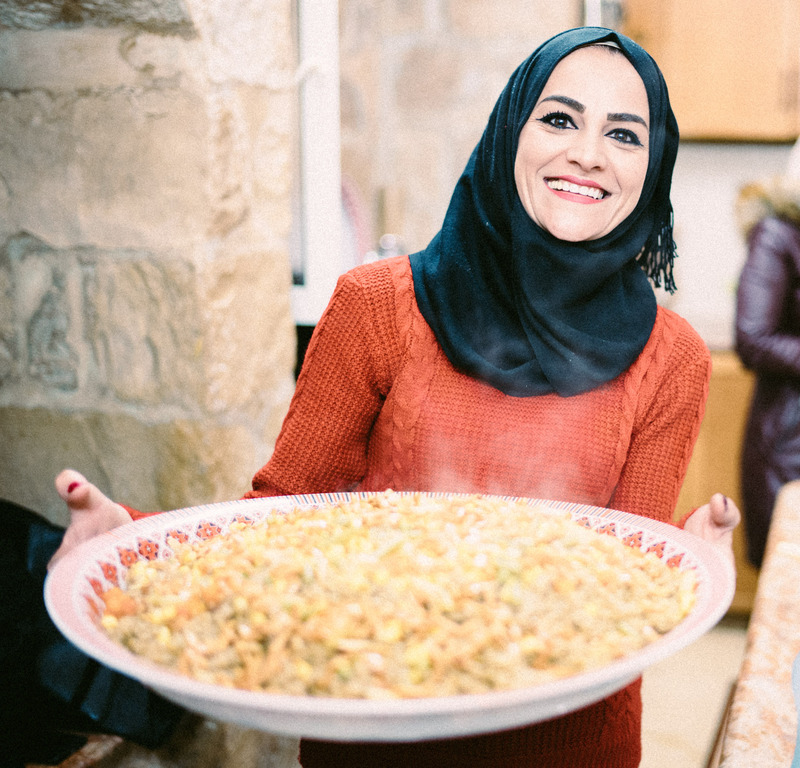 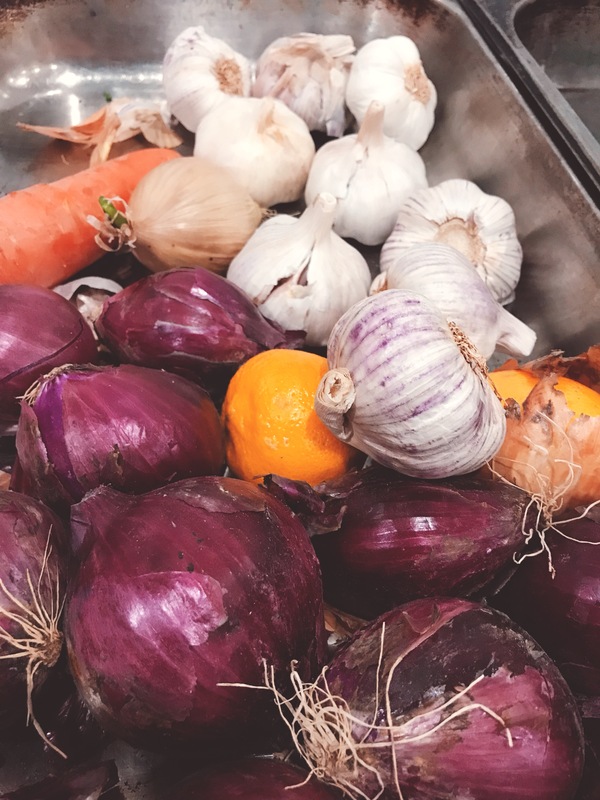 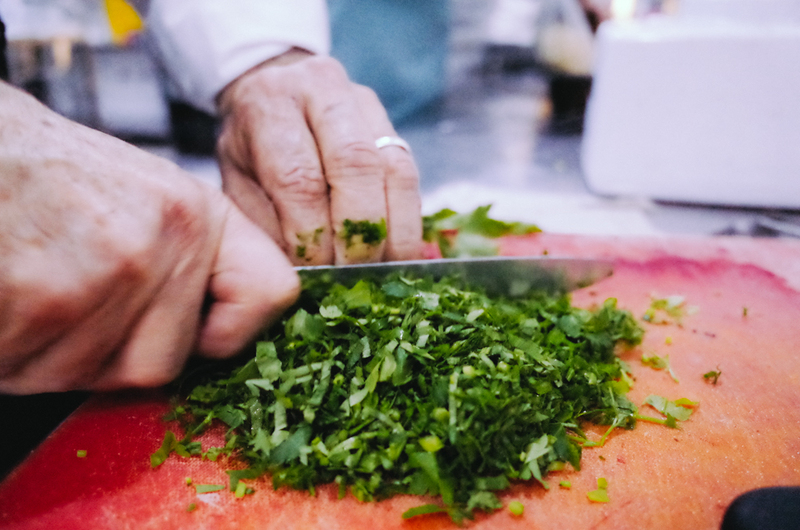 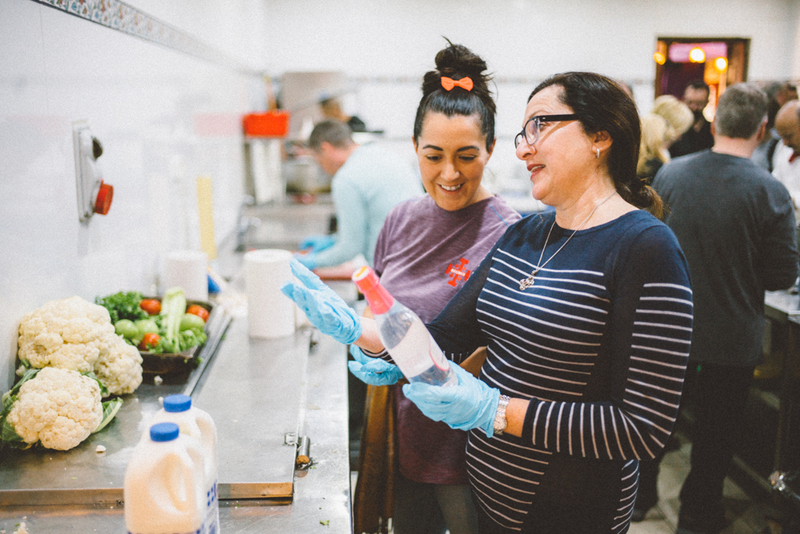 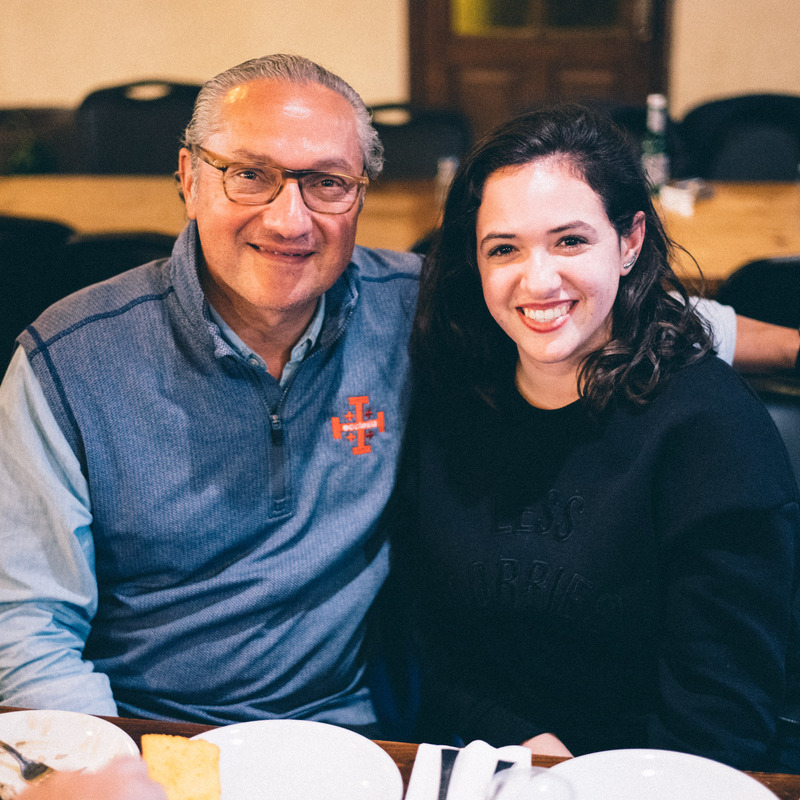 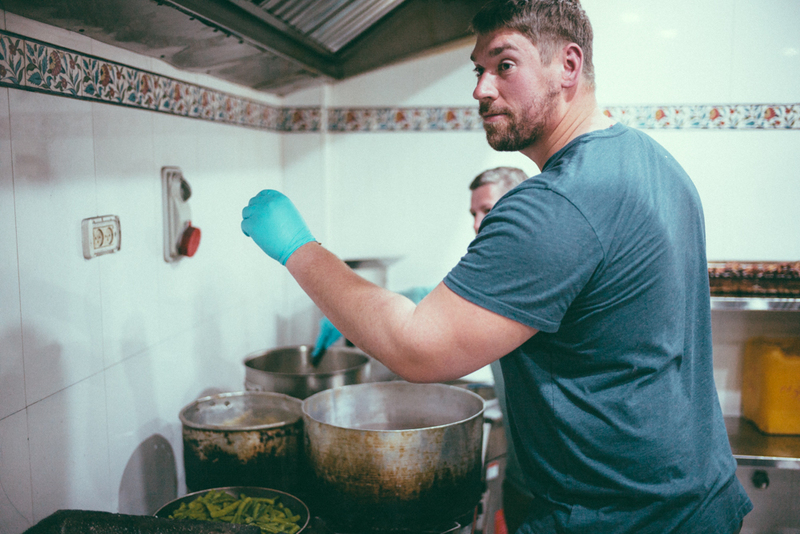 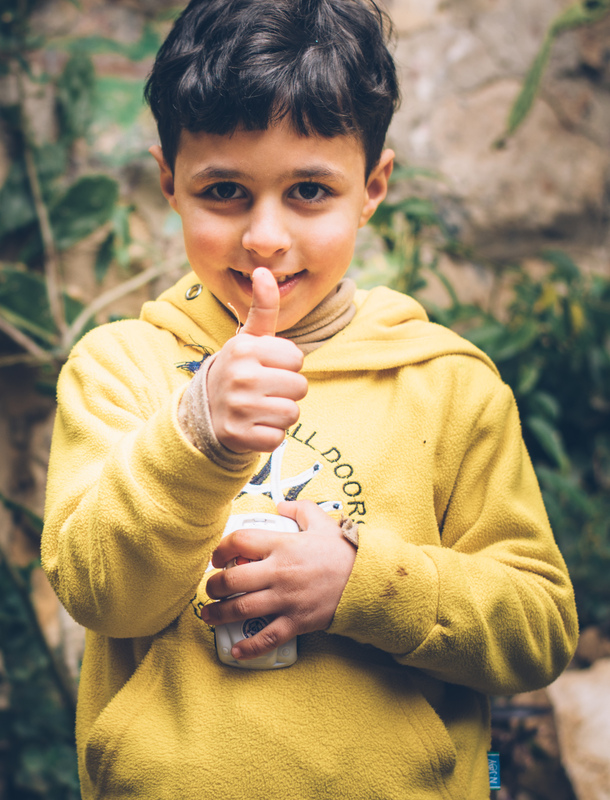 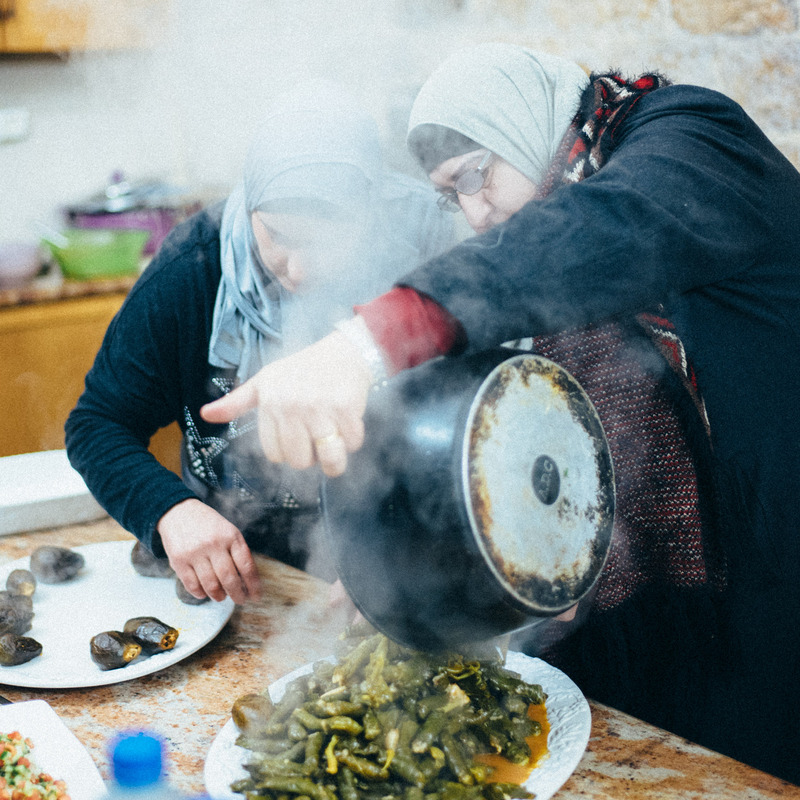 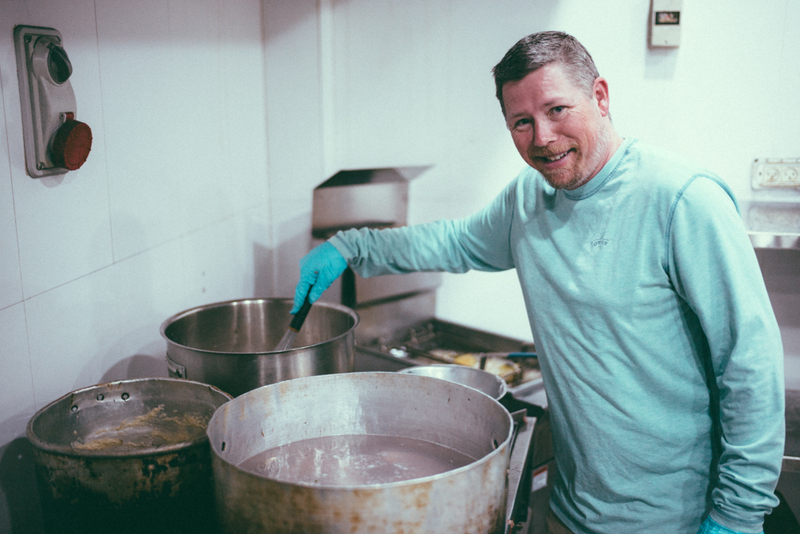 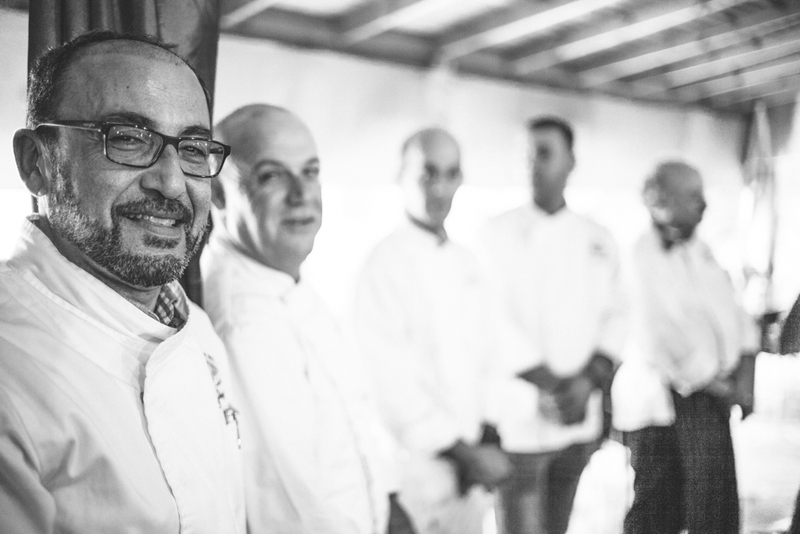 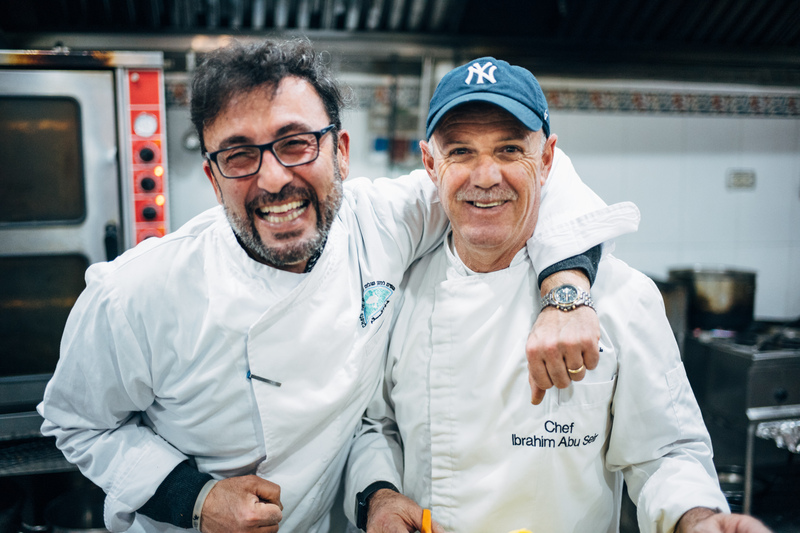 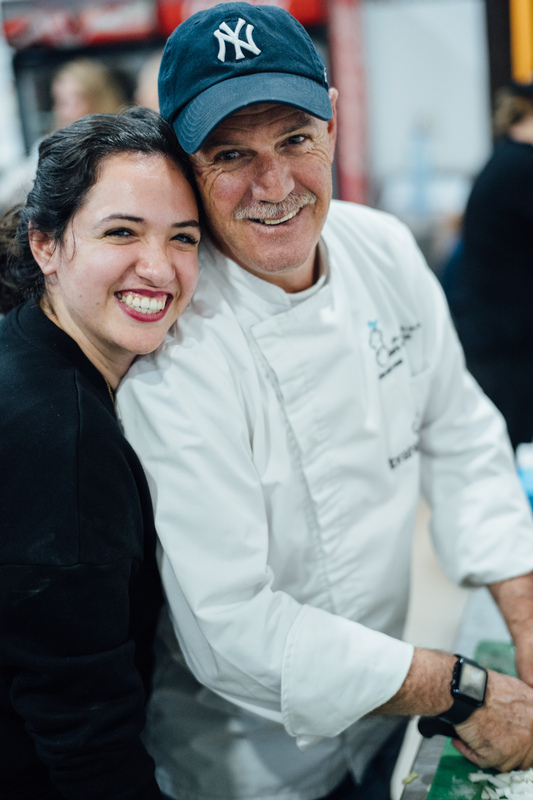 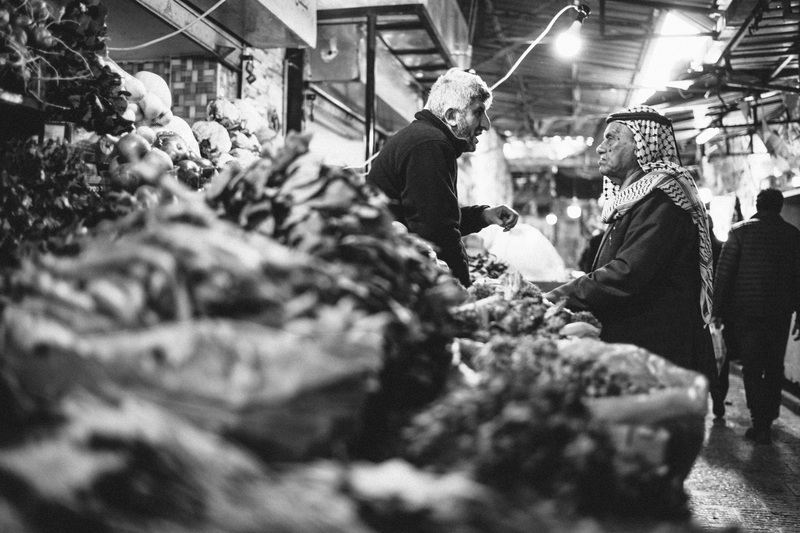 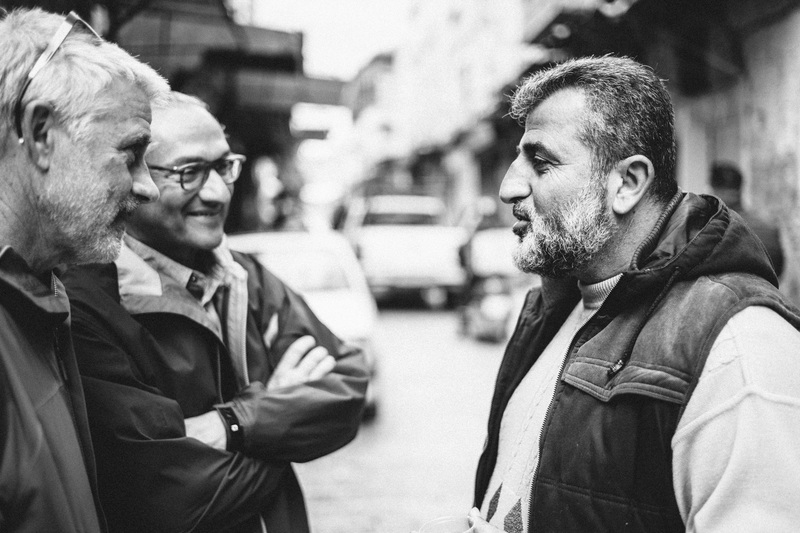 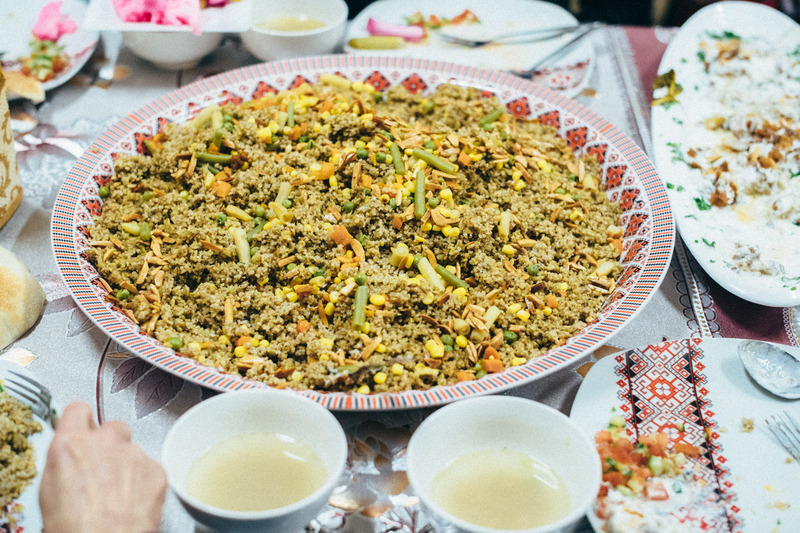 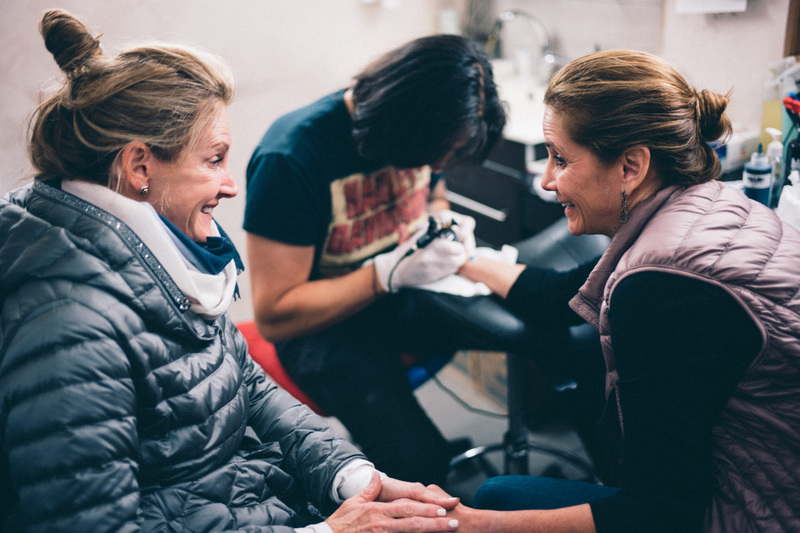 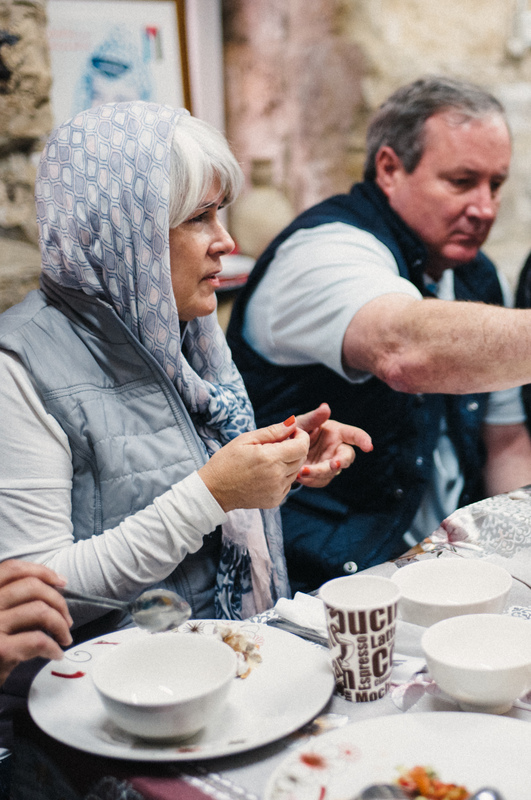 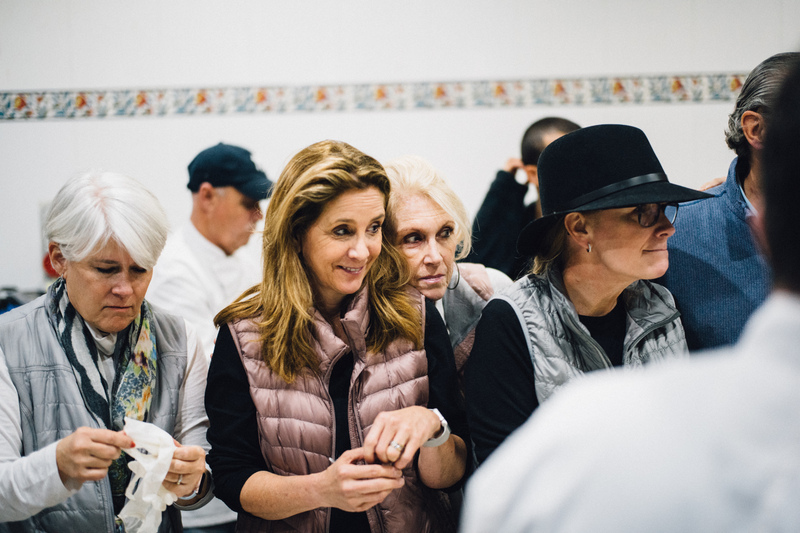 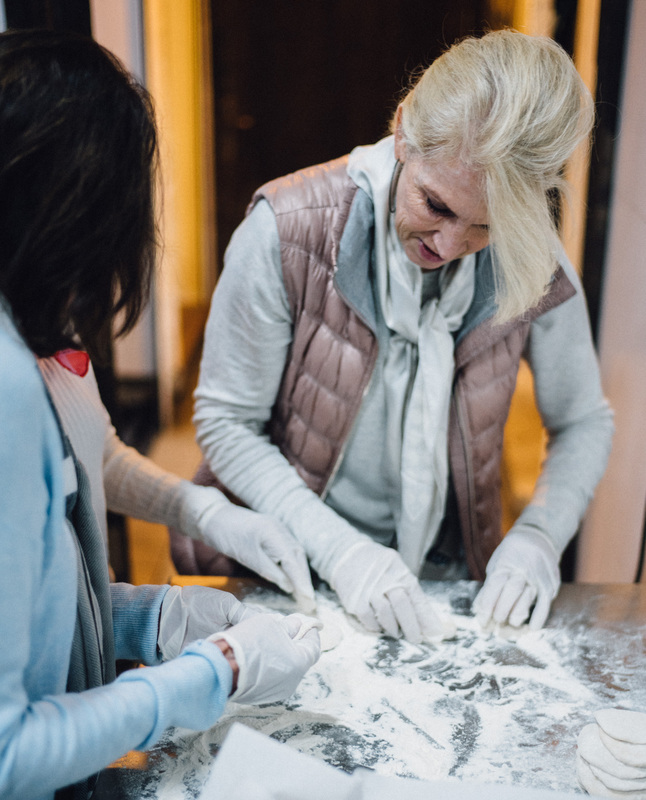 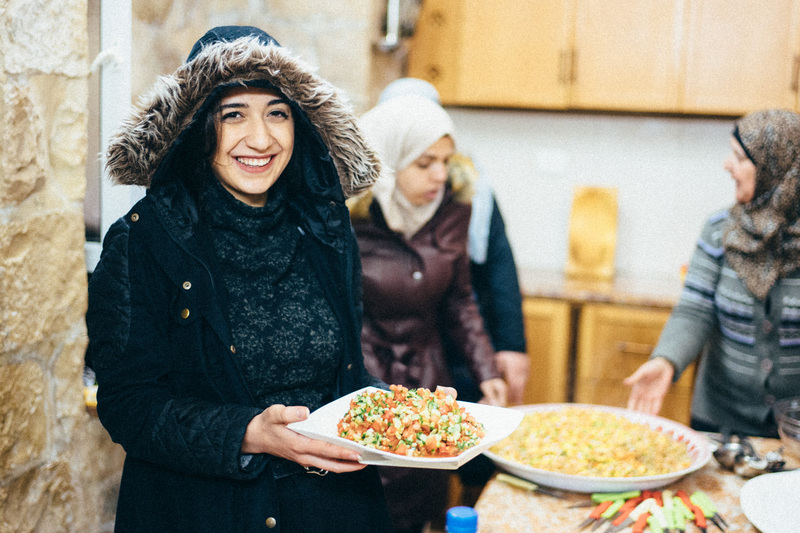 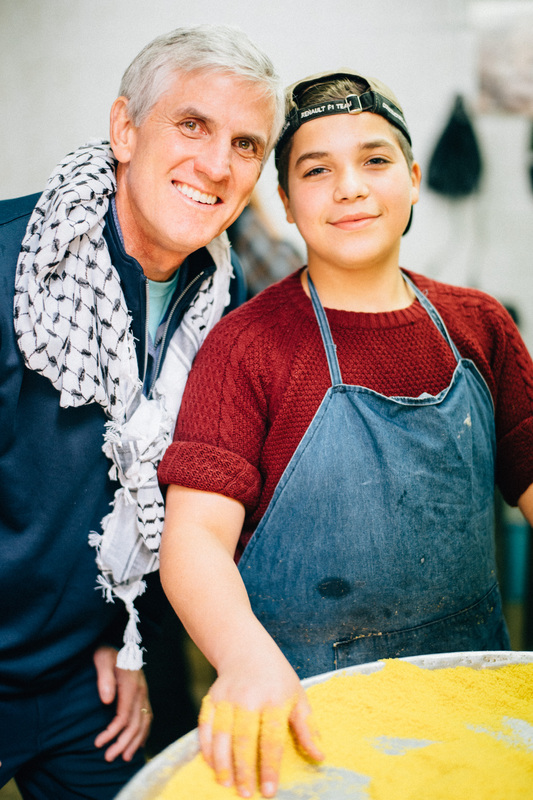 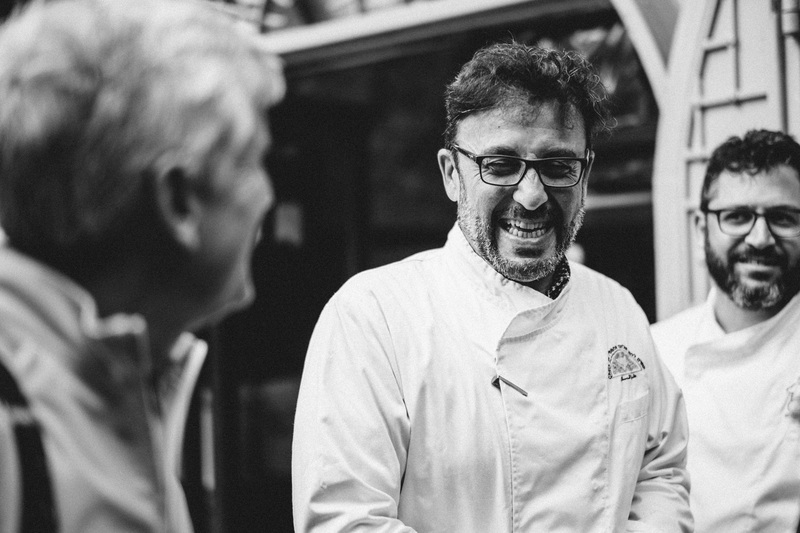 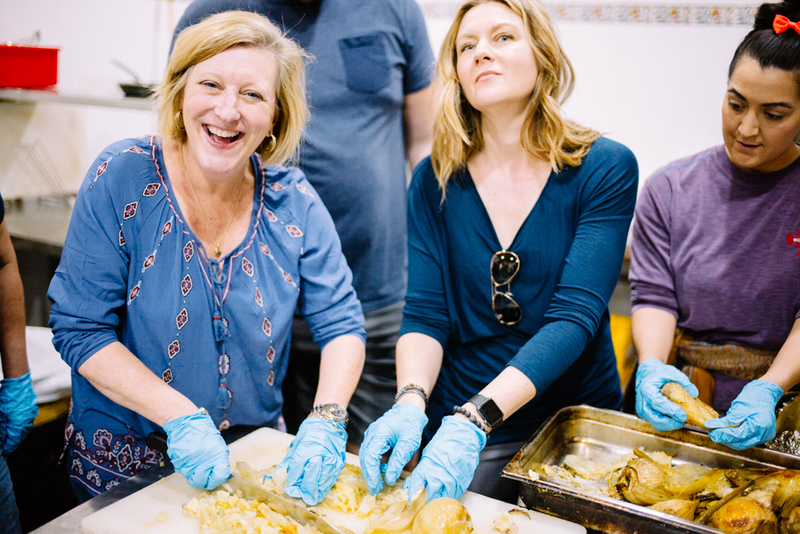 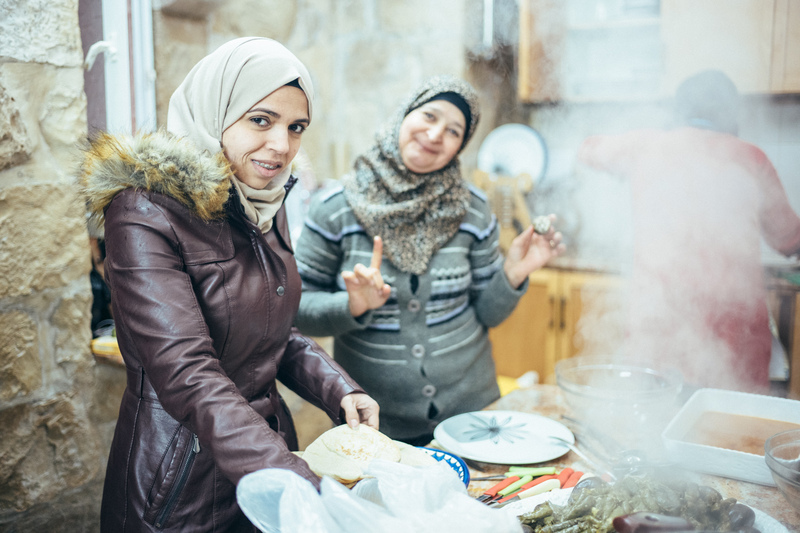 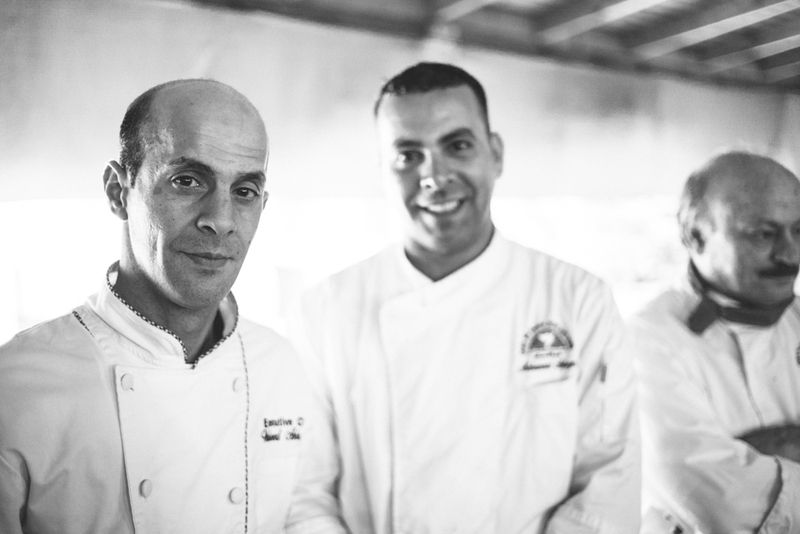 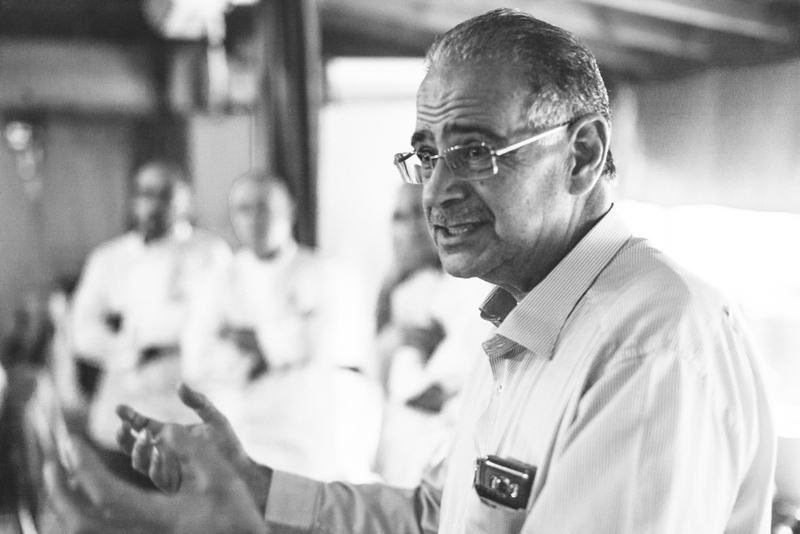 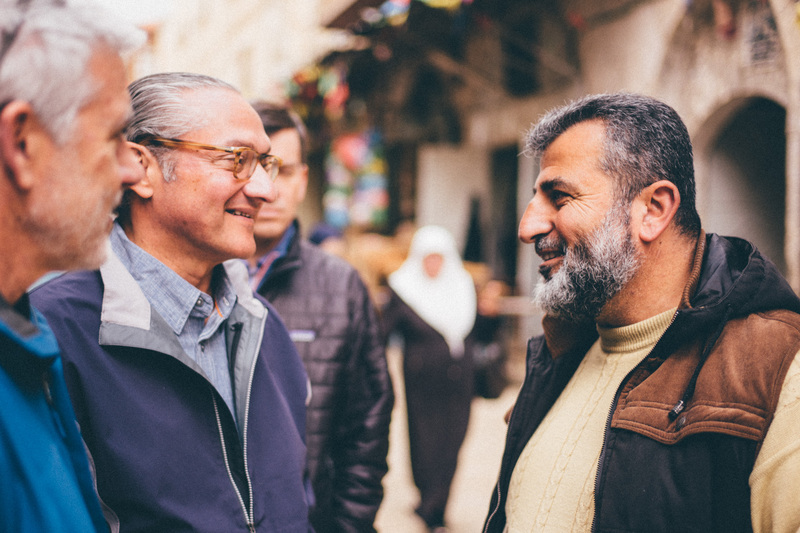 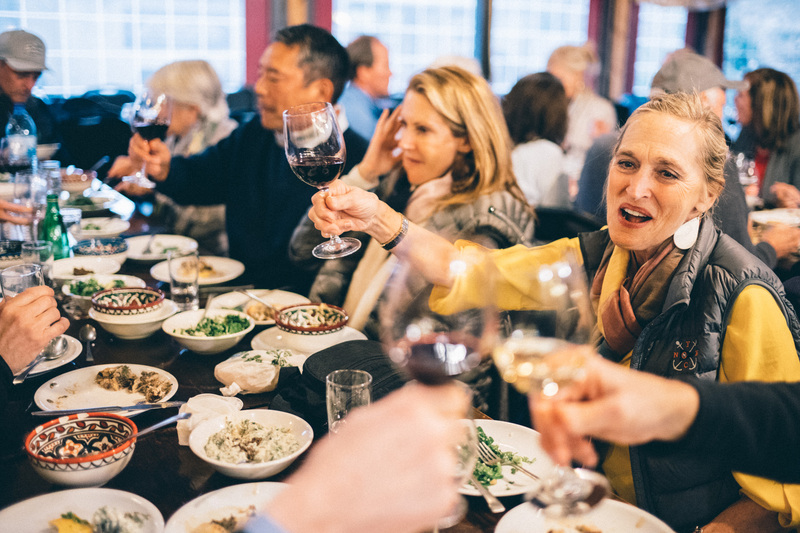 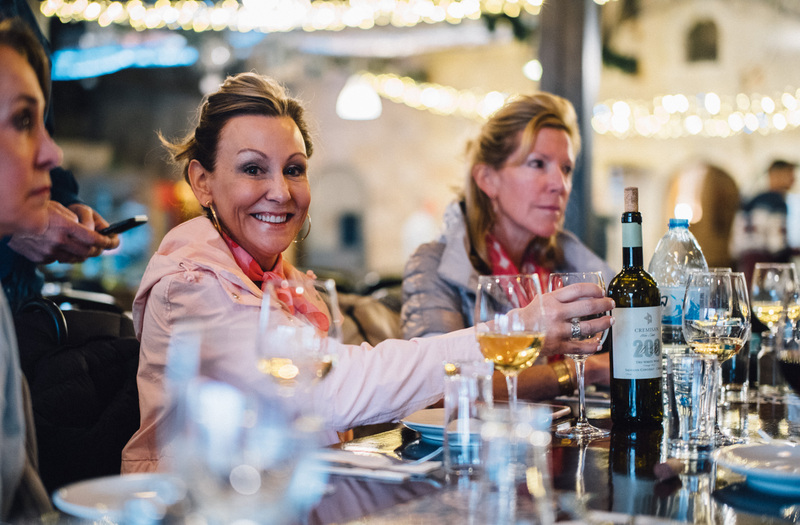 Chefs for Peace realizes food— its preparation, sharing, and enjoyment— is a powerful means of creating a bond with others and revealing that which is valued by all three faiths: food, family, and friends. 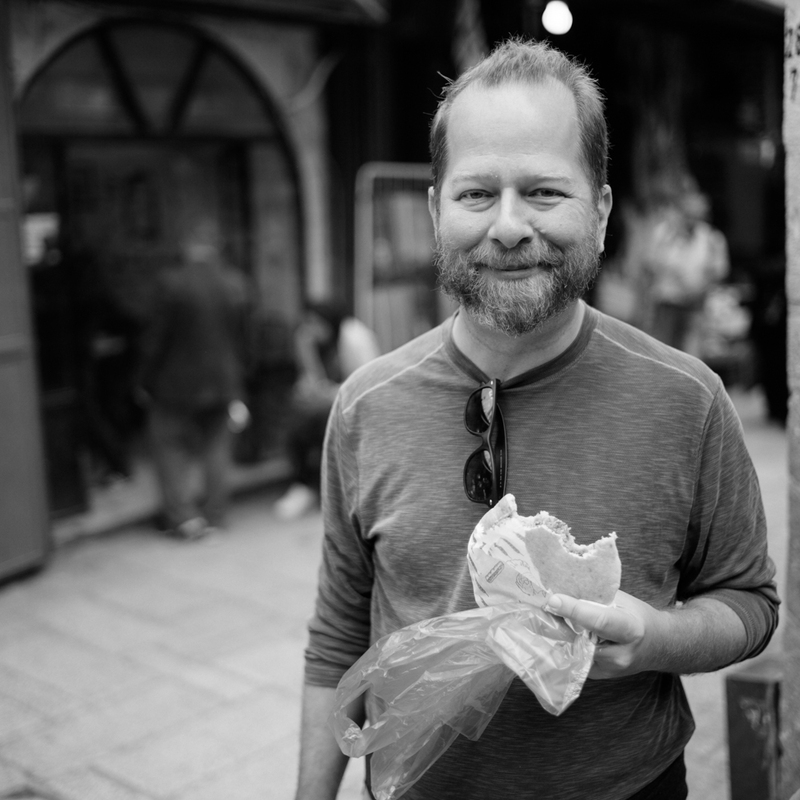 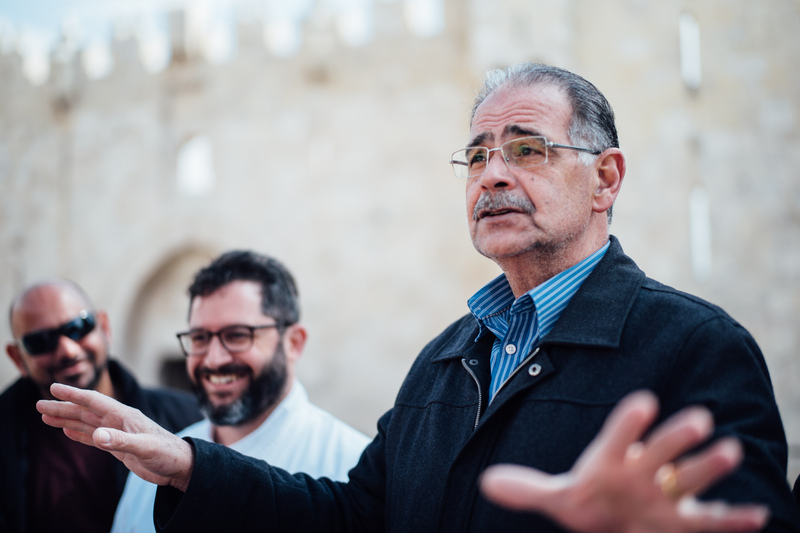 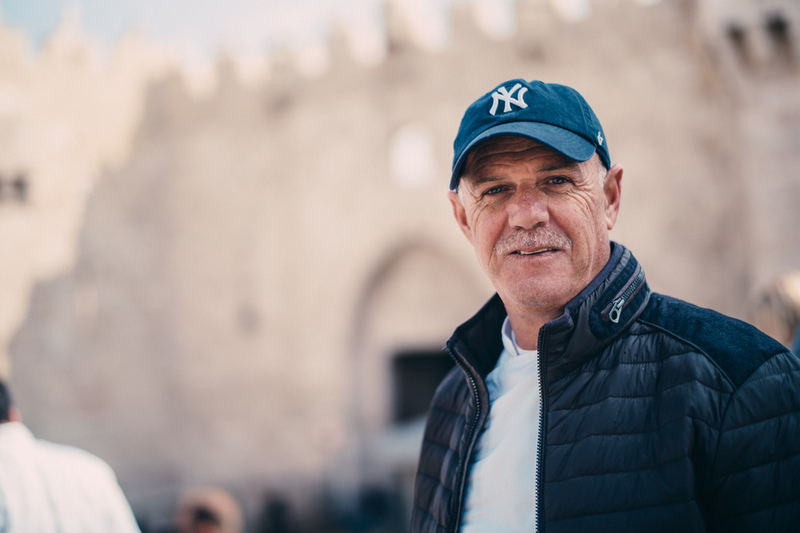 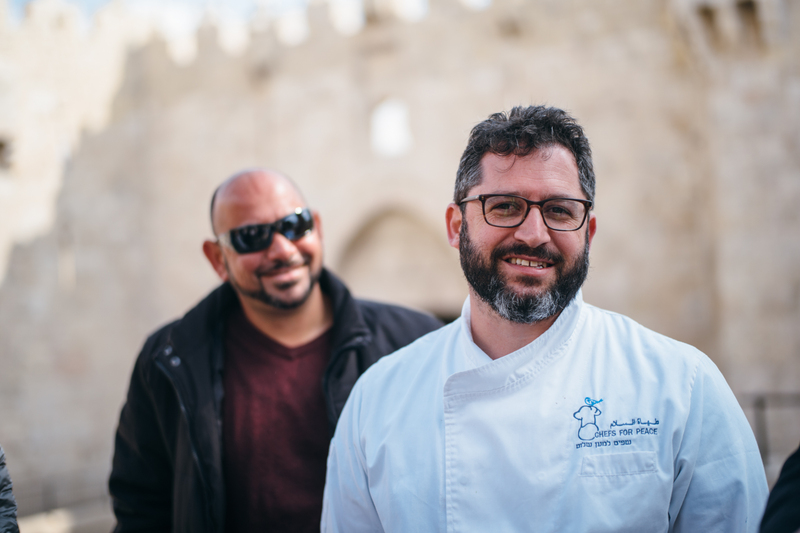 After a morning of free time recovering from our epic road trip the day before, we met the chefs at the Damascus Gate on Thursday along with the founder of Chefs for Peace, the Armenian, Jerusalem-born chef Kevork Alemian. 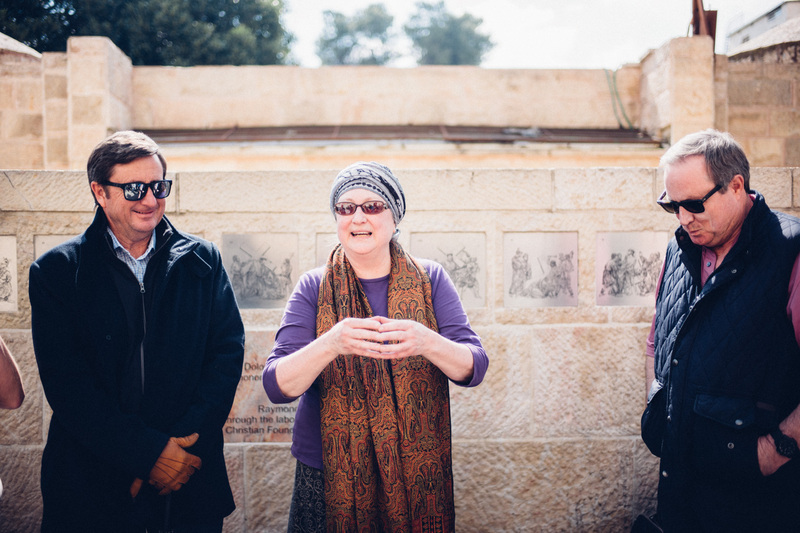 They then took us on a tour of the old city to buy some of the ingredients they would be using to prepare our lunch! 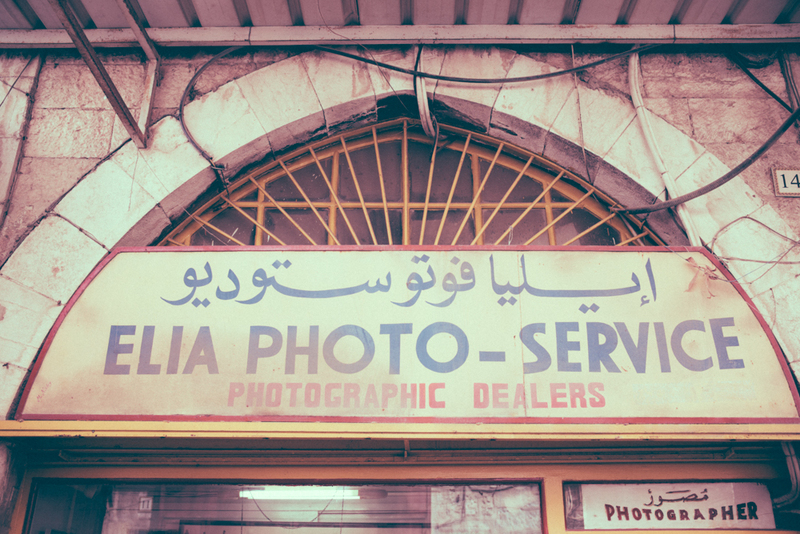 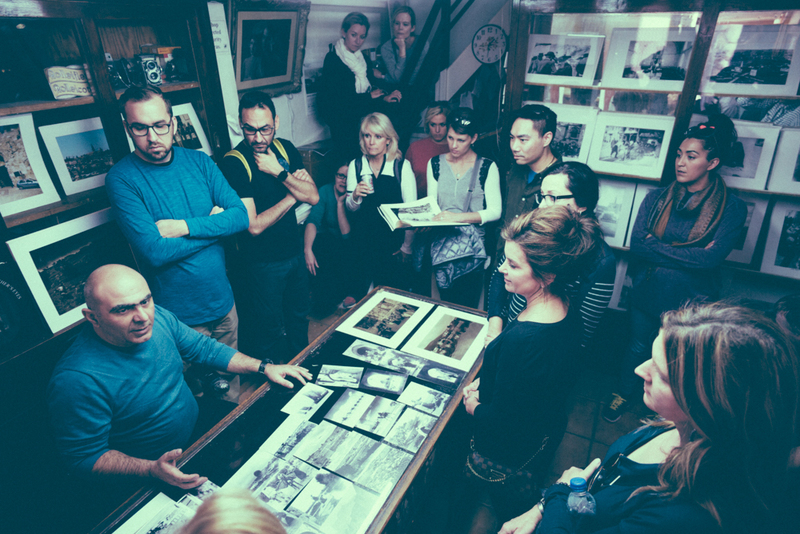 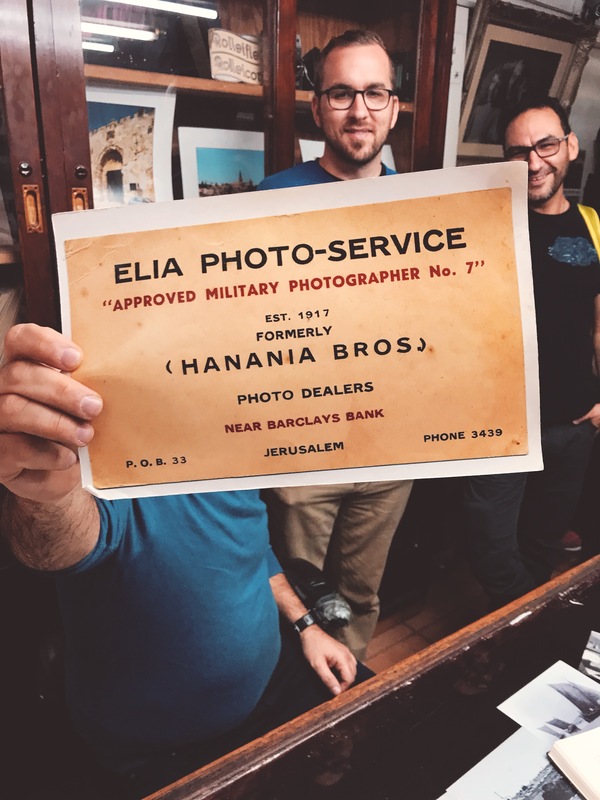 But first we visited a famous photography print shop, known as Elia’s Photo Service, the pictures this Armenian family sell are part of a collection of about 3,000 photographs taken by their late father Elia Kahvedjian, a refugee of the Armenian genocide and one of the greatest photographers in Jerusalem at the beginning of the 20th century. 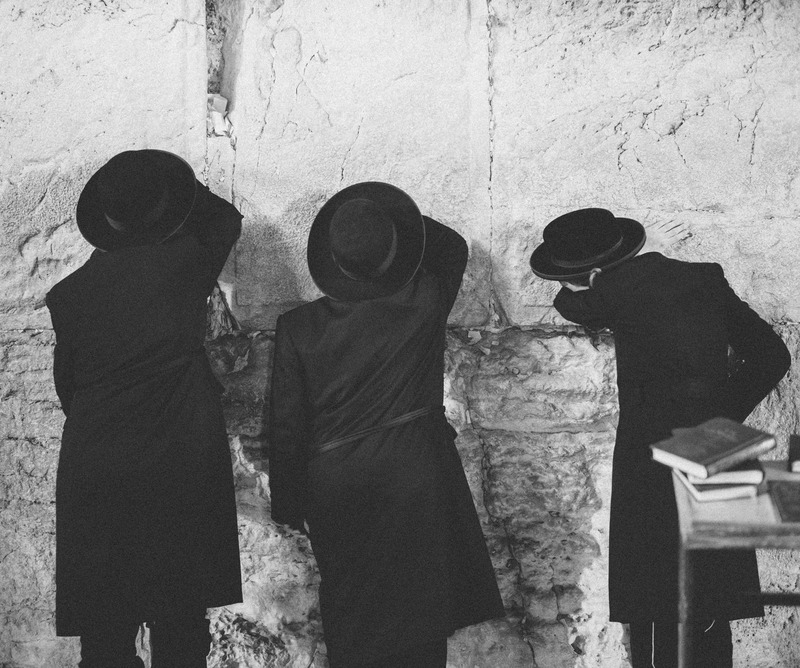 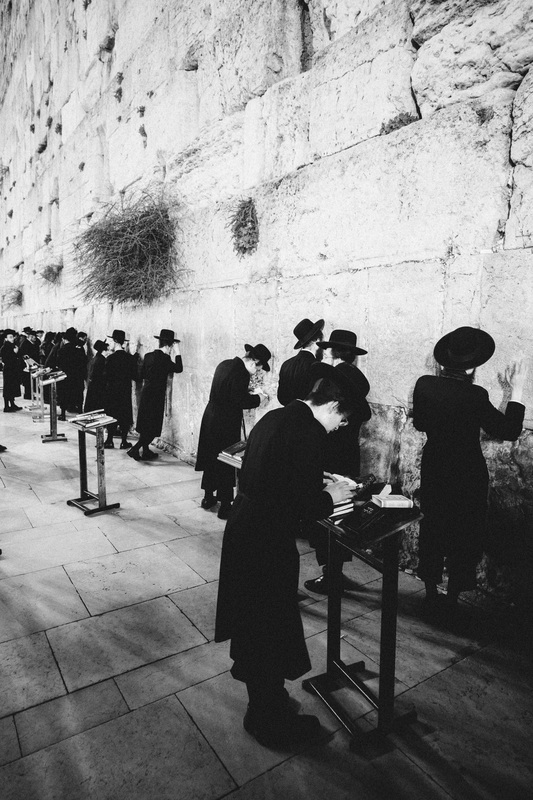 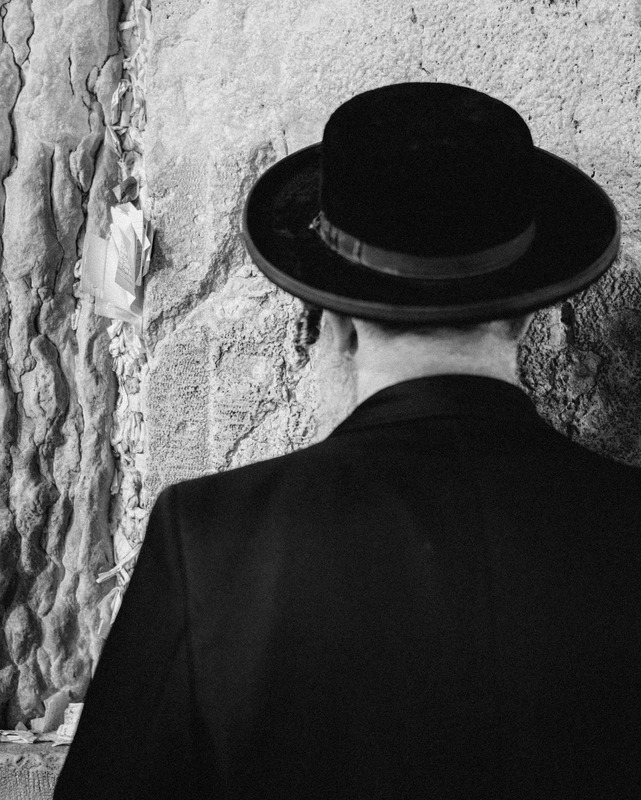 The pictures, which had been hidden away since 1947, were rediscovered by the family over 30 years ago and serve to help researchers and aficionados of Jerusalem probe its past. 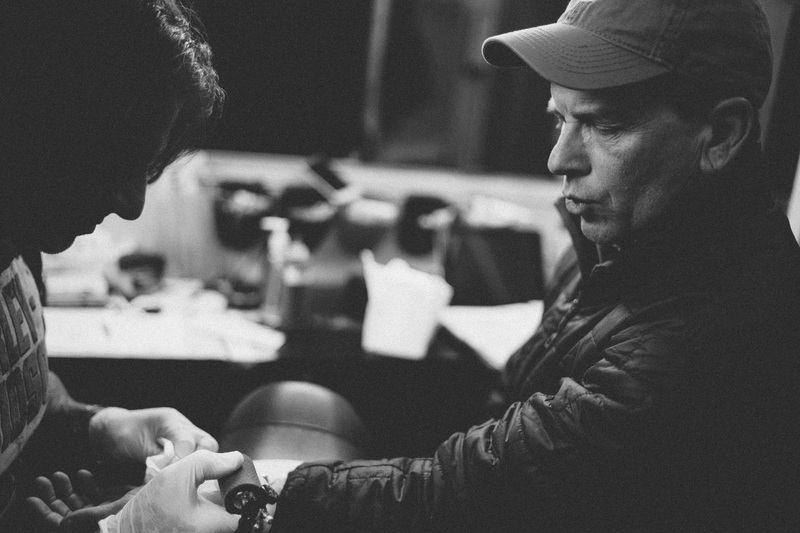 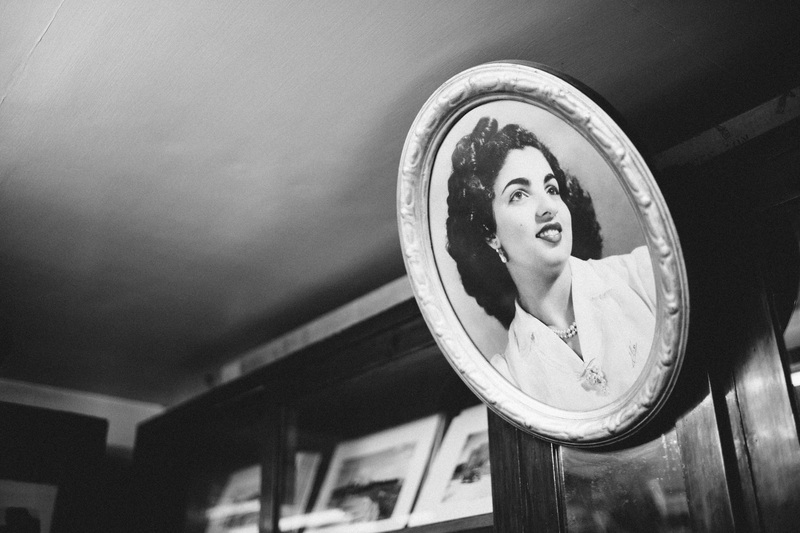 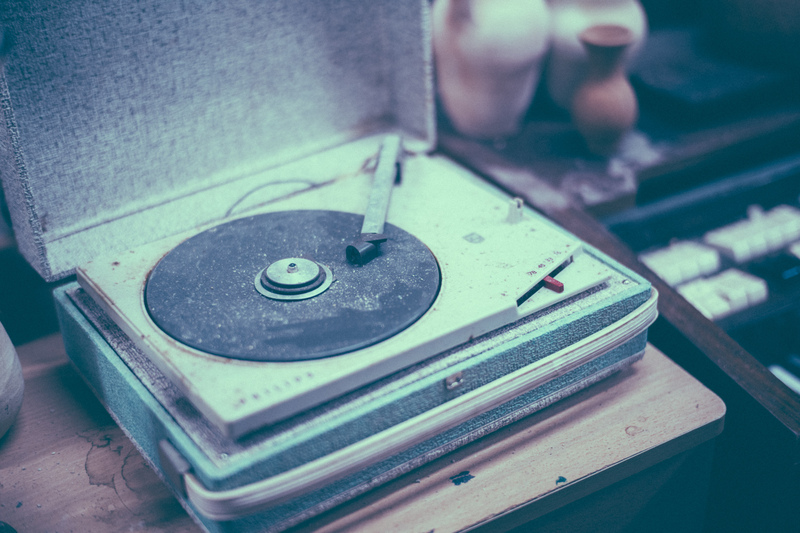 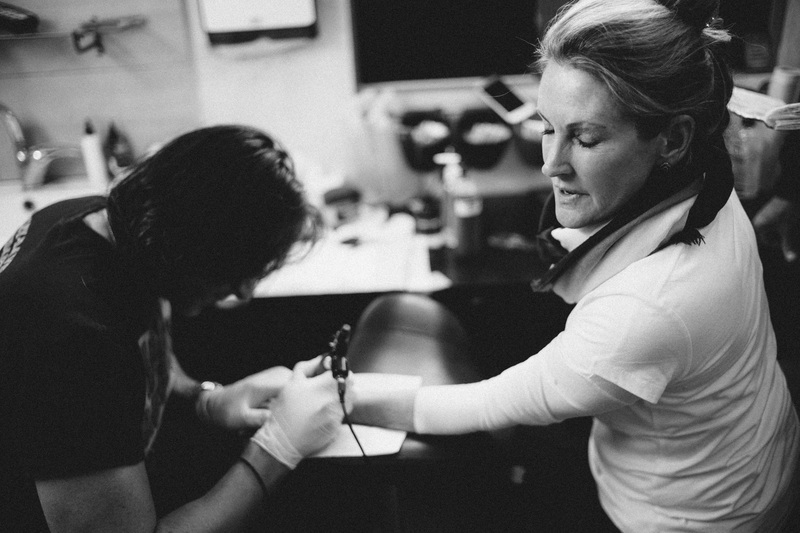 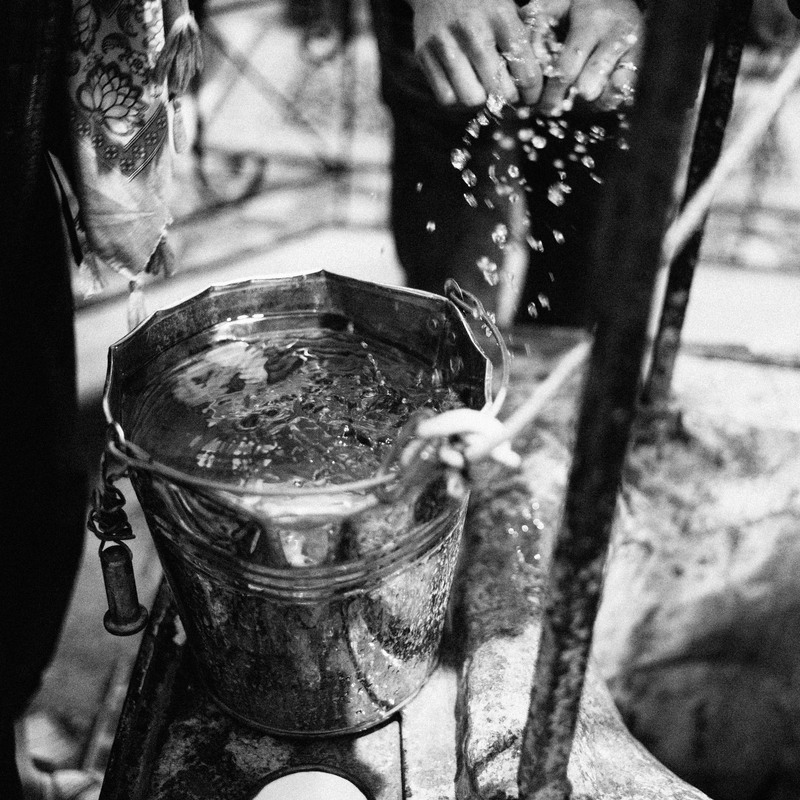 For a fascinating article on the importance of the photographs, you can read this article. 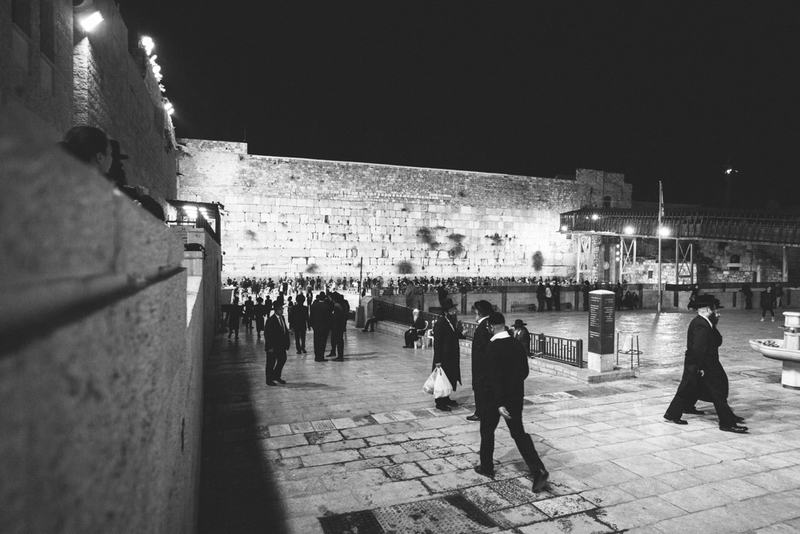 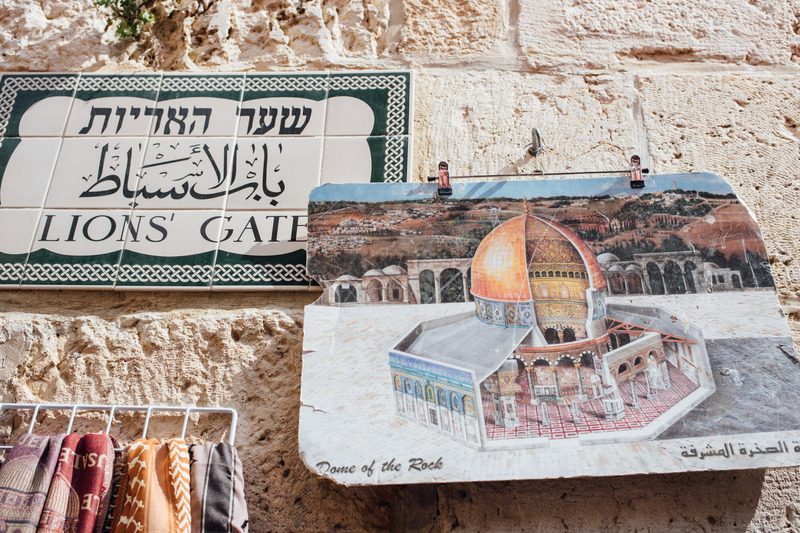 Several of us bought his book, Jerusalem Through My Father’s Eyes, which is a rare and beautiful collector’s item. 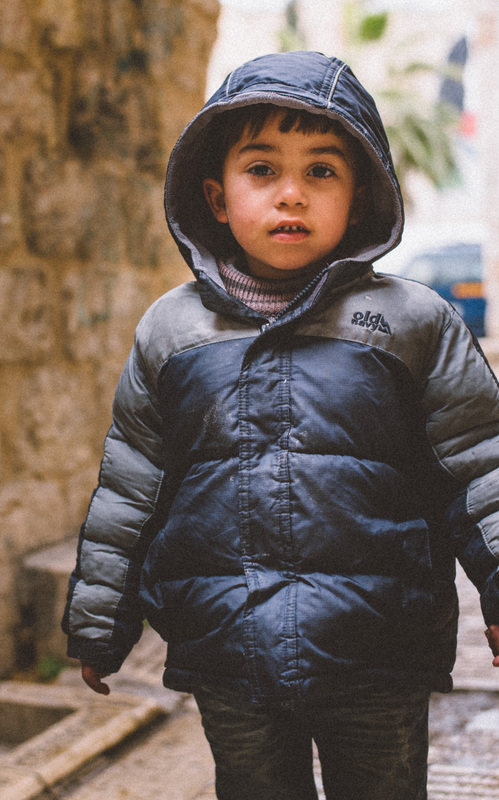 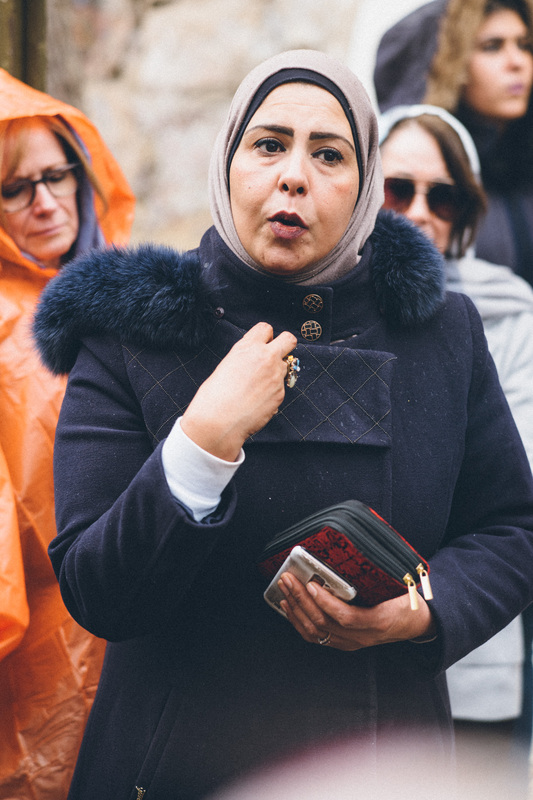 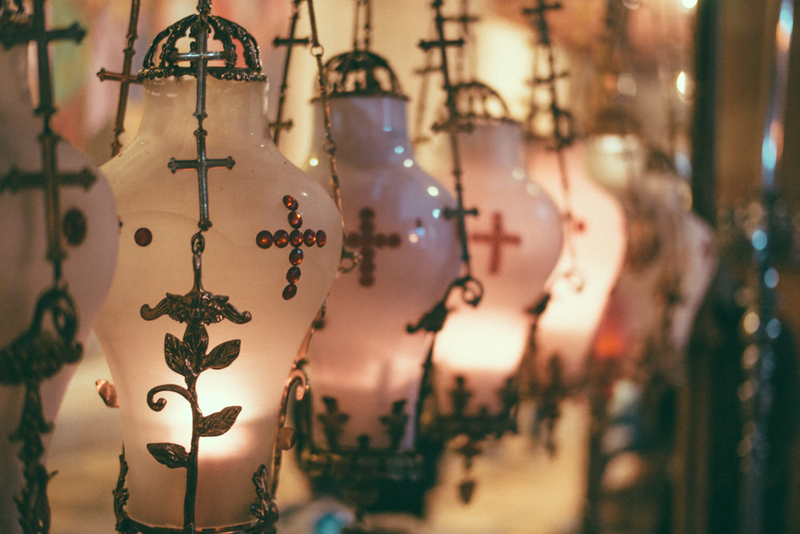 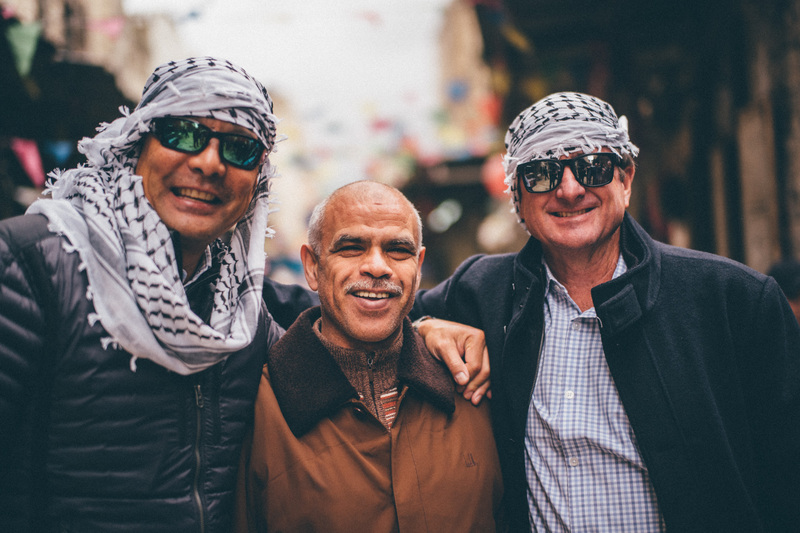 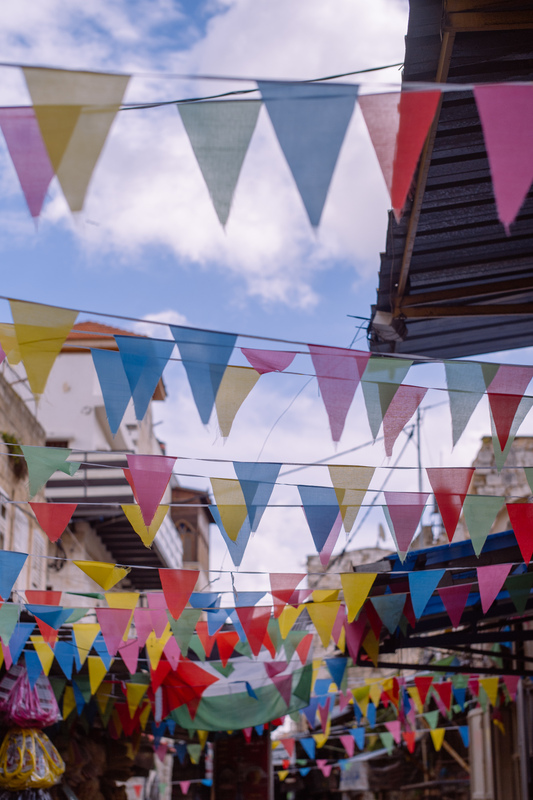 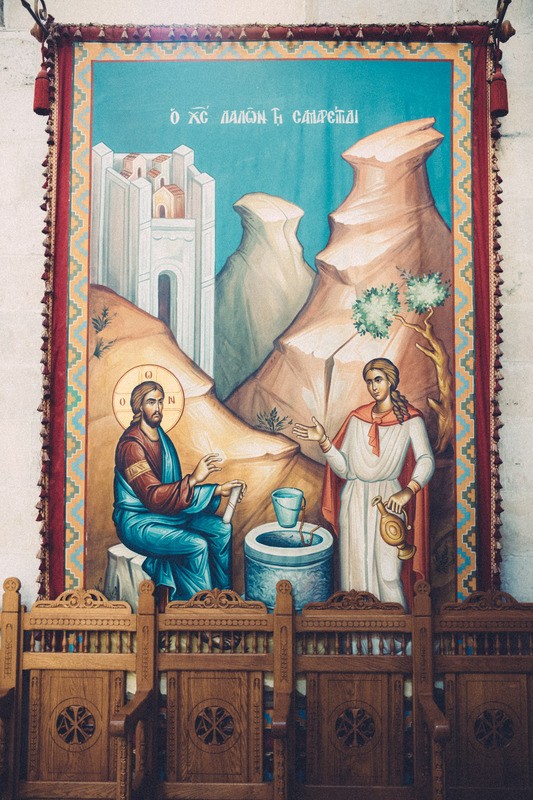 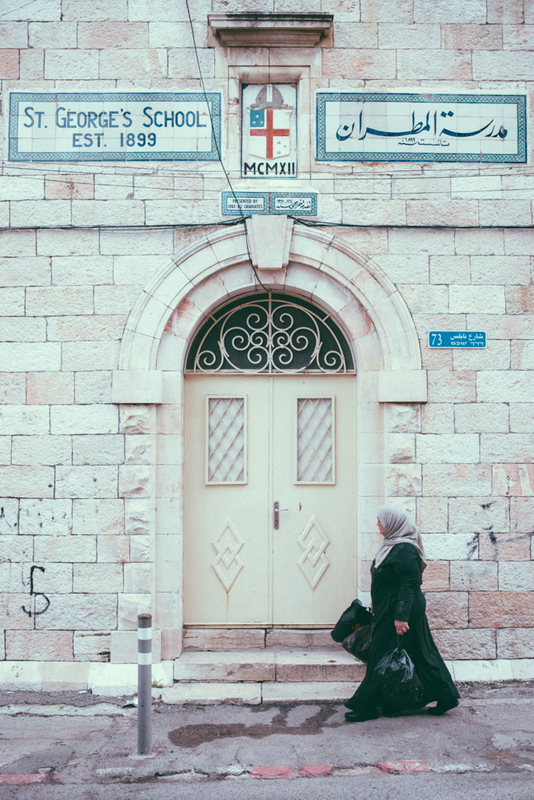 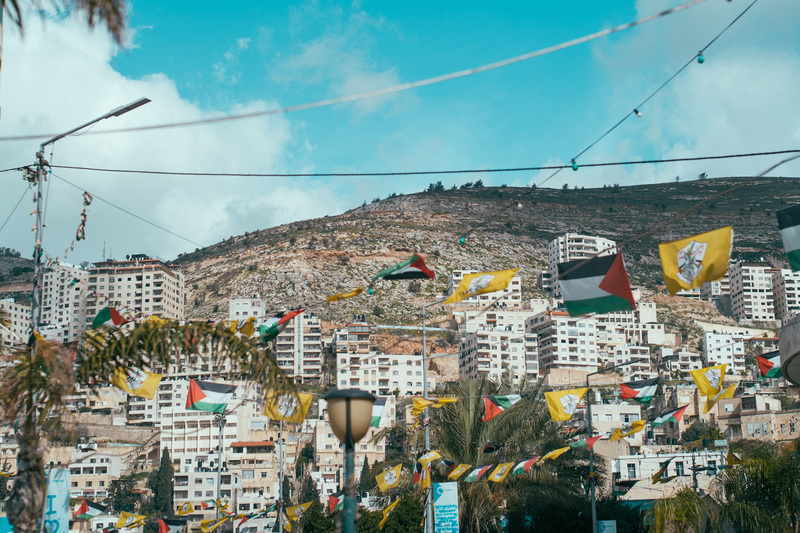 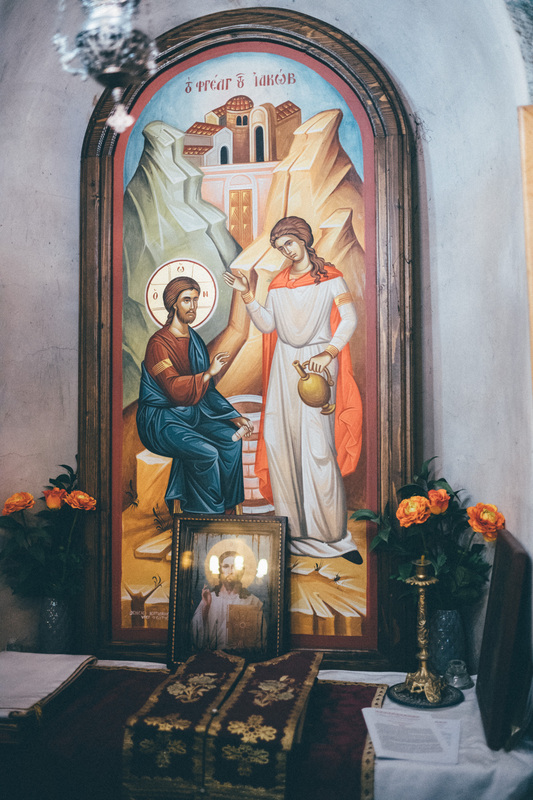 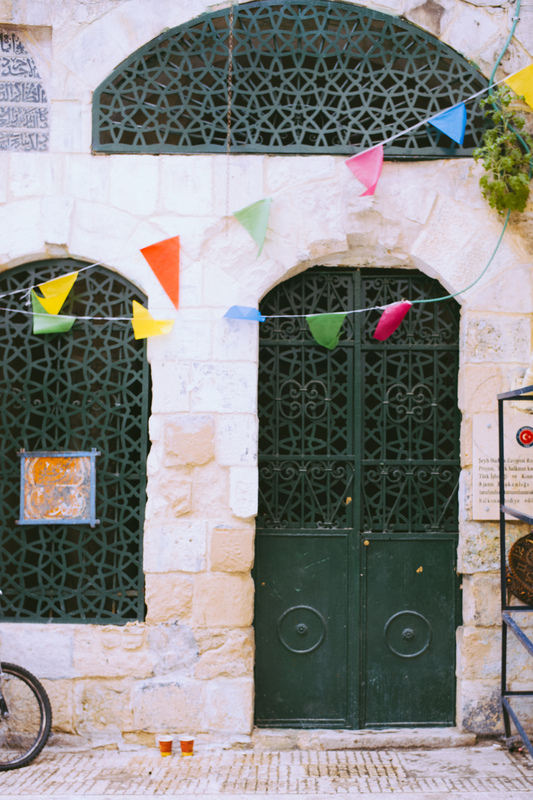 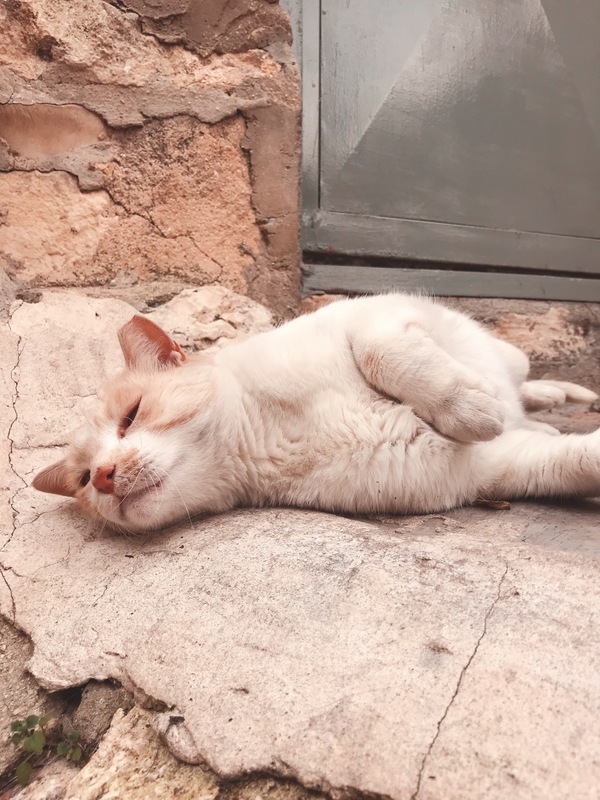 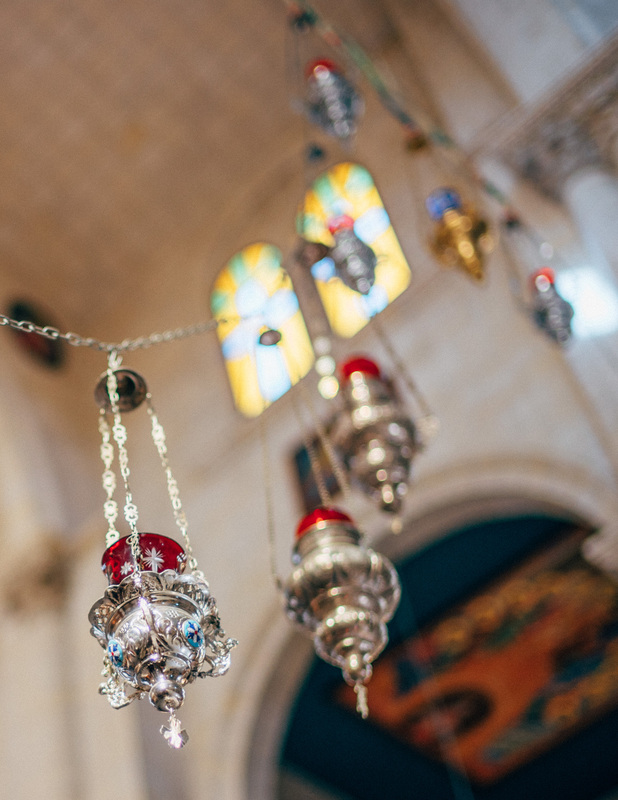 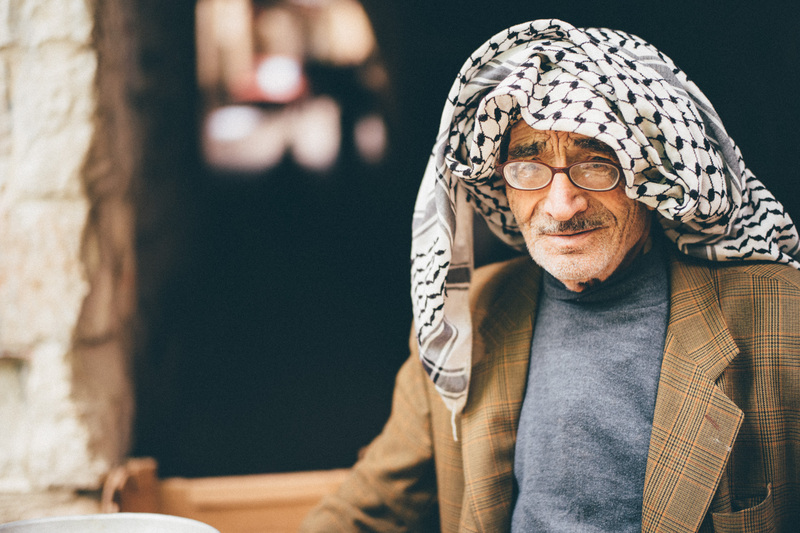 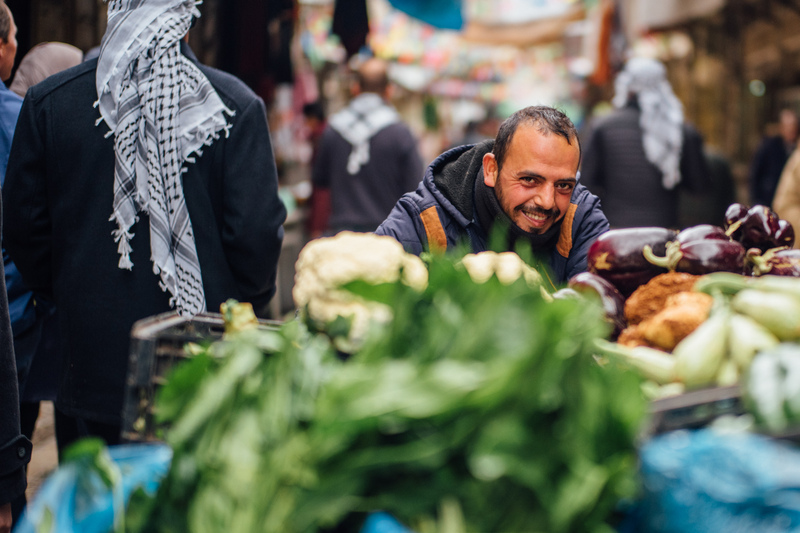 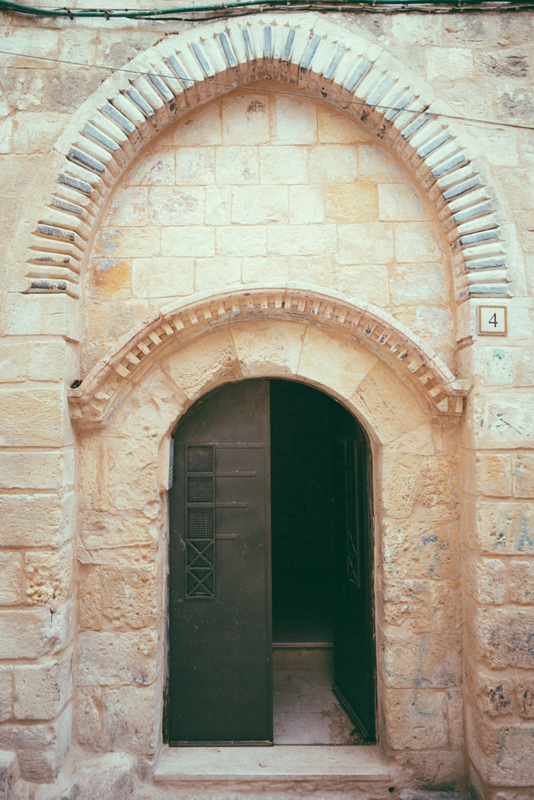 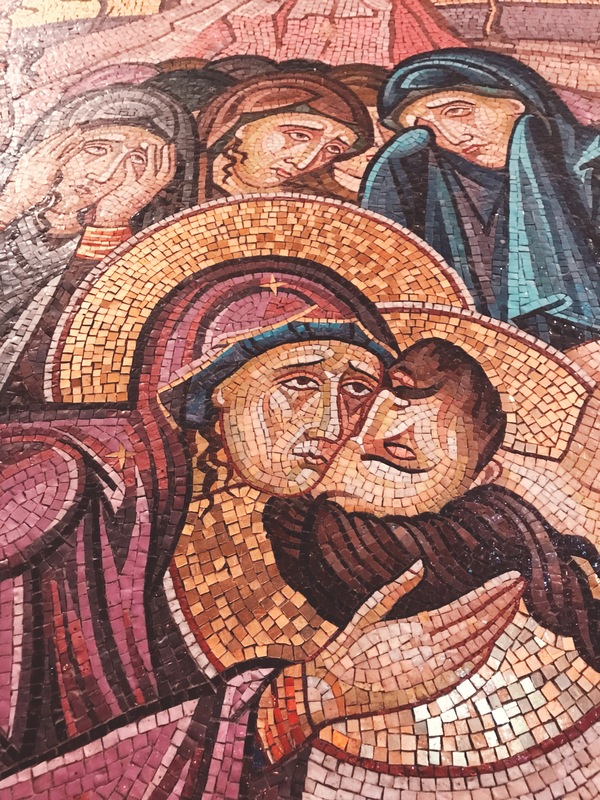 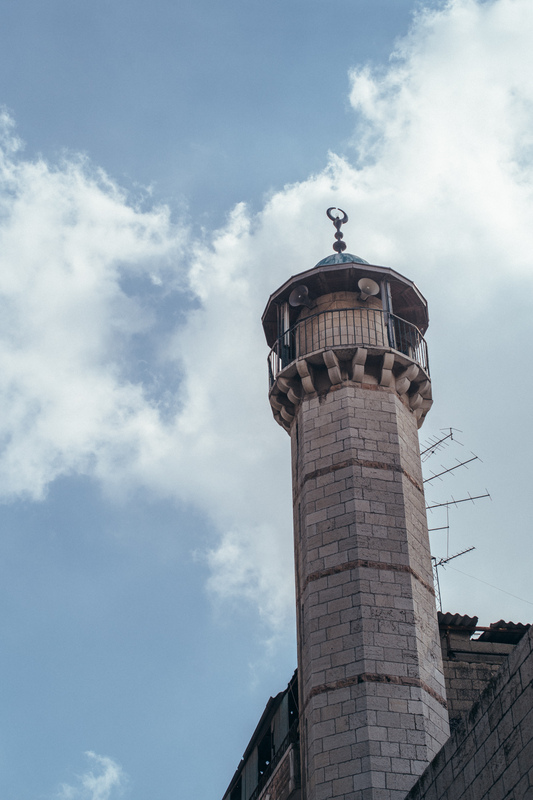 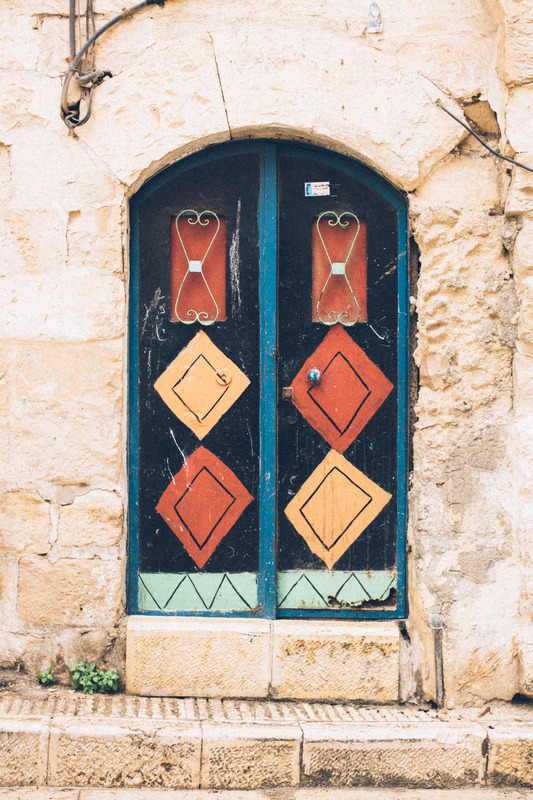 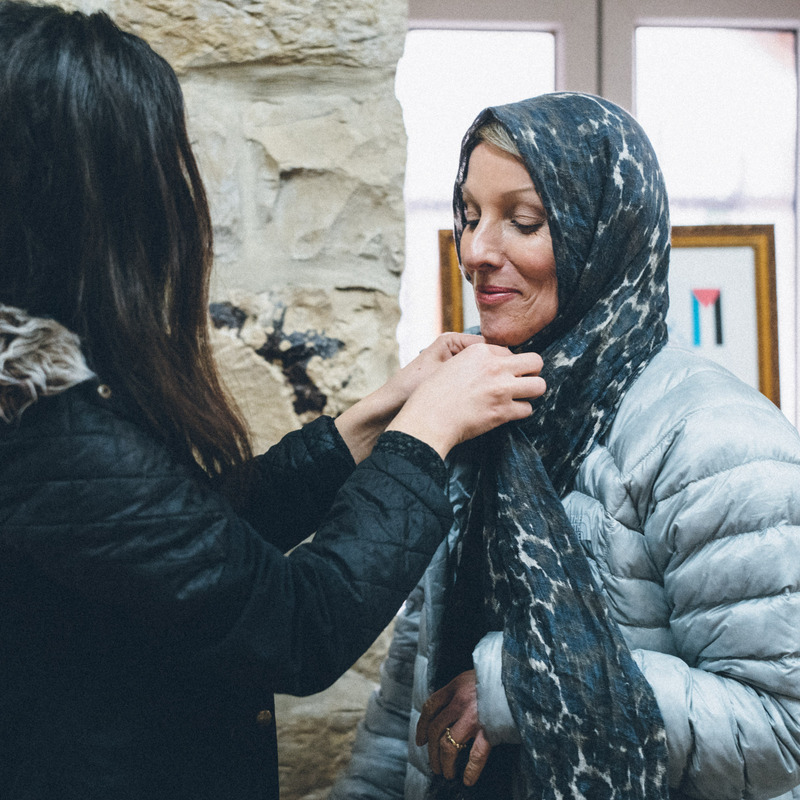 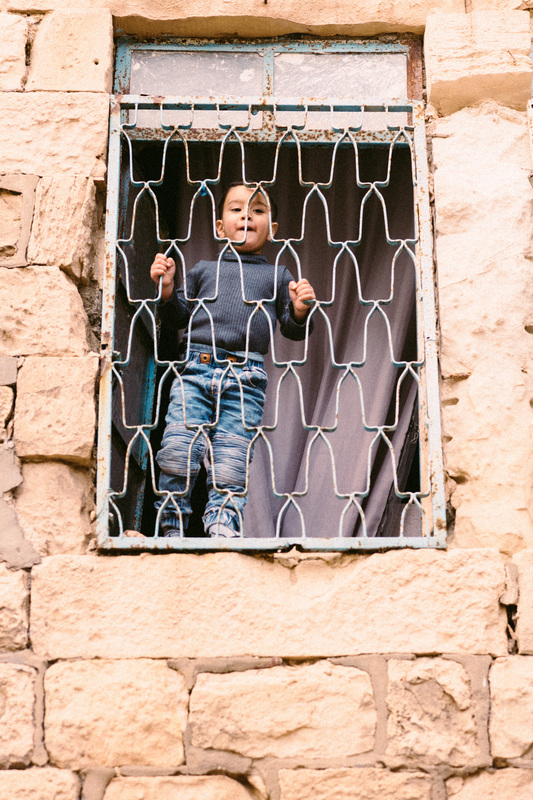 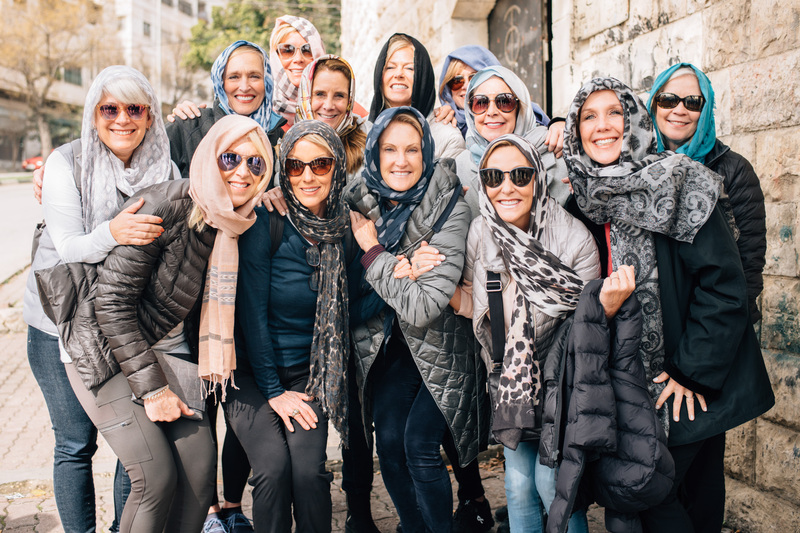 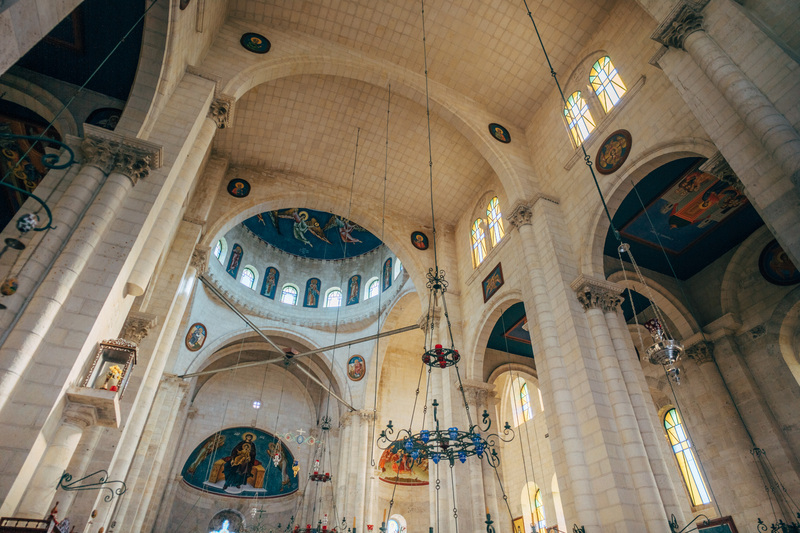 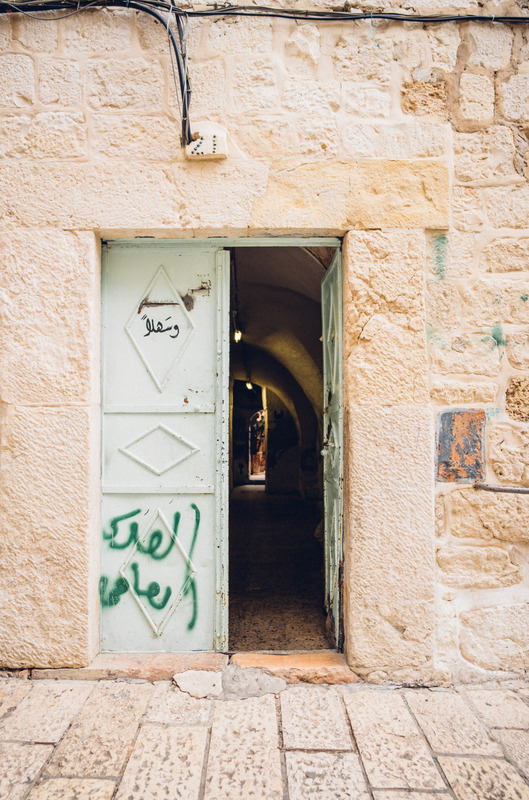 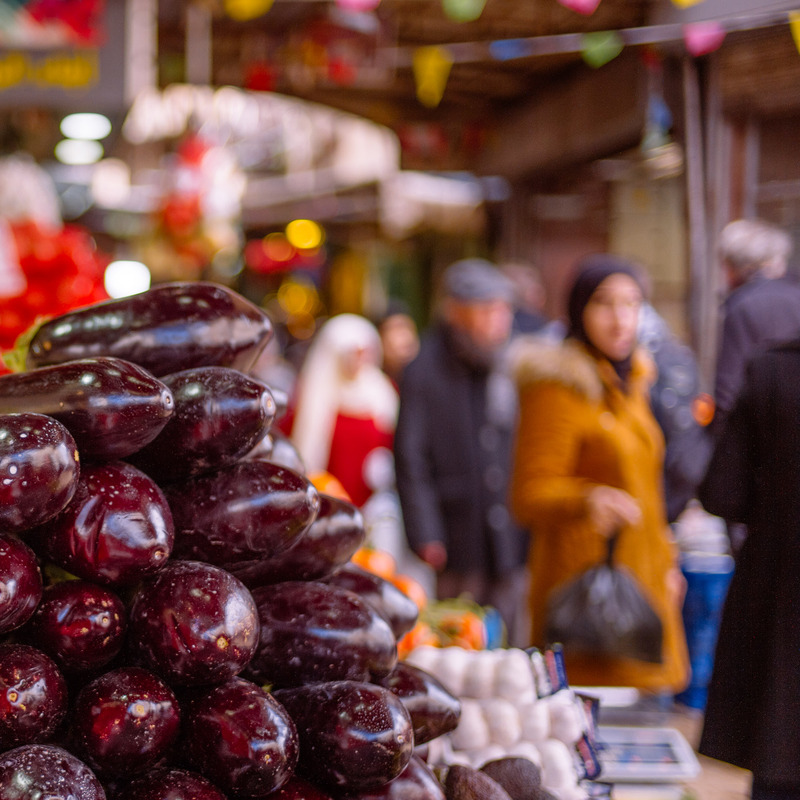 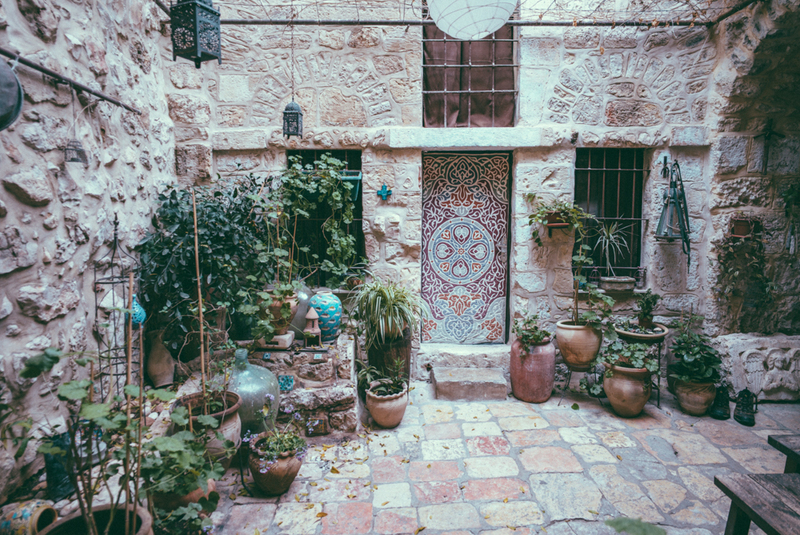 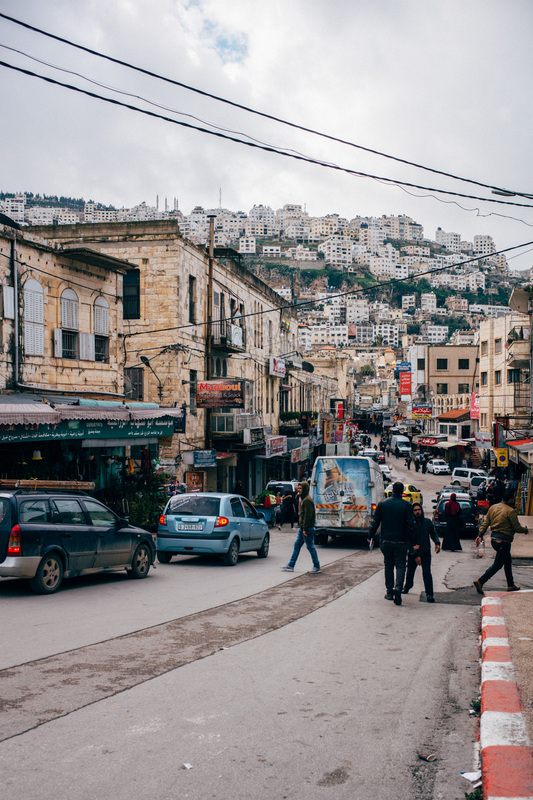 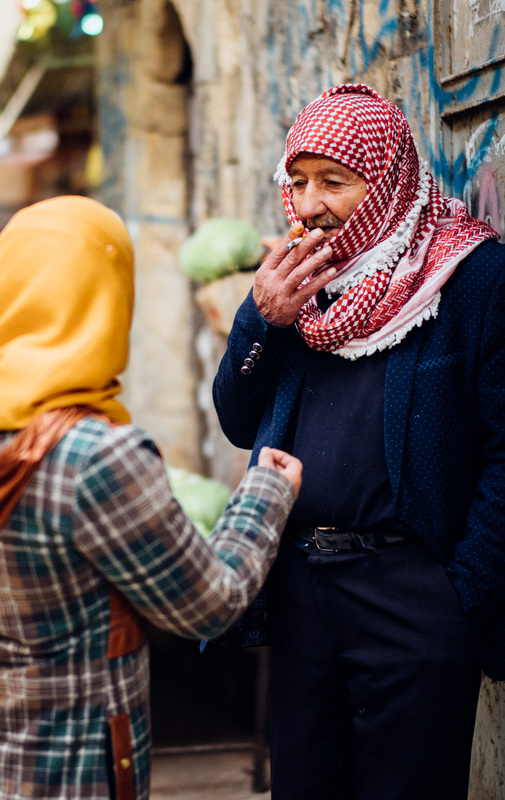 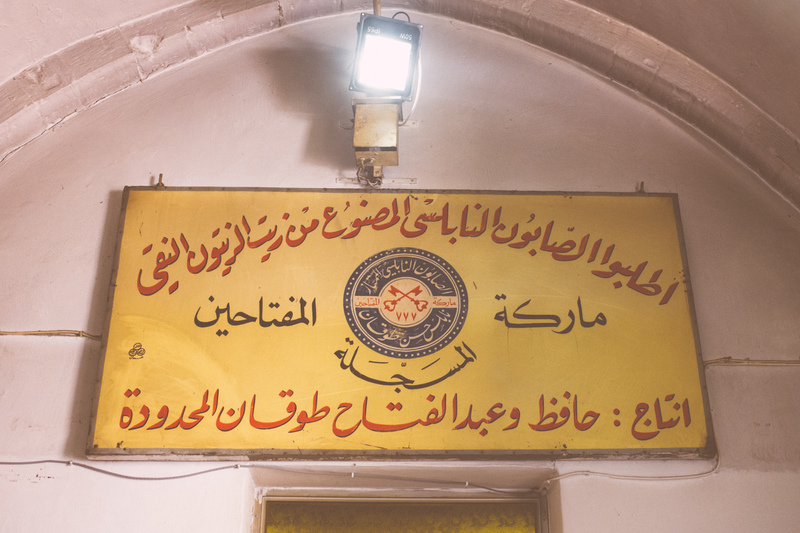 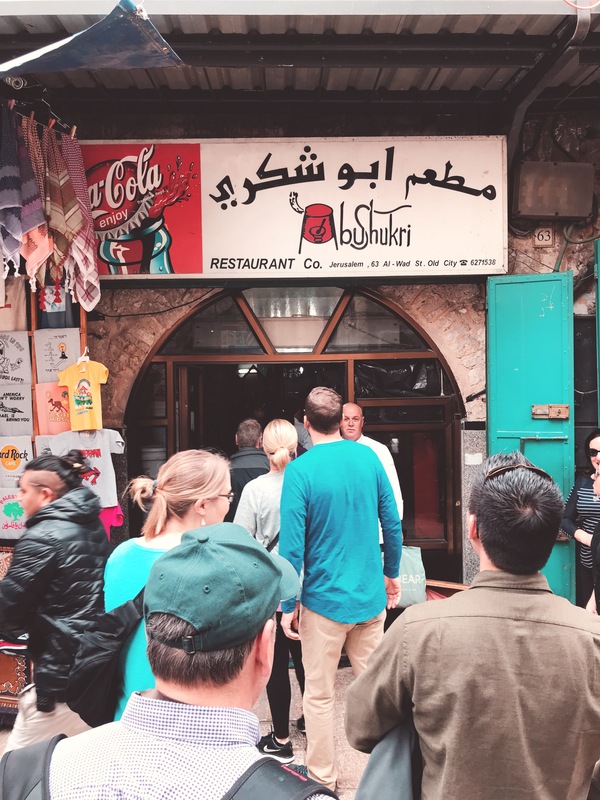 After shopping for some fresh Tahini in the Muslim Quarter along with a demonstration of how it is made, the chefs took us for a lunch at a restaurant known for their falafel and hummus, Abu Shukri which is located by Stations of the Cross 5. 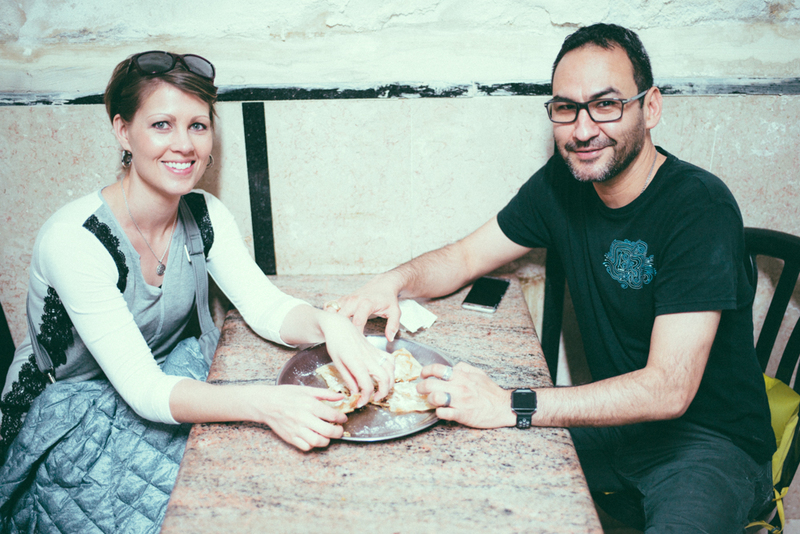 They explained to us the different styles of making hummus and how to eat the various appetizers served. 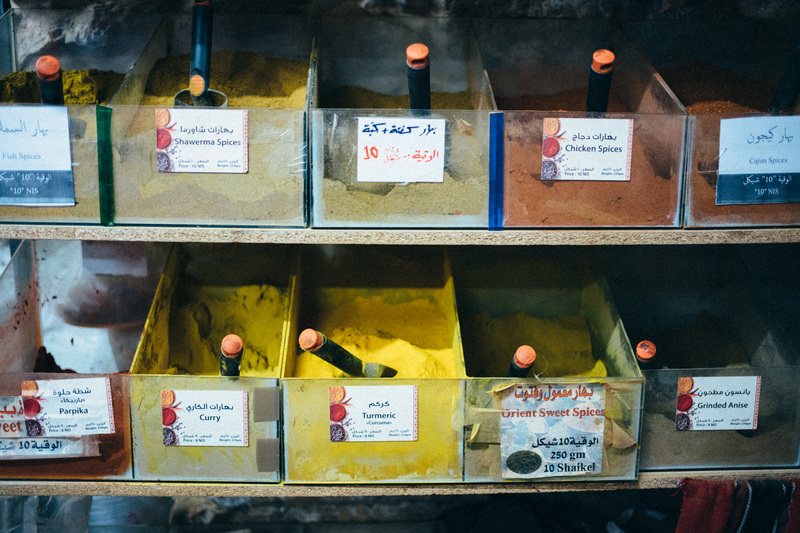 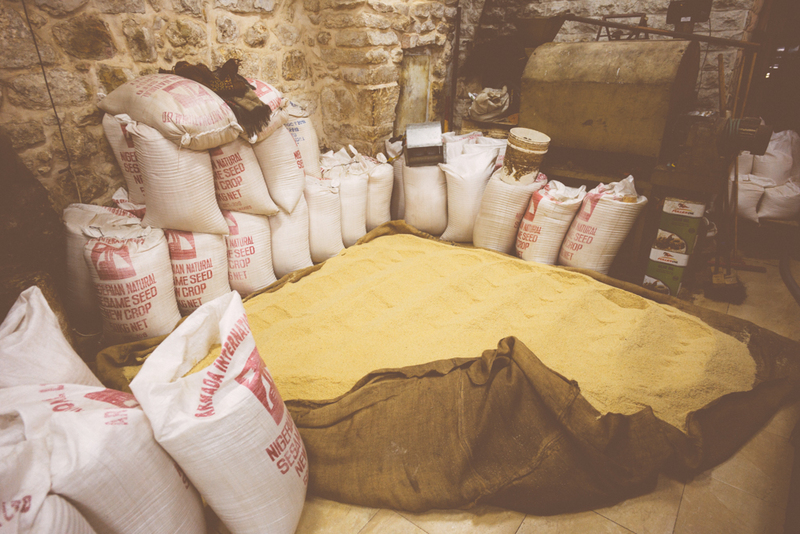 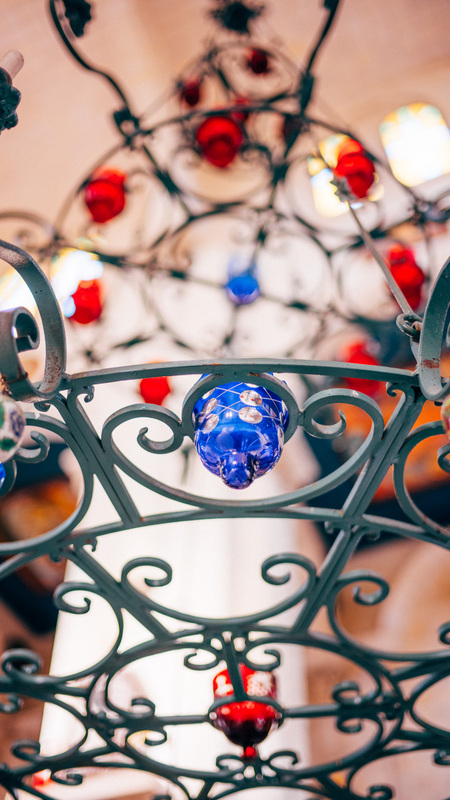 After a visit to the spice market, we then made our way to the hidden gem of Zalatimo’s Sweets. 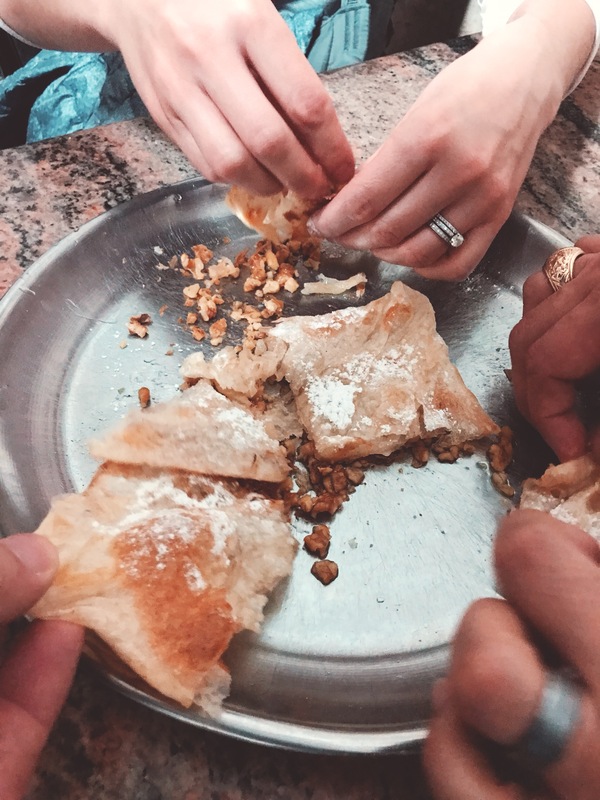 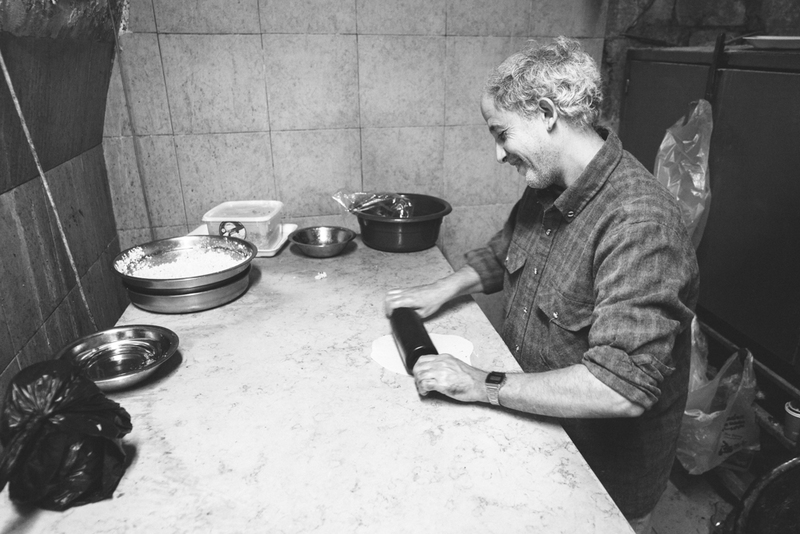 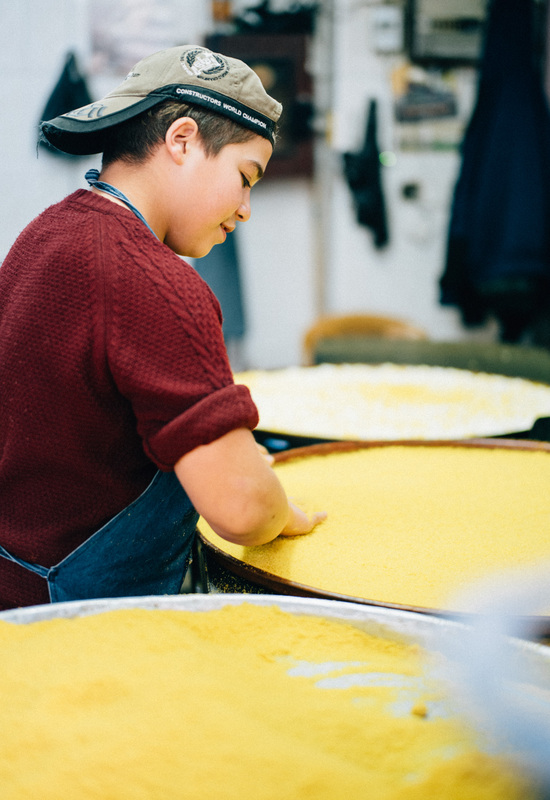 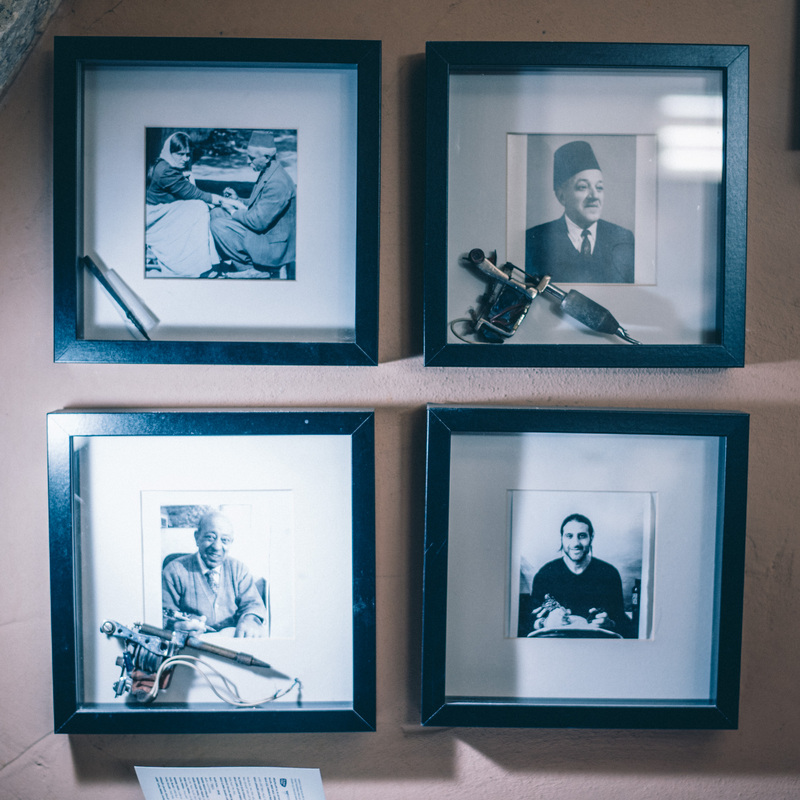 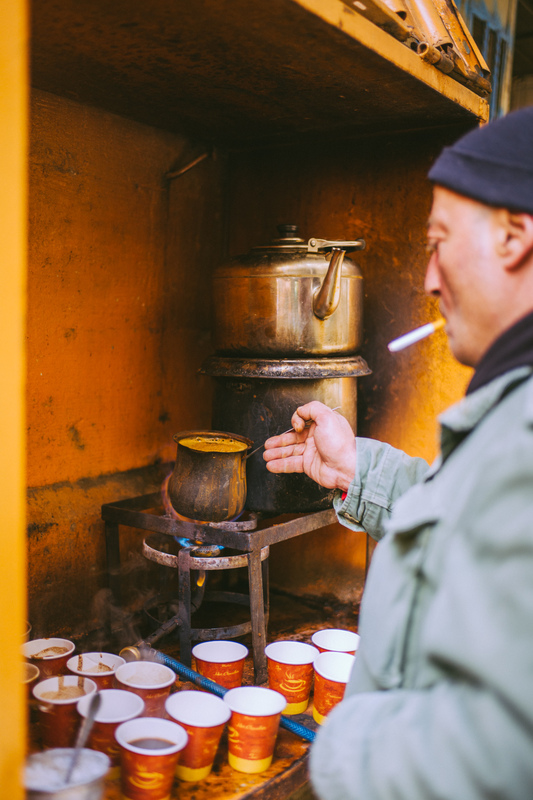 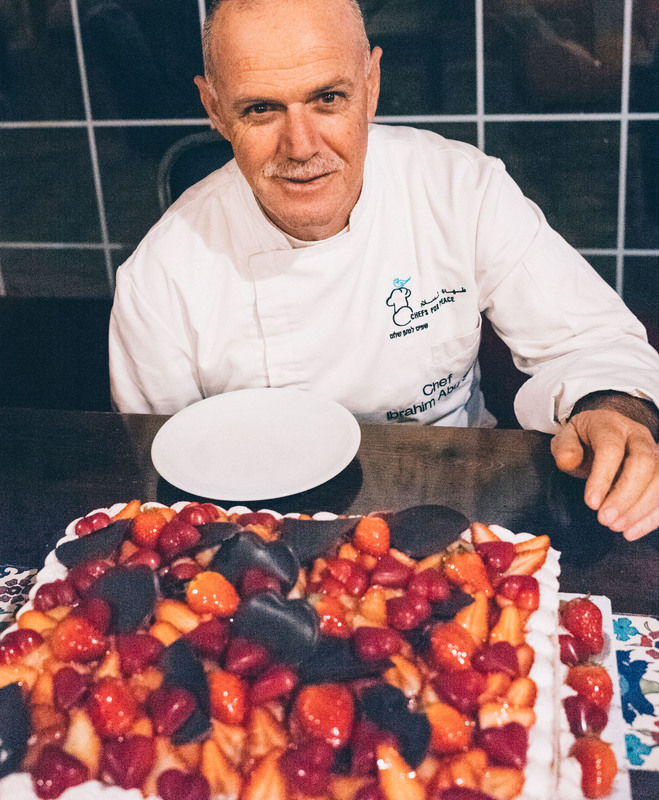 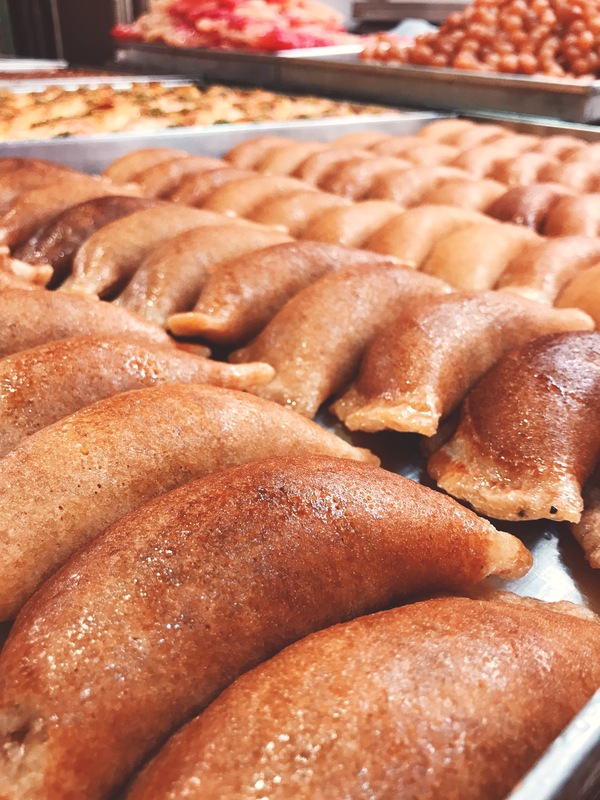 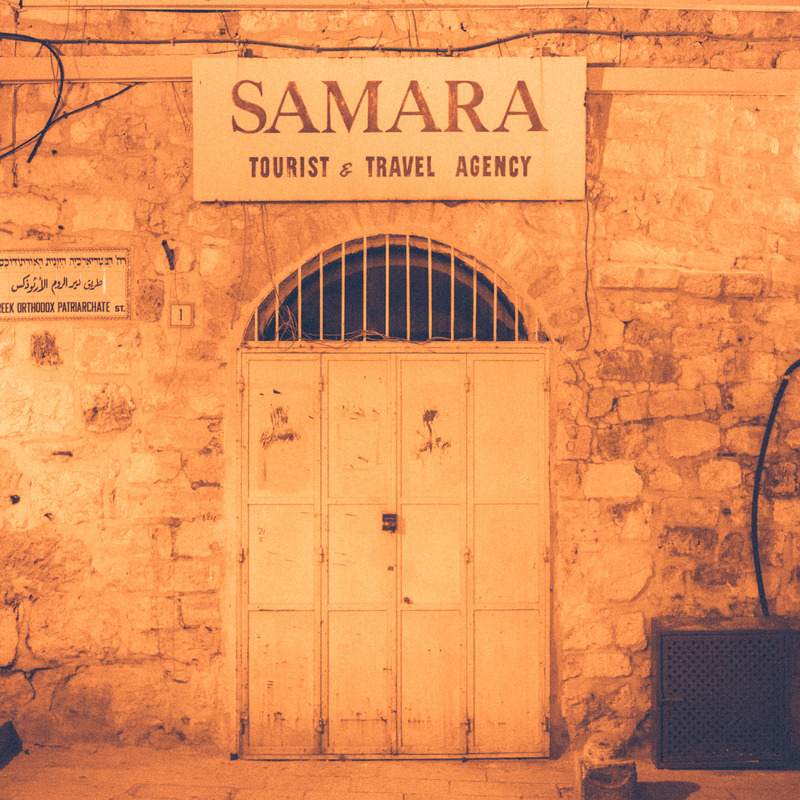 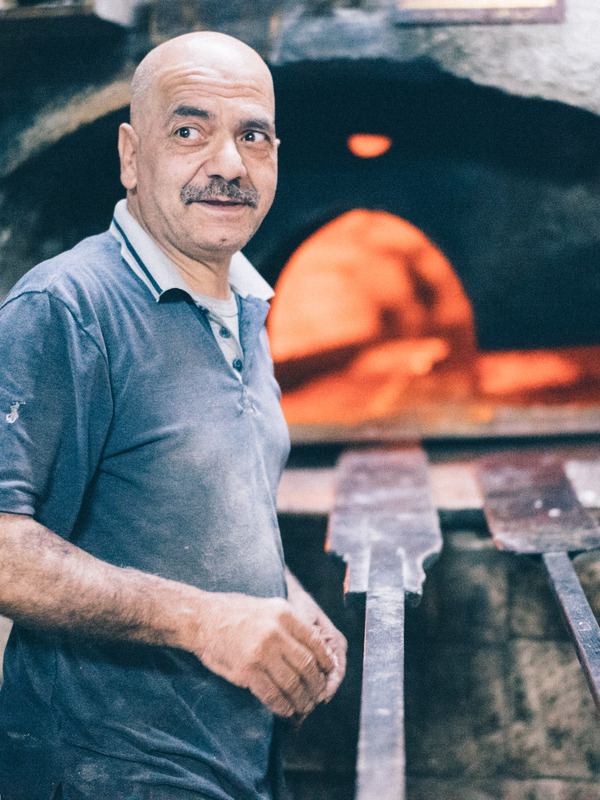 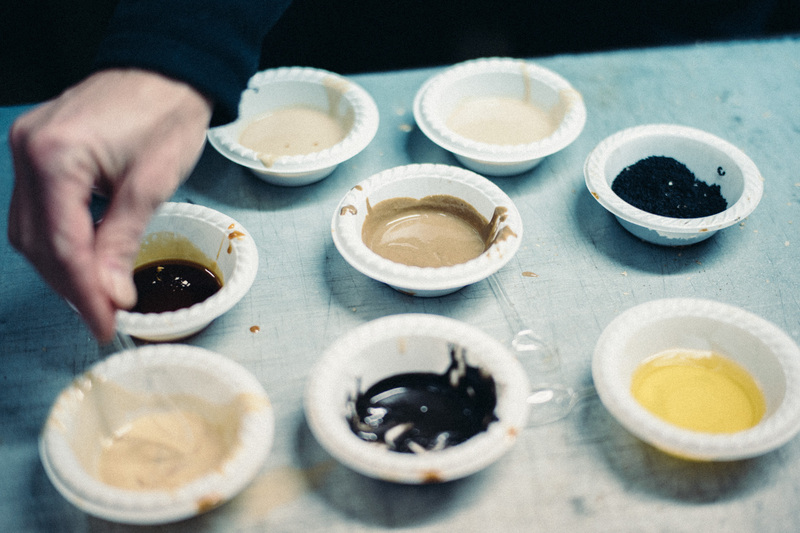 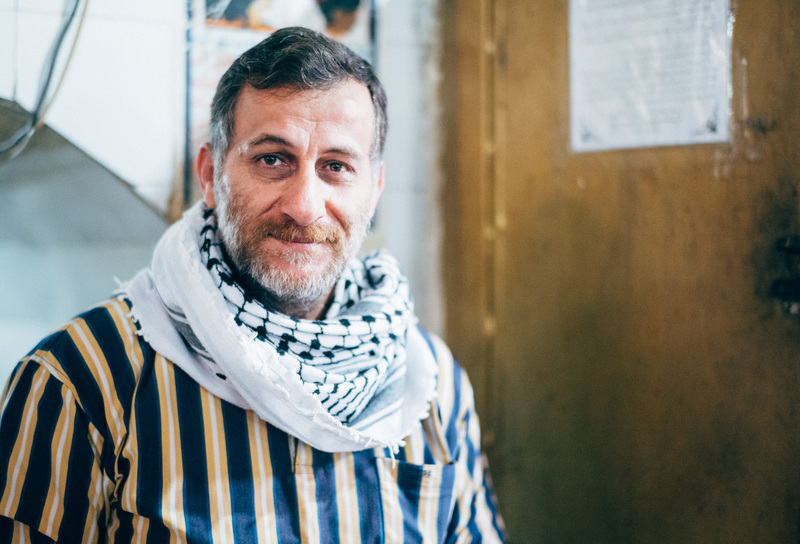 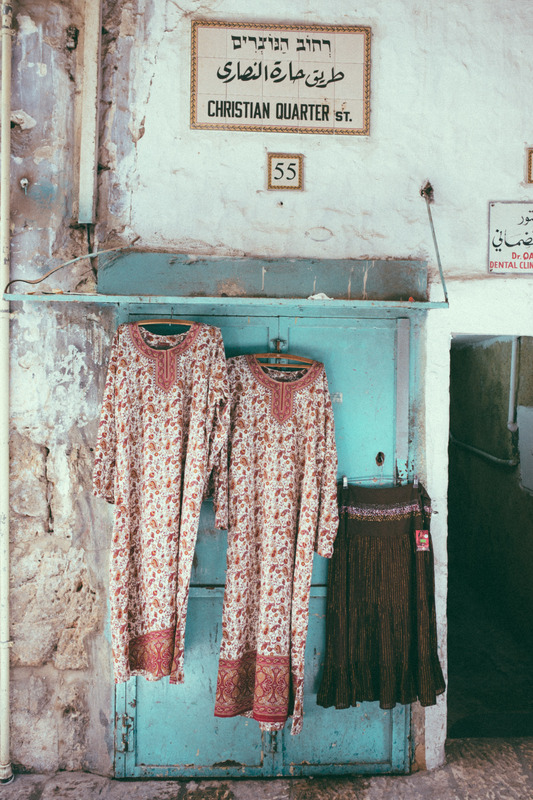 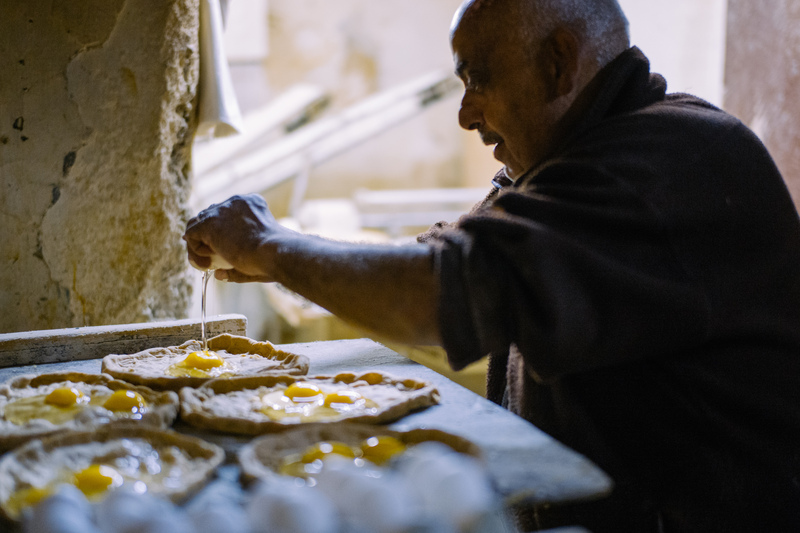 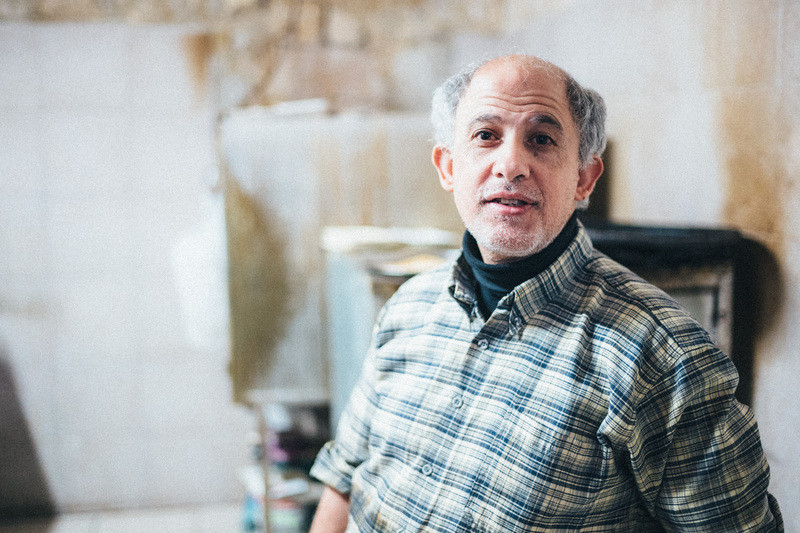 In a small room with just an oven, a refrigerator, and a few tables, Mr. Zalatimo and his relatives serve up the greatest pastry that the Old City has to offer, an Arab treat known as a mutabak (from the Arabic for “folded”). 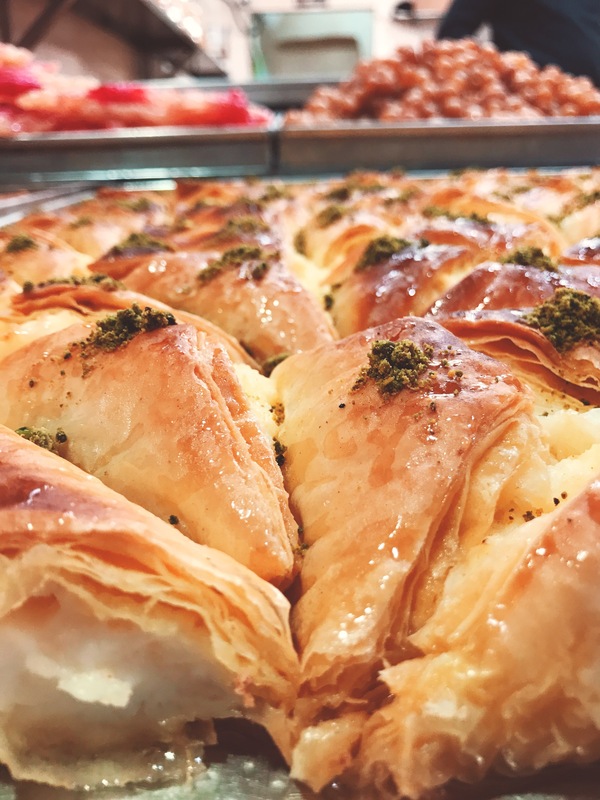 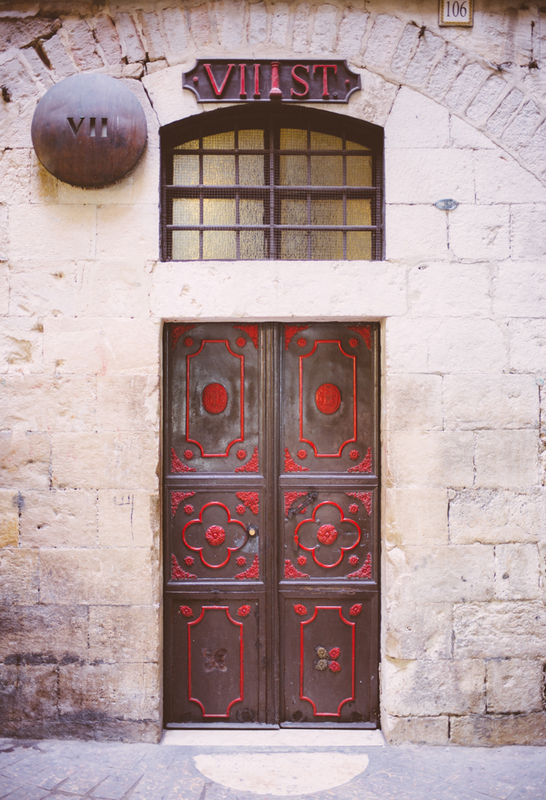 The flaky phyllo dough type creation is the only food served at Zalatimo’s, and ordering is simple: “with nuts” or “with cheese.” The shop also includes another treasure: one of the original entrances to the Church of the Holy Sepulchre, which is now sealed off and no longer used. 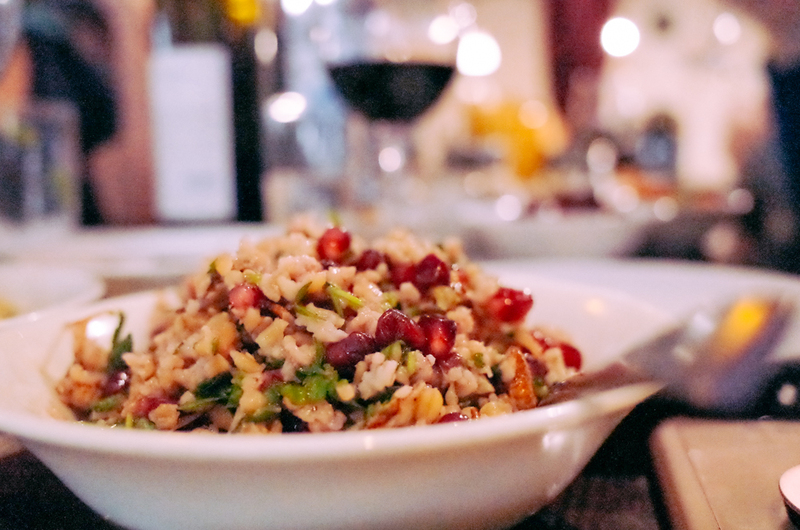 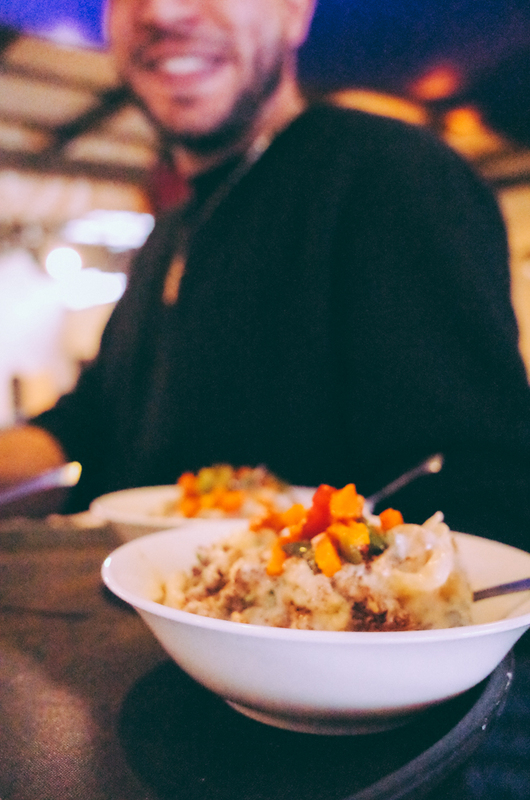 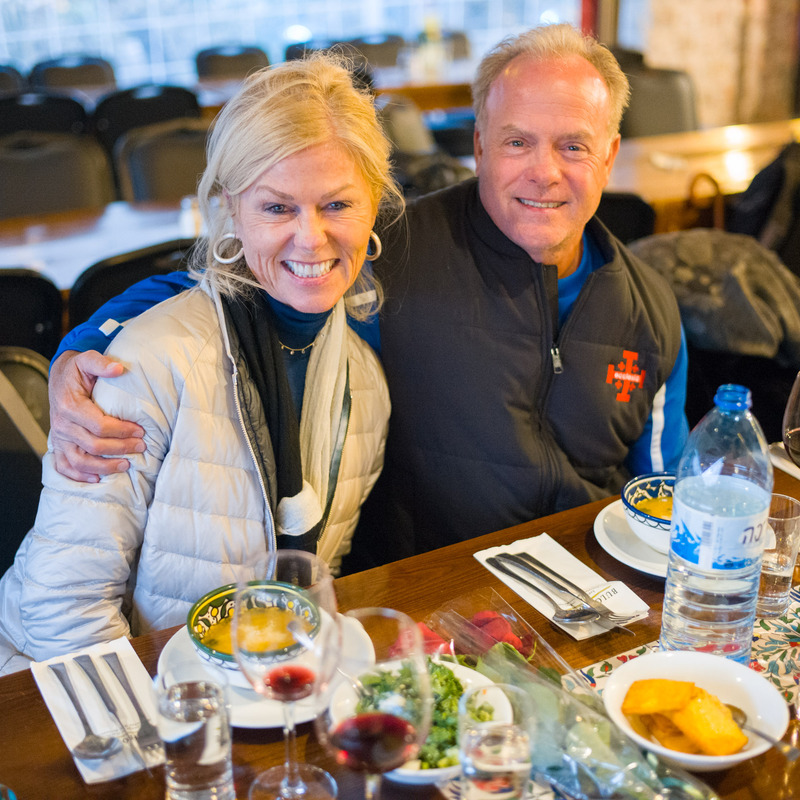 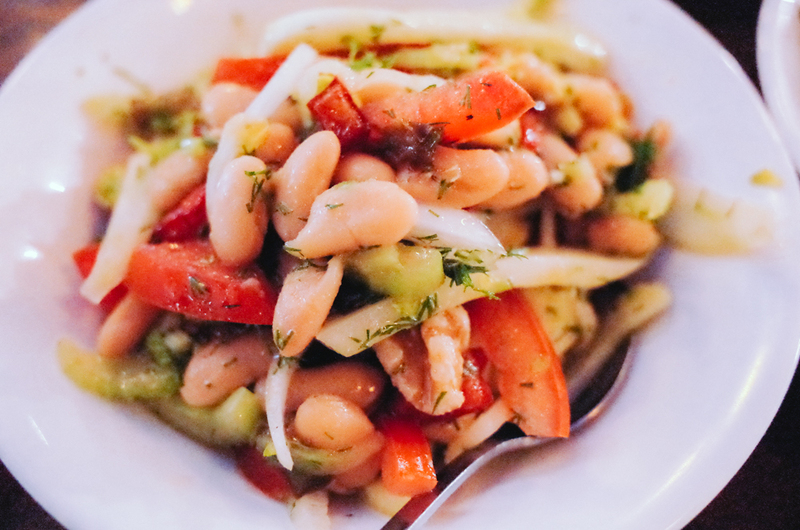 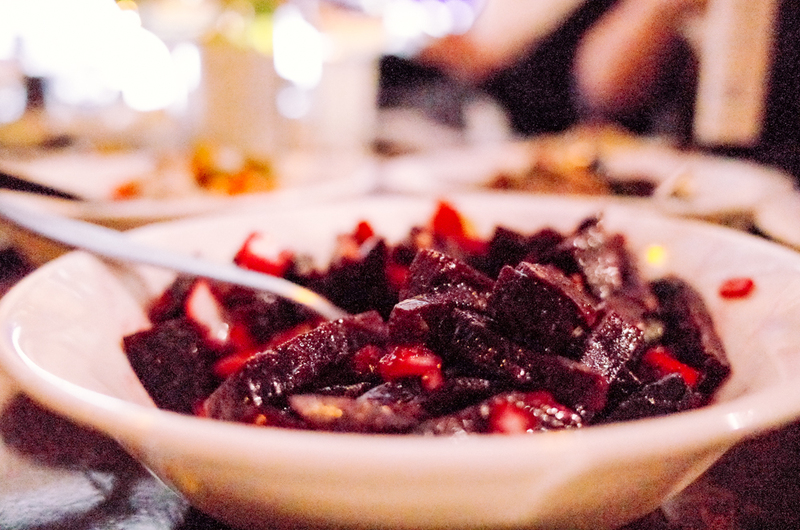 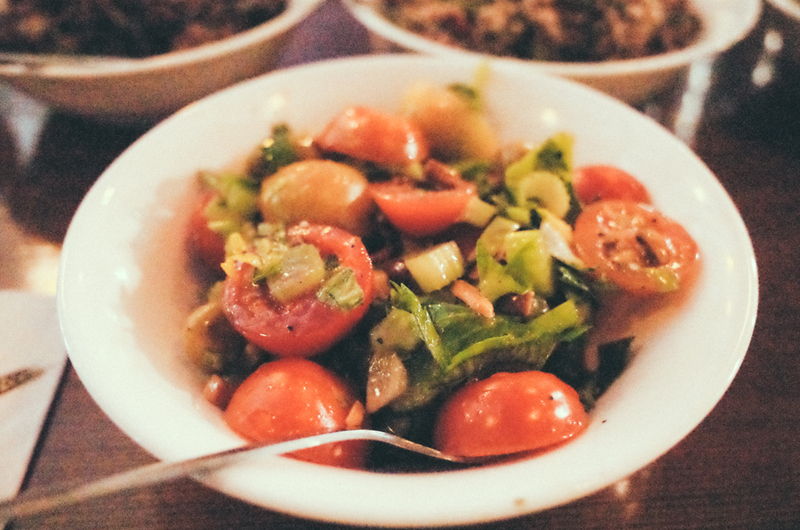 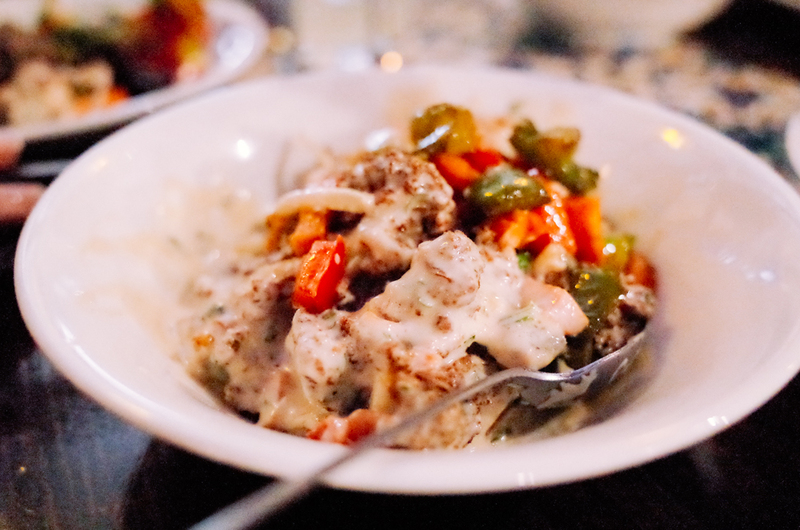 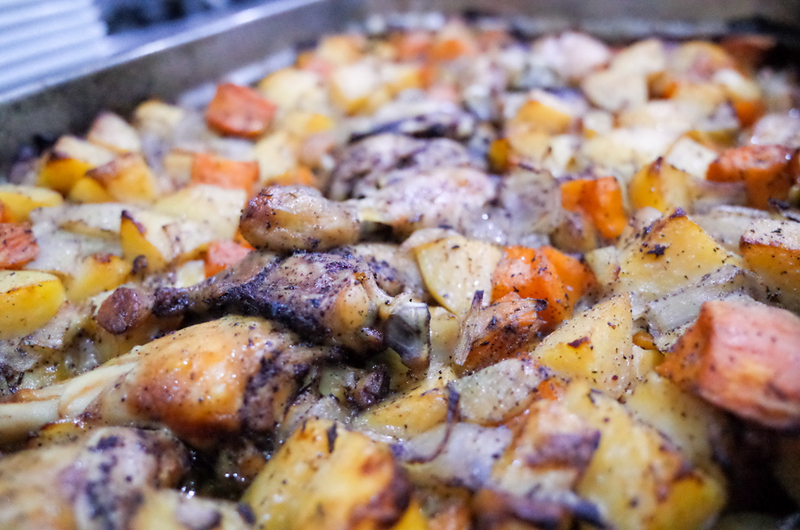 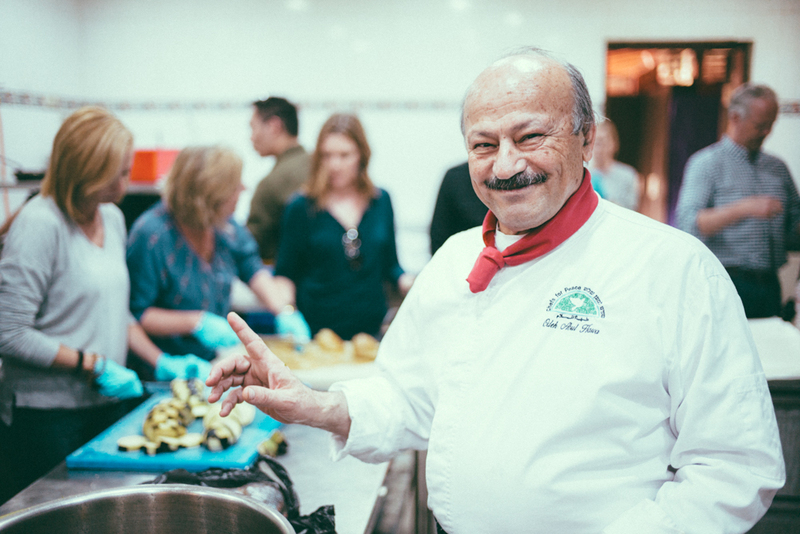 After we literally ate our way through the Old City, the chefs invited us to learn how to cook with them at the Bulghourji Restaurant in the Armenian Quarter, and then we ate some more. 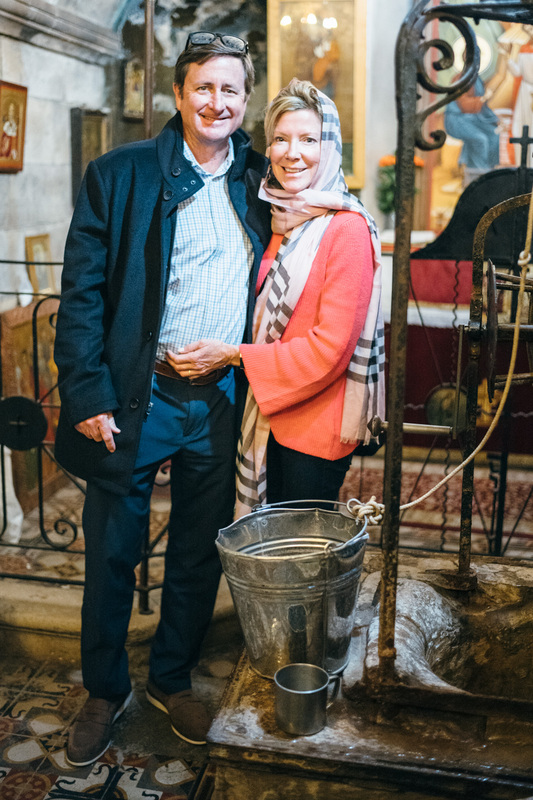 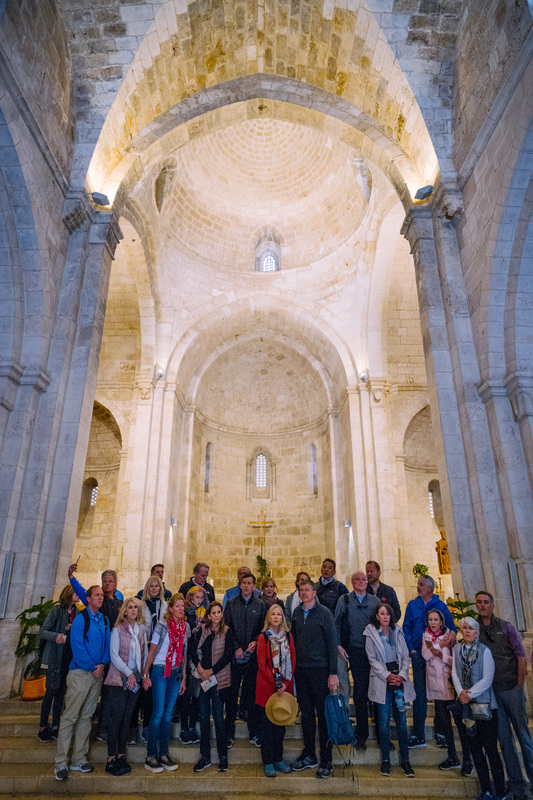 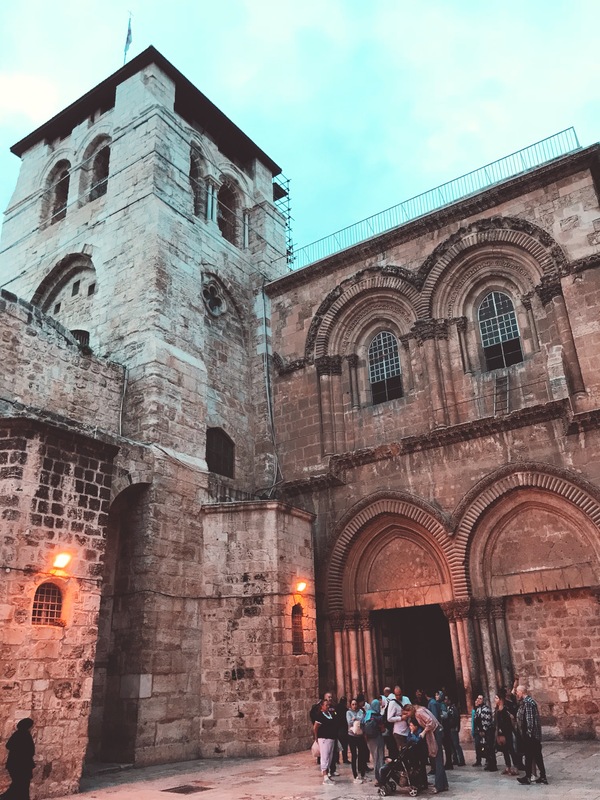 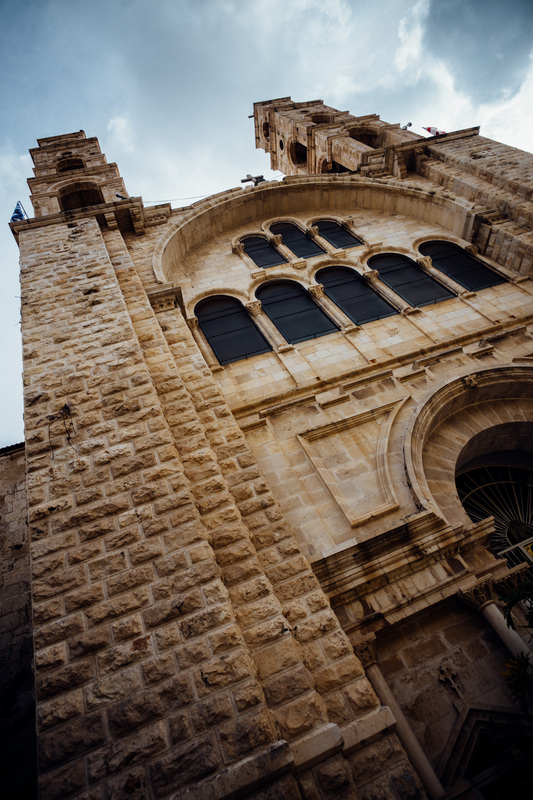 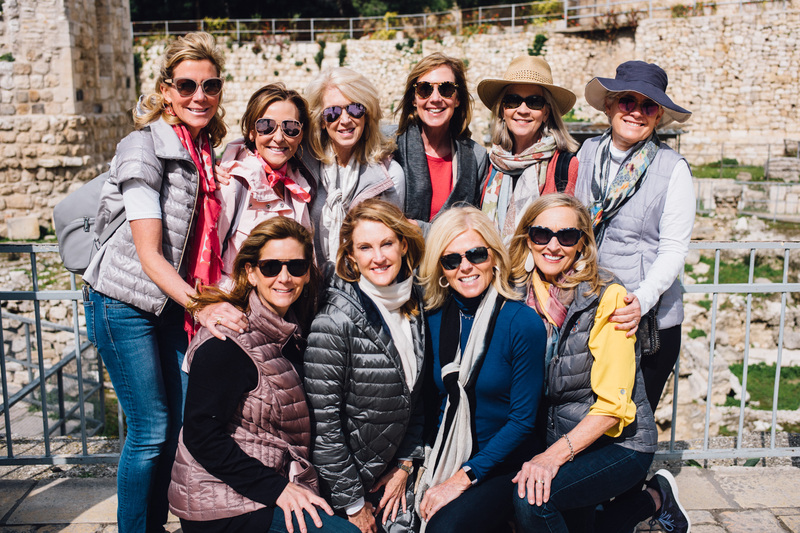 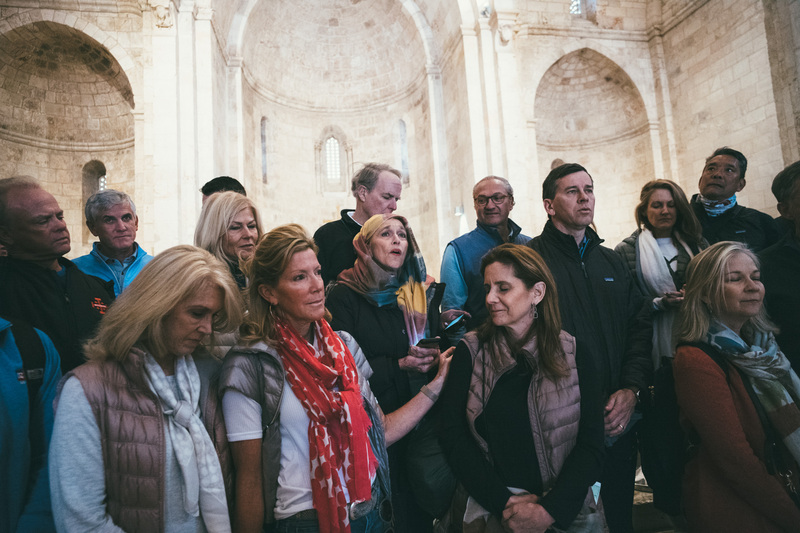 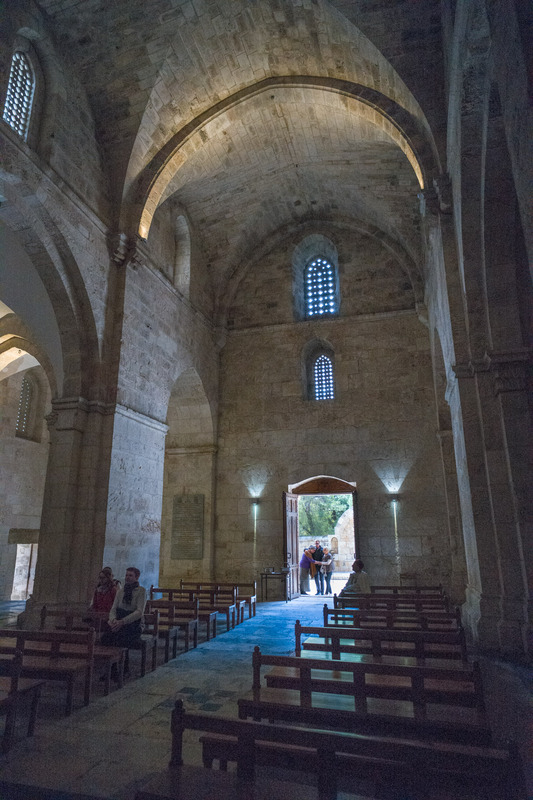 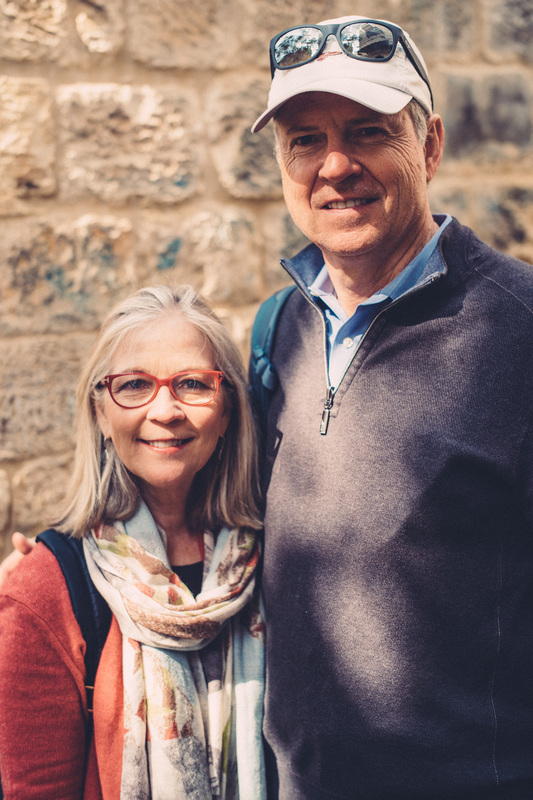 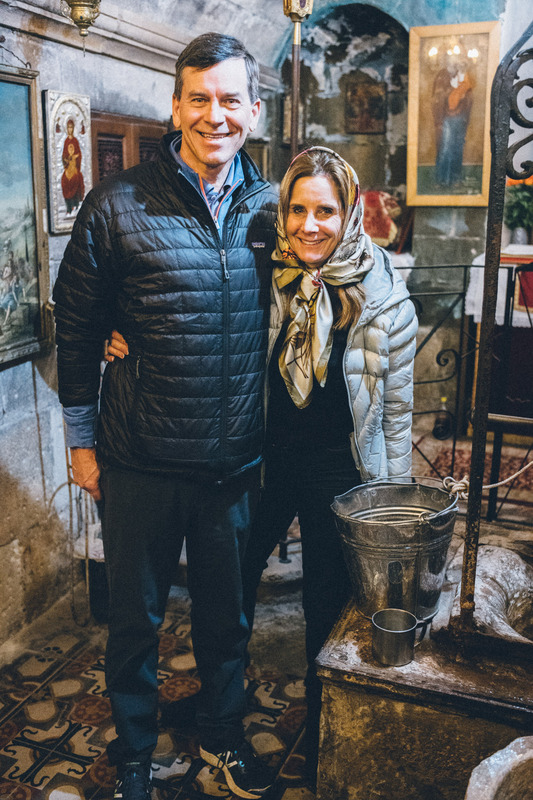 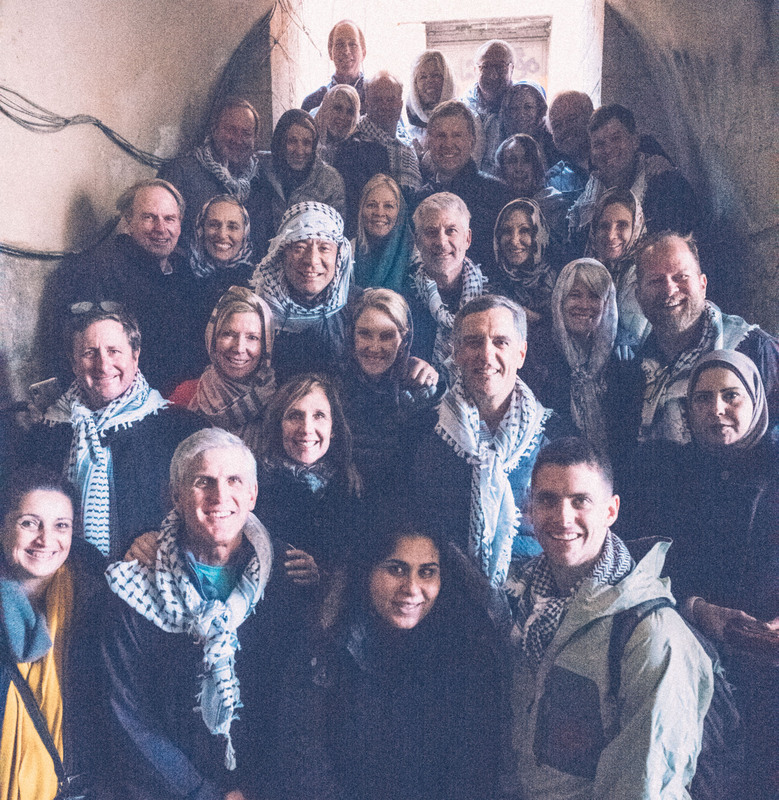 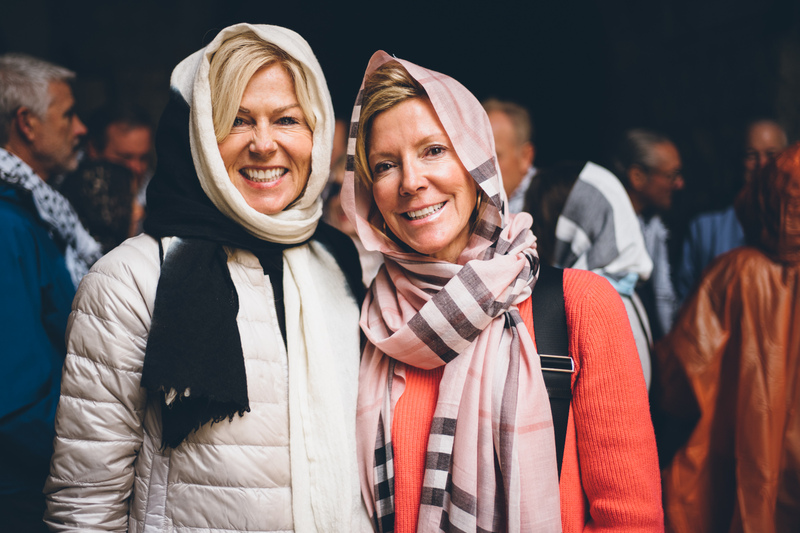 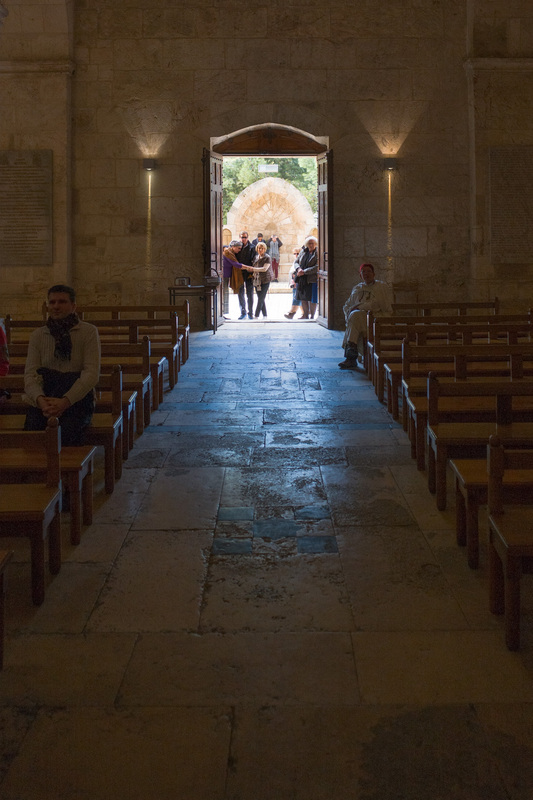 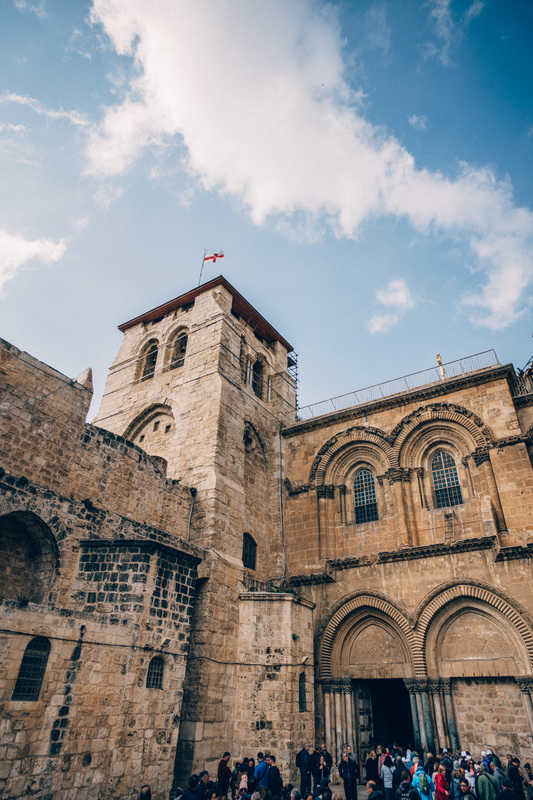 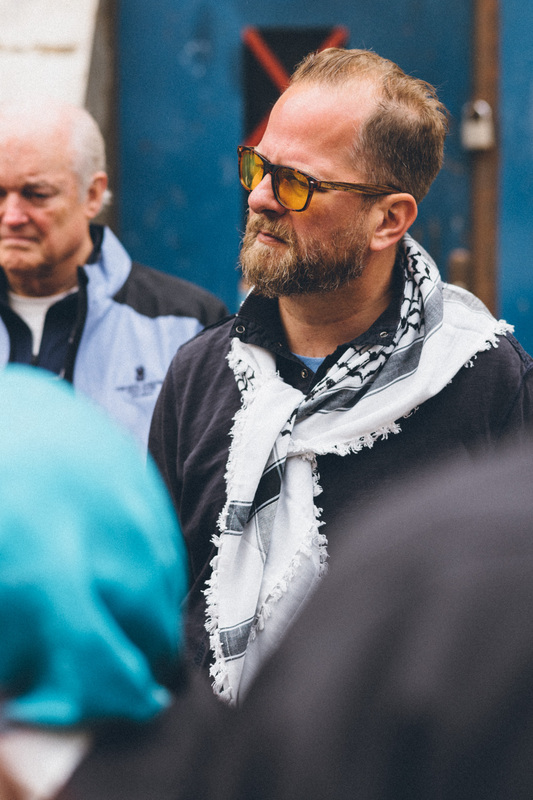 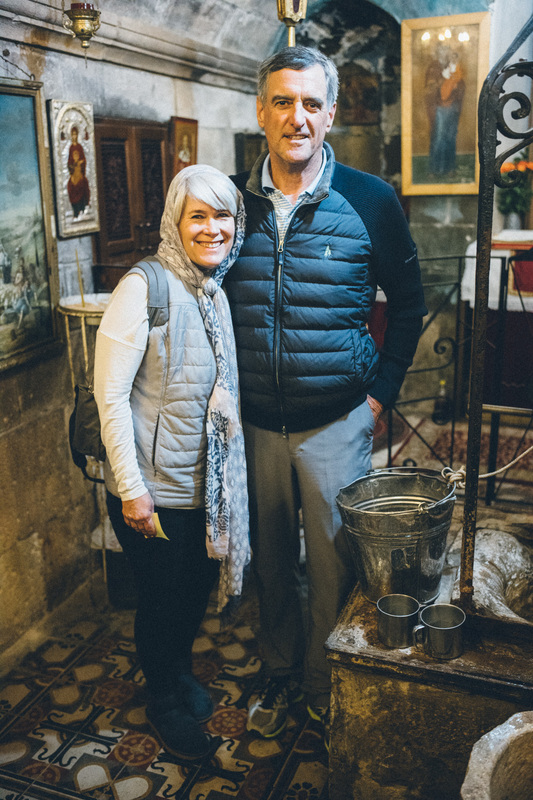 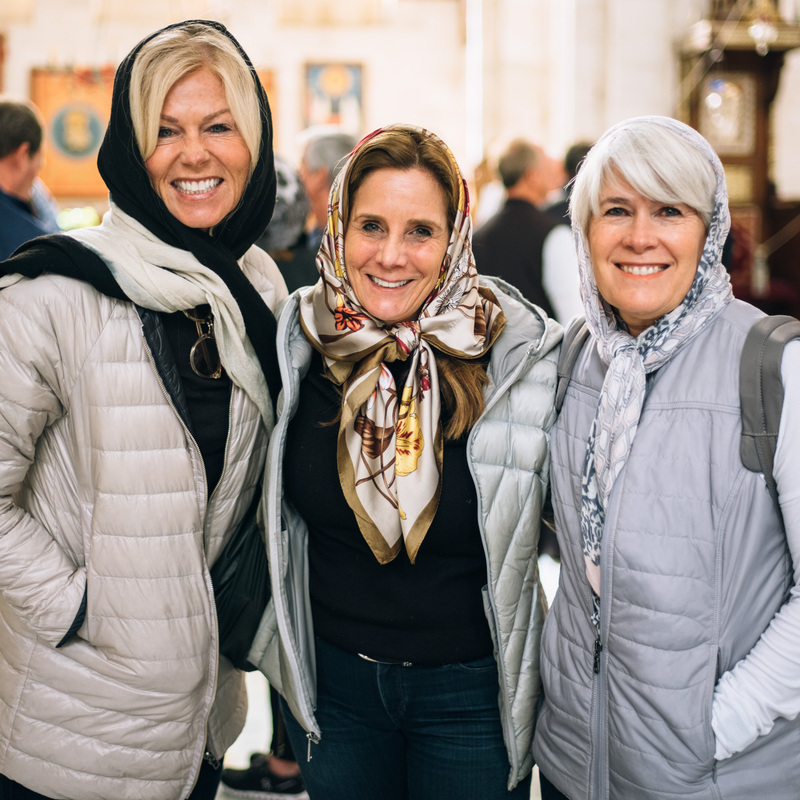 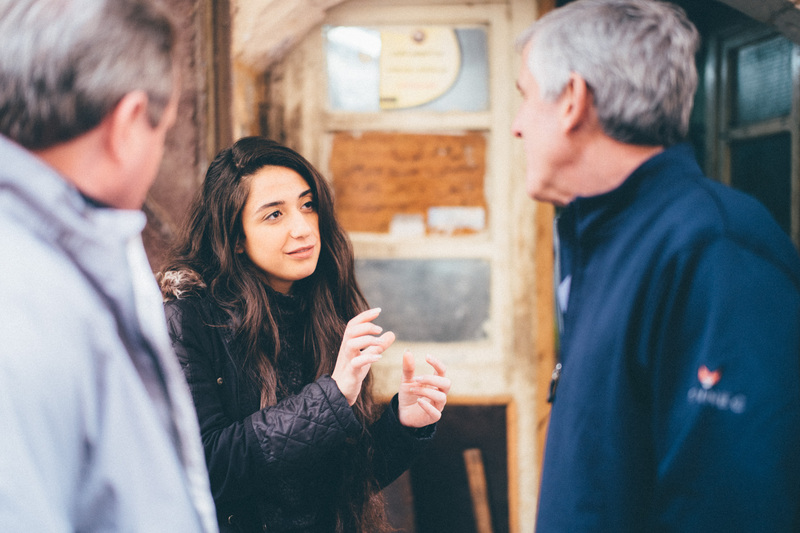 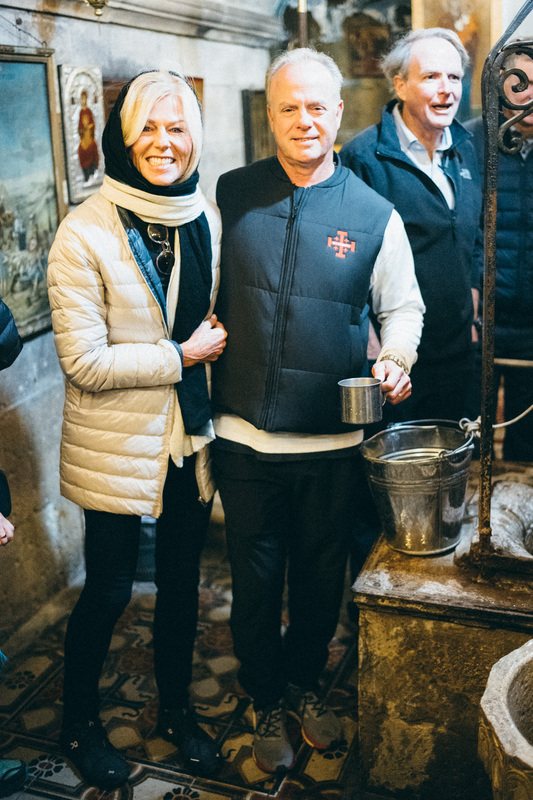 I then led some of the members of the group on a photo tour of the Church of the Holy Sepulchre, as we had some free time before our next stop on the tour. 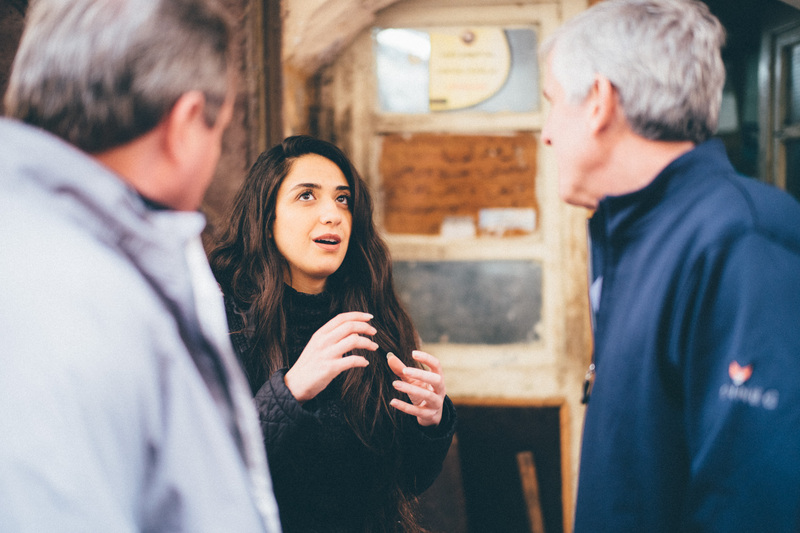 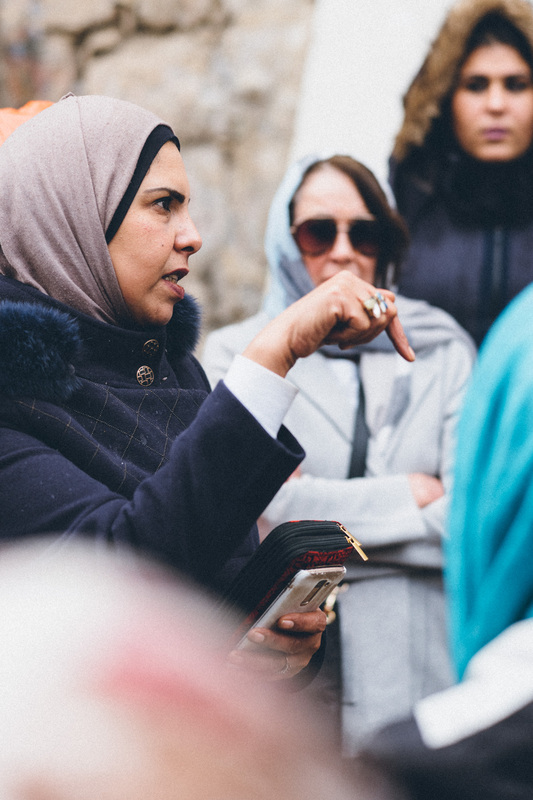 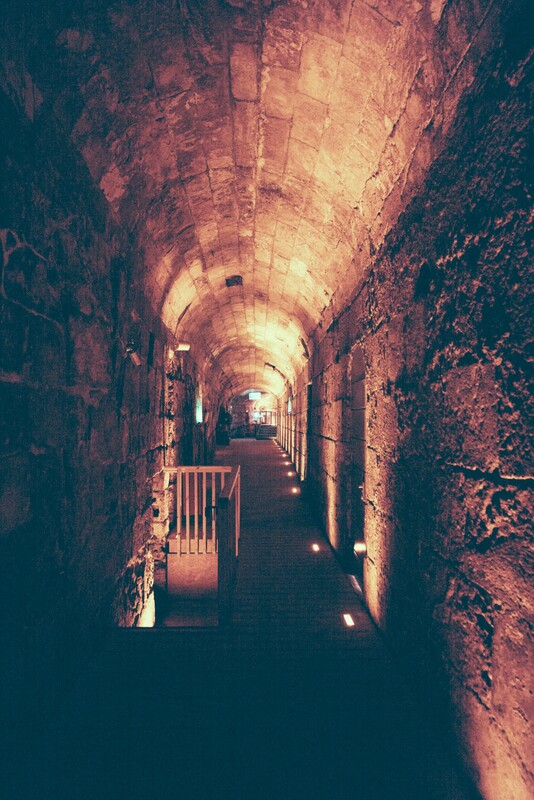 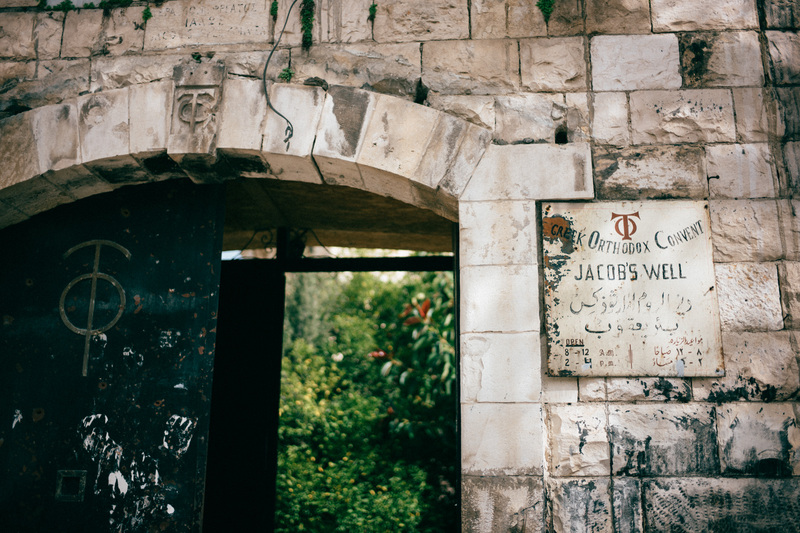 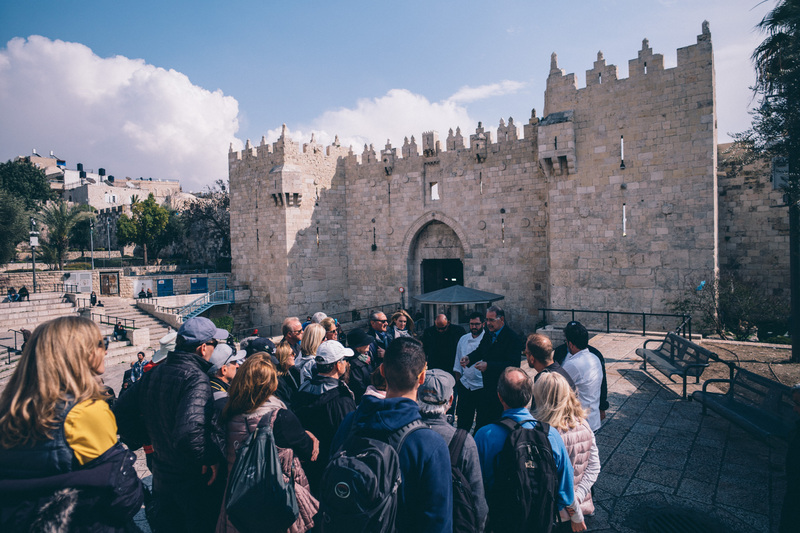 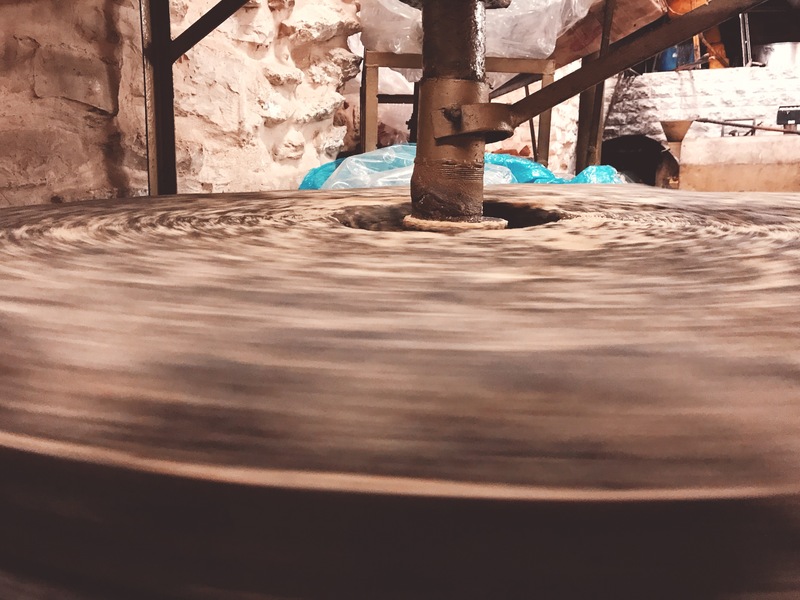 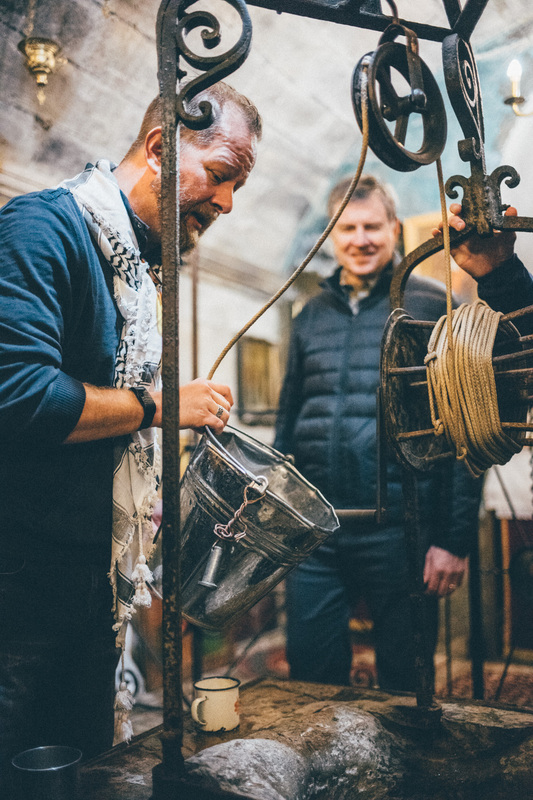 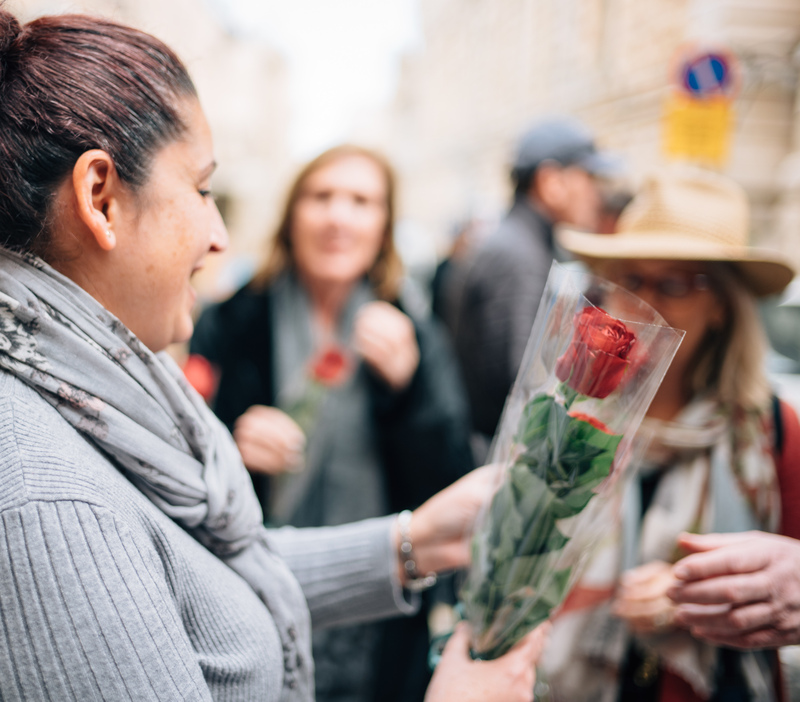 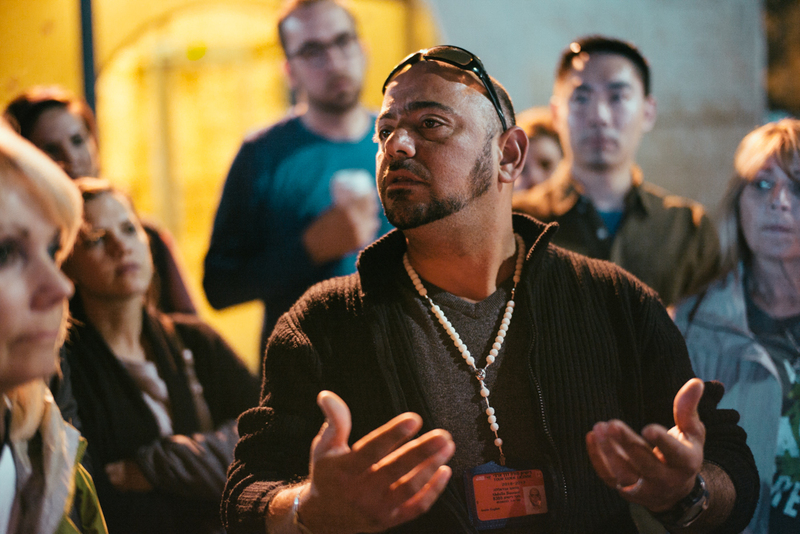 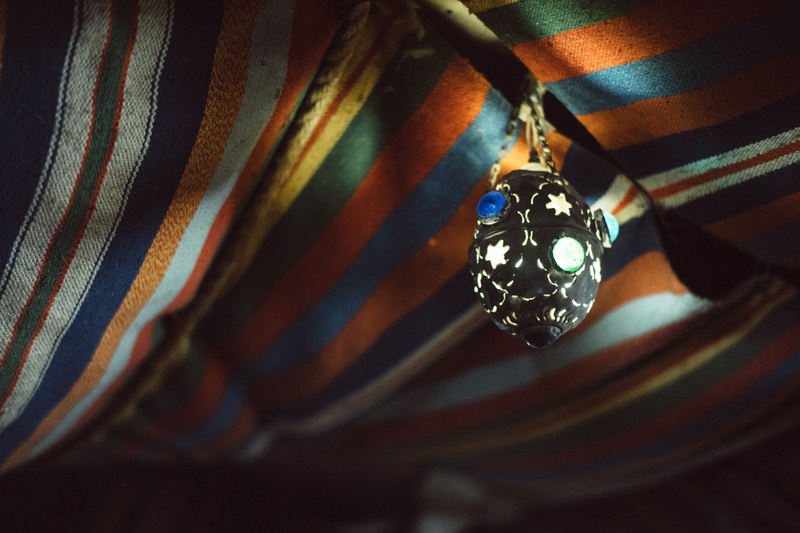 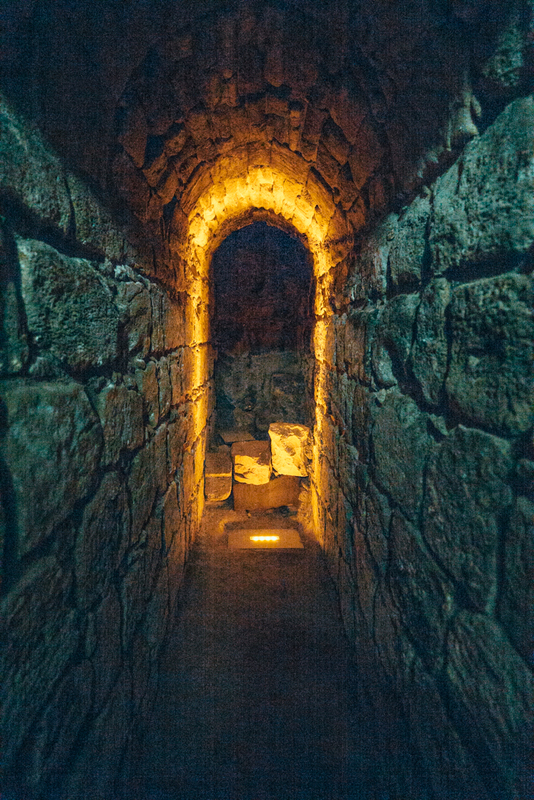 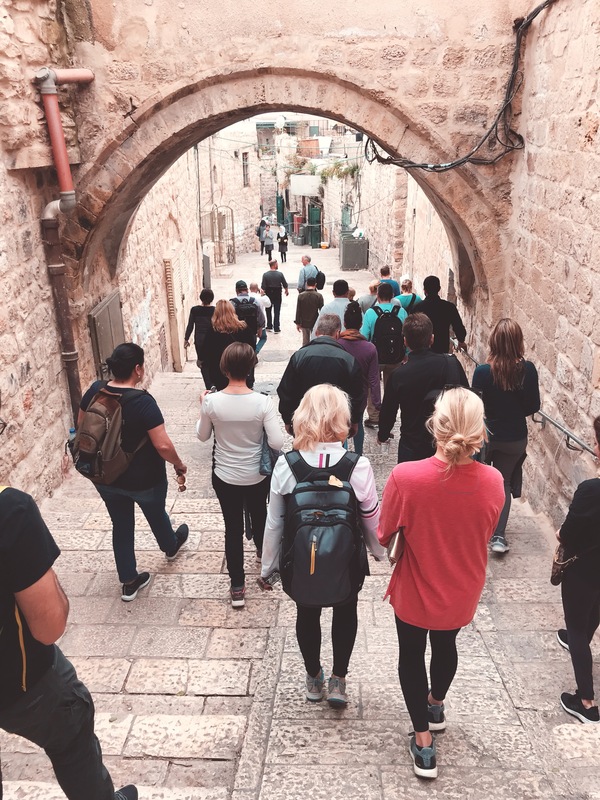 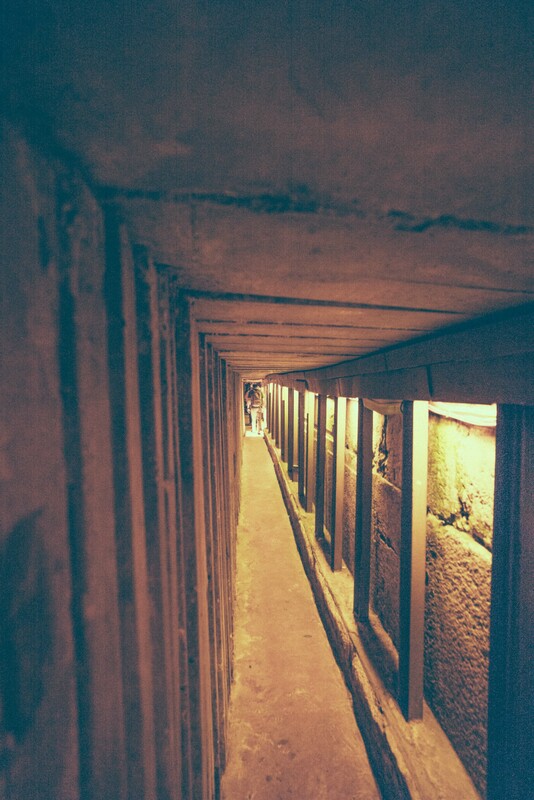 Next, after a walk through the Jewish Quarter, our tour with Breaking Bread Journeys took us through the tunnels revealing archaeological finds deep underneath the Old City. 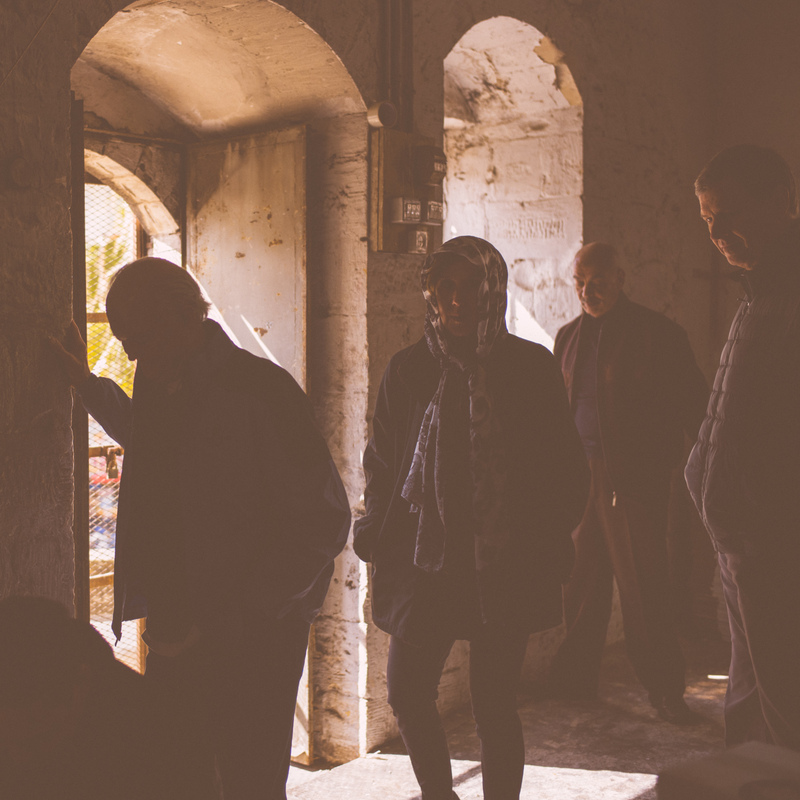 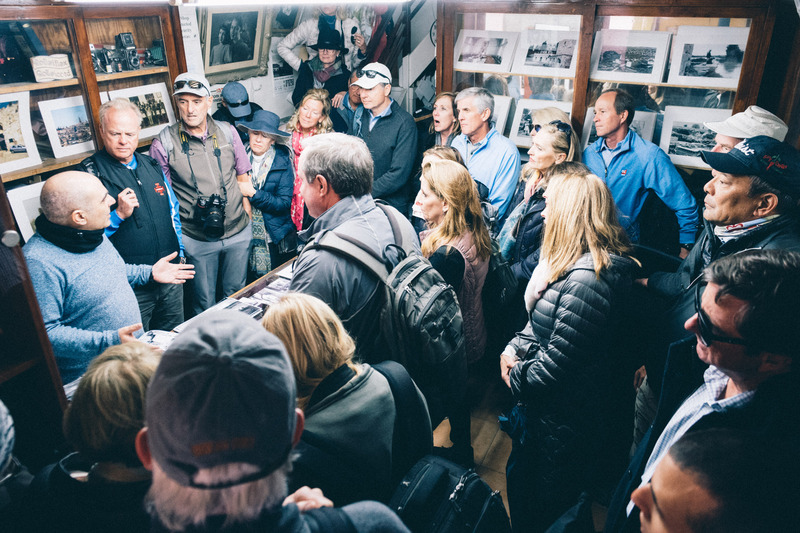 The Tunnel Tour is in such high demand that you must book it two months in advance. 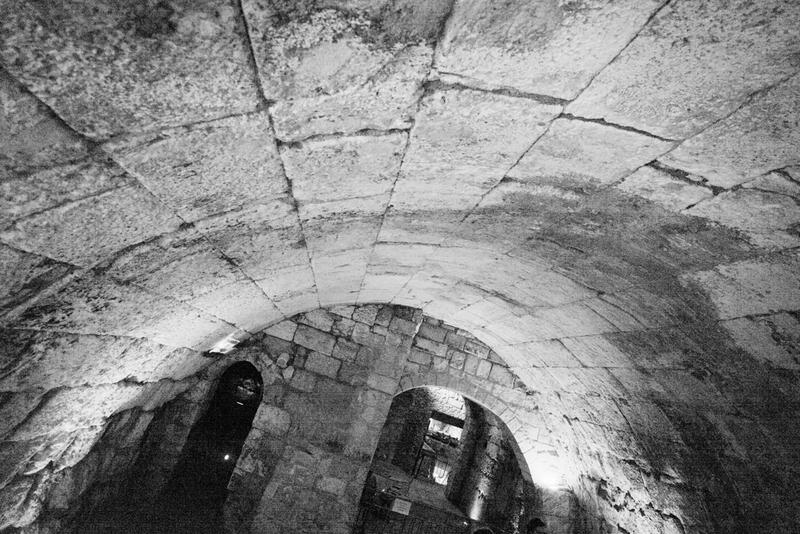 We learned that much of the city was raised from a small valley centuries ago by arched supports, and it is under these arches that many of the tunnels were excavated. 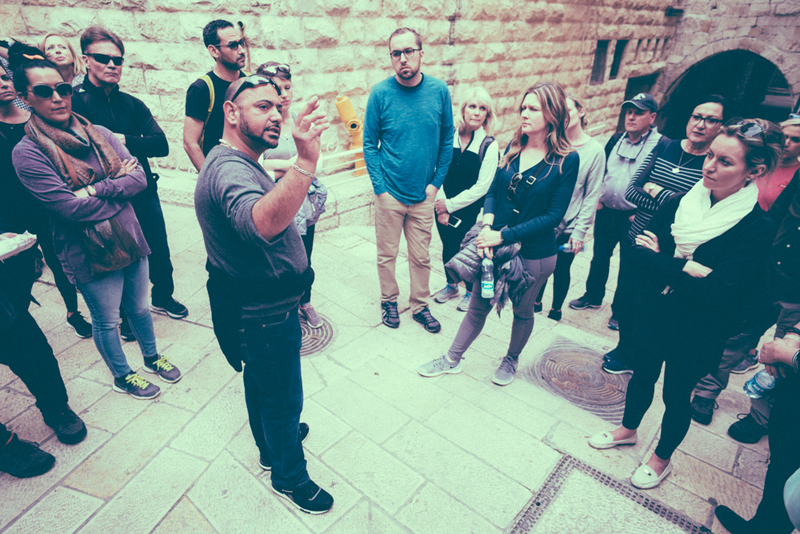 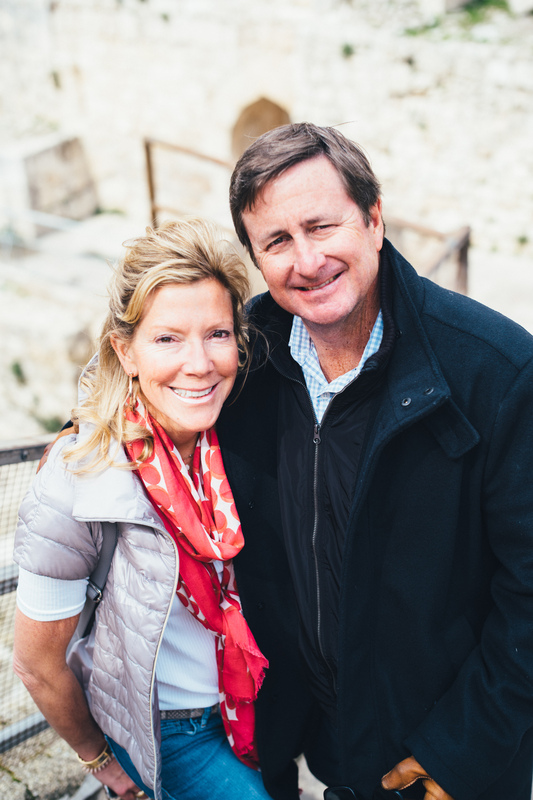 We saw the ancient gates to Solomon’s Temple and learned that one stone of the temple’s western retaining wall weighs an estimated 570 tons. 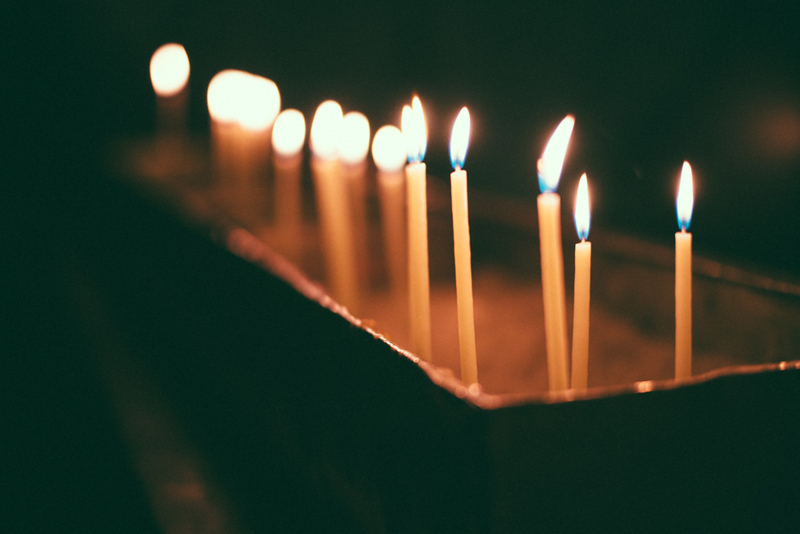 My devotional focus for Day 6 brought me to themes surrounding celebration, contemplation, and light. 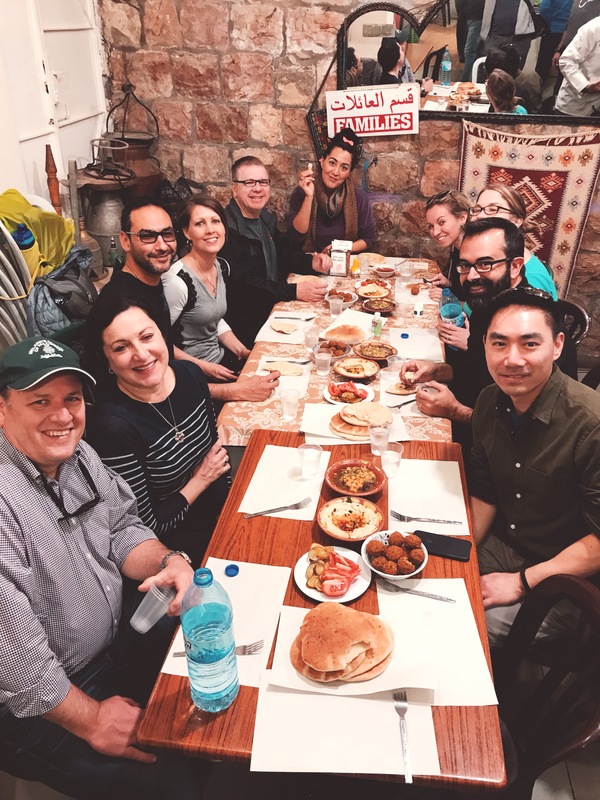 Our day started with the surreal juxtaposition of enjoying food along the route of Jesus’ path to the Cross known as the Via Dolorosa. 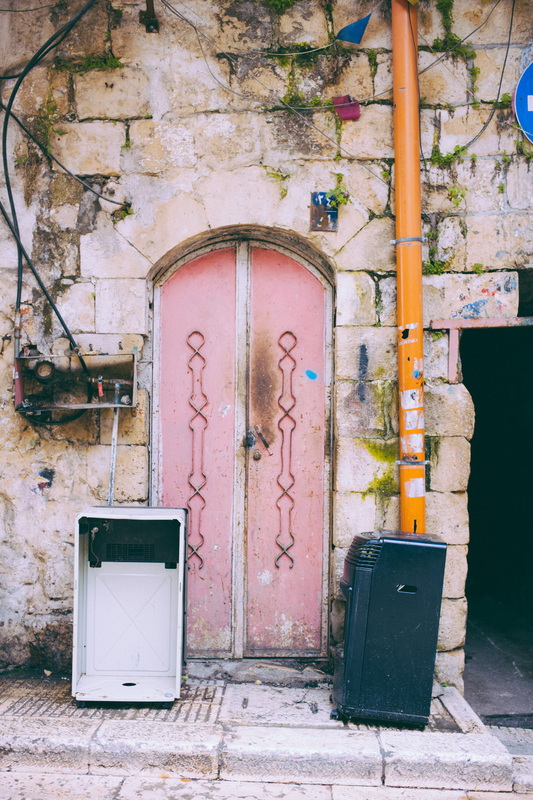 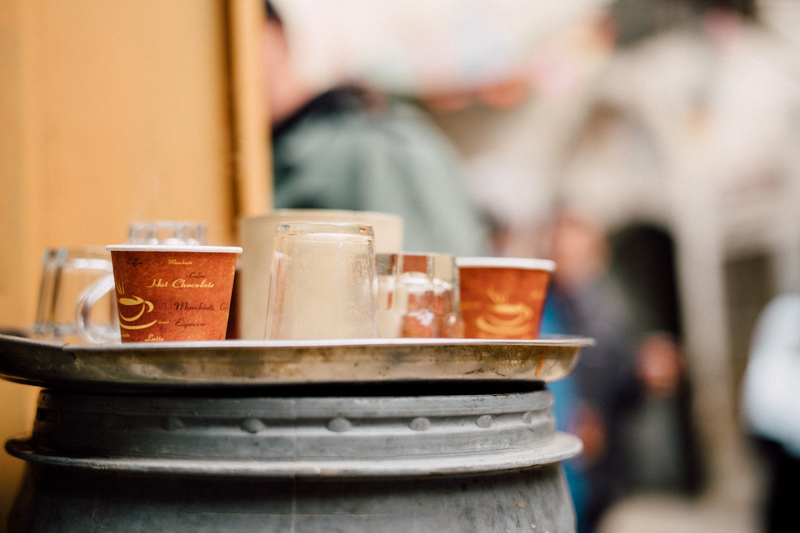 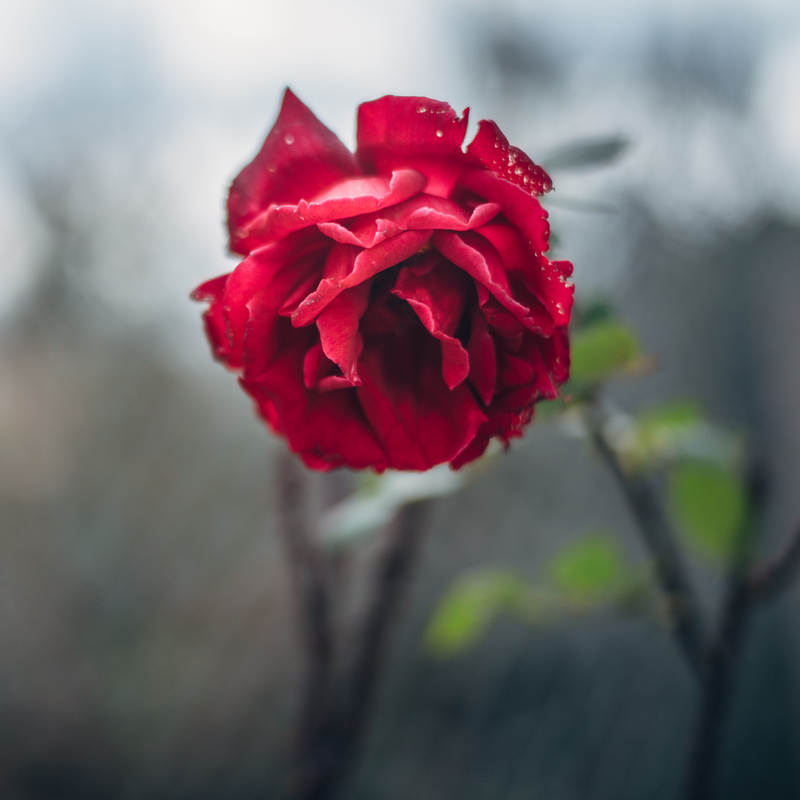 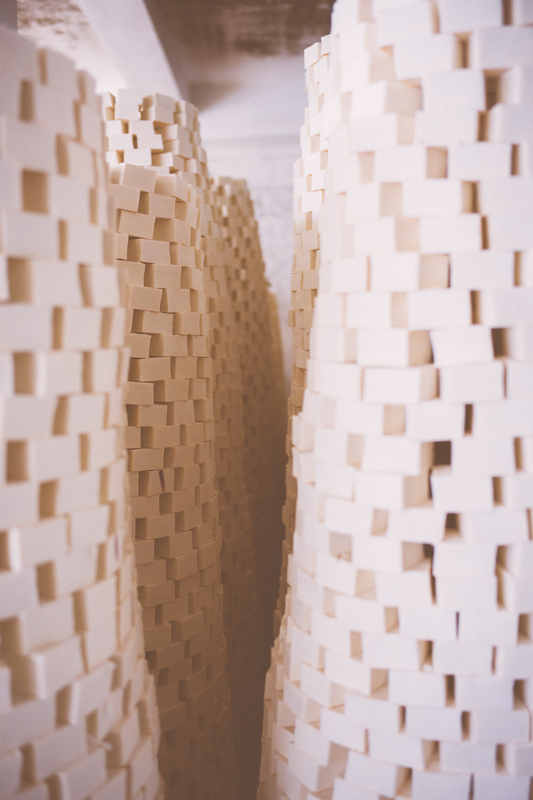 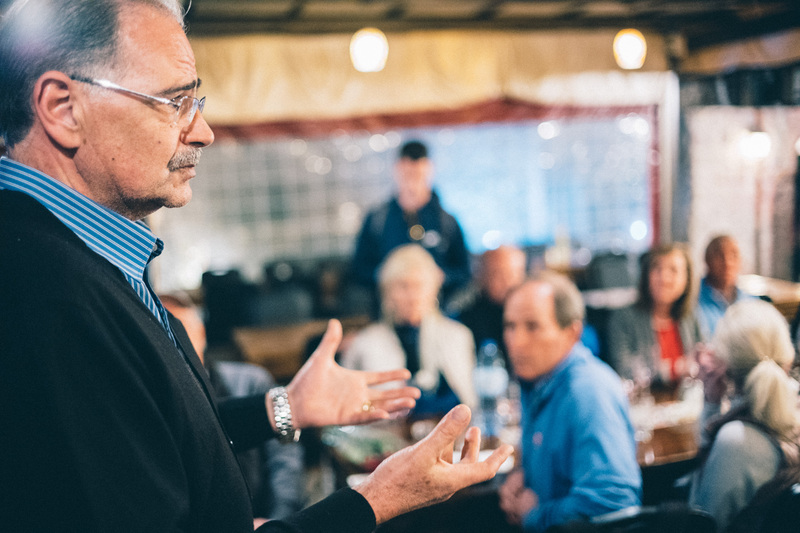 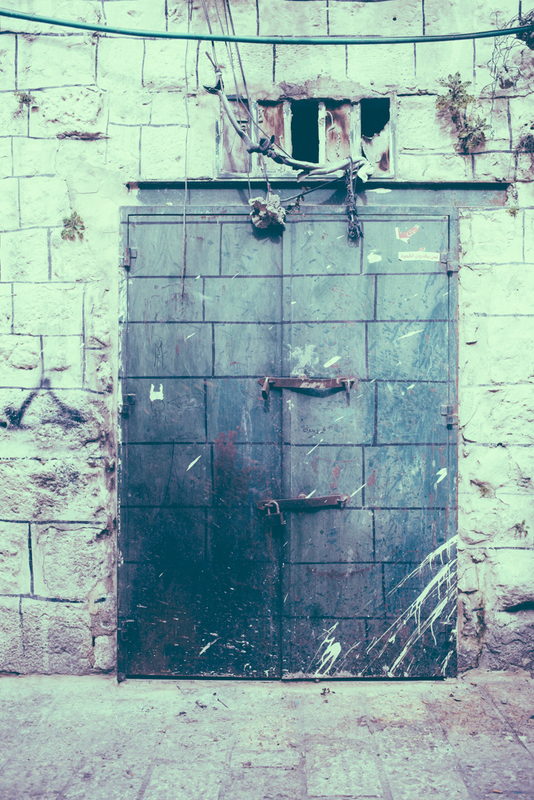 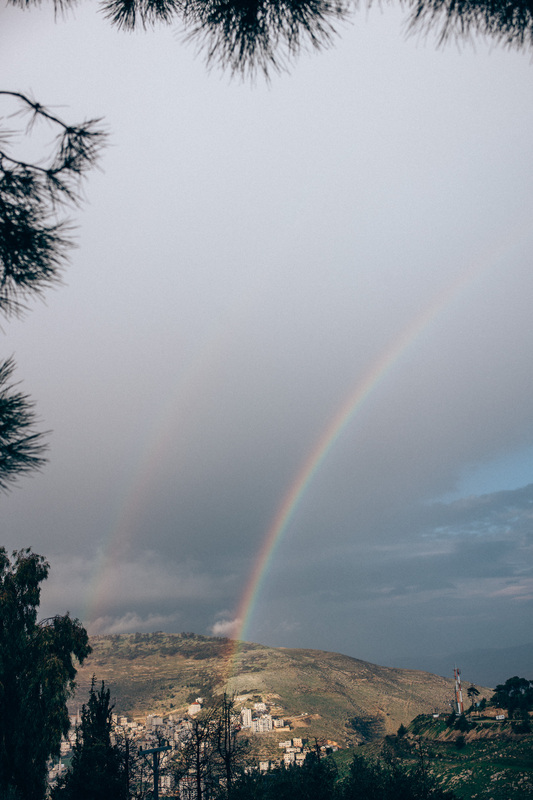 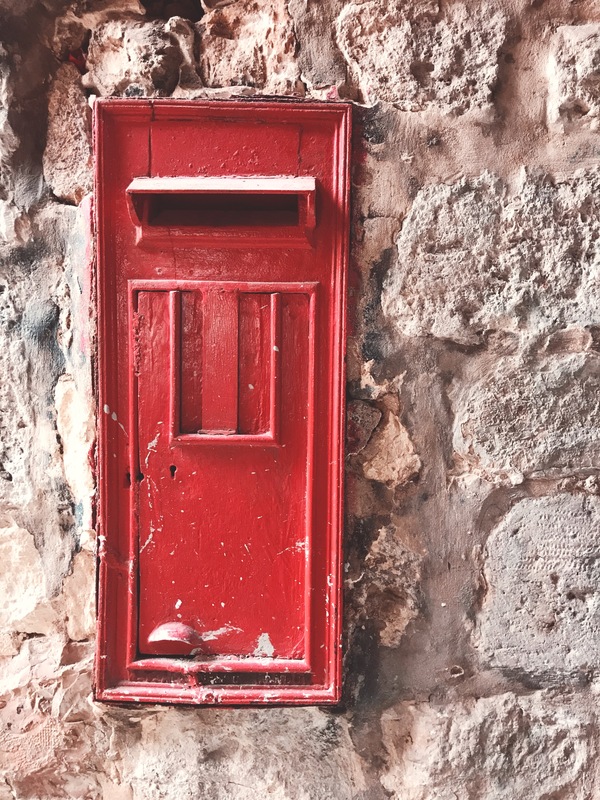 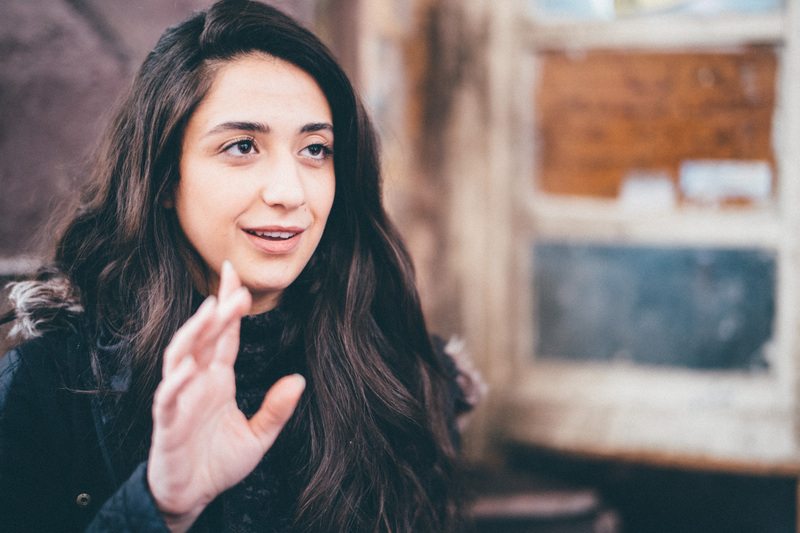 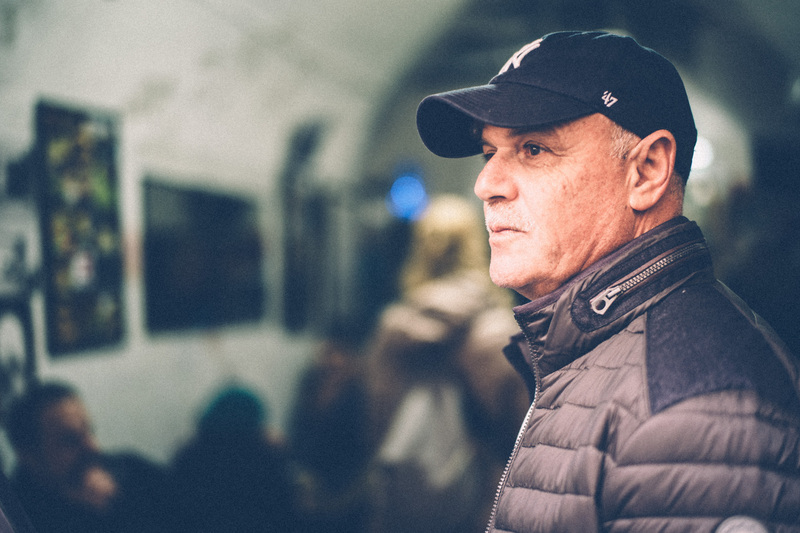 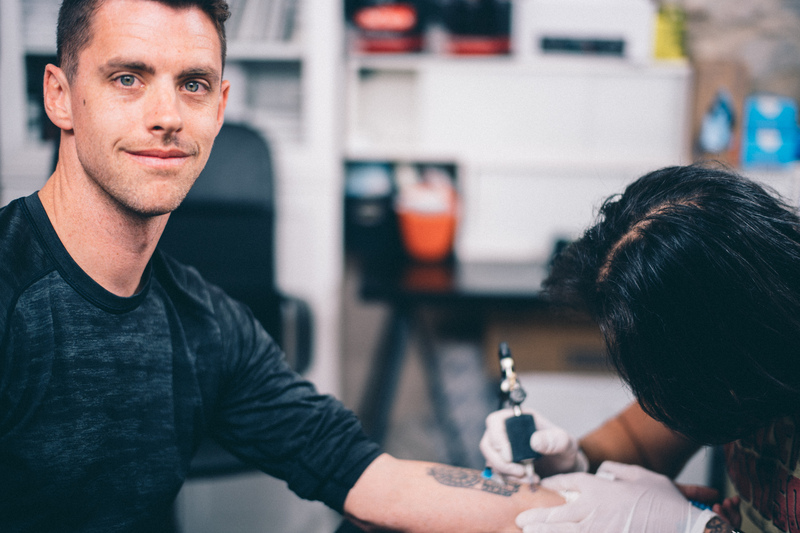 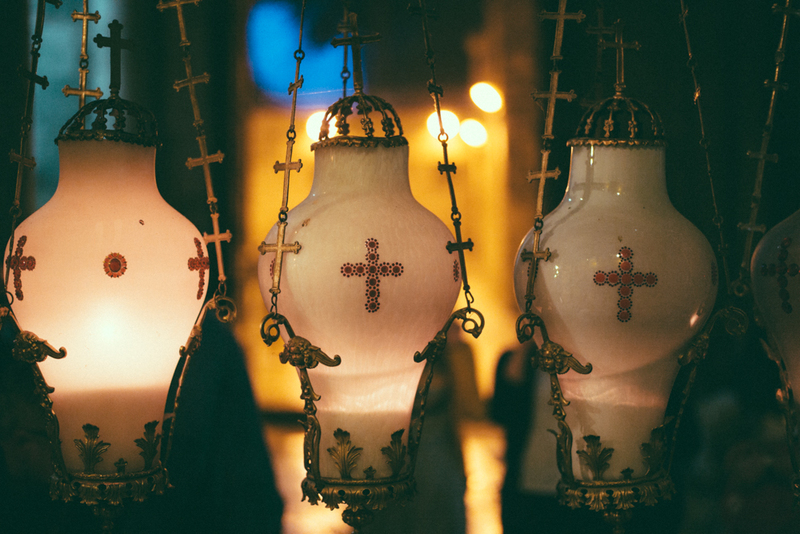 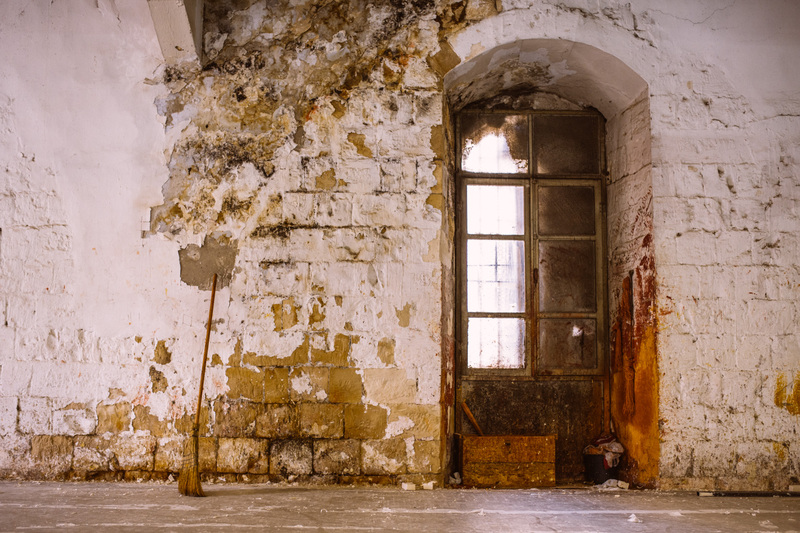 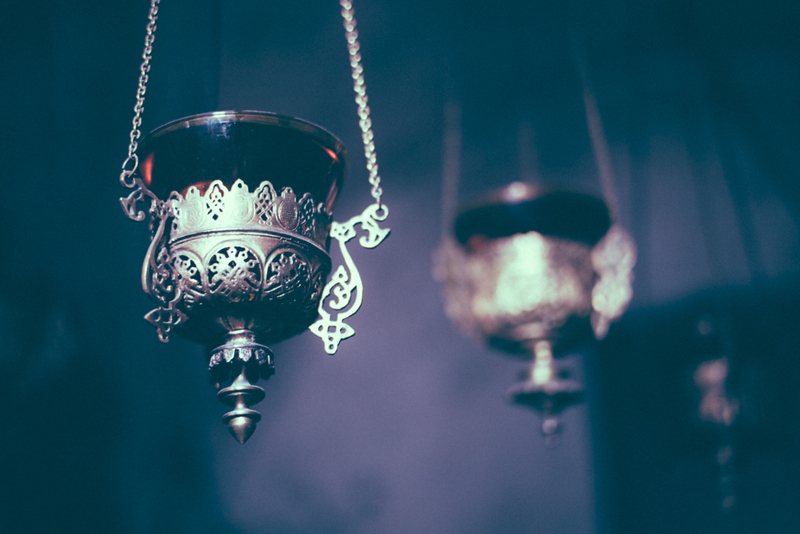 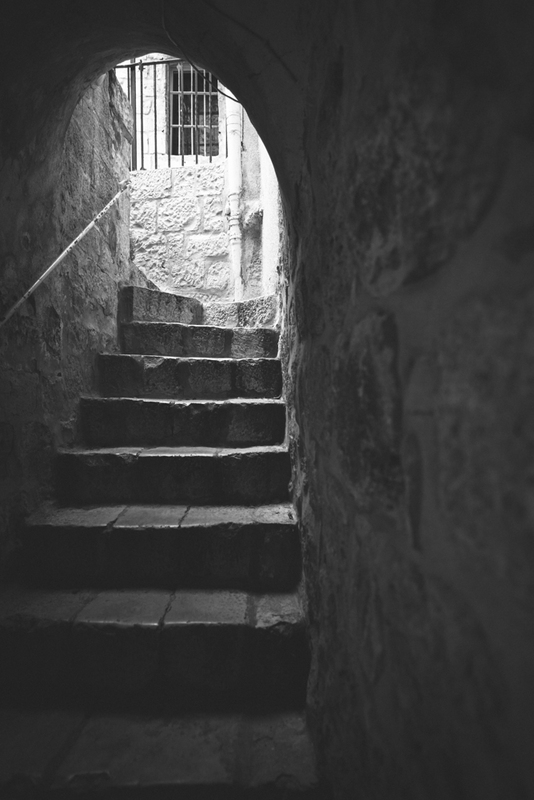 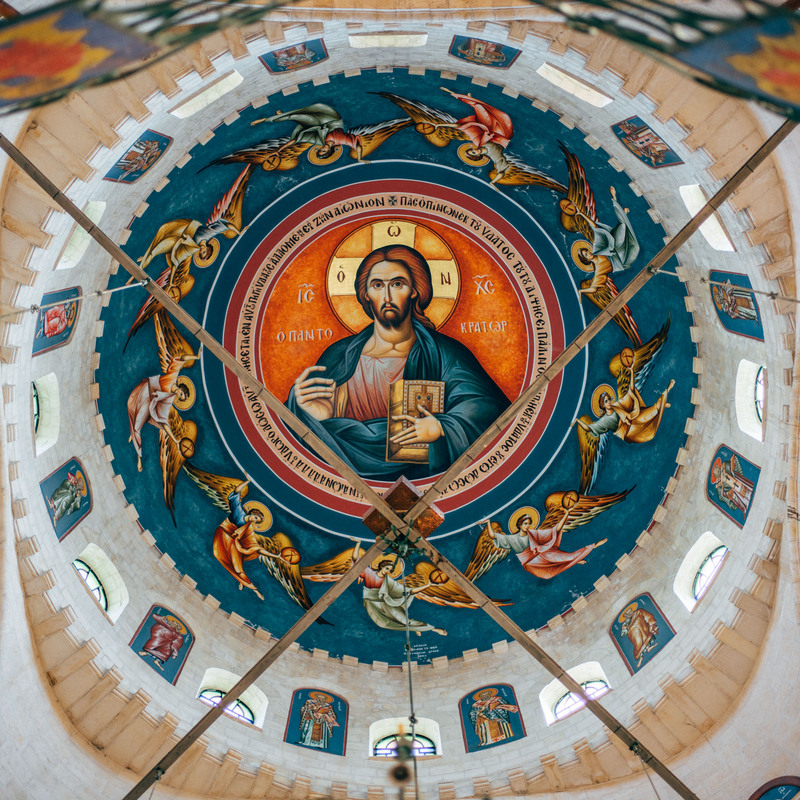 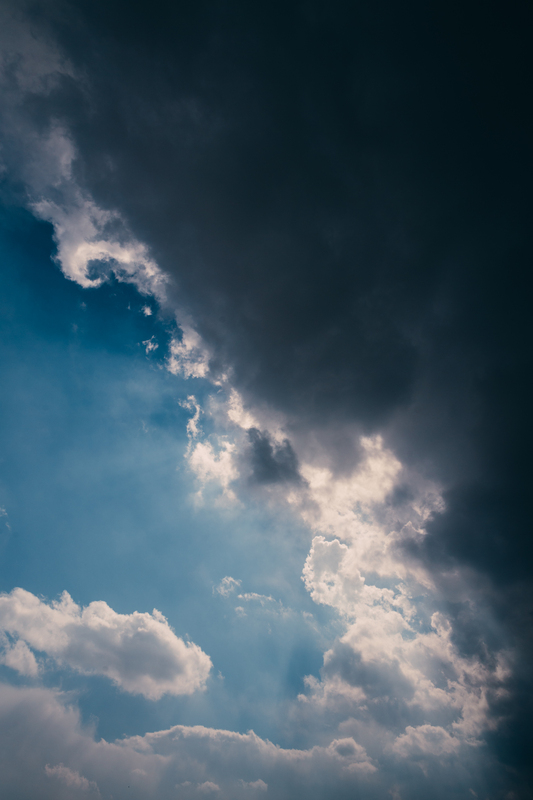 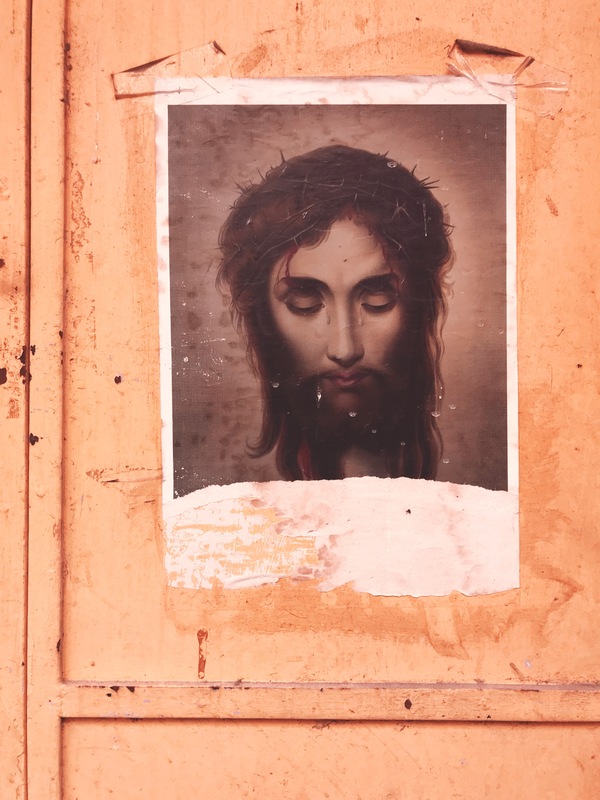 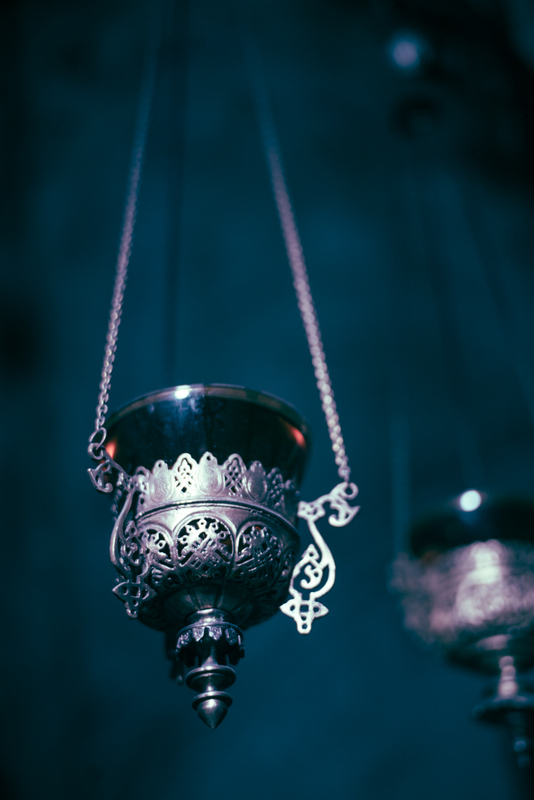 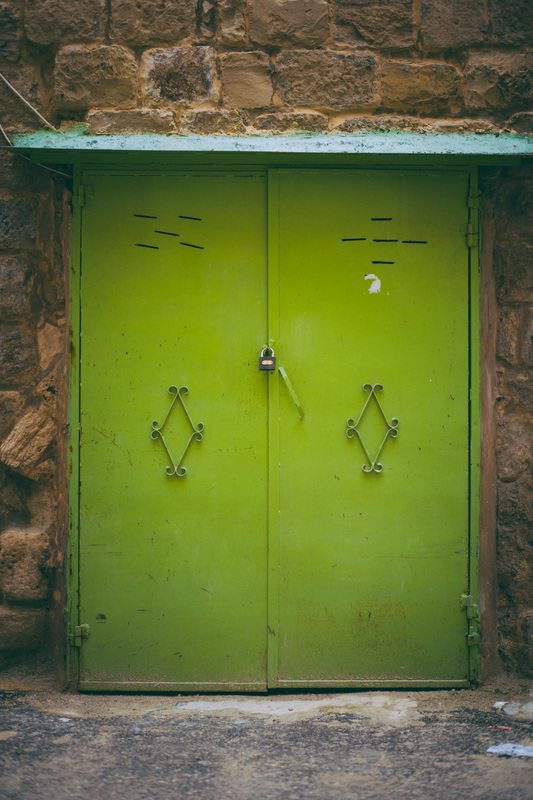 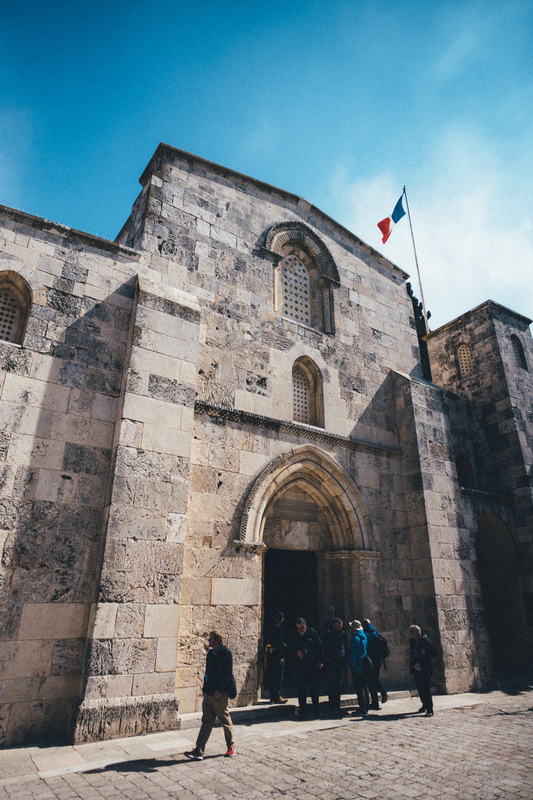 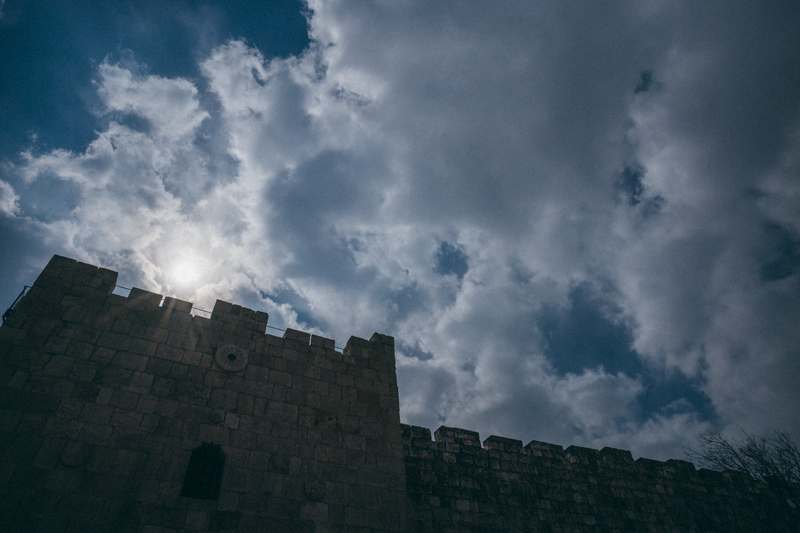 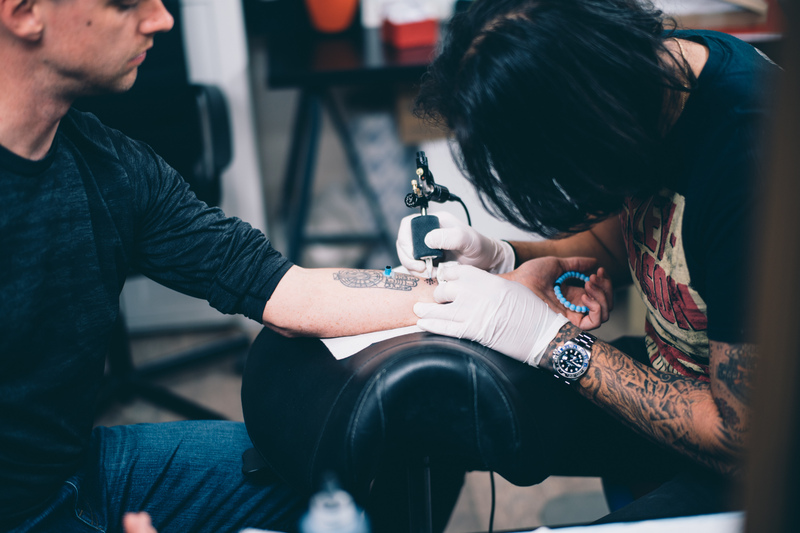 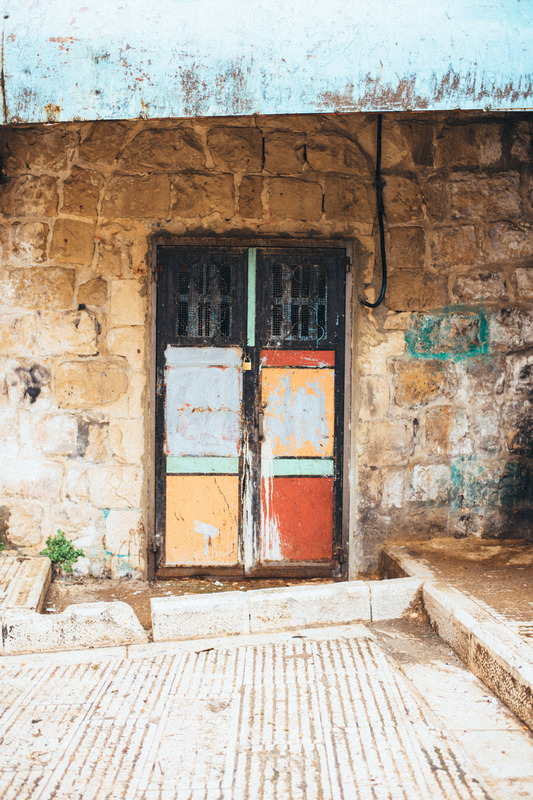 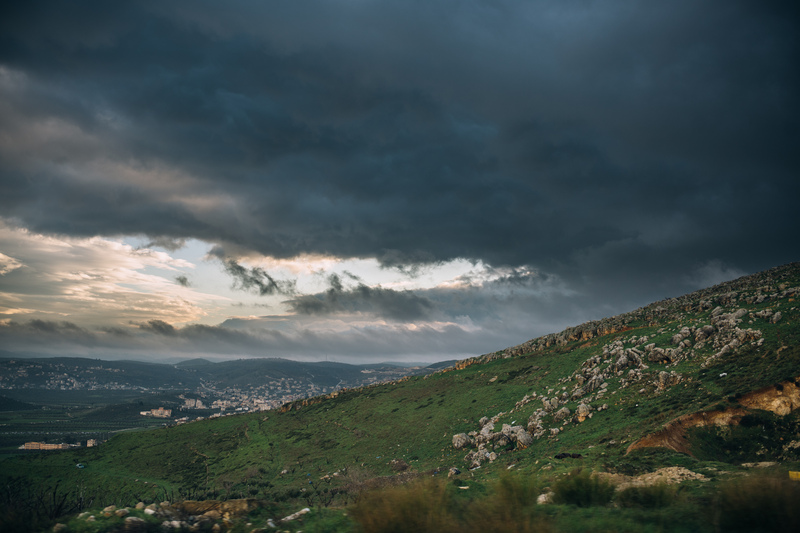 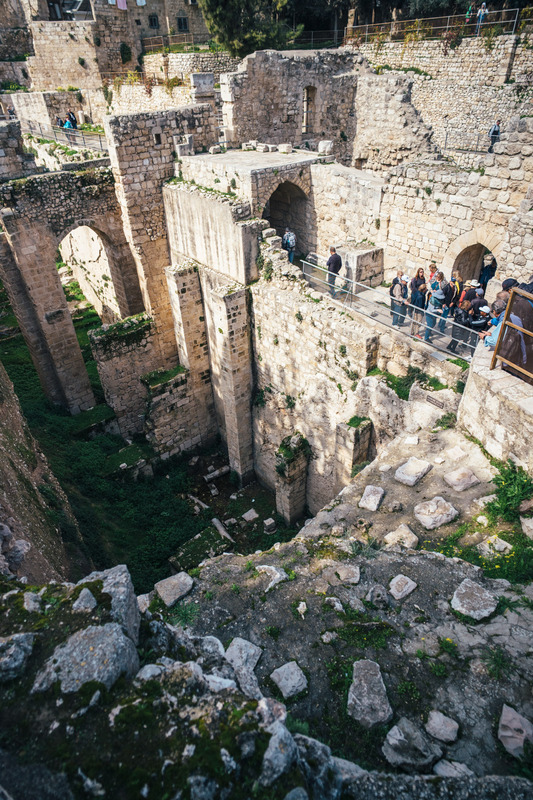 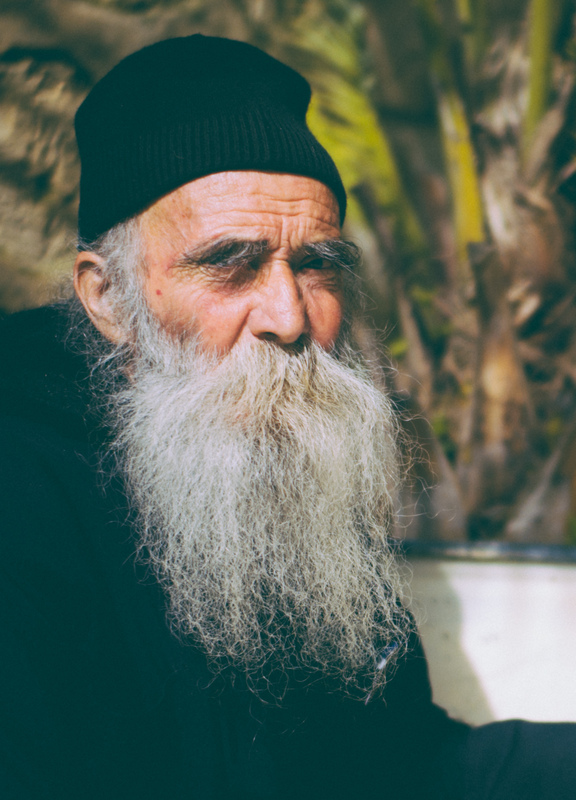 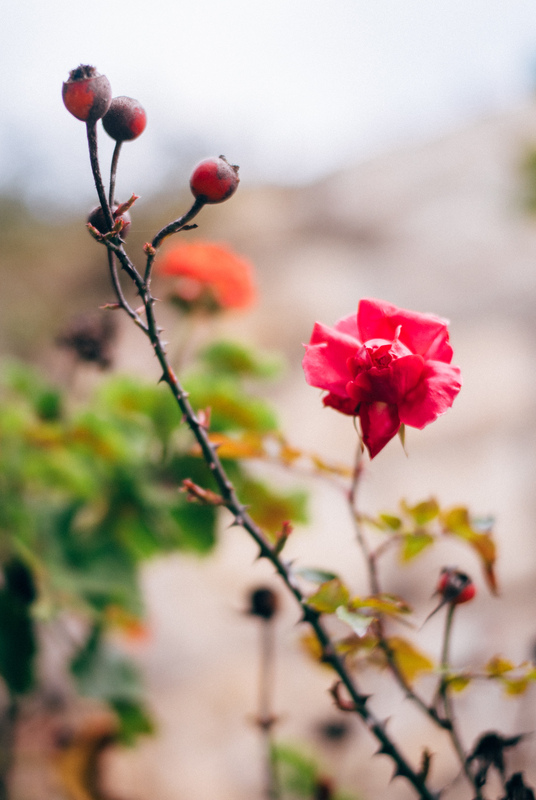 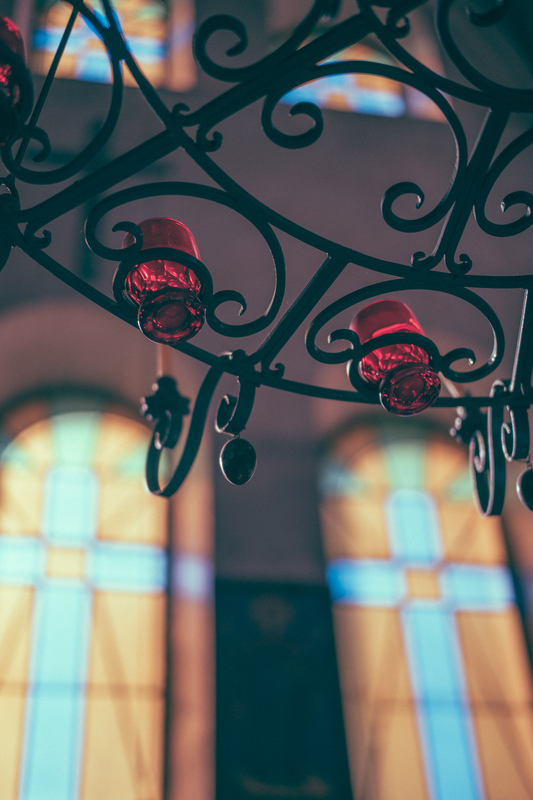 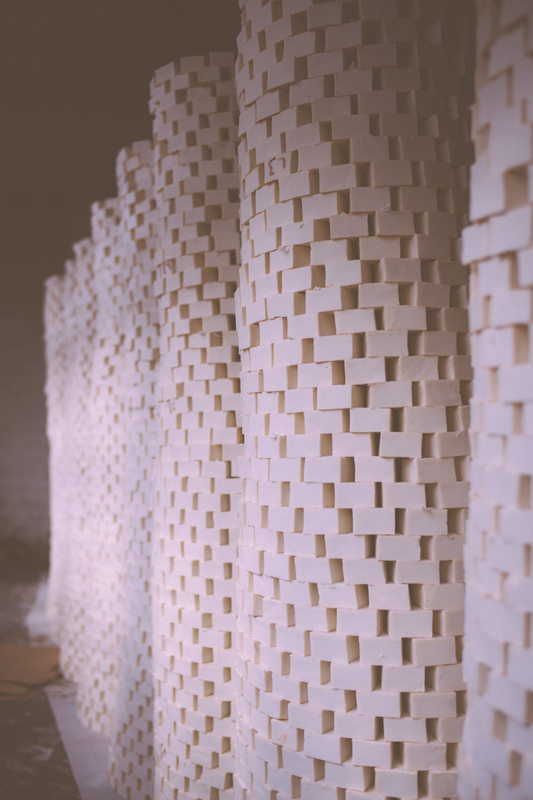 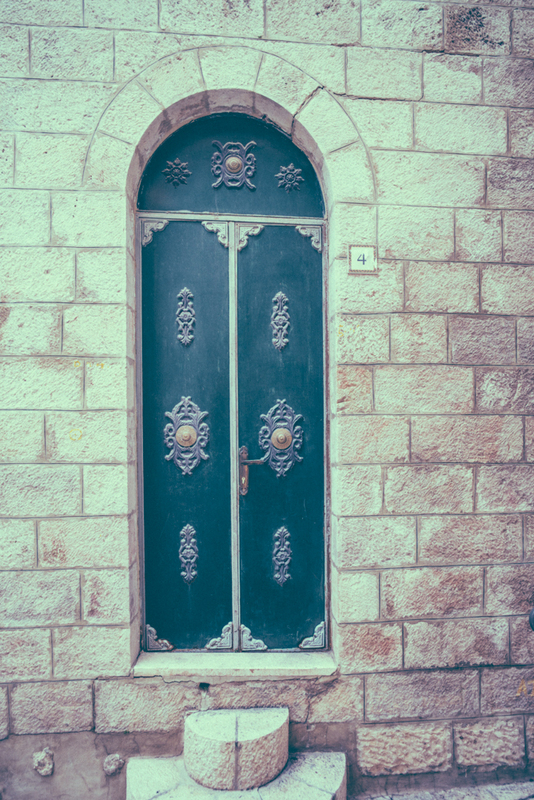 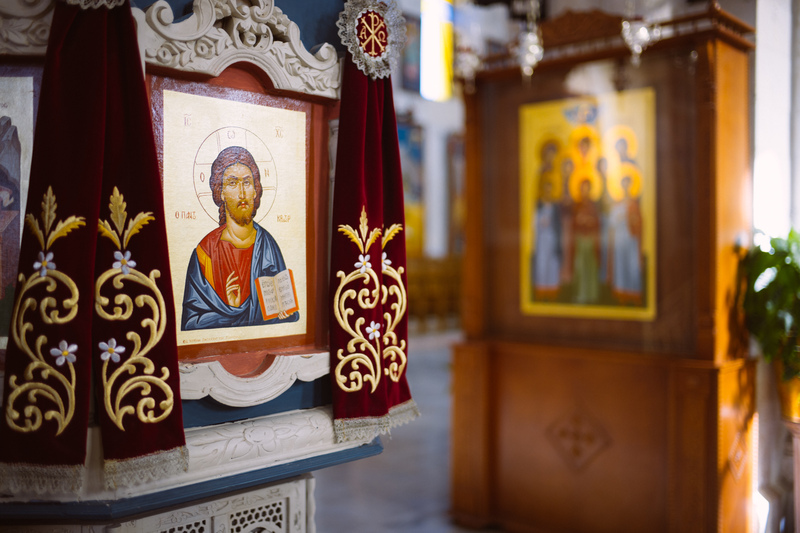 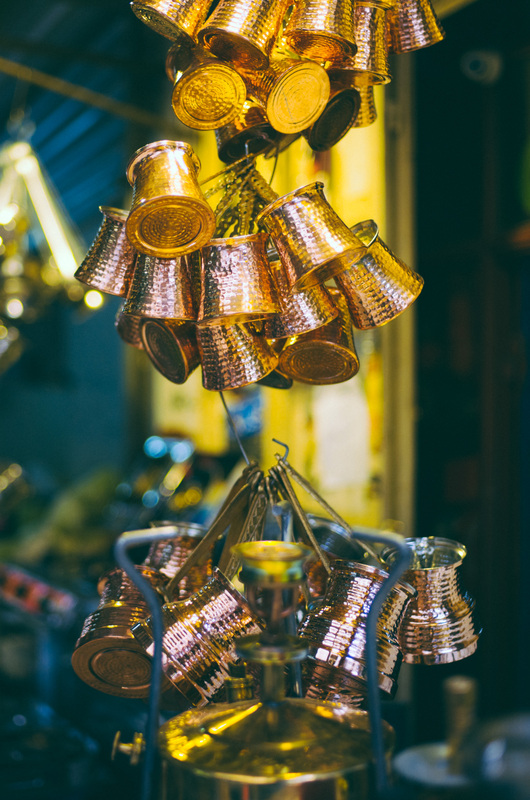 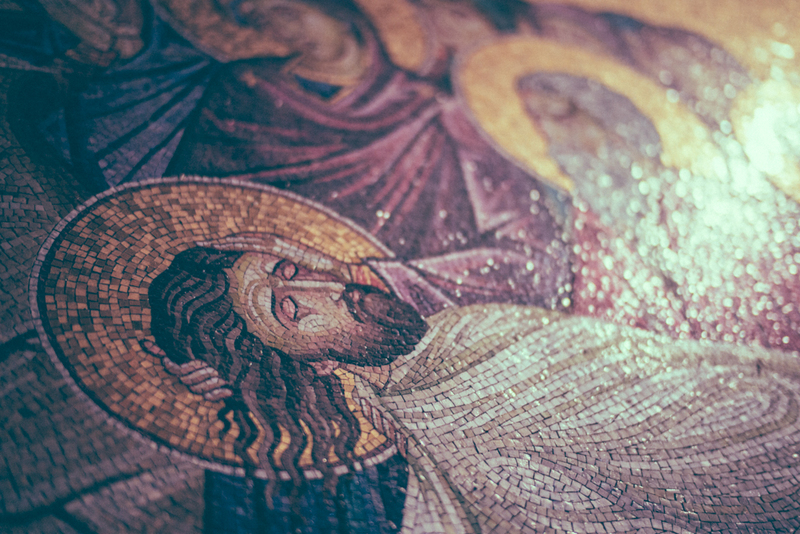 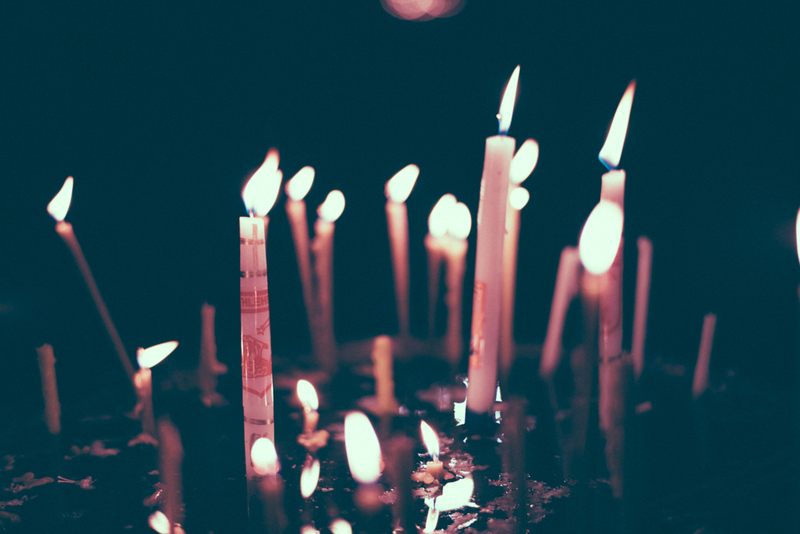 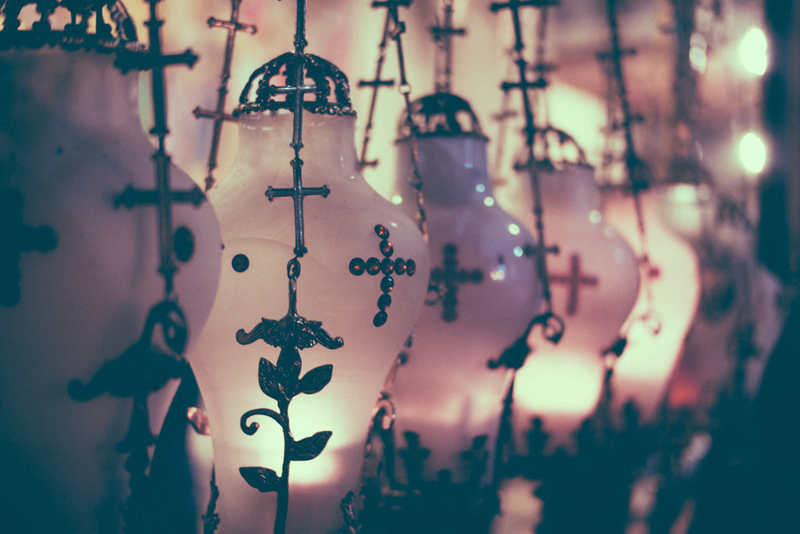 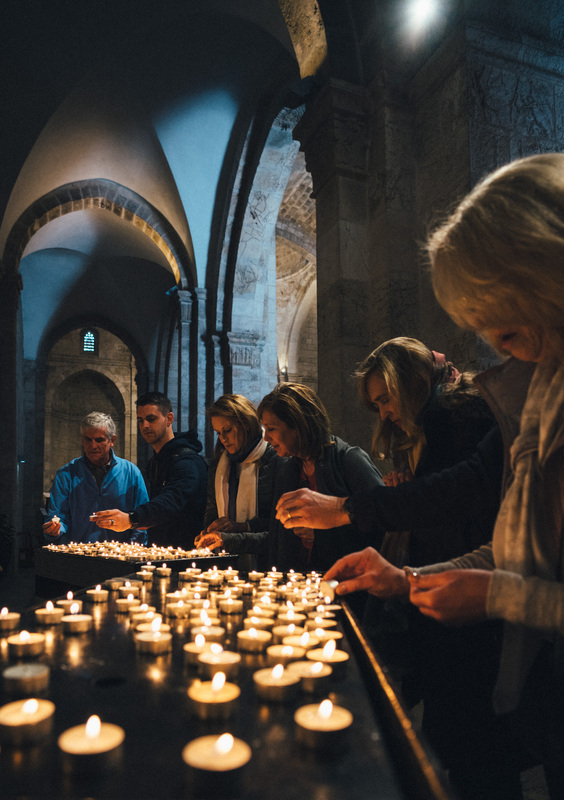 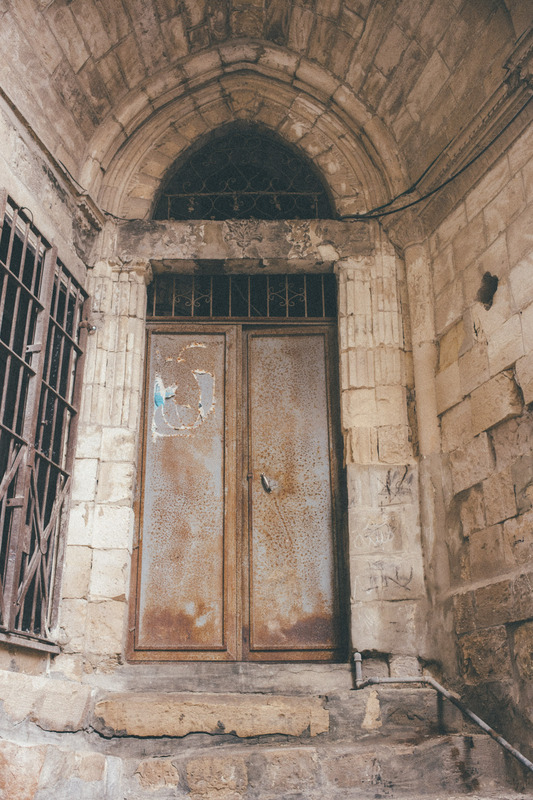 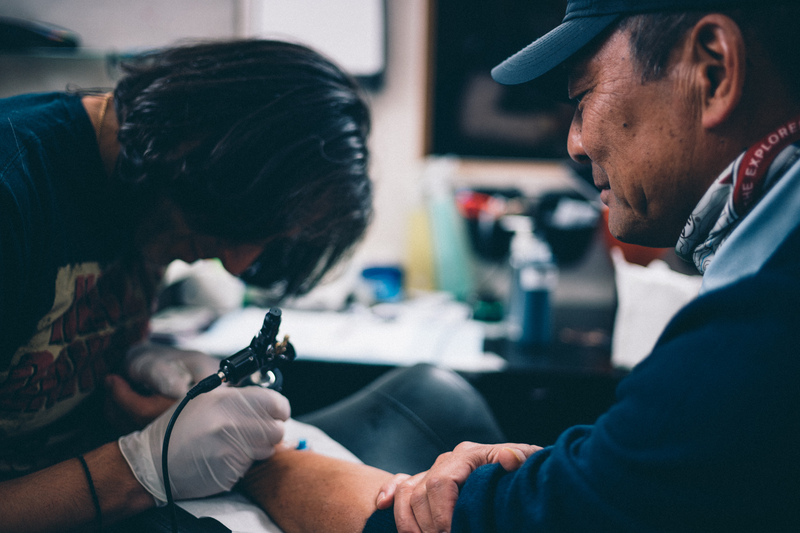 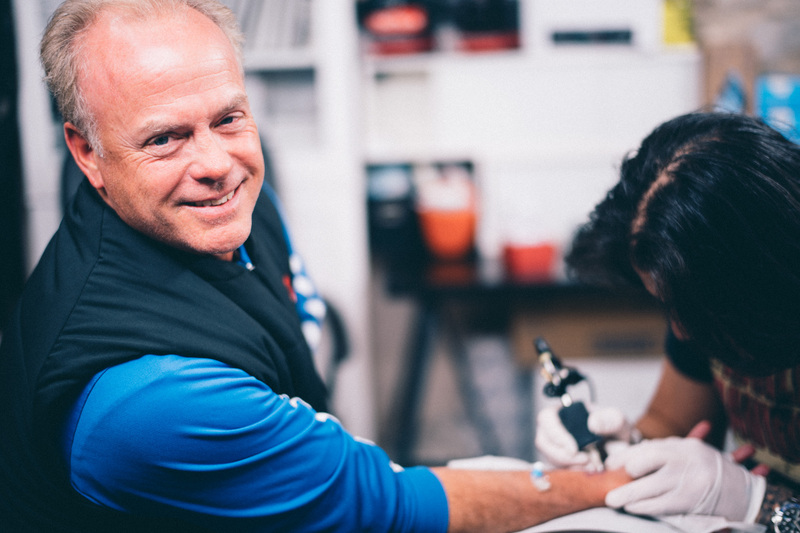 It’s not an easy theme to consider, but in the Christian faith, Jesus’ execution is ultimately the celebration of his resurrection and victory over sin and death. 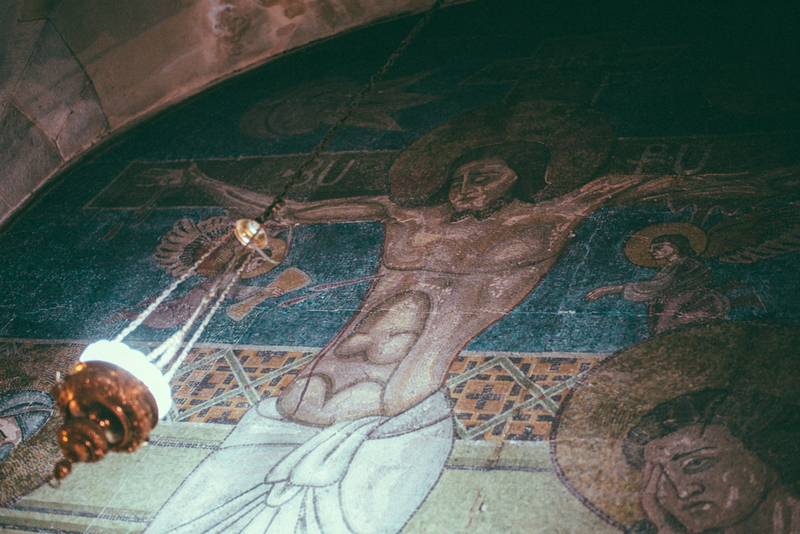 So it is appropriate that, while we also consider his suffering and the penalty he paid on our behalf, we should find also a path of celebration and feasting along the same route. 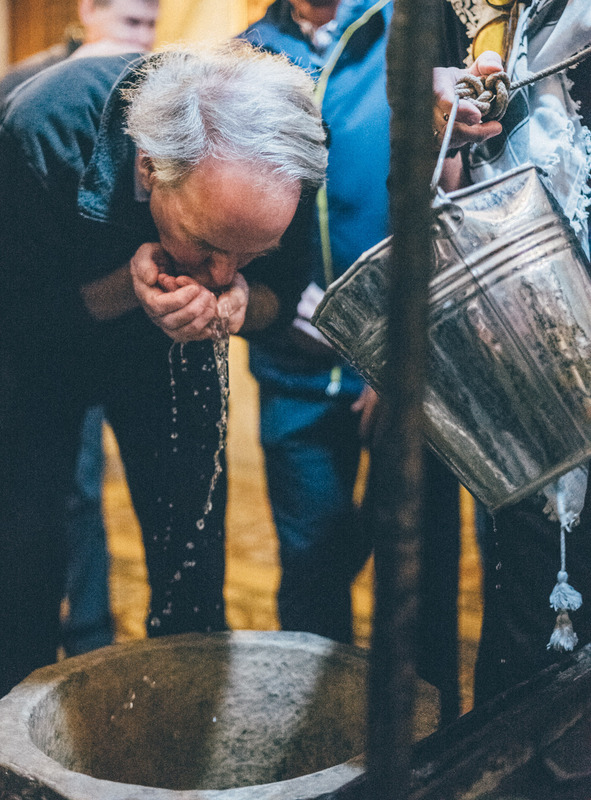 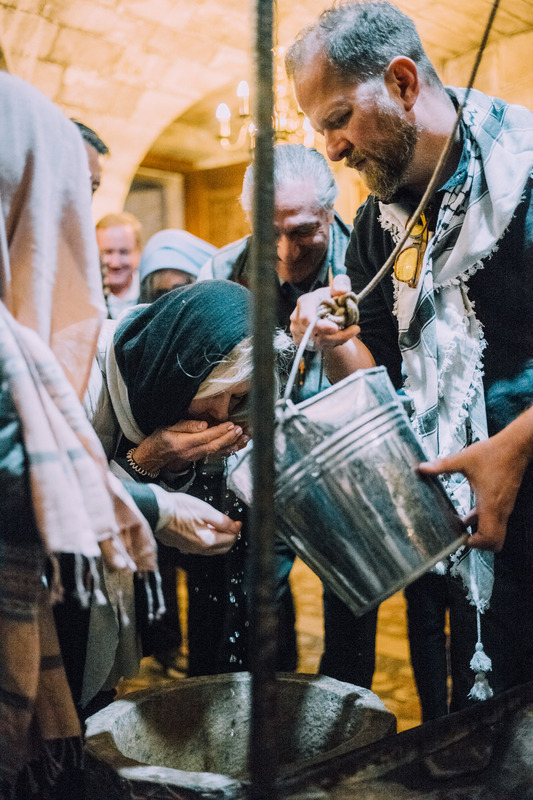 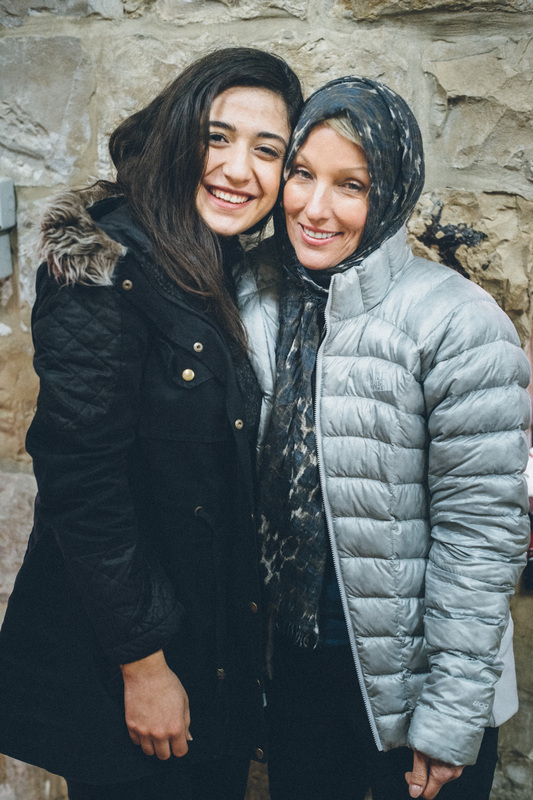 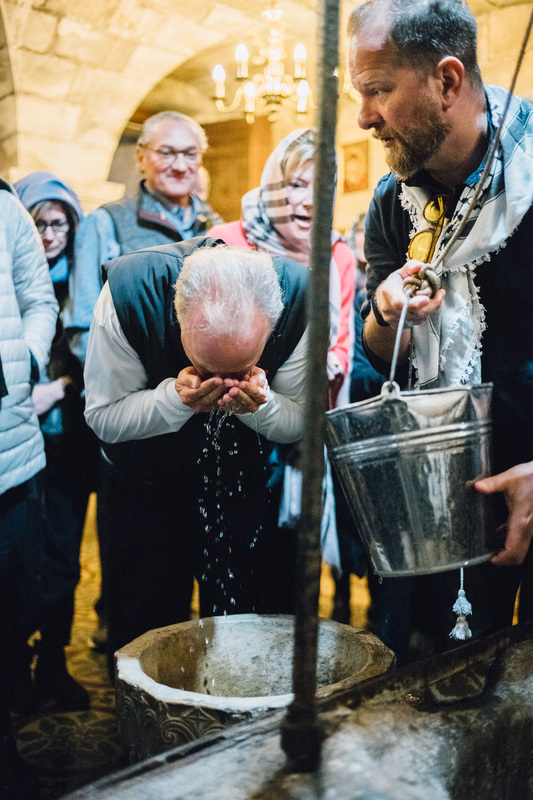 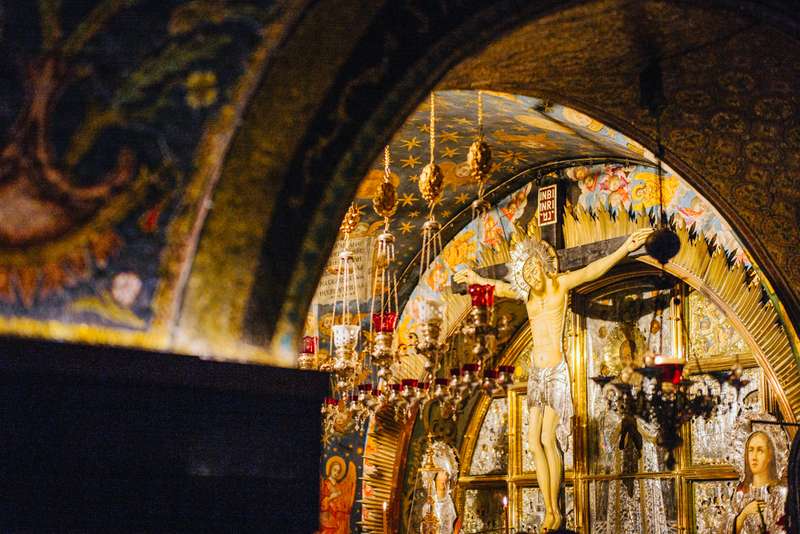 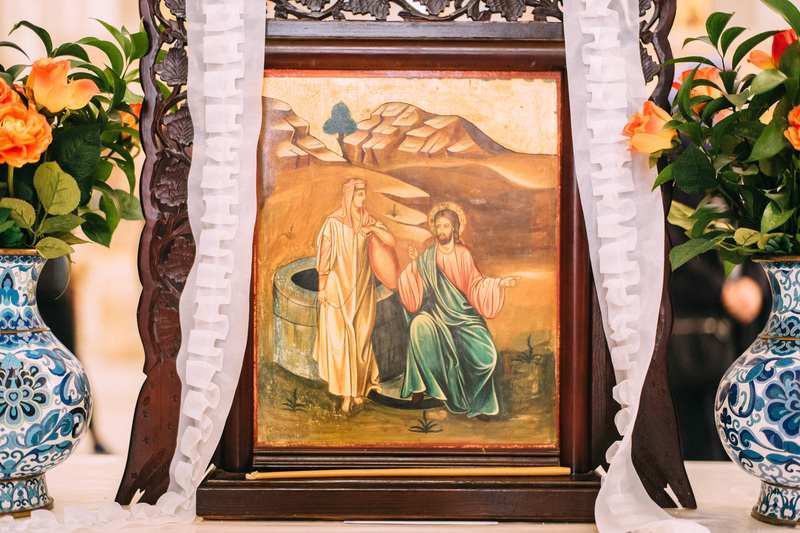 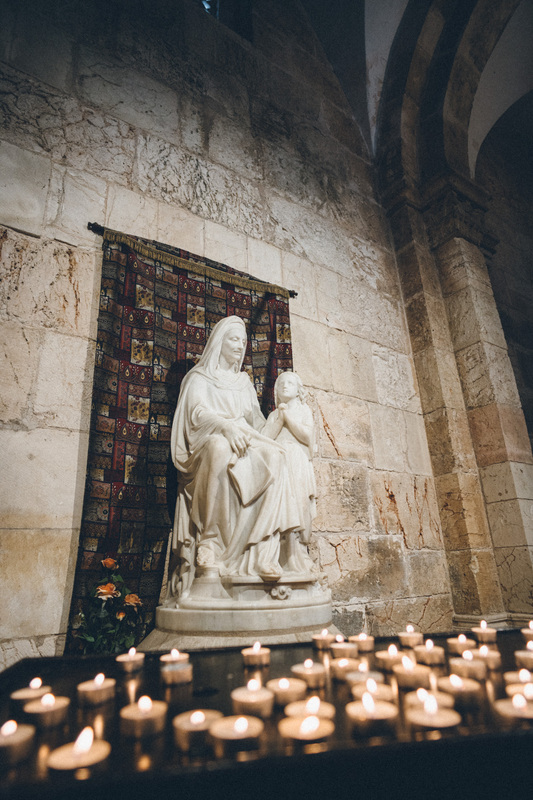 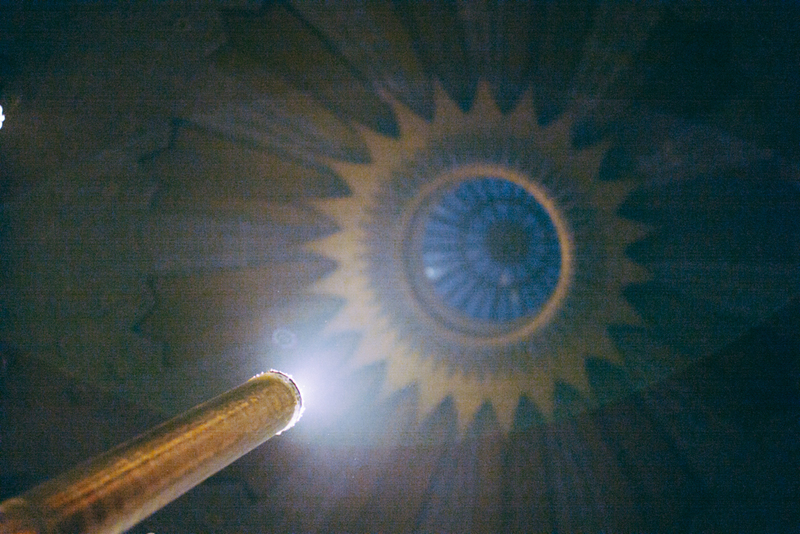 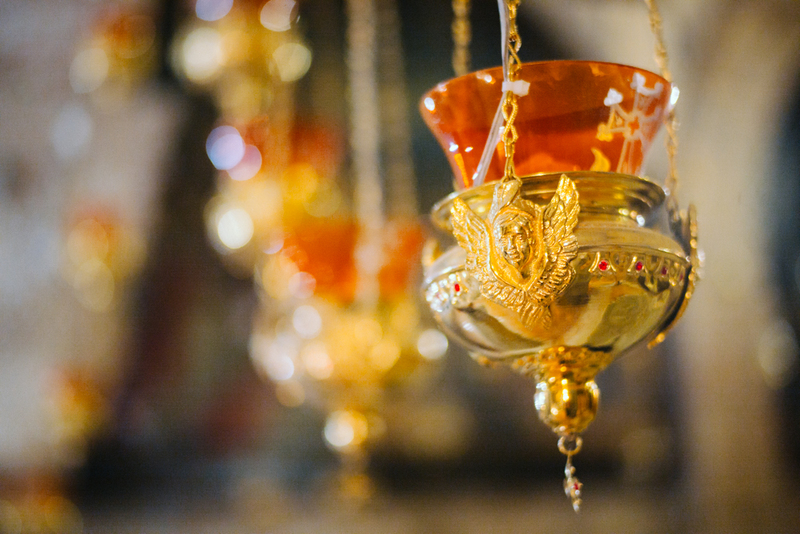 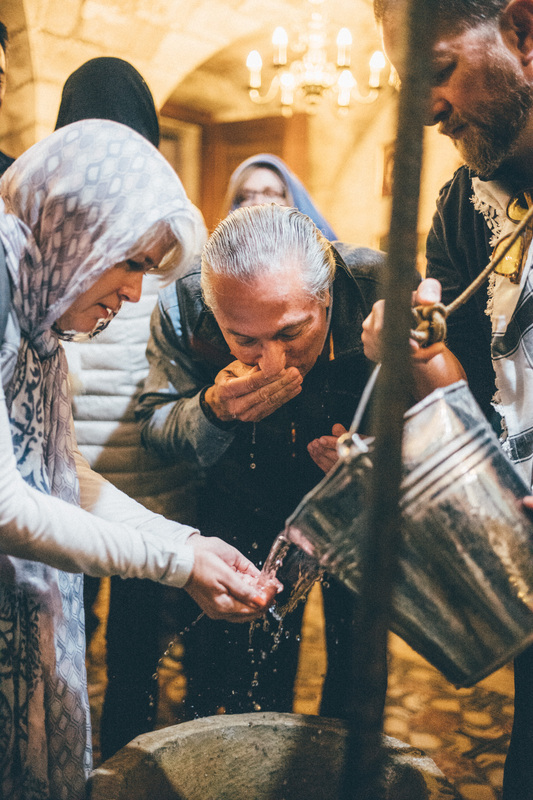 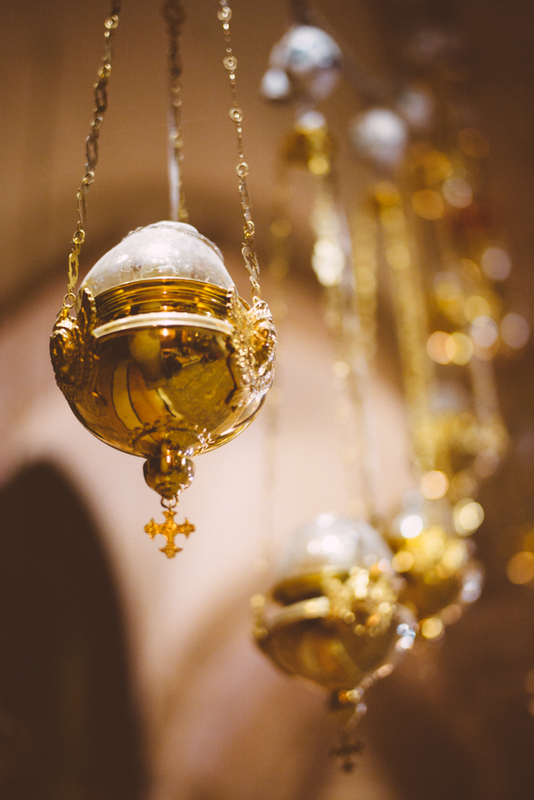 However, I appreciated the way that God led us to the Holy Sepulchre after this celebration where it is hard not to enter in a contemplative spirit. 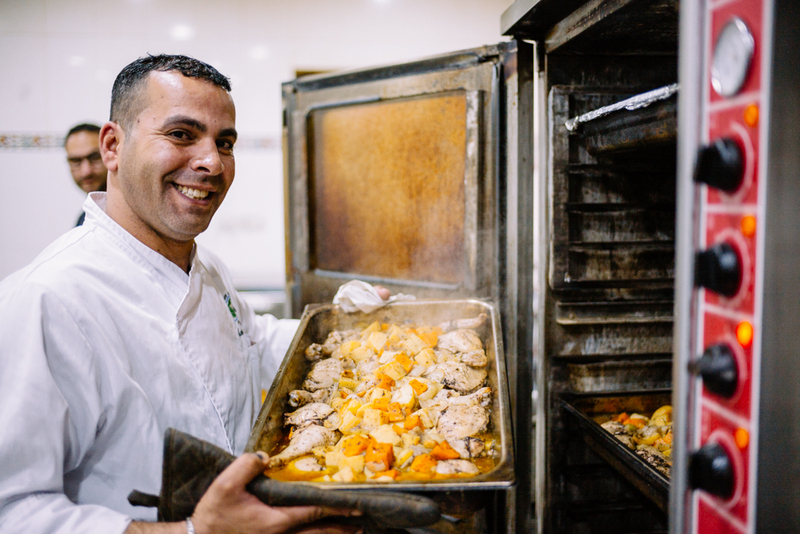 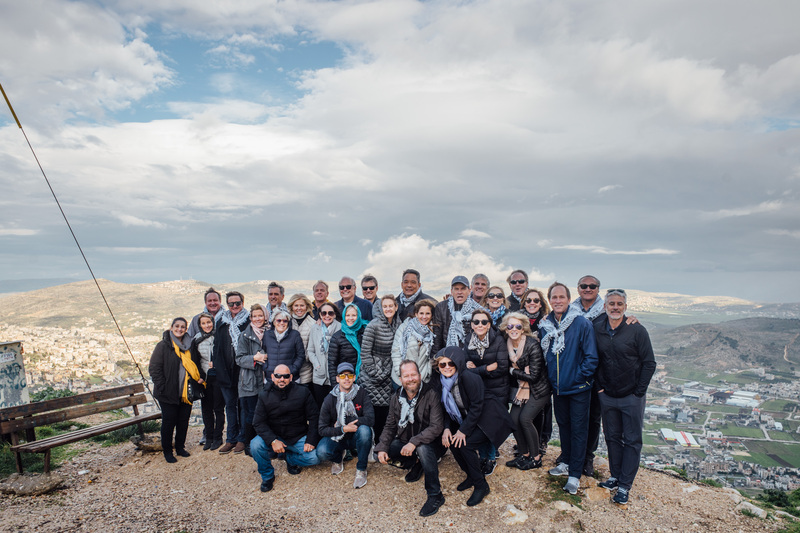 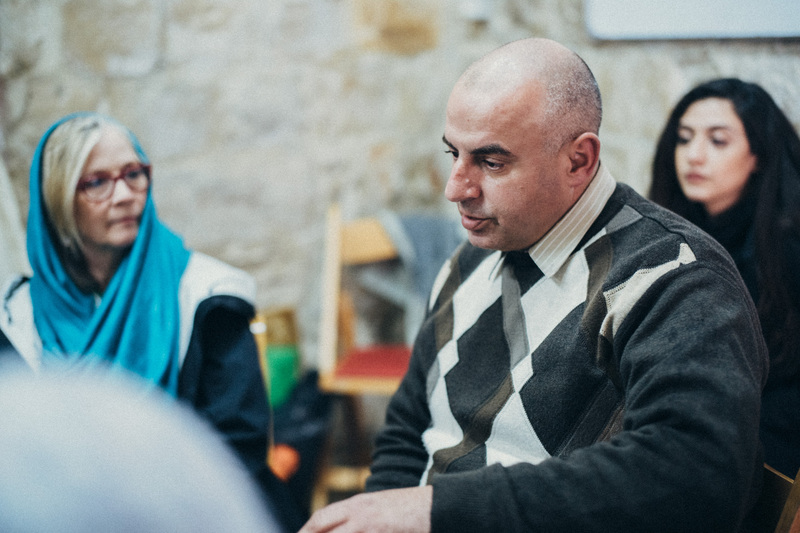 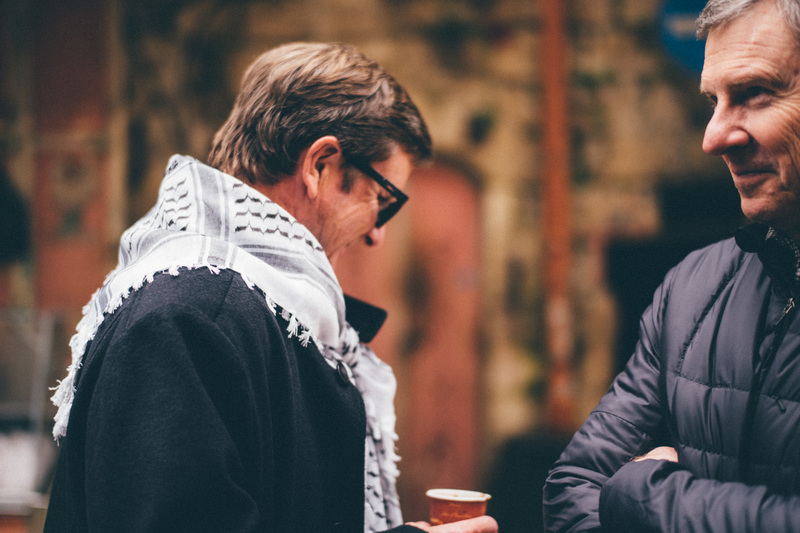 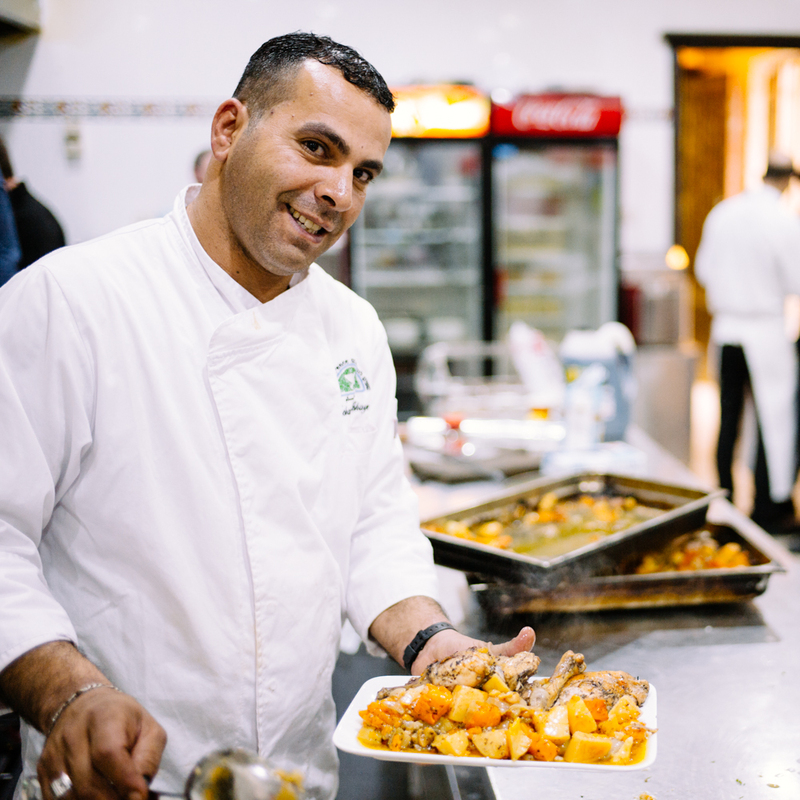 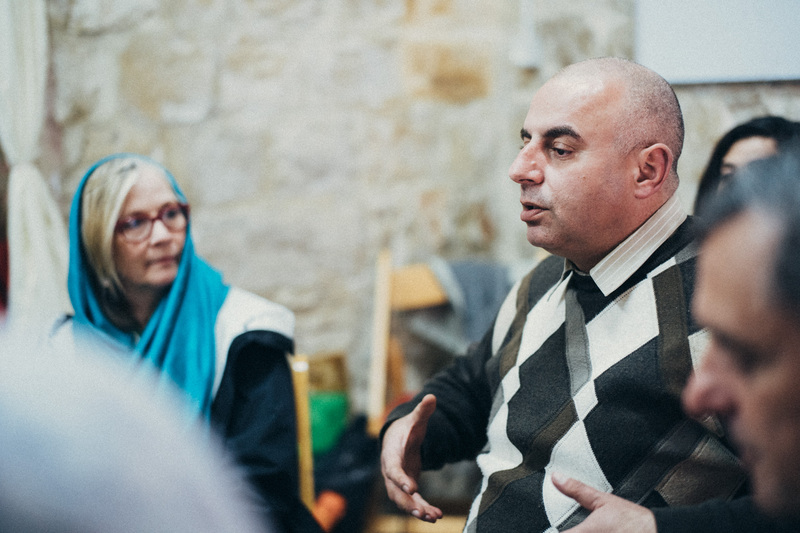 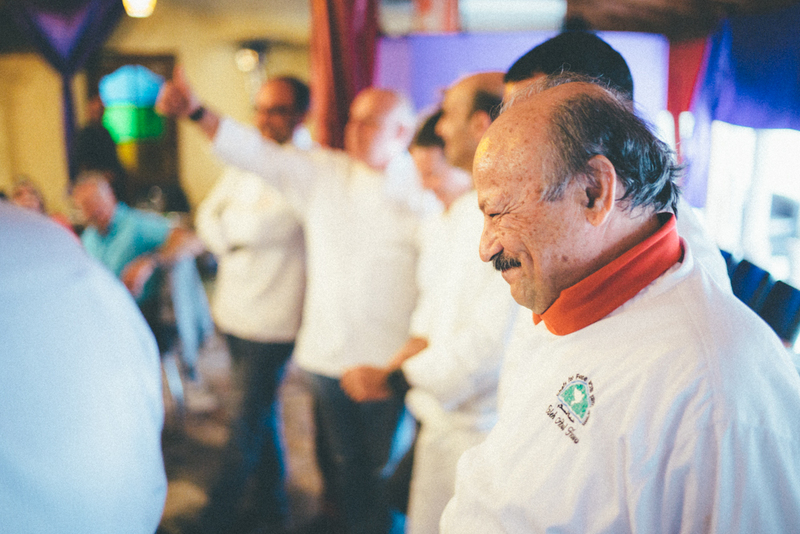 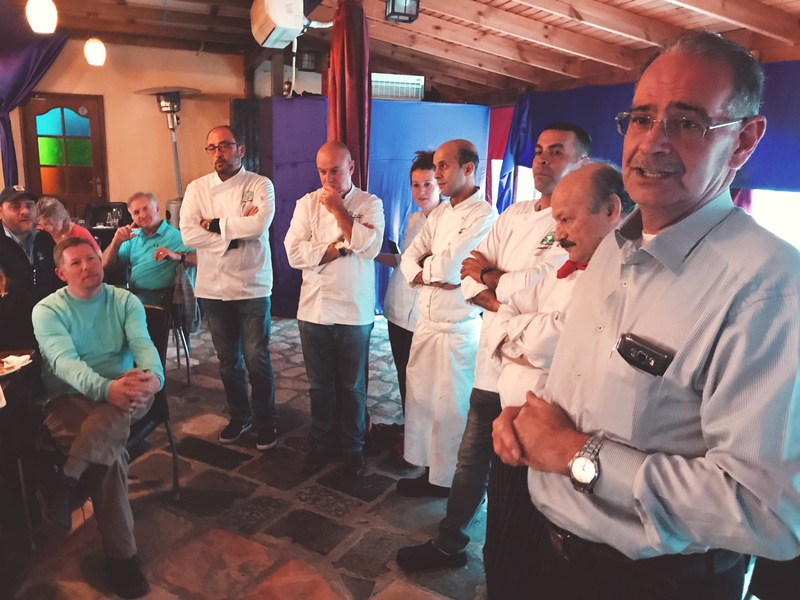 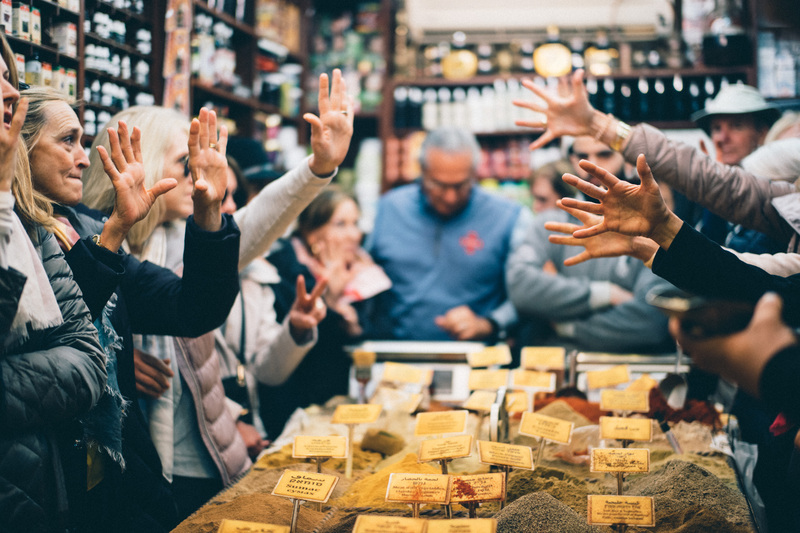 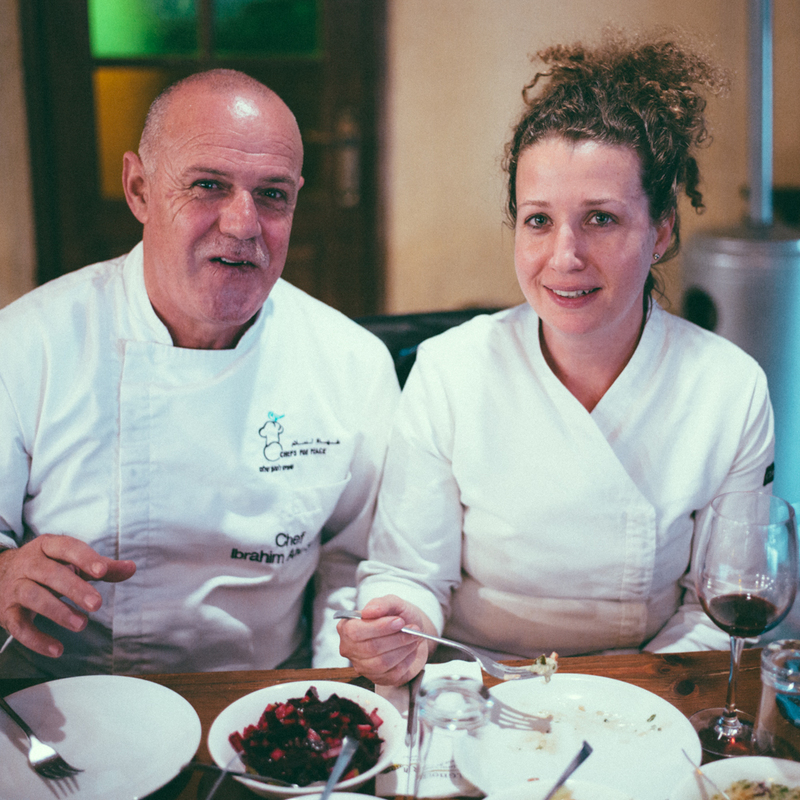 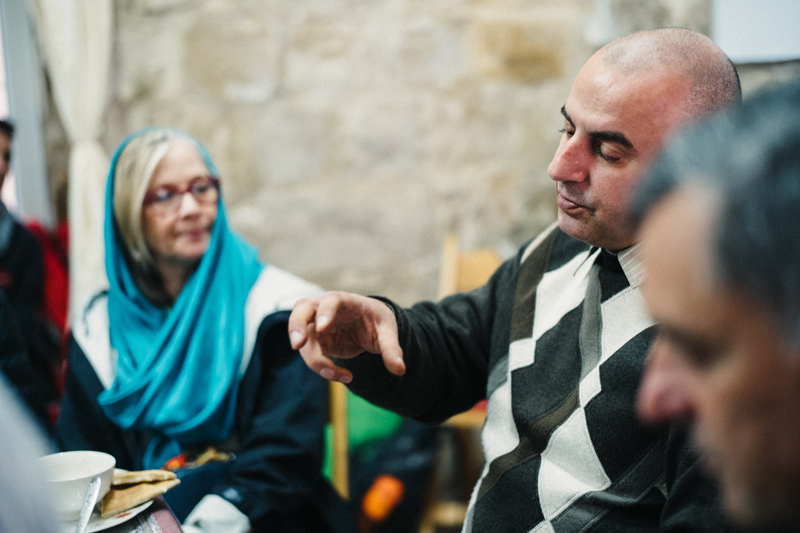 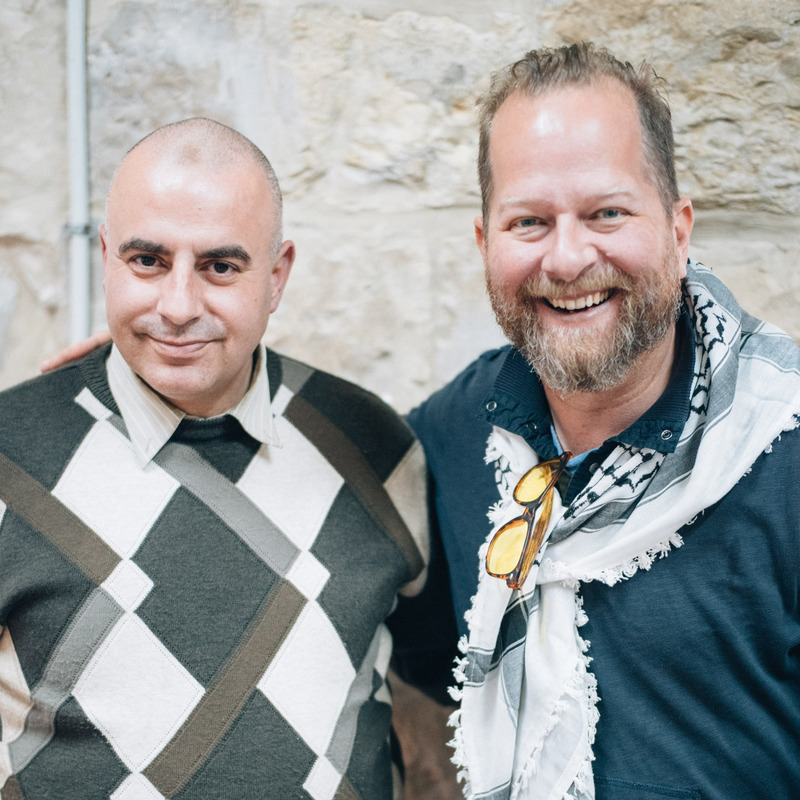 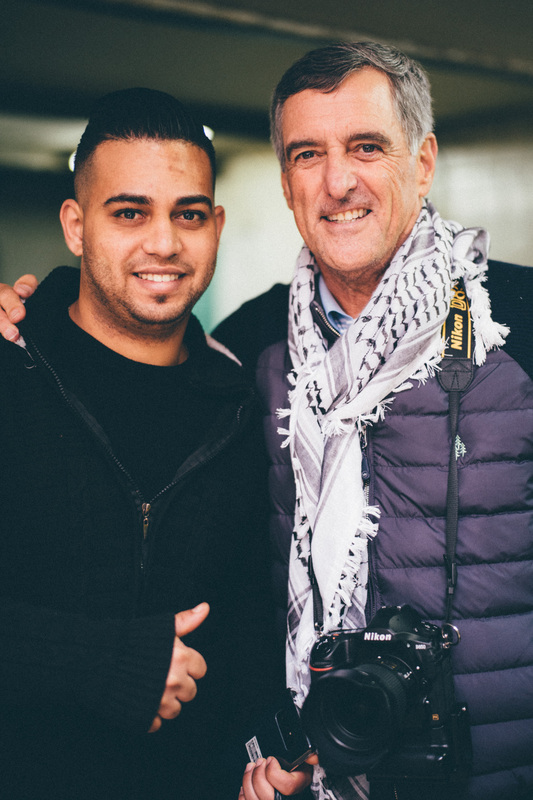 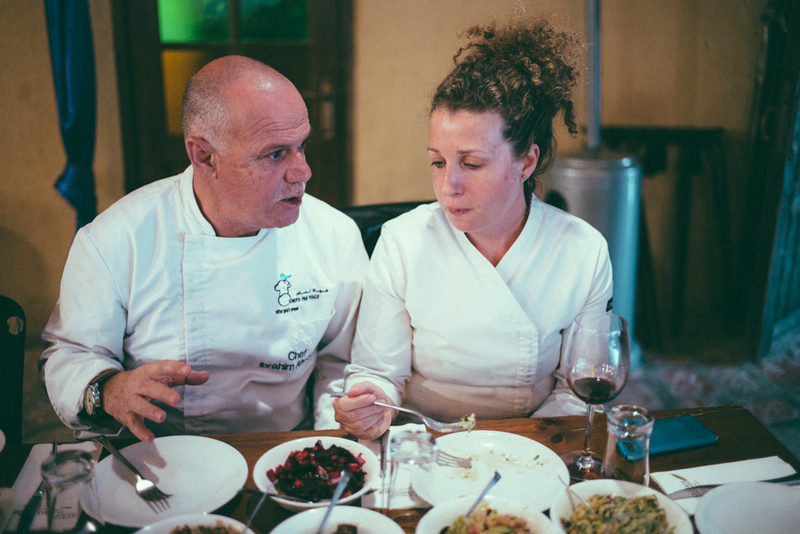 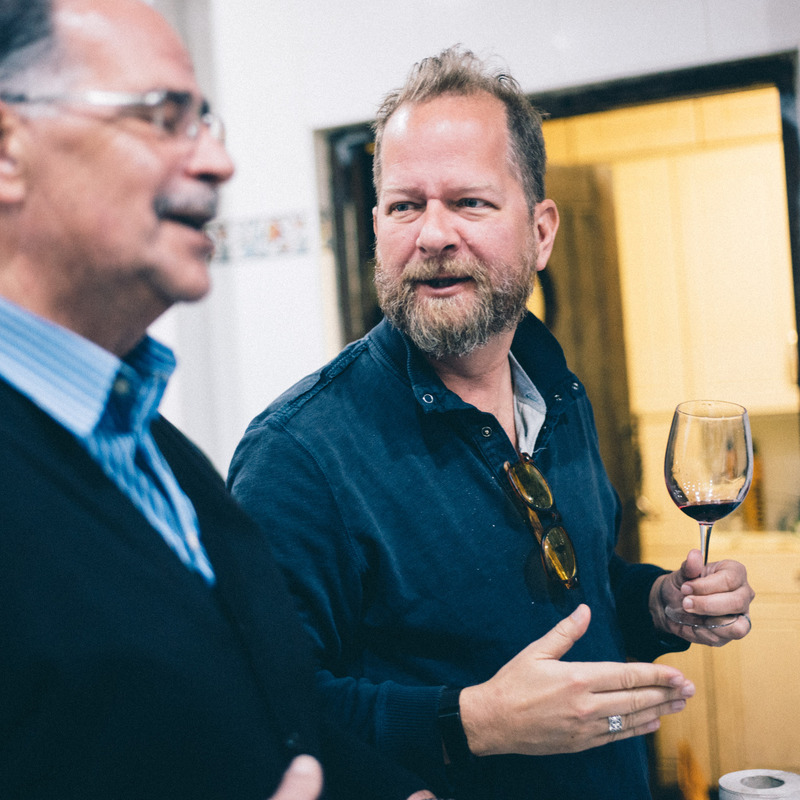 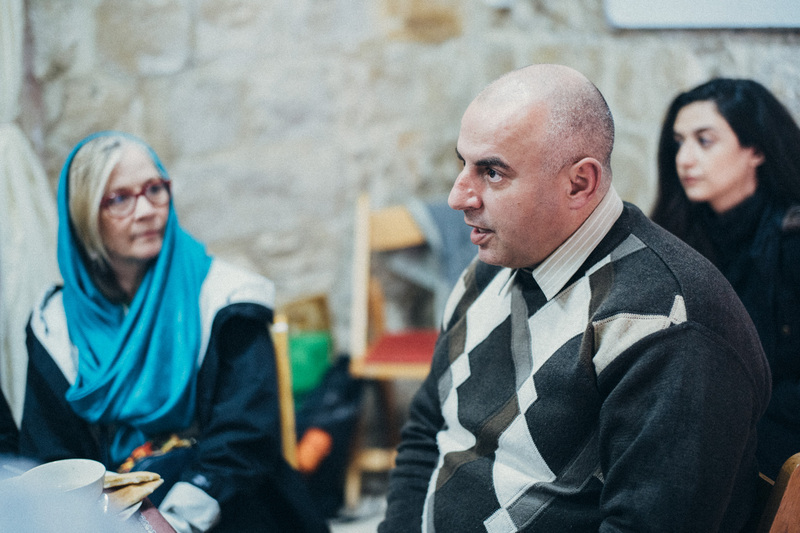 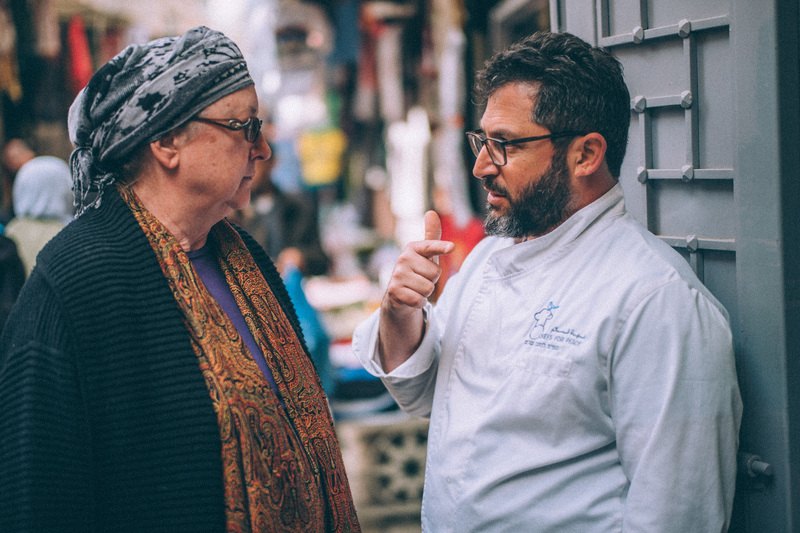 A definite highlight of our week was meeting up with Chefs for Peace, a non-profit, non-political organization founded in Jerusalem in 2001 by a group of Jewish, Christian and Muslim chefs committed to exploring cultural identity, diversity and peaceful coexistence through food. 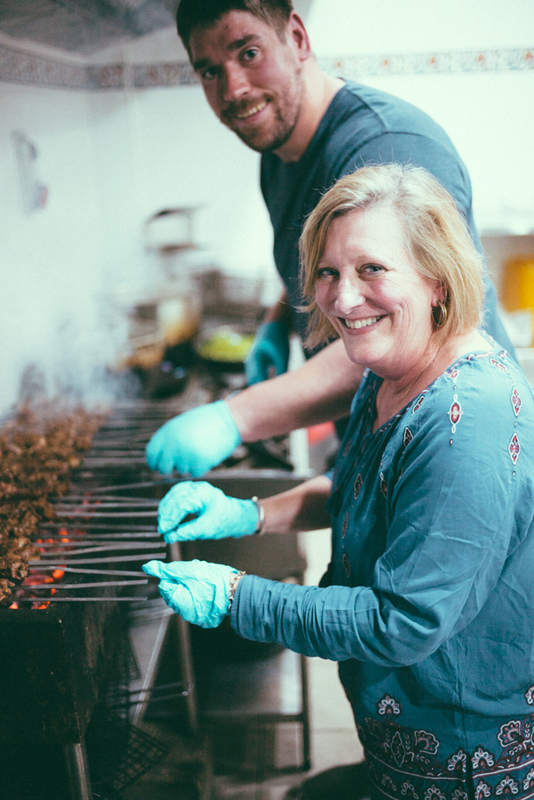 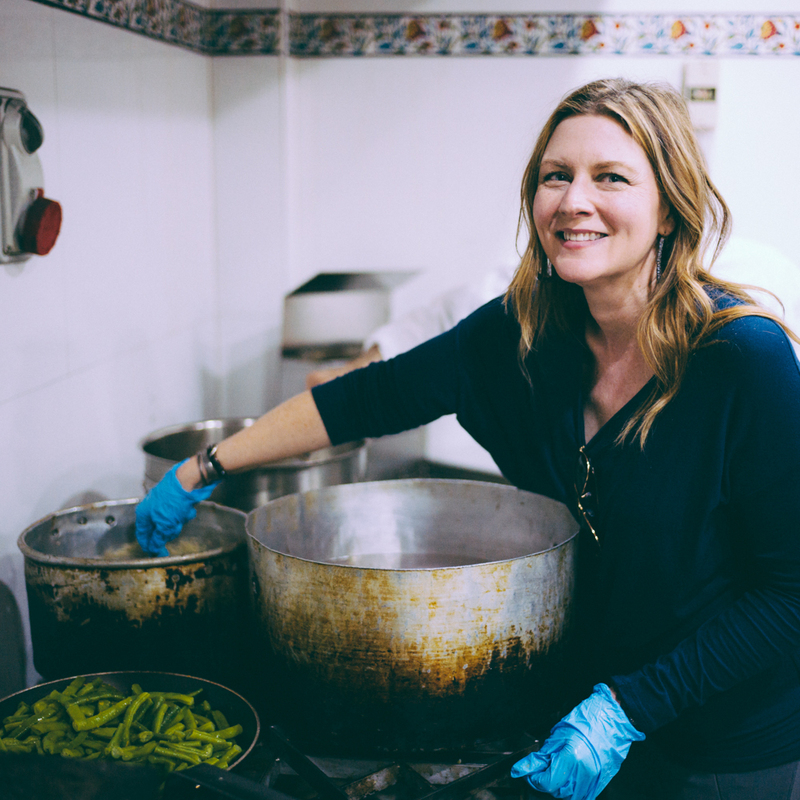 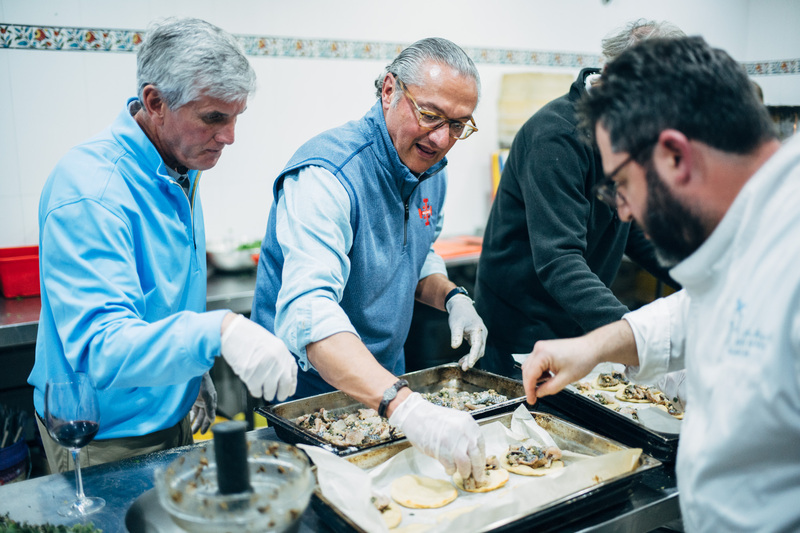 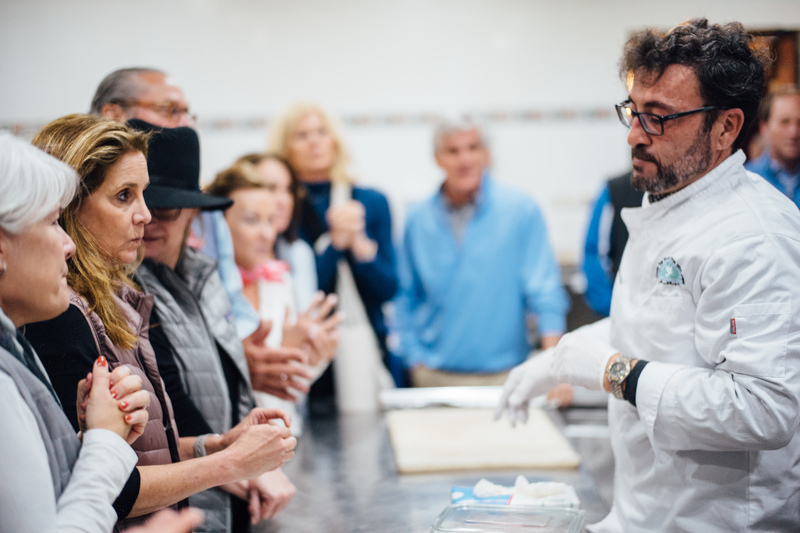 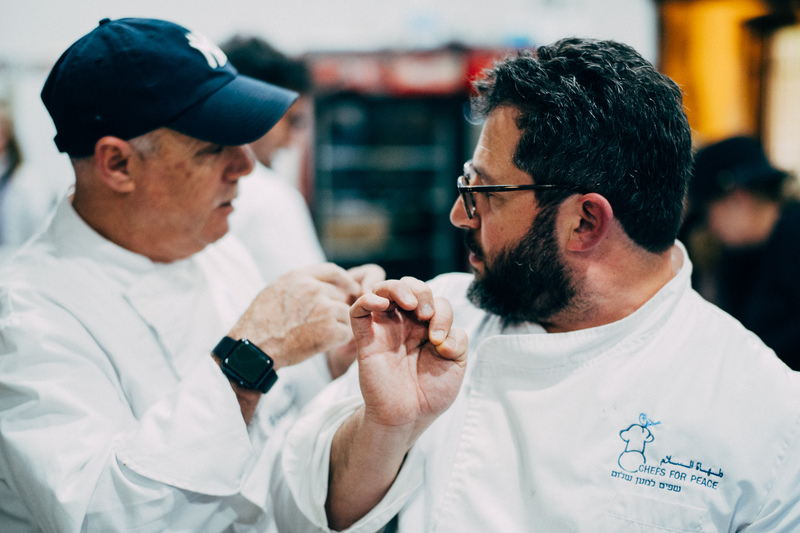 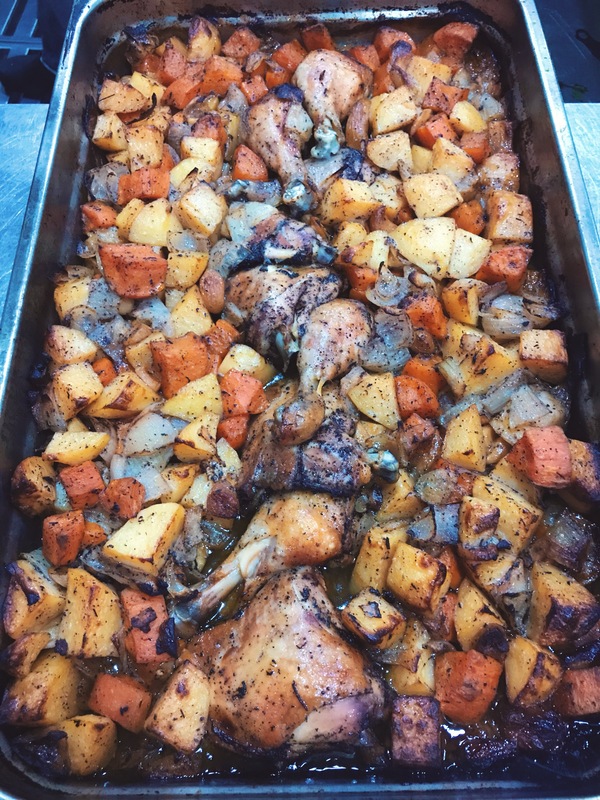 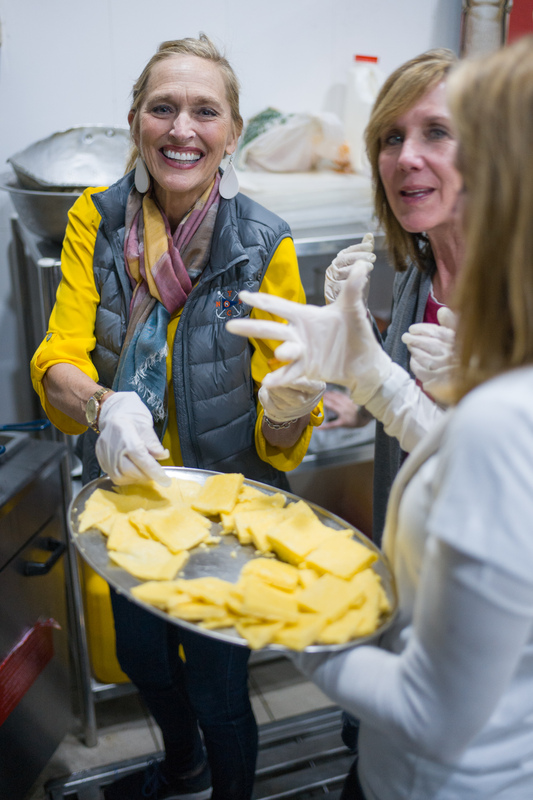 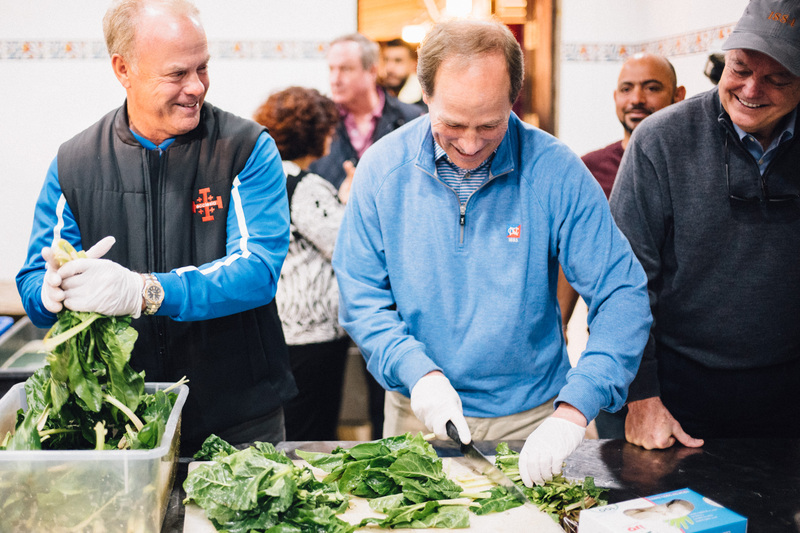 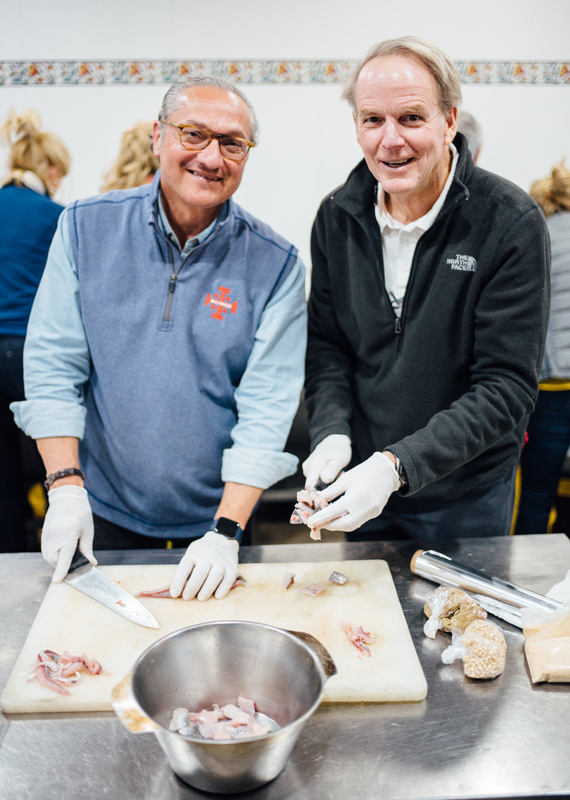 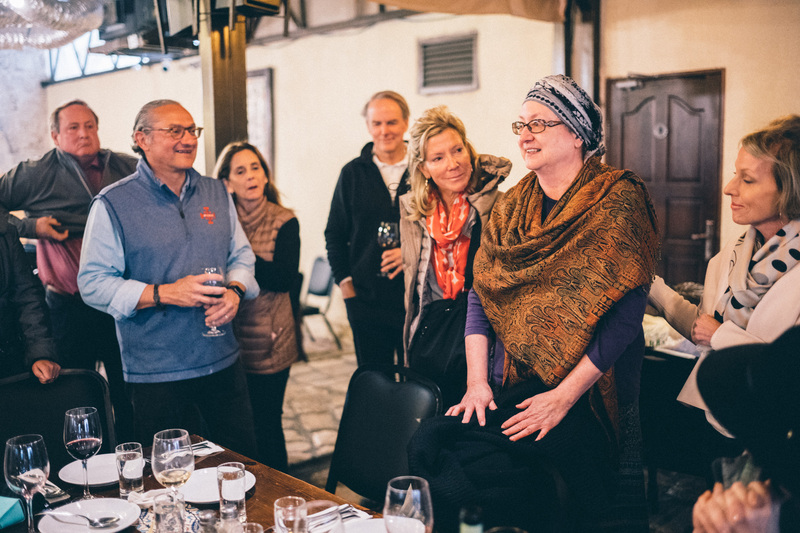 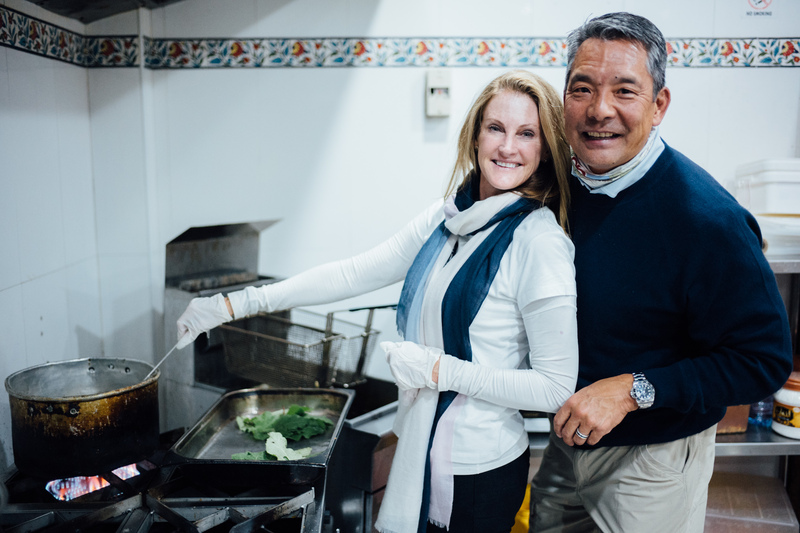 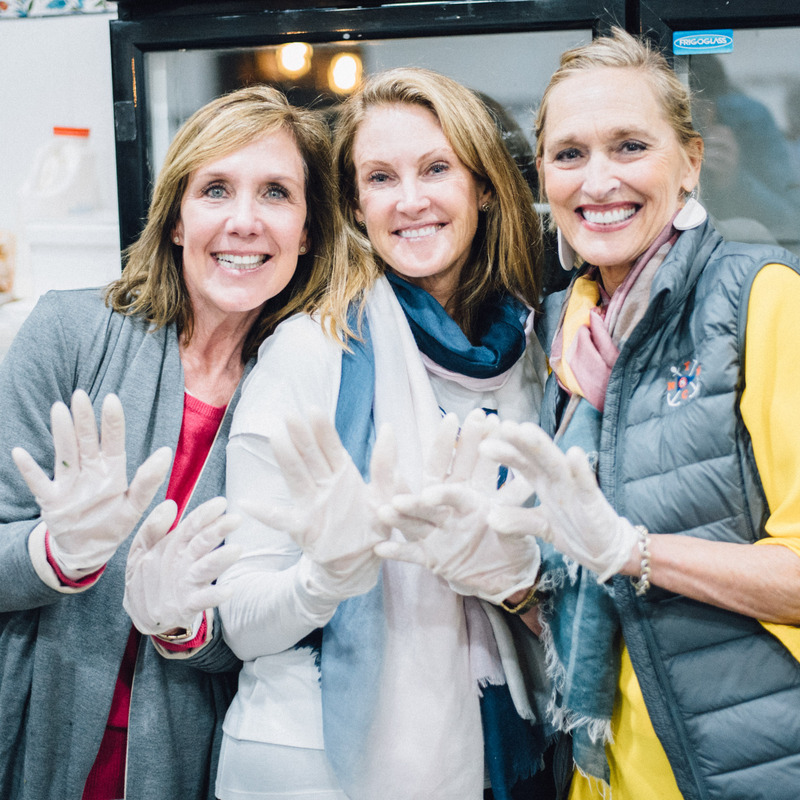 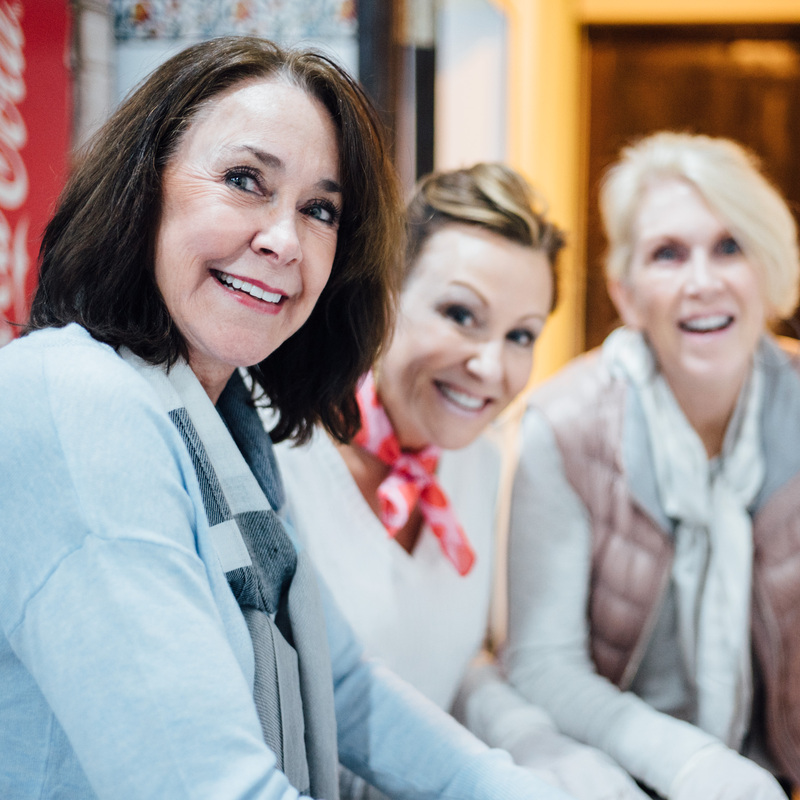 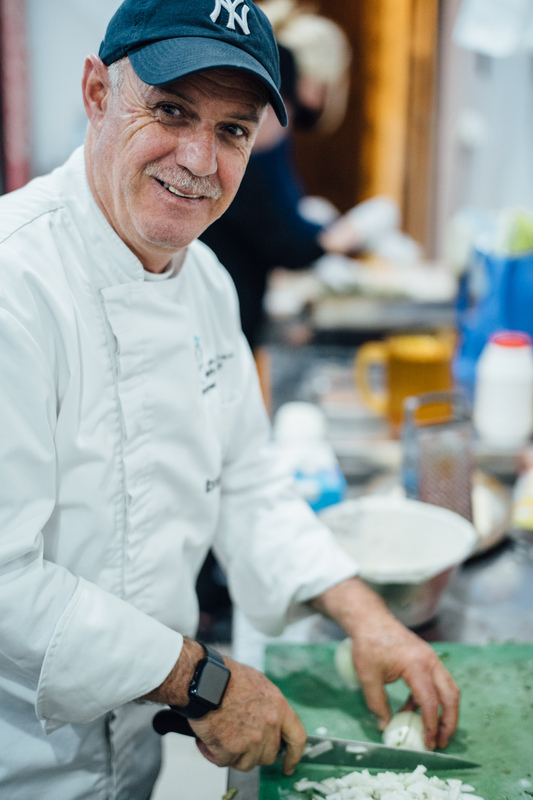 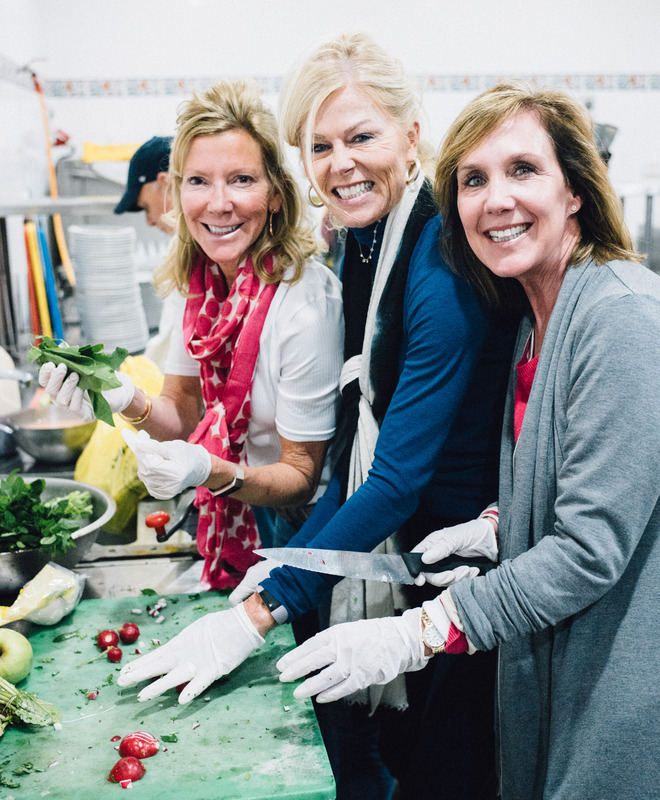 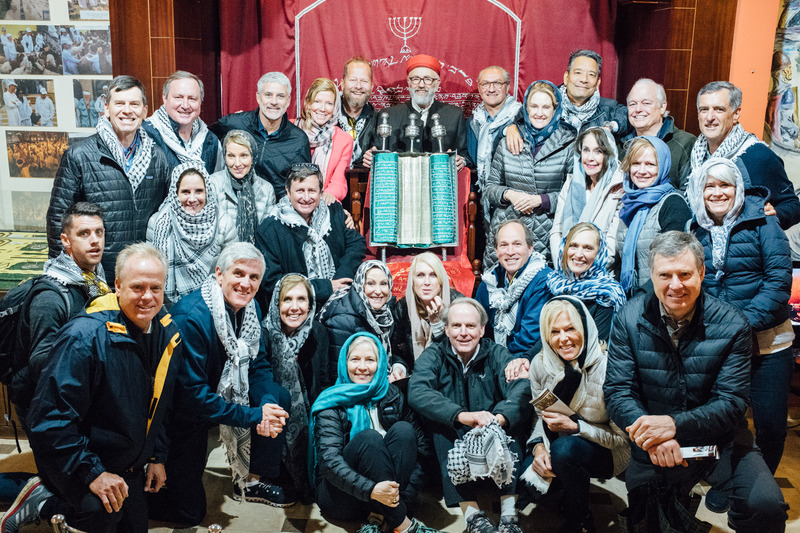 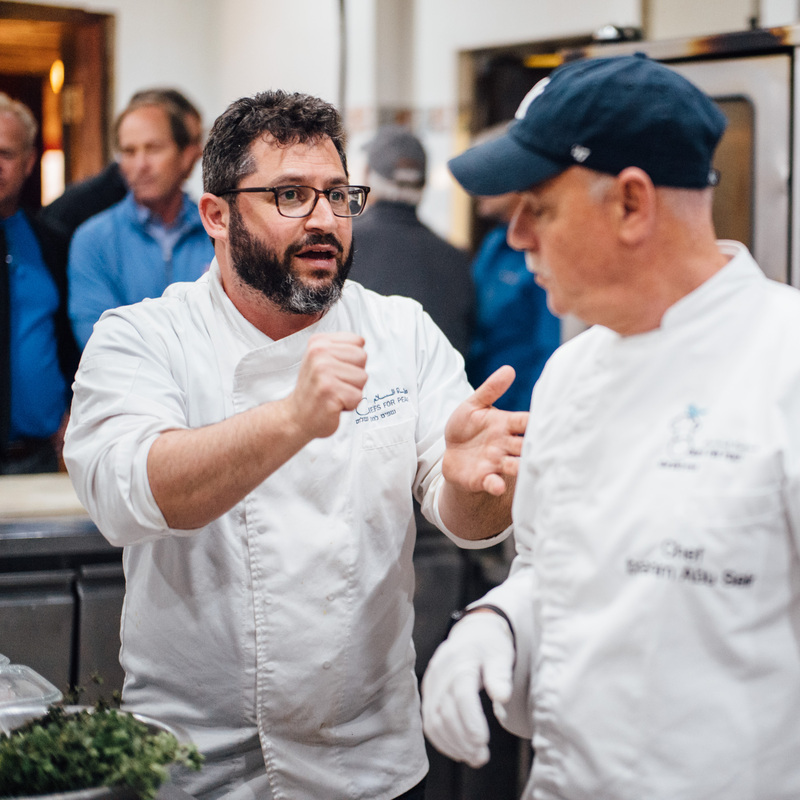 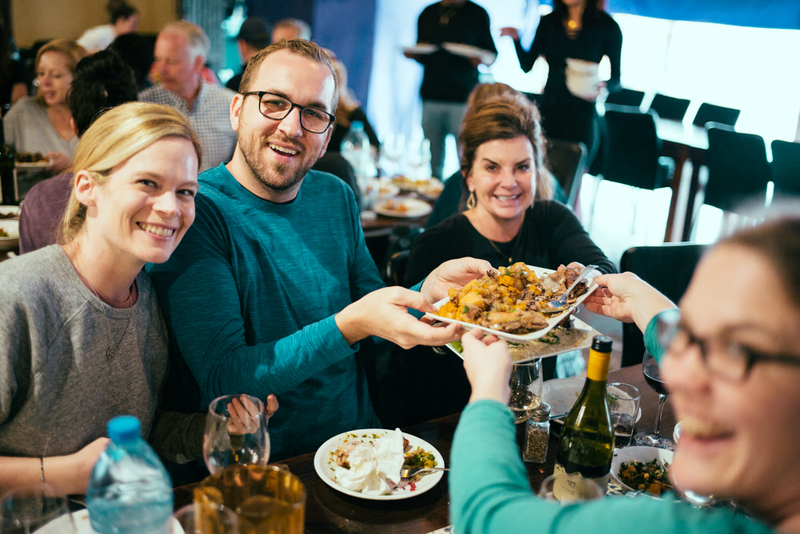 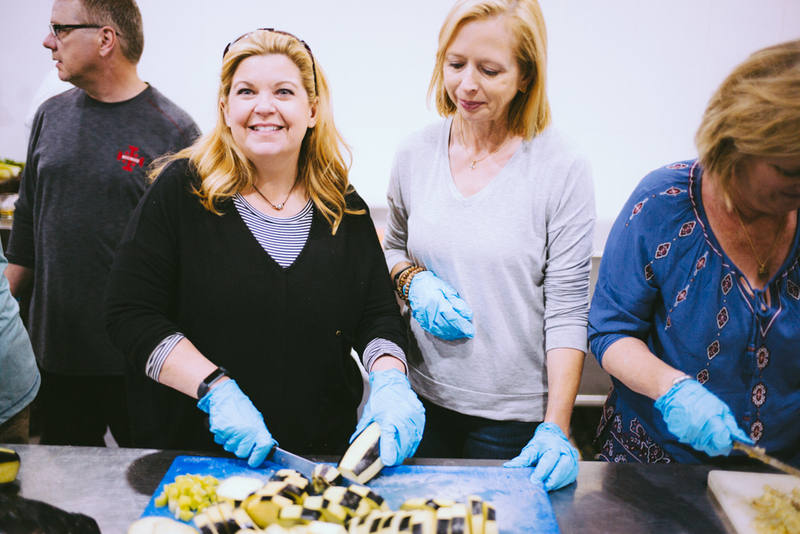 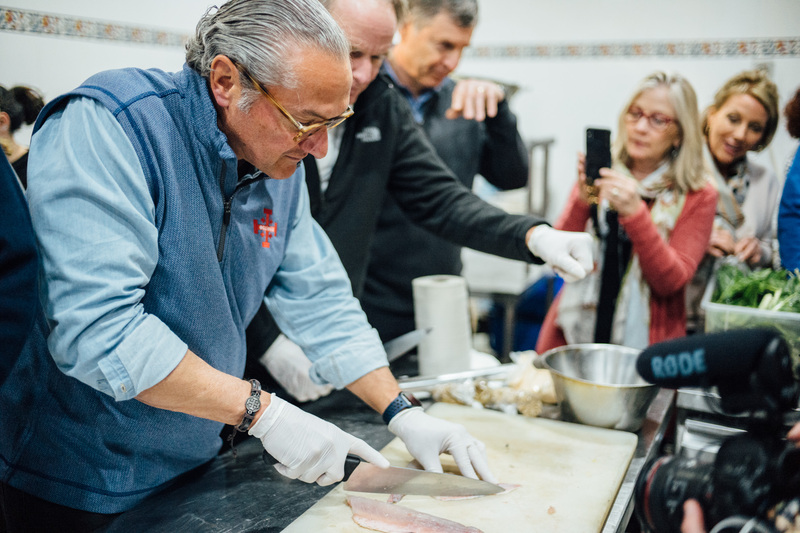 Chefs for Peace realizes food— its preparation, sharing, and enjoyment— is a powerful means of creating a bond with others and revealing that which is valued by all three faiths: food, family and friends. 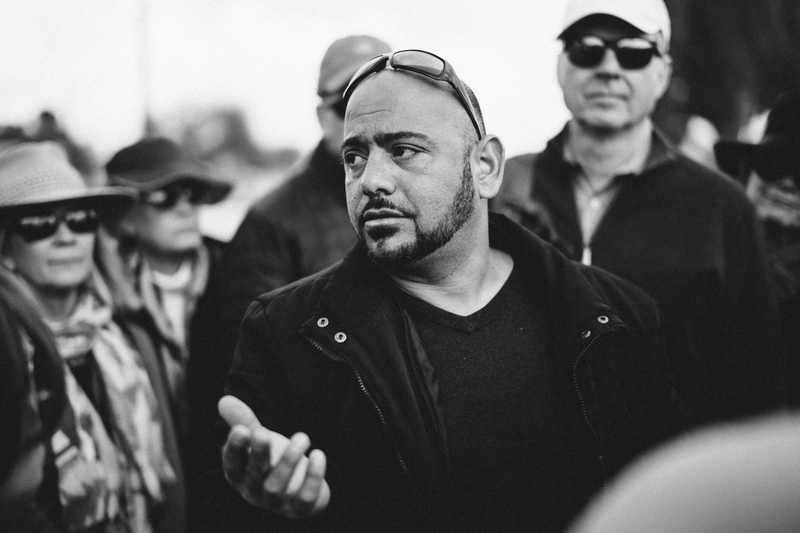 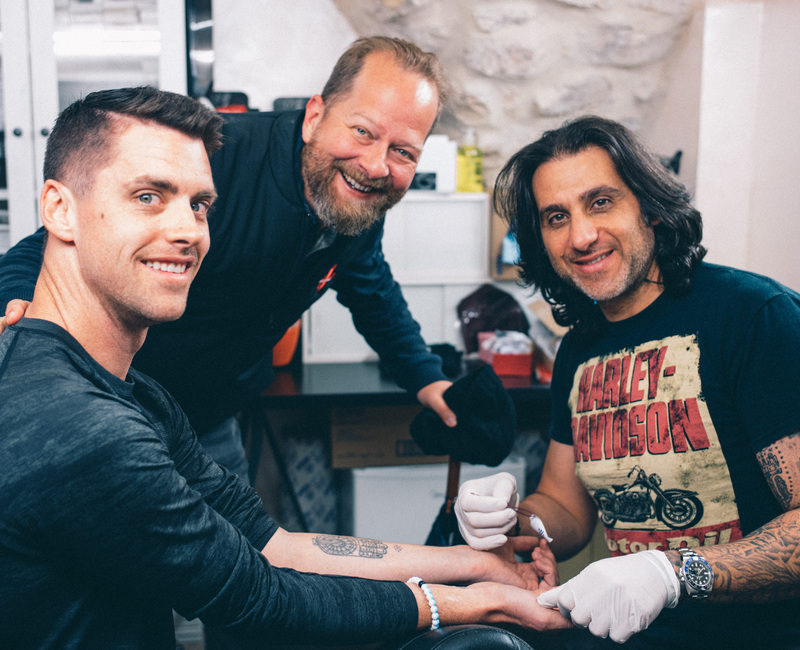 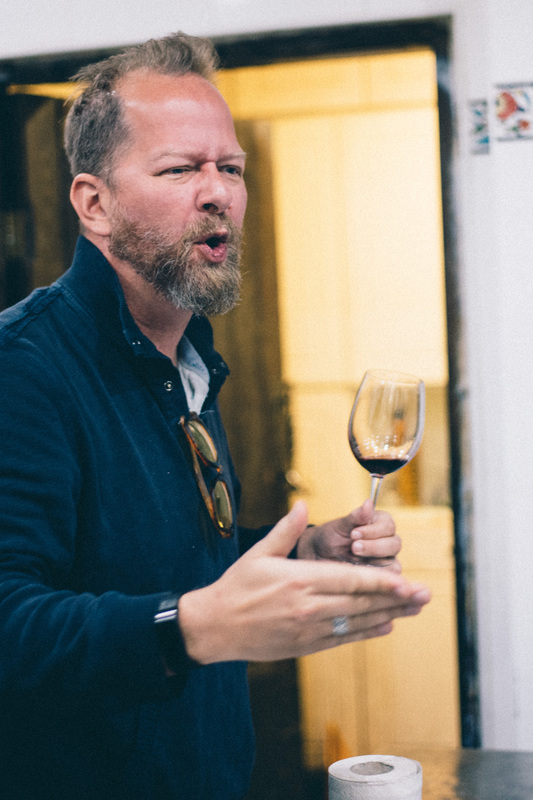 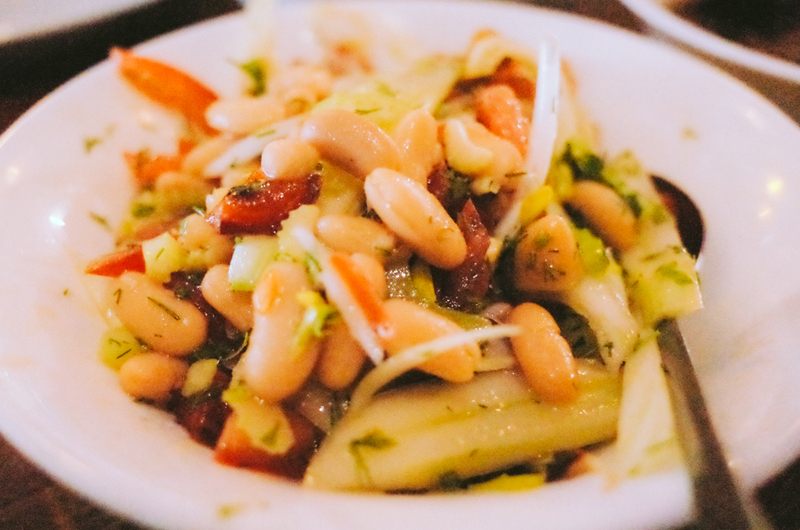 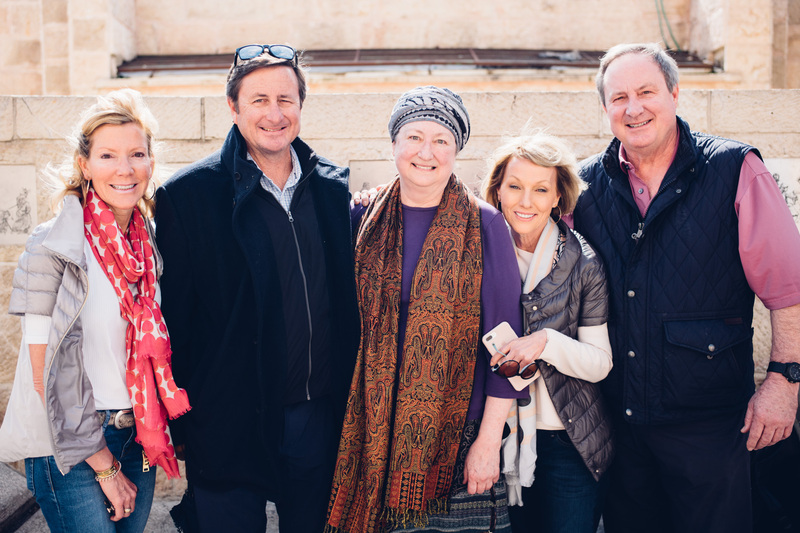 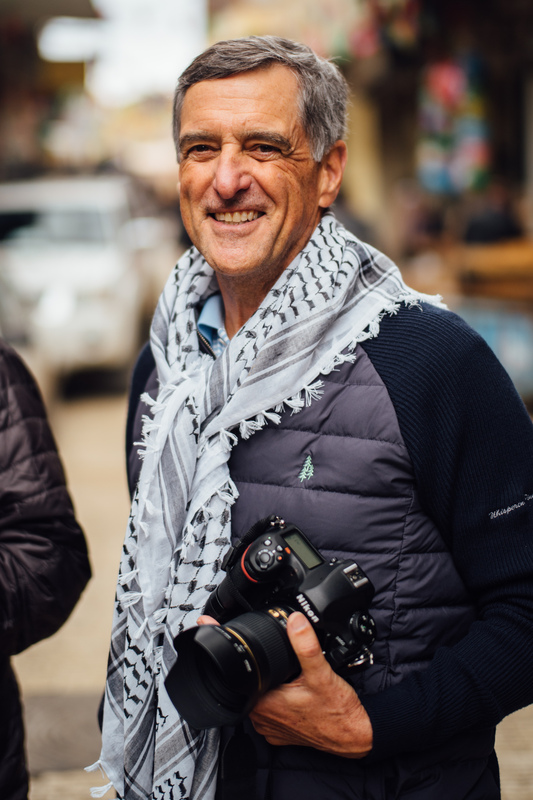 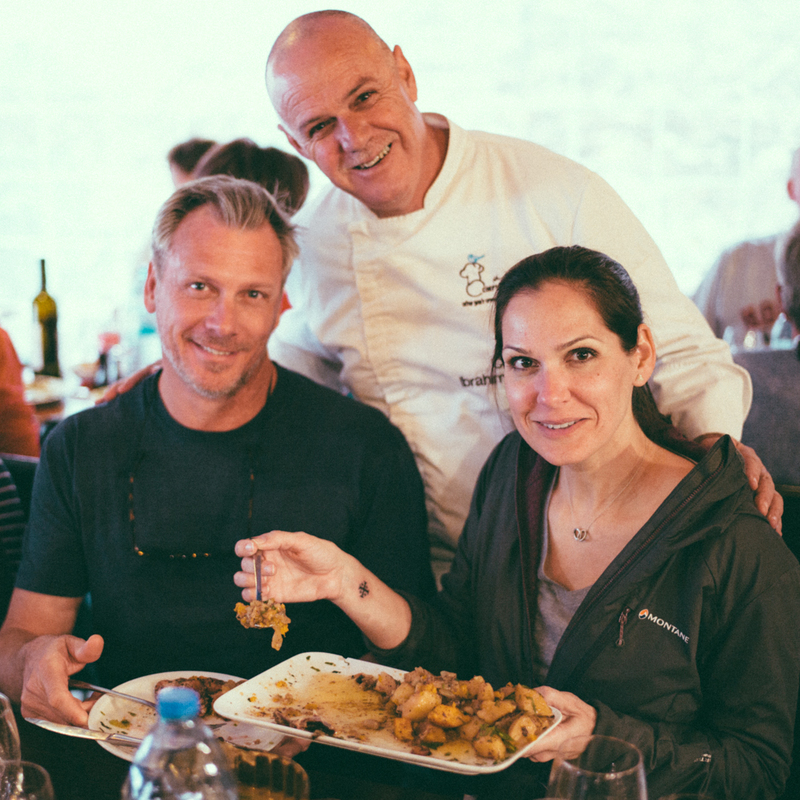 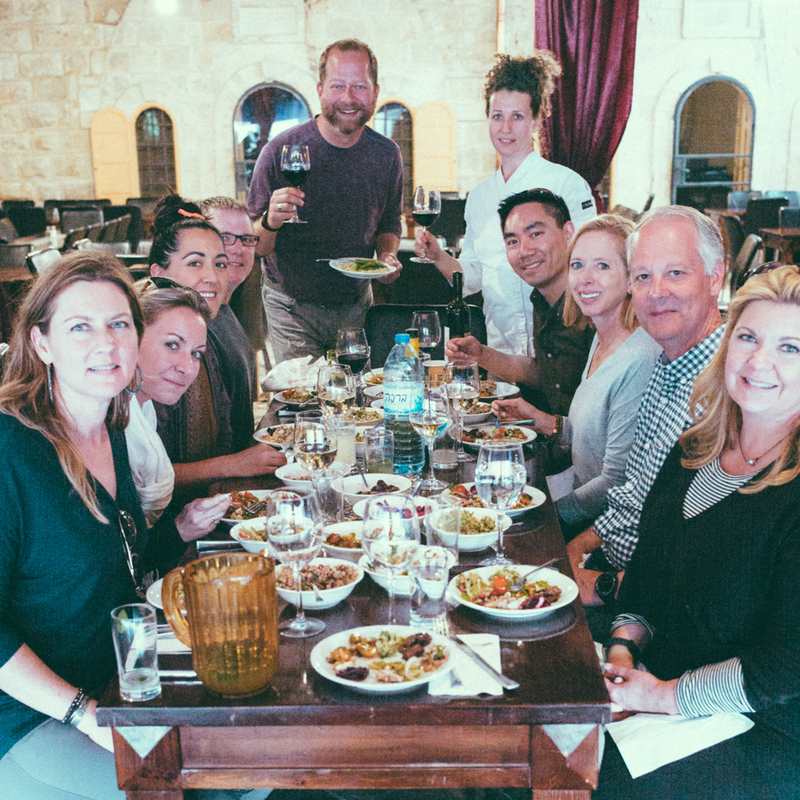 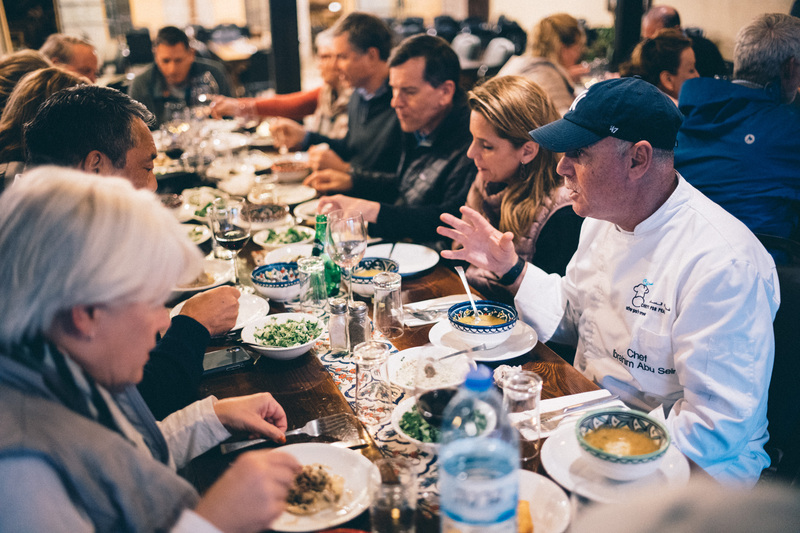 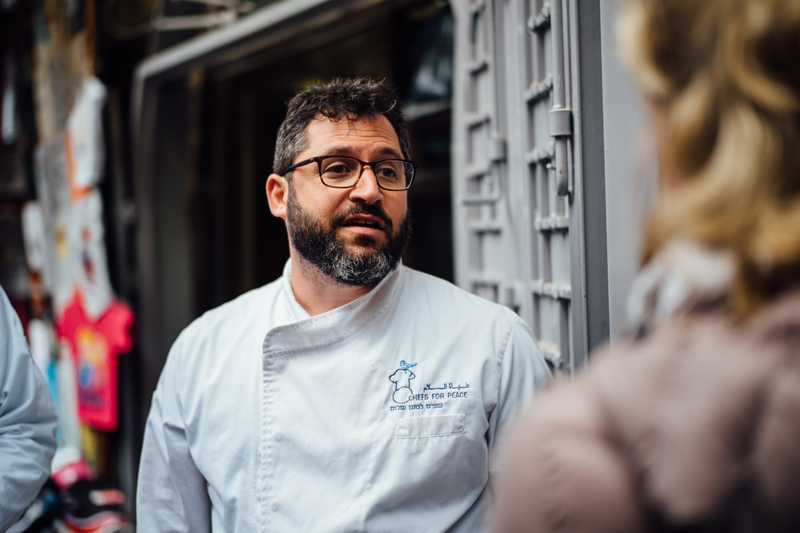 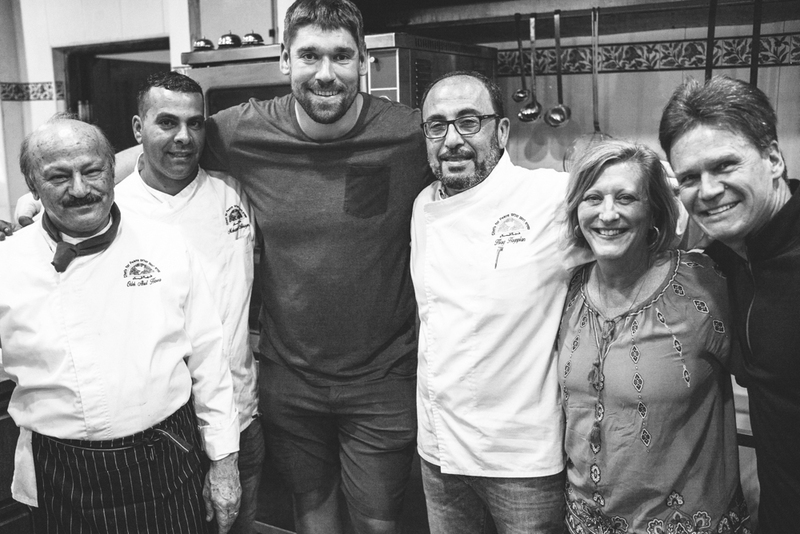 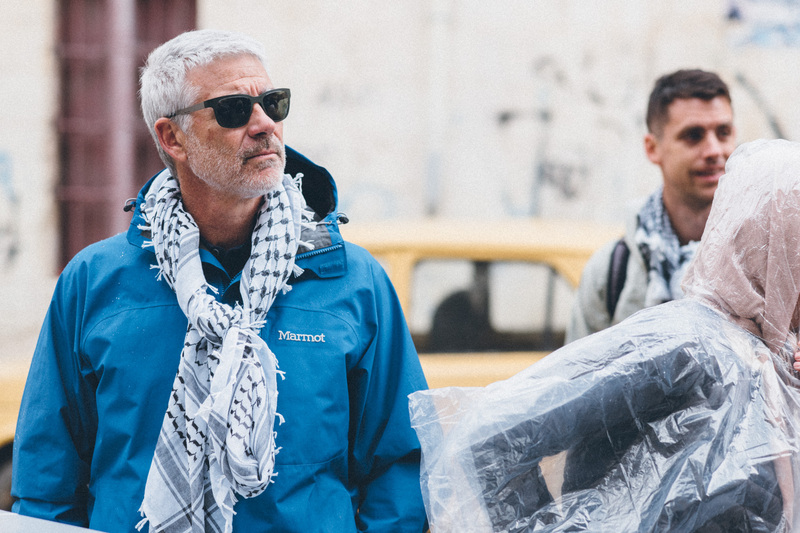 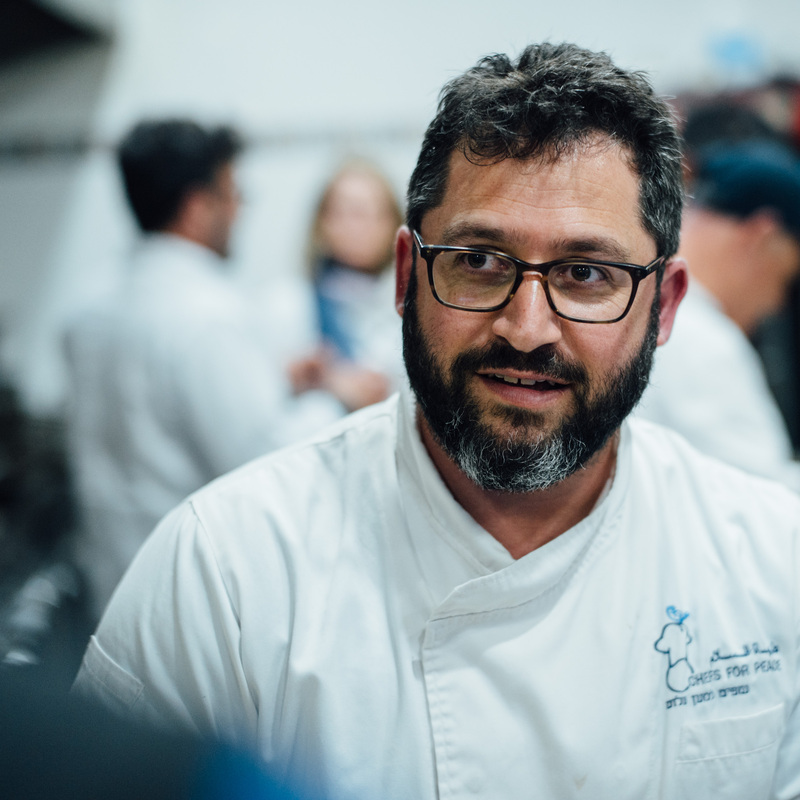 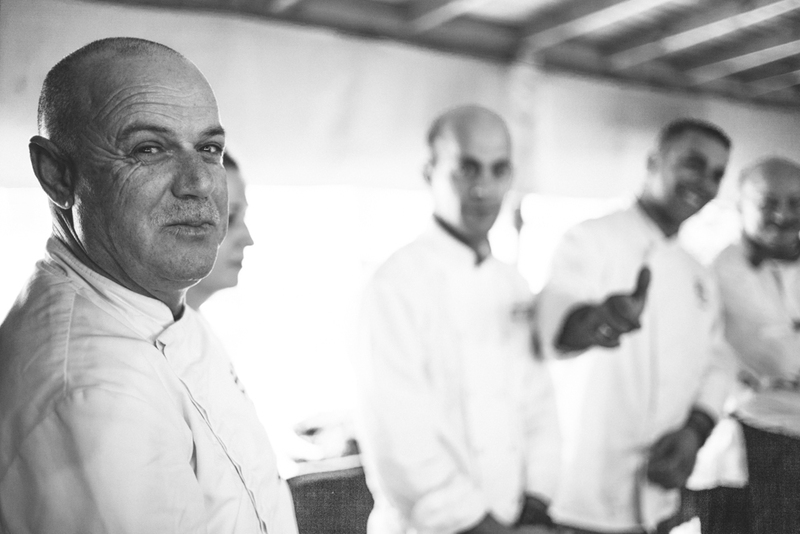 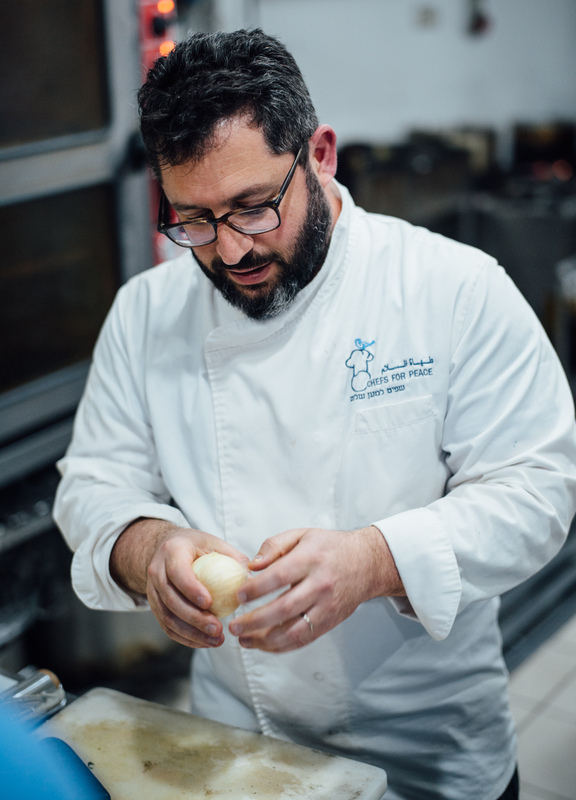 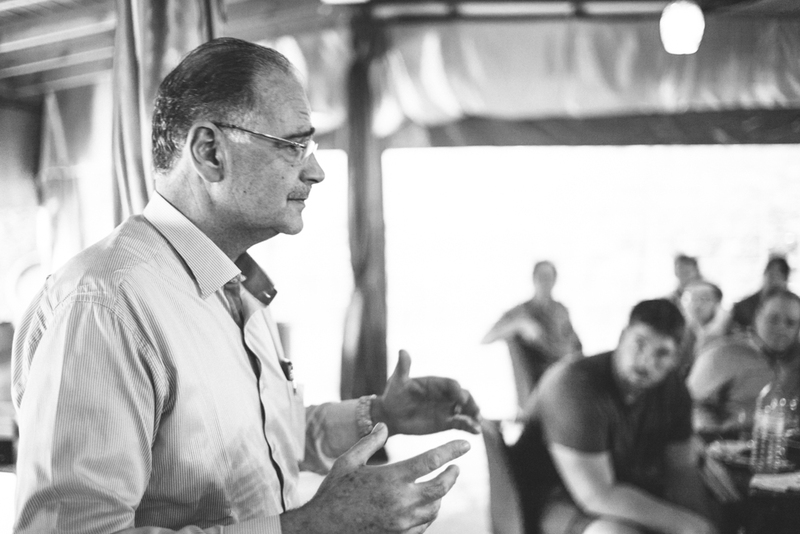 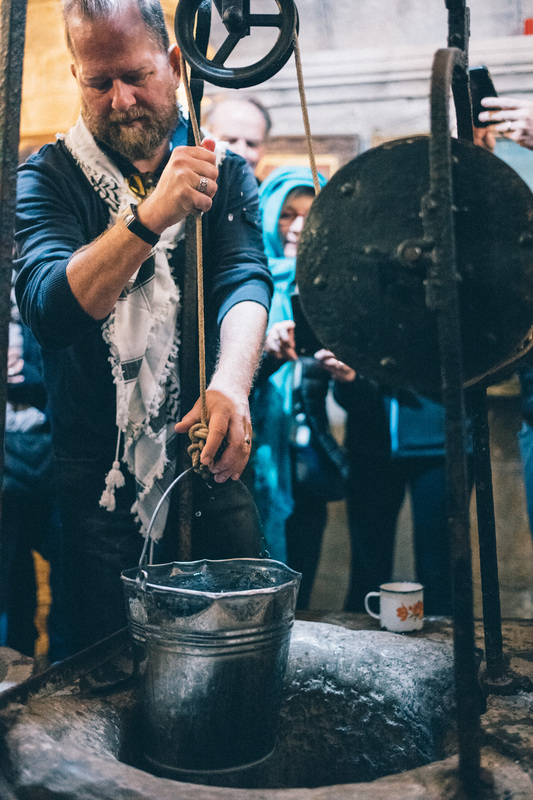 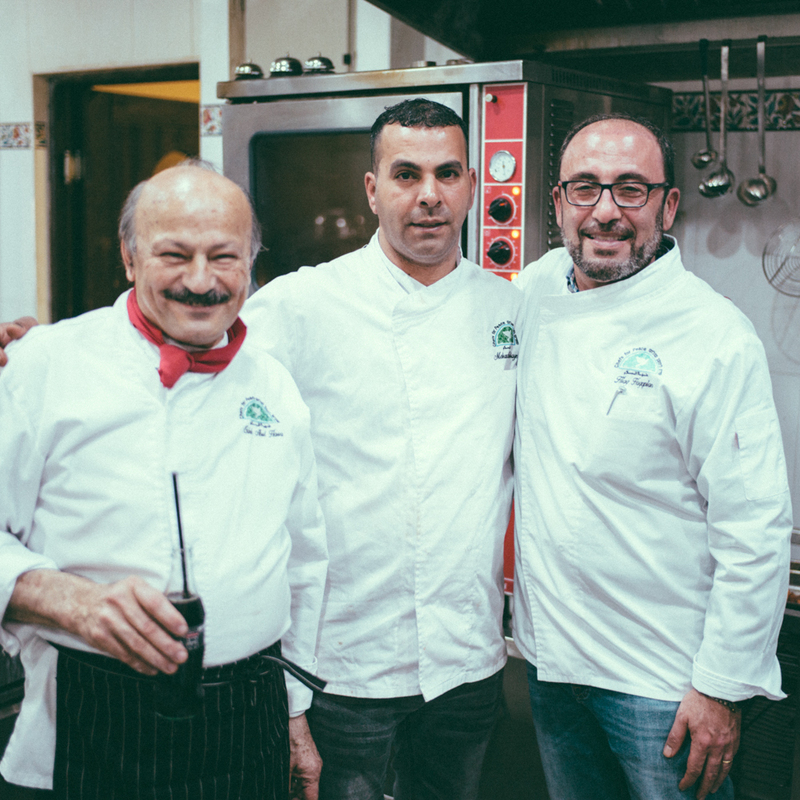 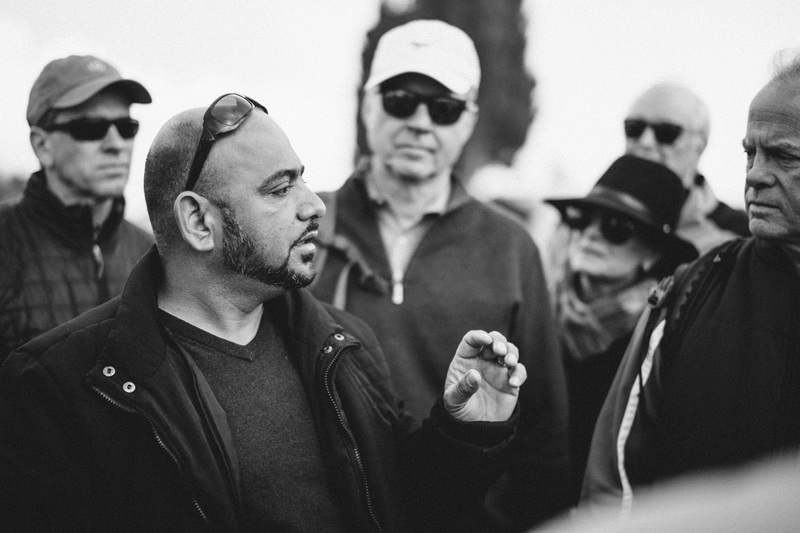 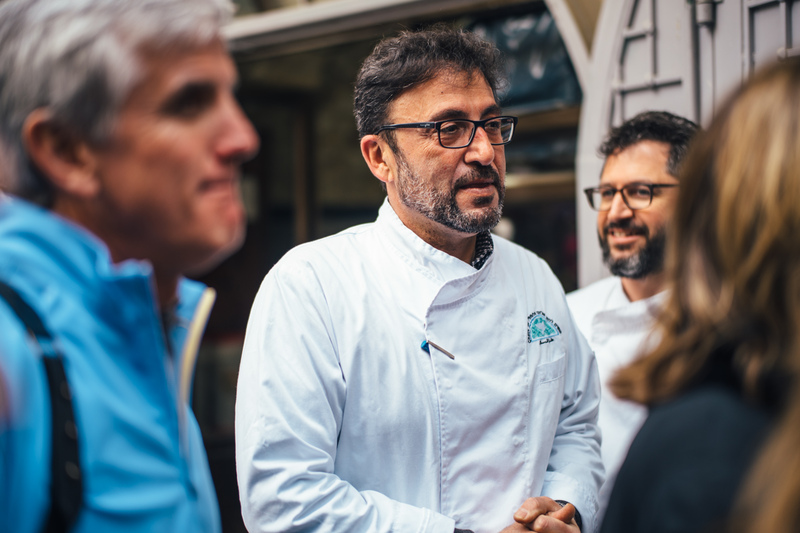 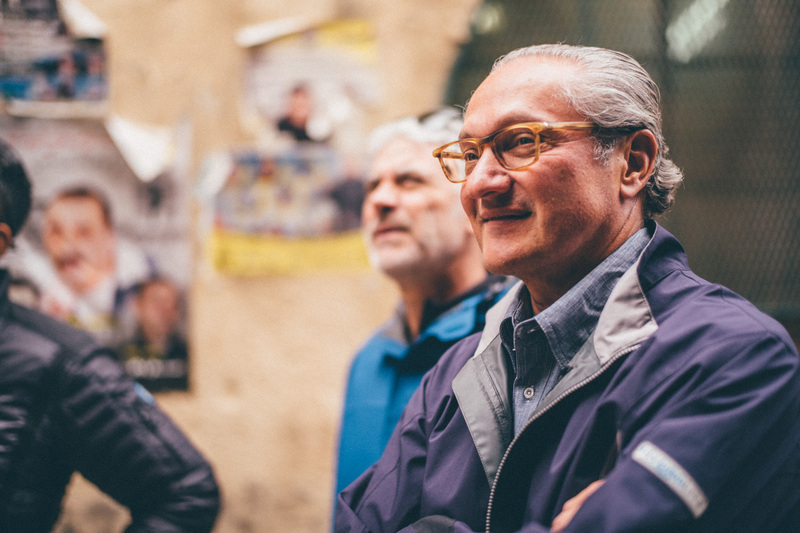 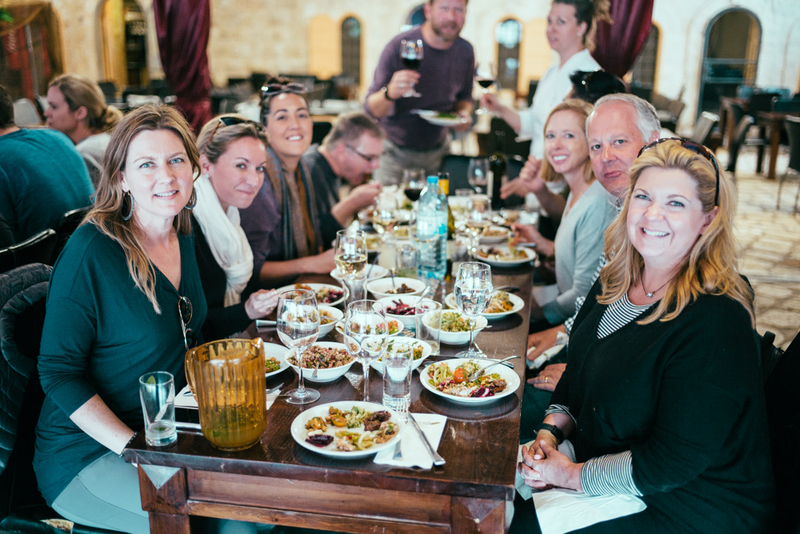 After a morning of free time recovering from our epic road trip the day before, we met the chefs at the Jaffa Gate on Thursday along with the founder of Chefs for Peace, the Armenian, Jerusalem-born chef Kevork Alemian. 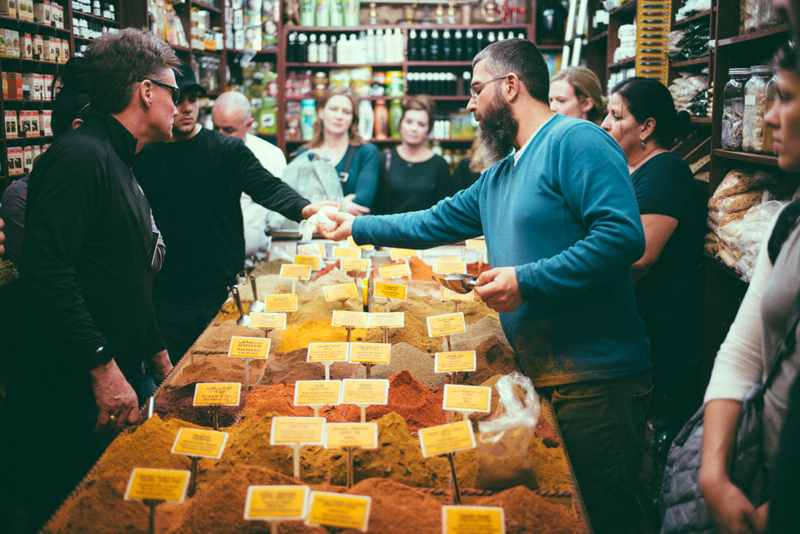 They then took us on a tour of the old city to buy the ingredients they would be using to prepare our lunch! 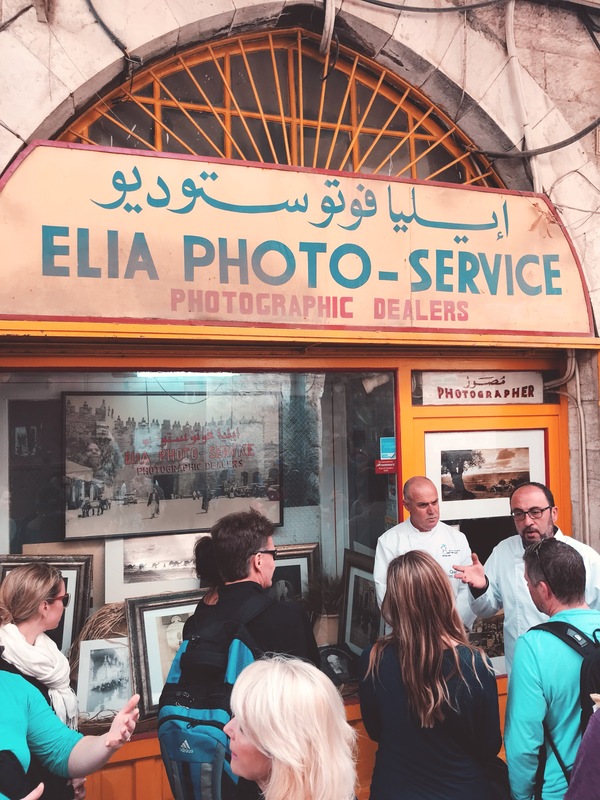 But first we visited a famous photography print shop, known as Elia’s Photo Service, the pictures this Armenian family sell are part of a collection of about 3,000 photographs taken by their late father Elia Kahvedjian, a refugee of the Armenian genocide and one of the greatest photographers in Jerusalem at the beginning of the 20th century. 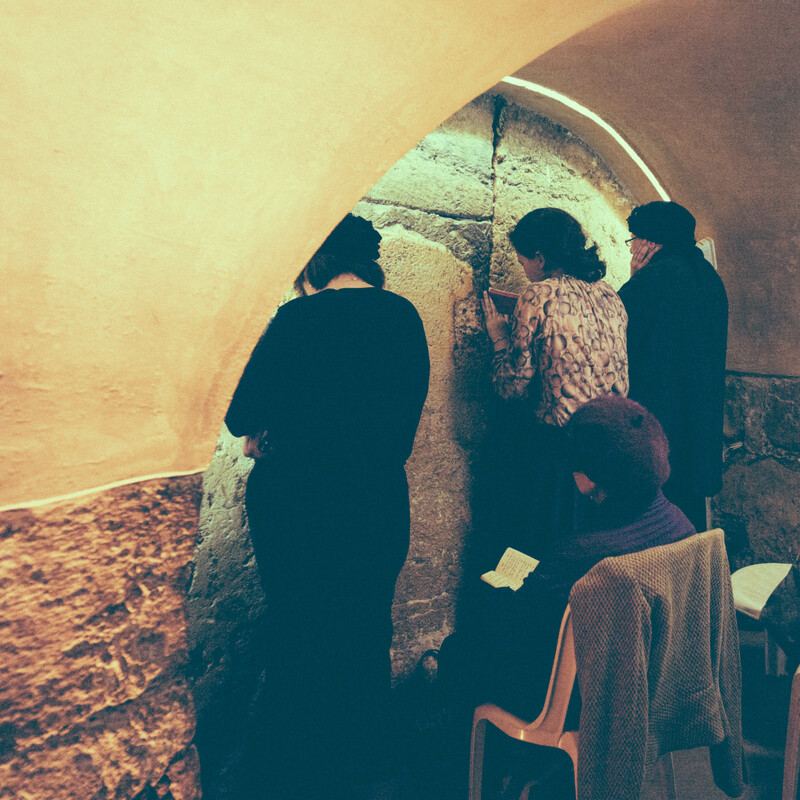 The pictures, which had been hidden away since 1947, were rediscovered by the family 30 years ago and serve to help researchers and aficionados of Jerusalem probe its past. 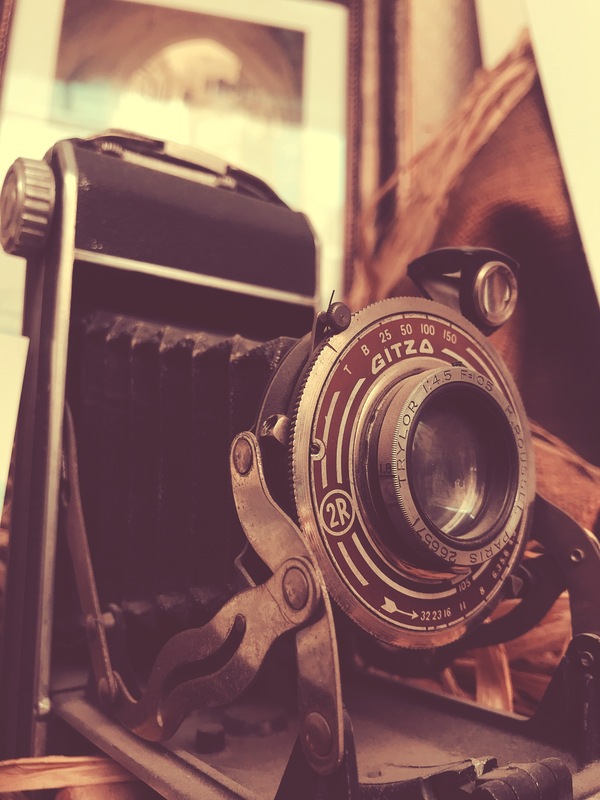 For a fascinating article on the importance of the photographs, you can read this article. 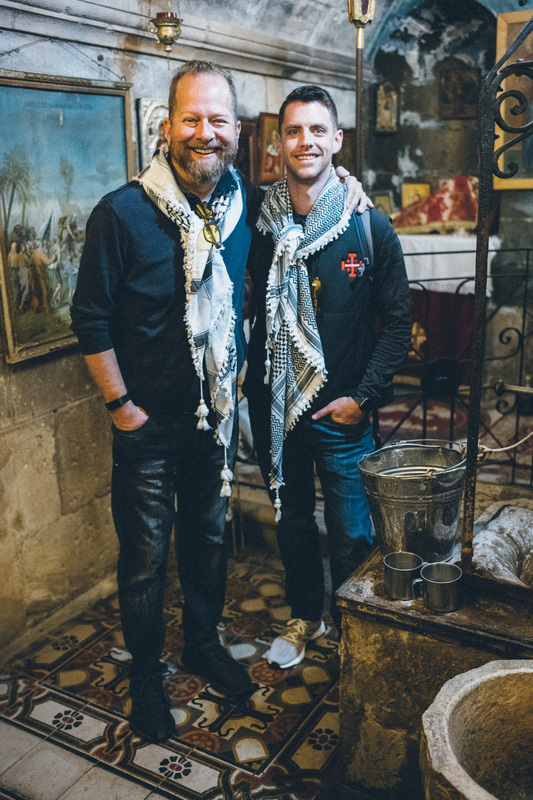 Several of us bought his book, Jerusalem Through My Father’s Eyes, which is a rare and beautiful collector’s item. 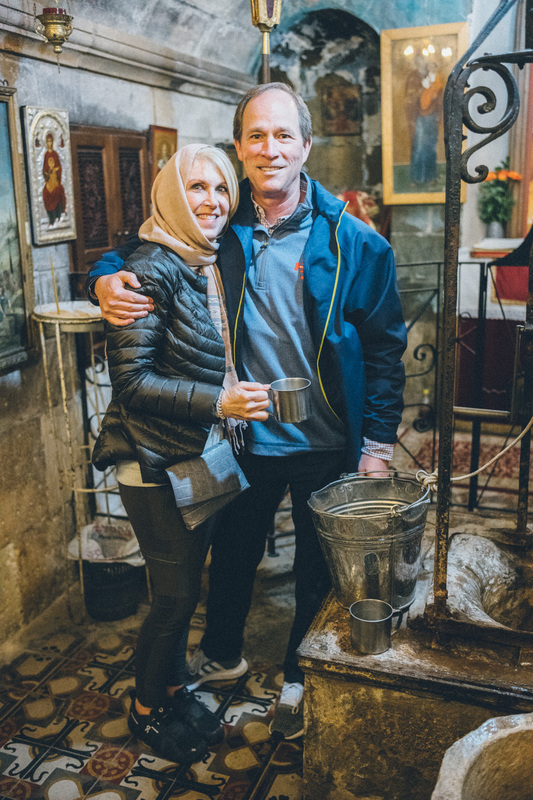 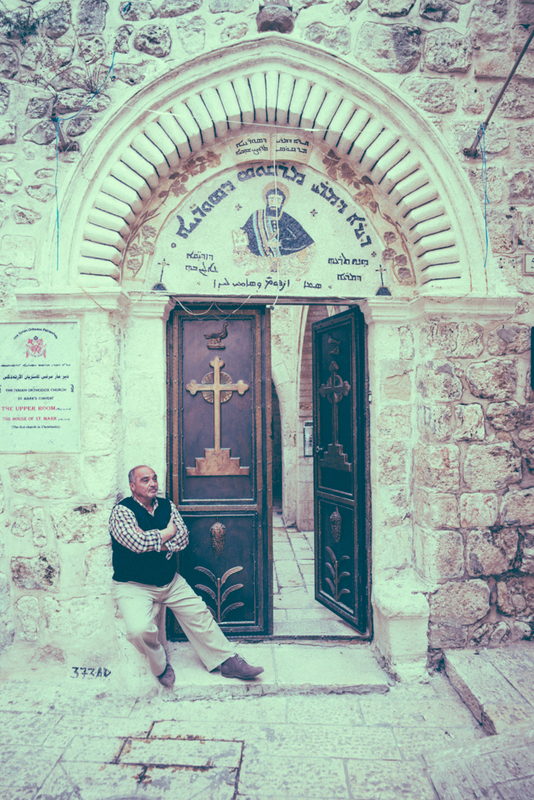 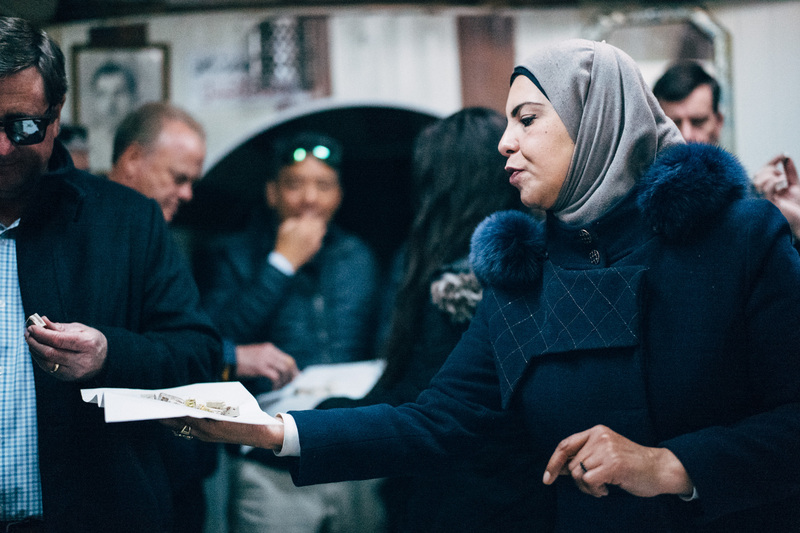 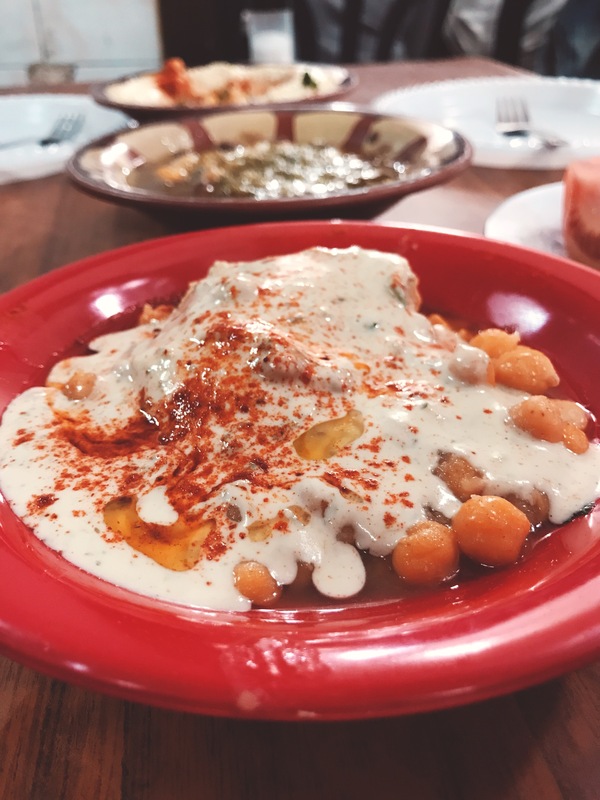 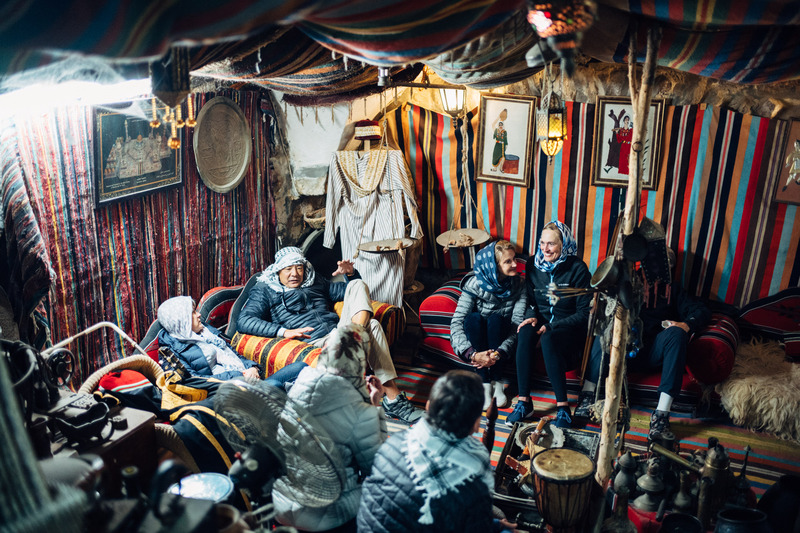 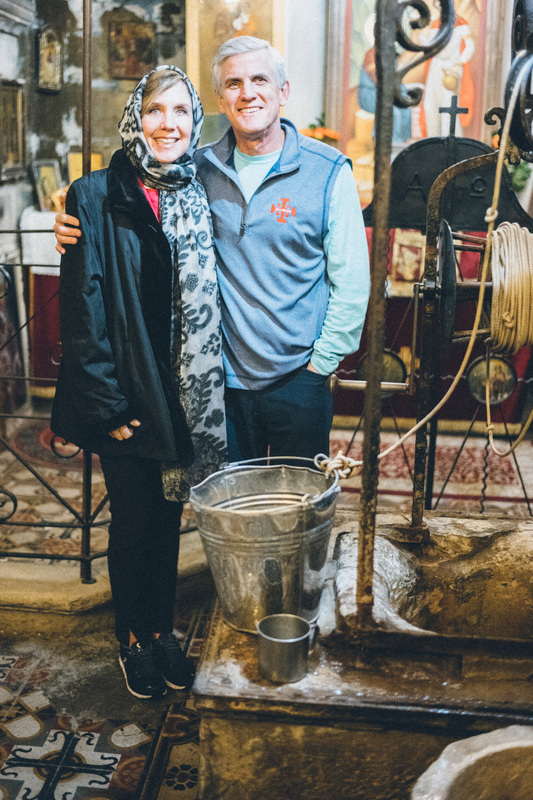 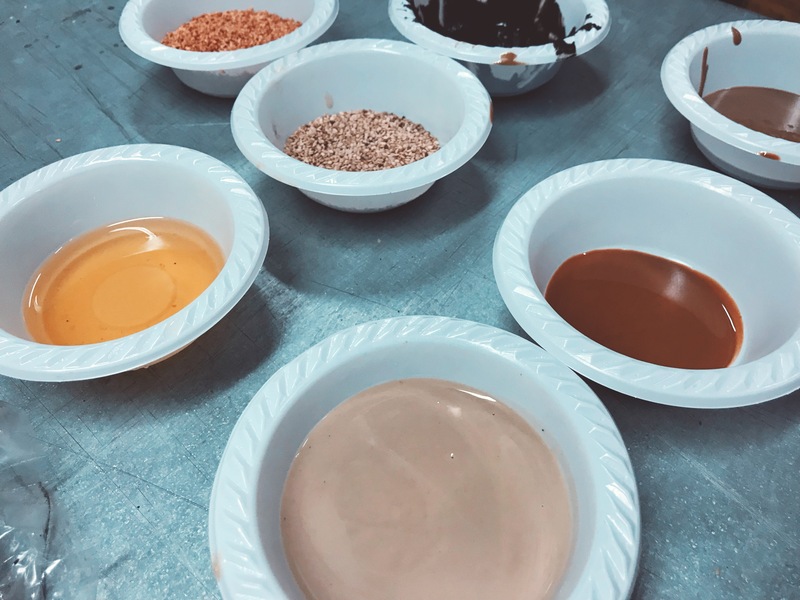 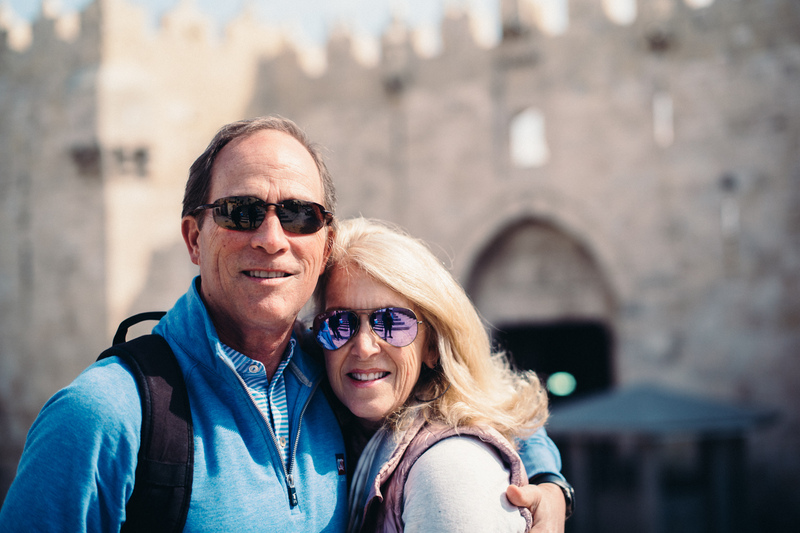 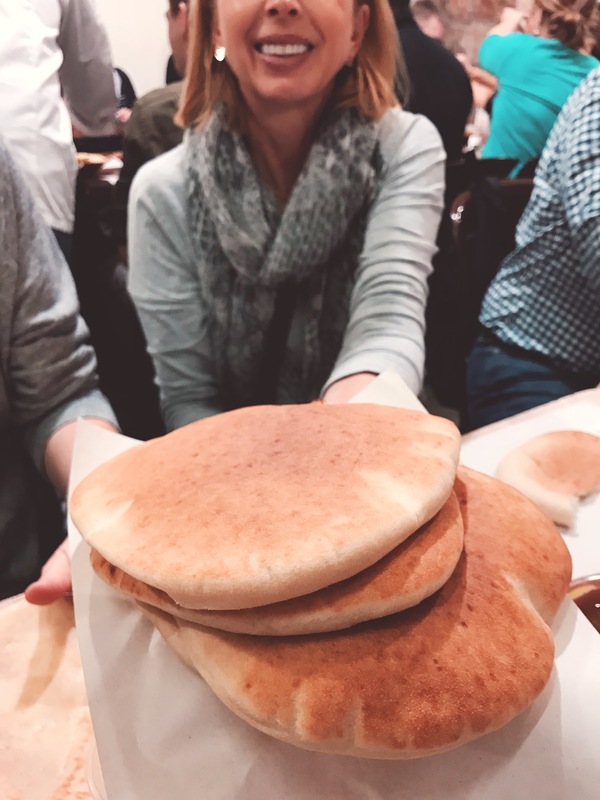 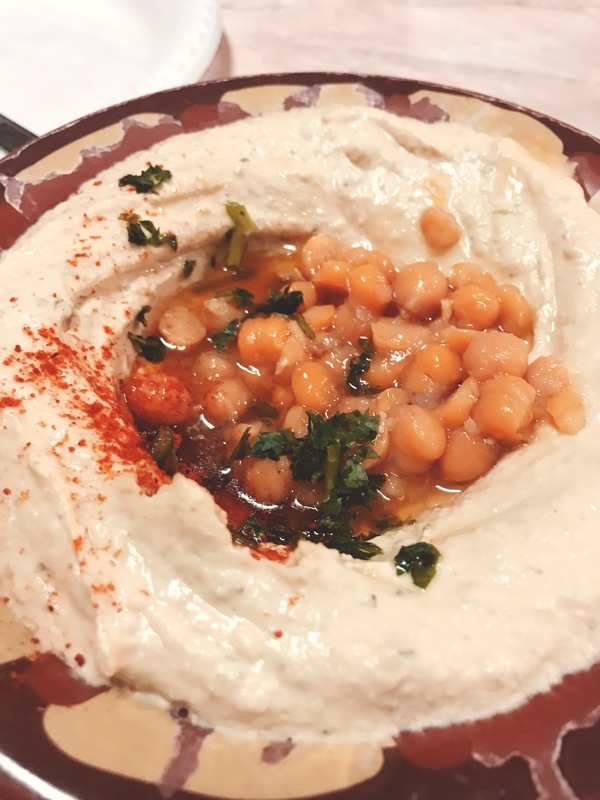 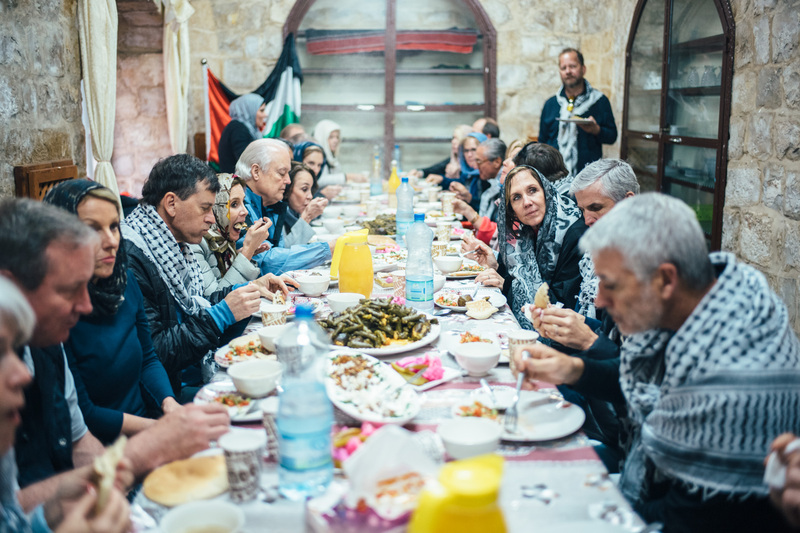 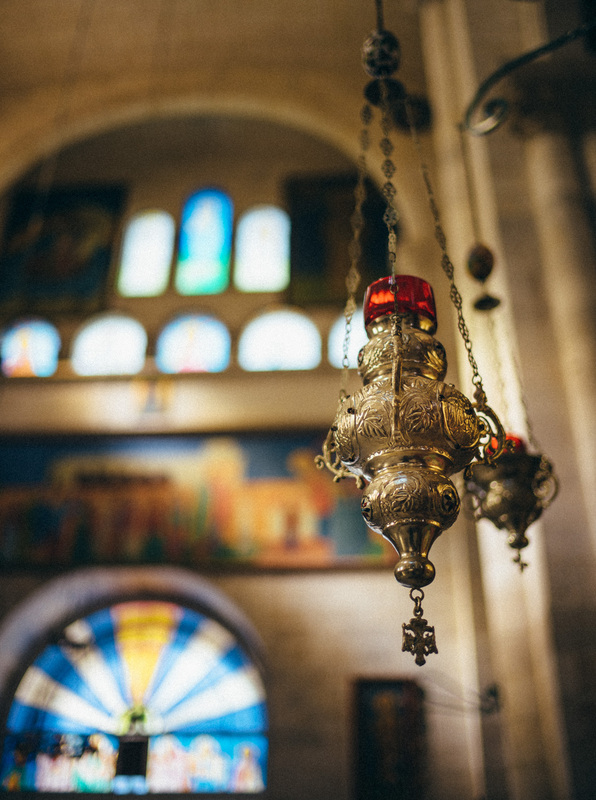 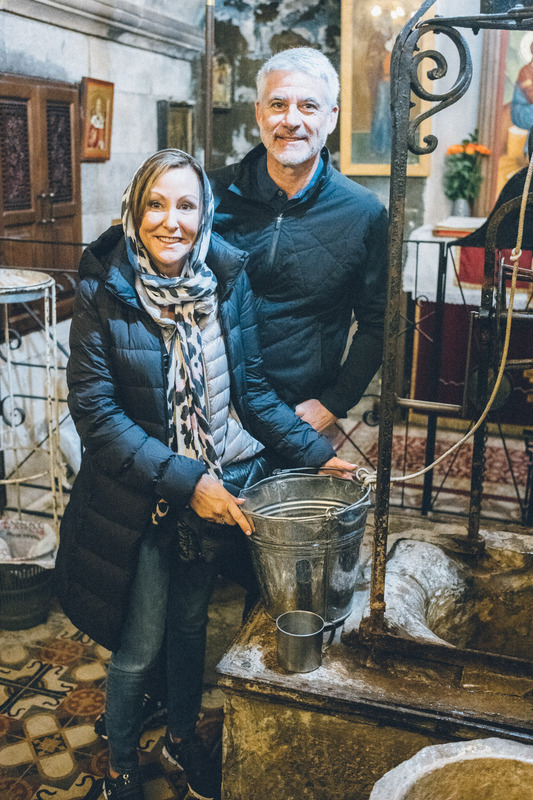 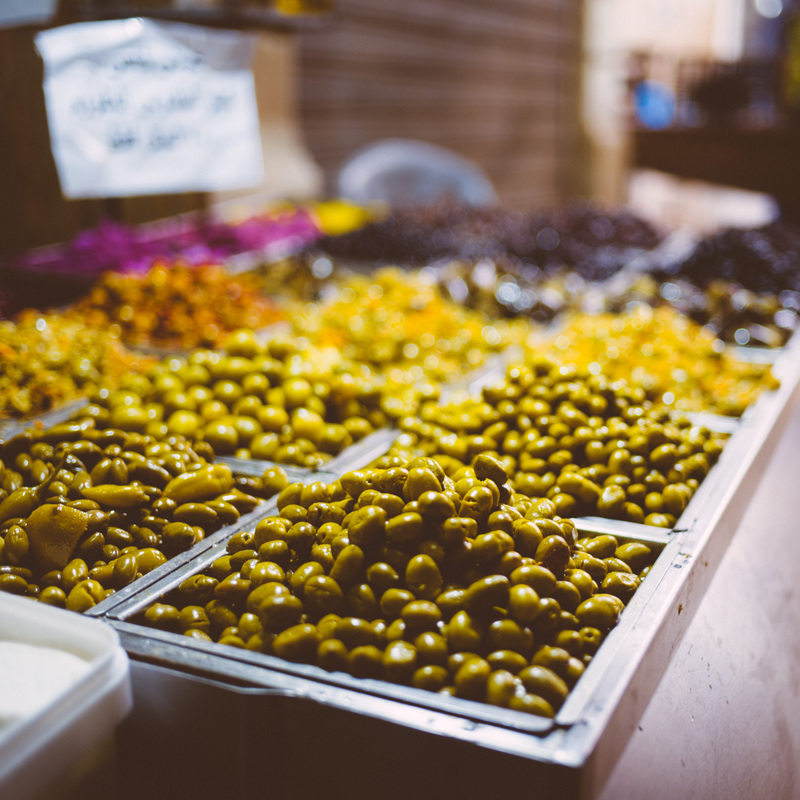 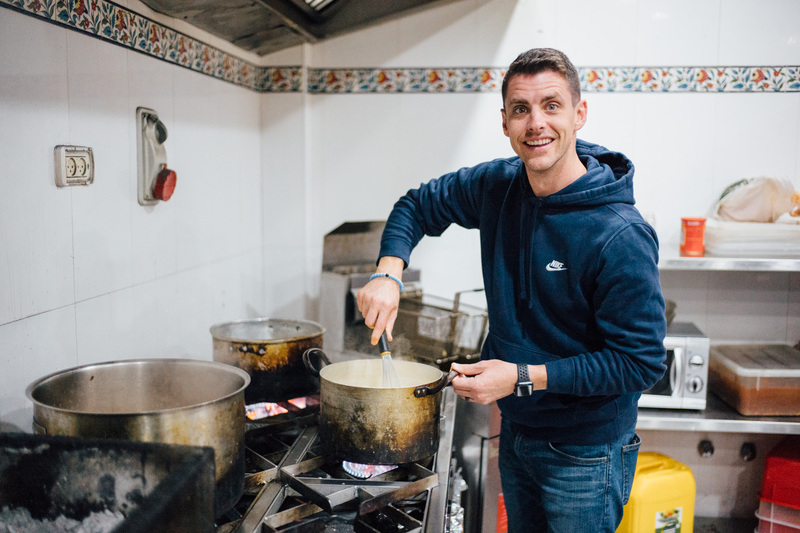 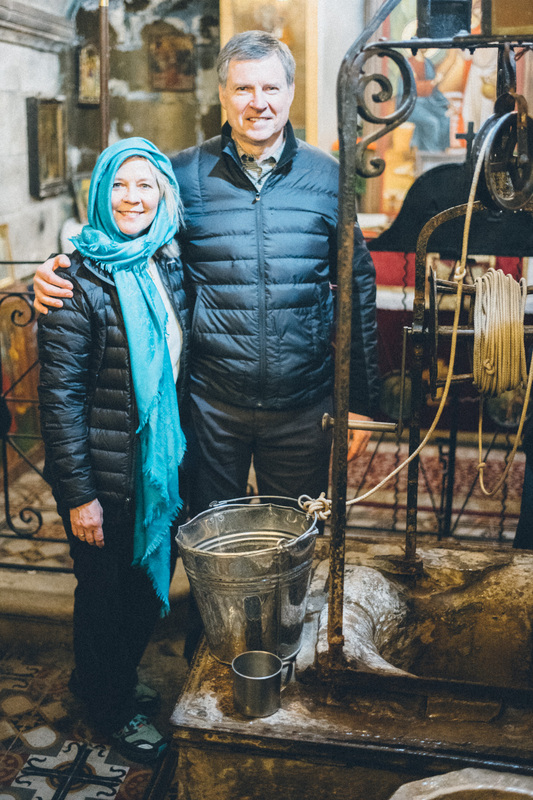 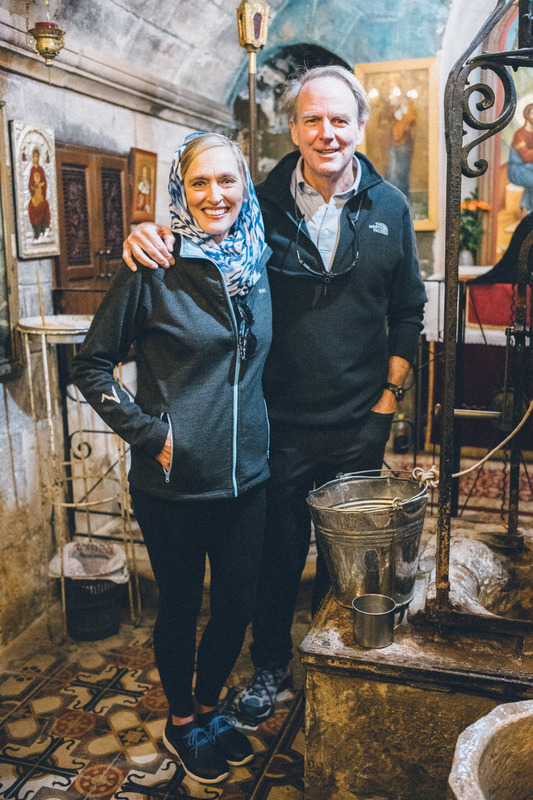 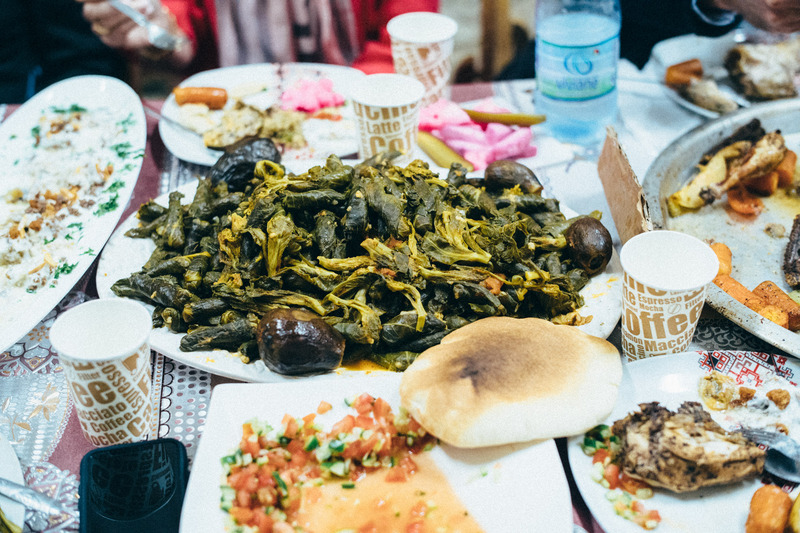 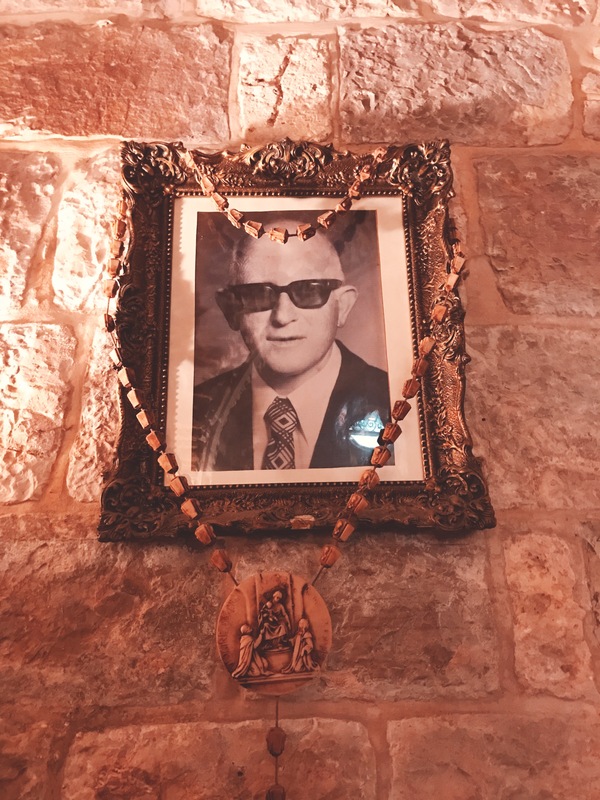 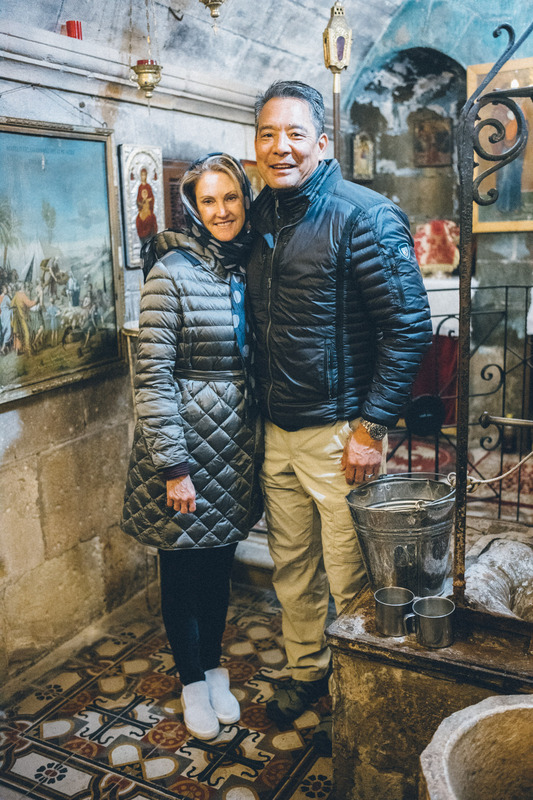 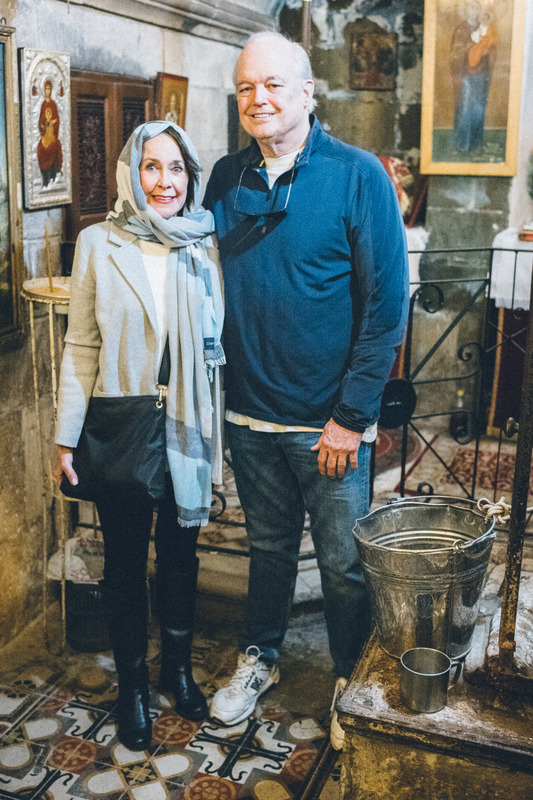 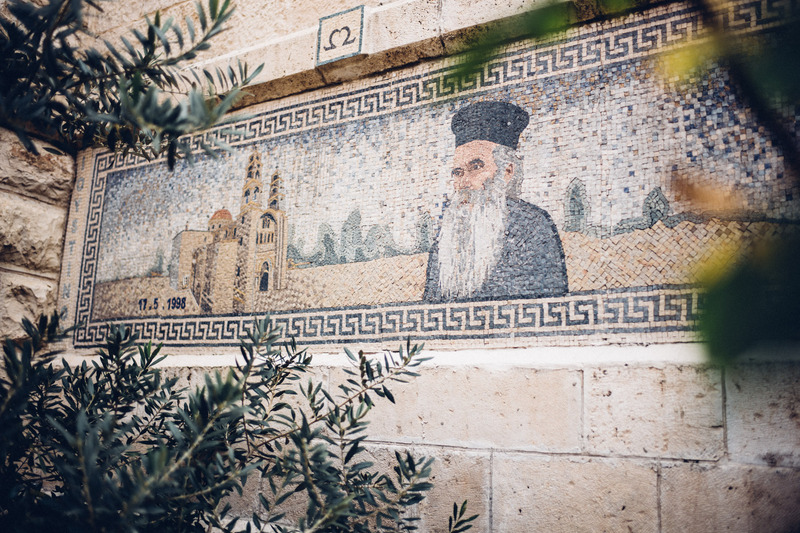 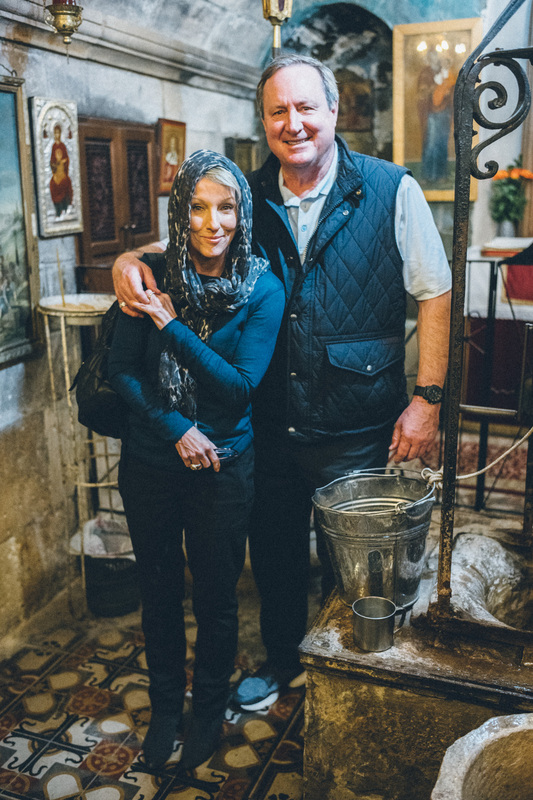 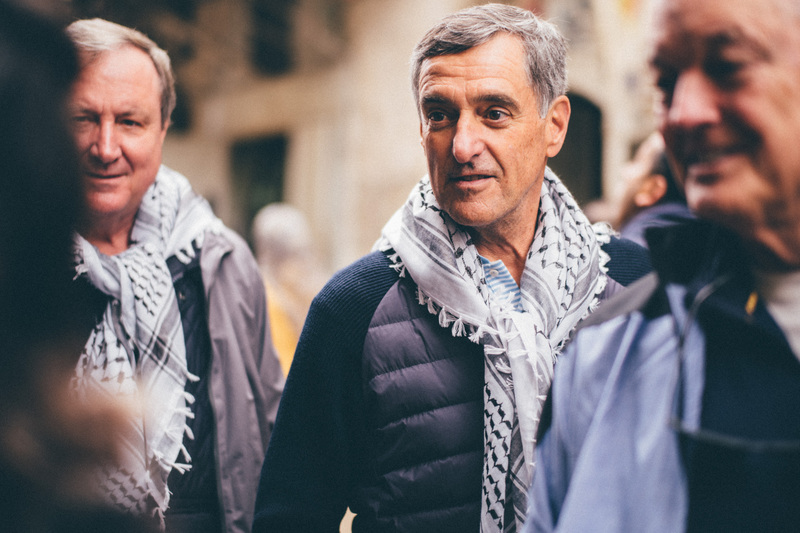 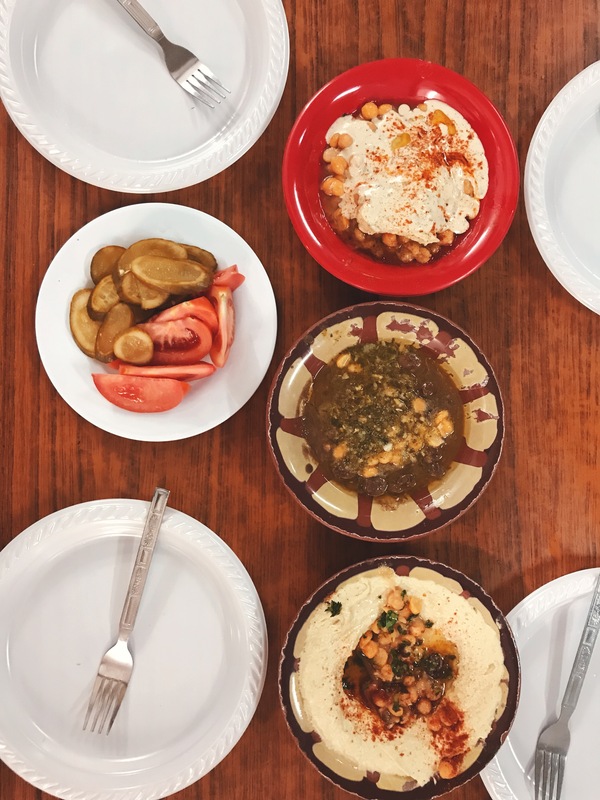 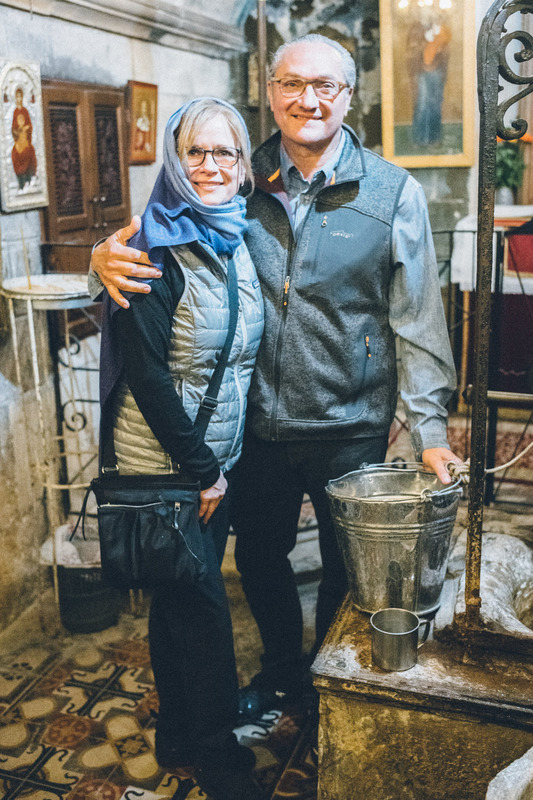 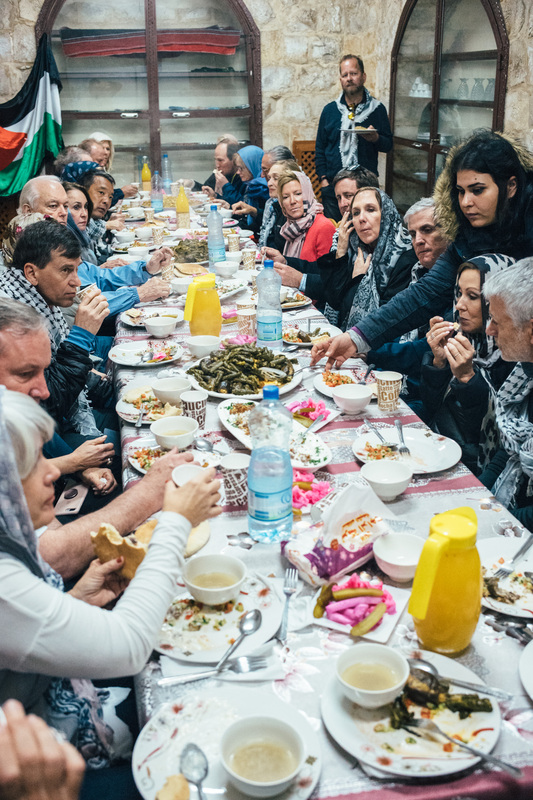 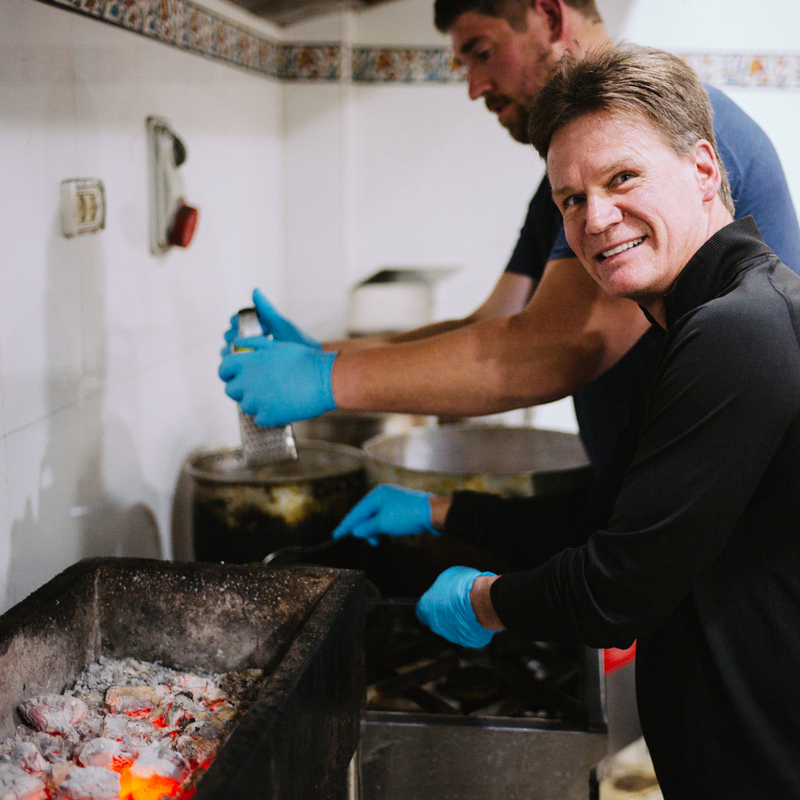 After shopping for some fresh Tahini in the Muslim Quarter along with a demonstration of how it is made, the chefs took us for an appetizer at a restaurant known for their falafel and hummus, Abu Shukri which is located by Stations of the Cross 5. 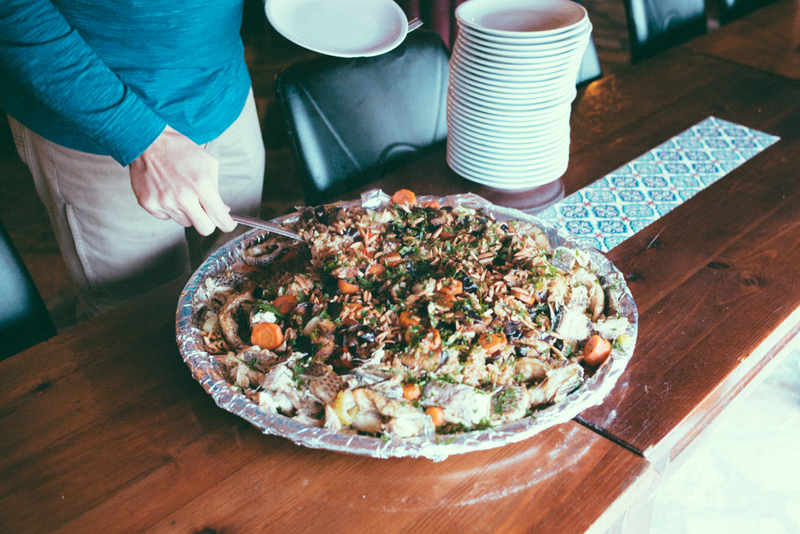 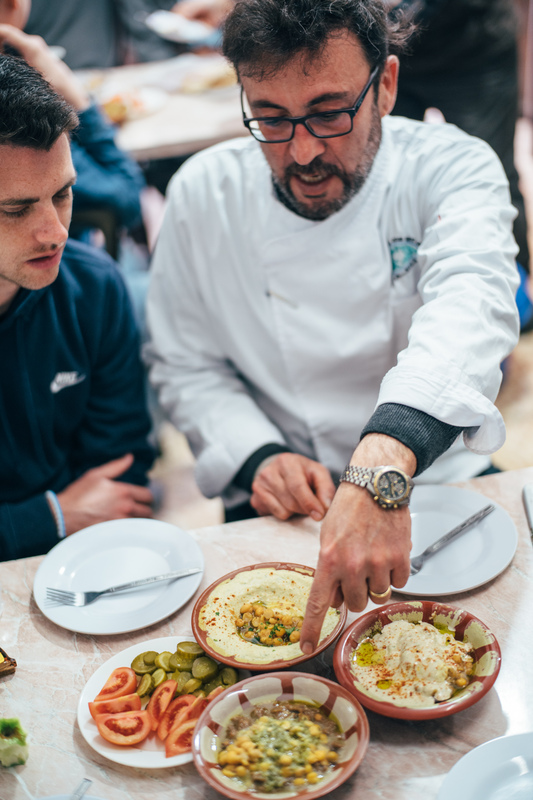 They explained to us the different styles of making hummus and how to eat the various appetizers served. 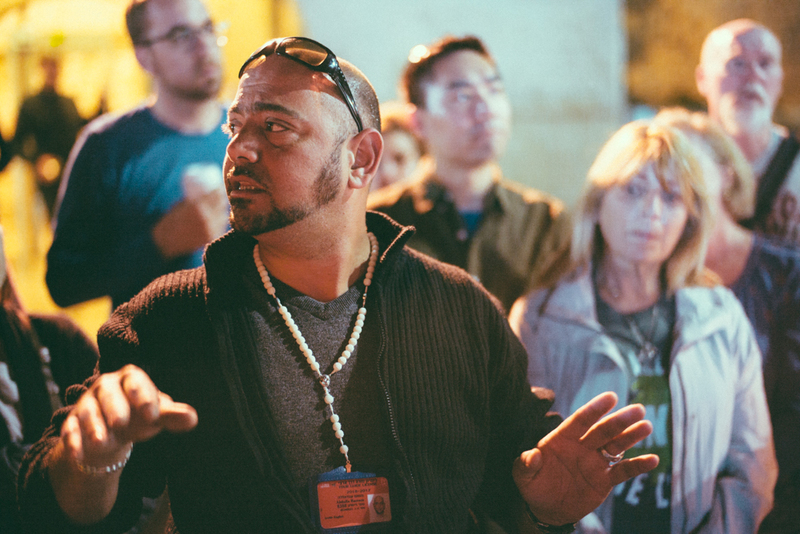 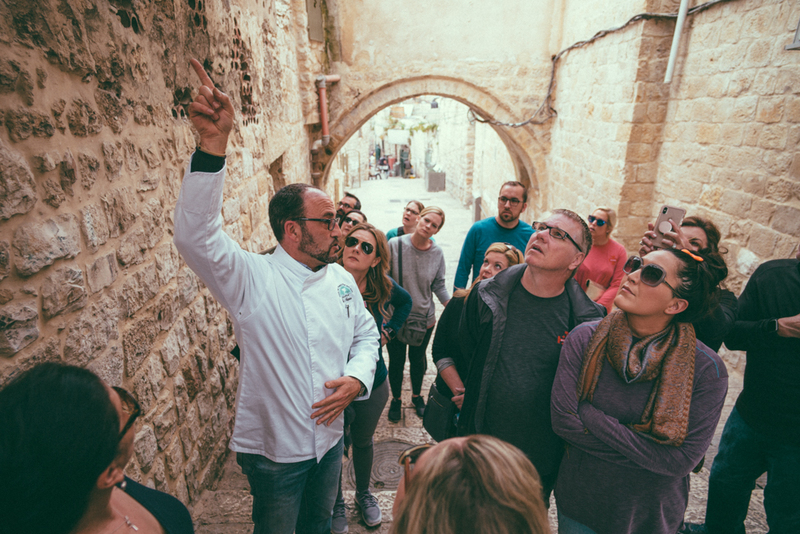 Next, after a walk through the Jewish Quarter, our tour with Breaking Bread Journeys took us through the tunnels revealing archaeological finds deep underneath the Old City. 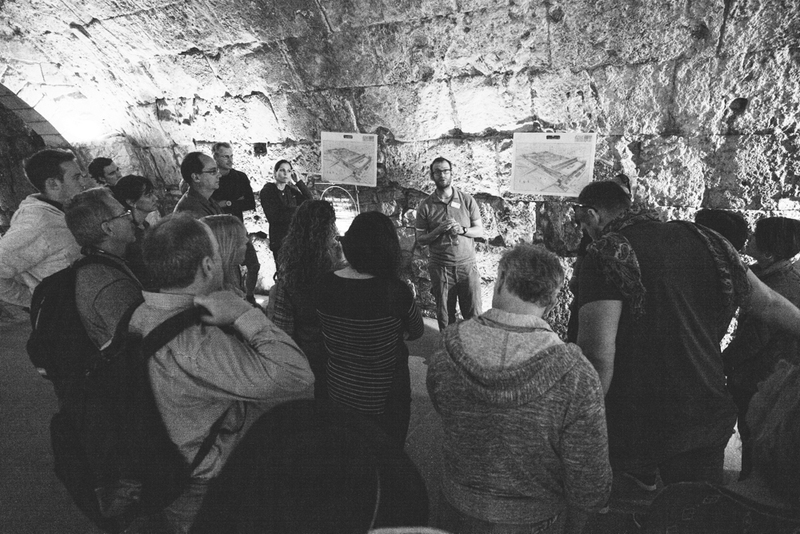 The Tunnel Tour is in such high demand that you must book it two months in advance. 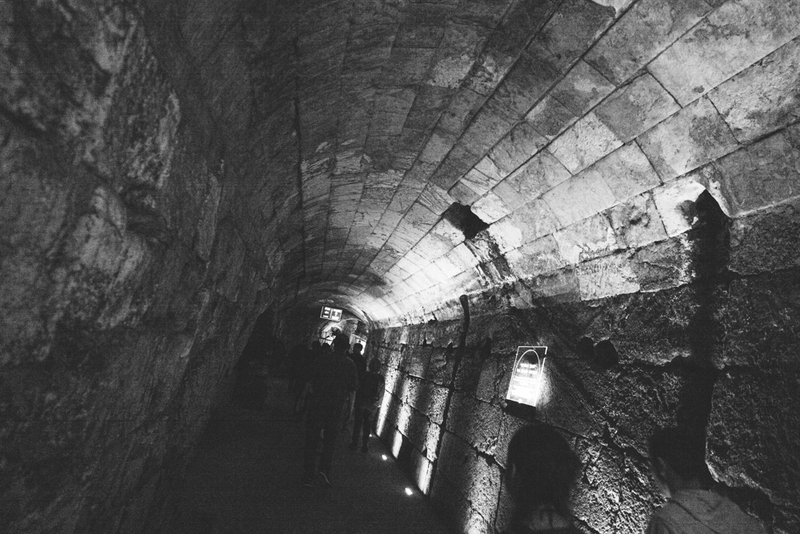 We learned that much of the city was raised from a small valley centuries ago by arched supports, and it is under these arches that many of the tunnels were excavated. 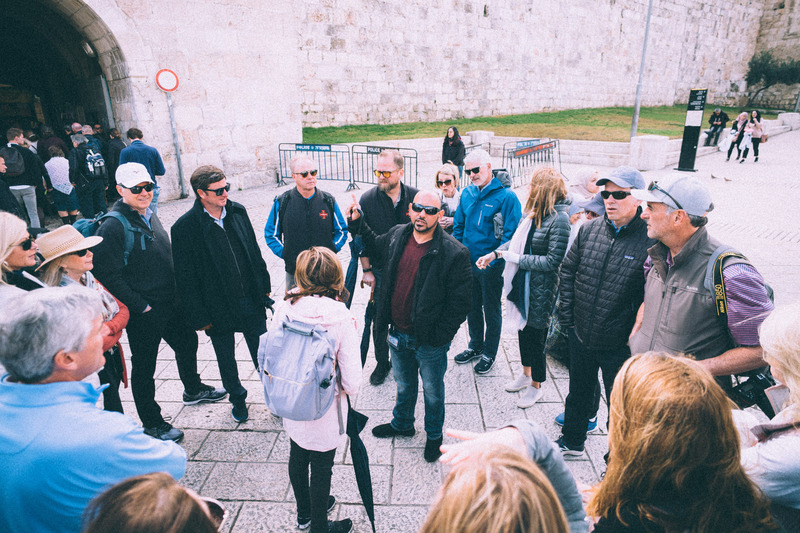 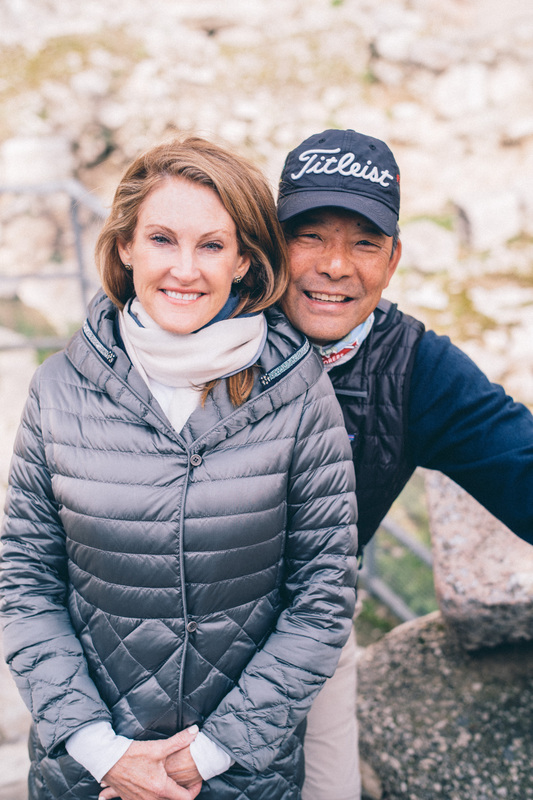 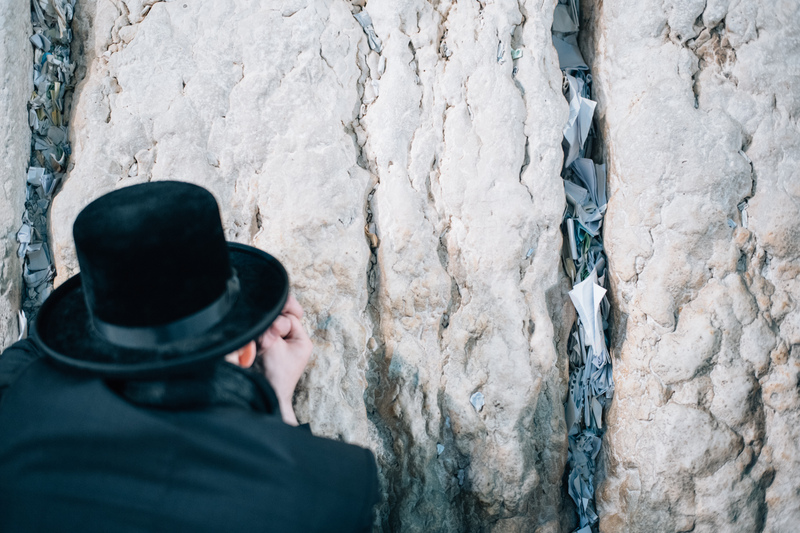 We saw the ancient gates to Solomon’s Temple, and learned that one stone of the temple’s western retaining wall weighs an estimated 570 tons.